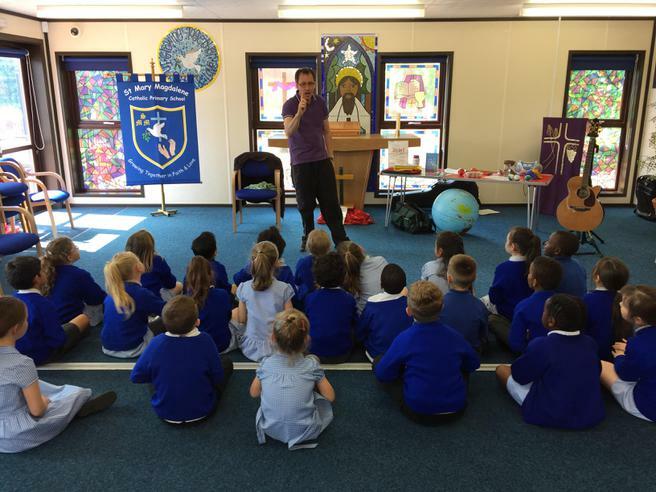 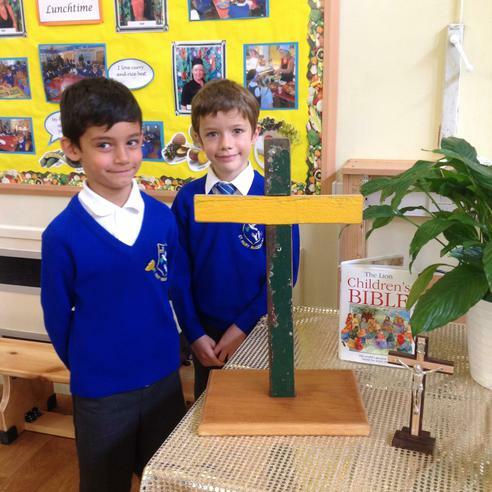 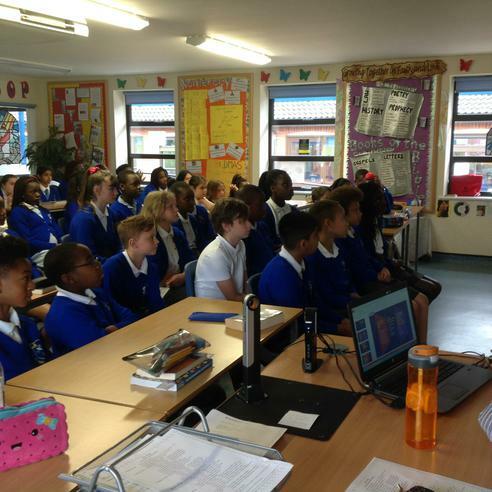 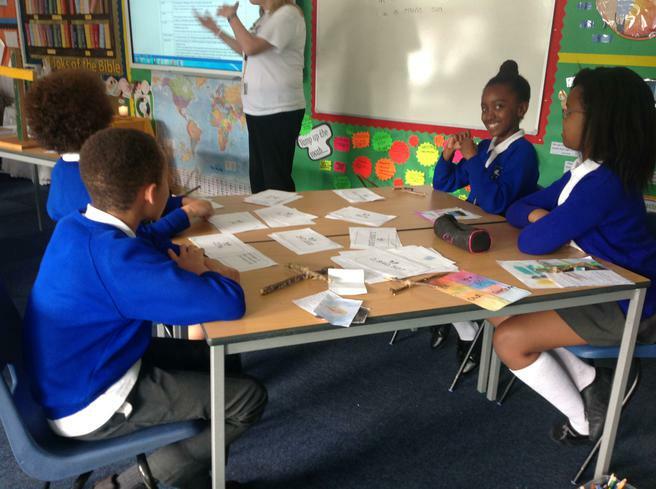 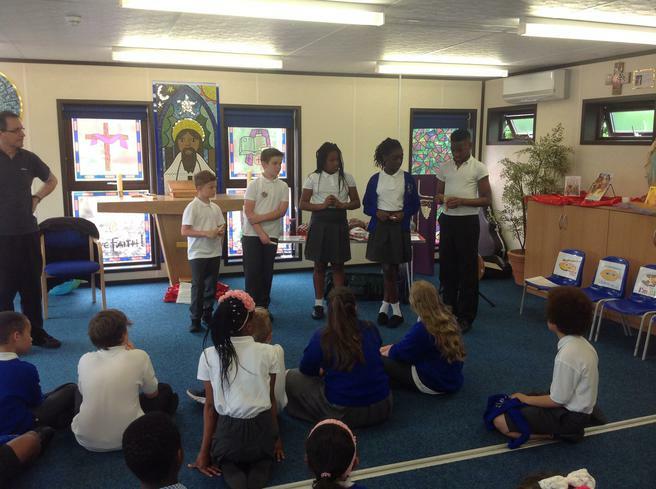 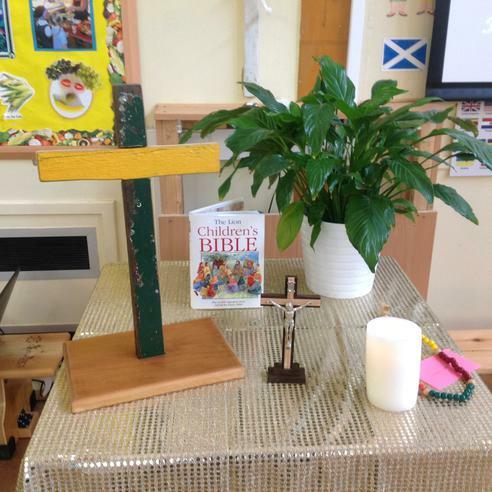 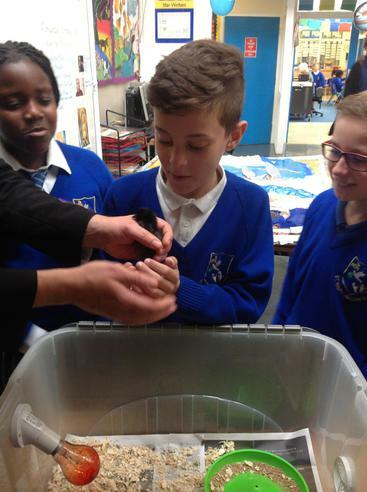 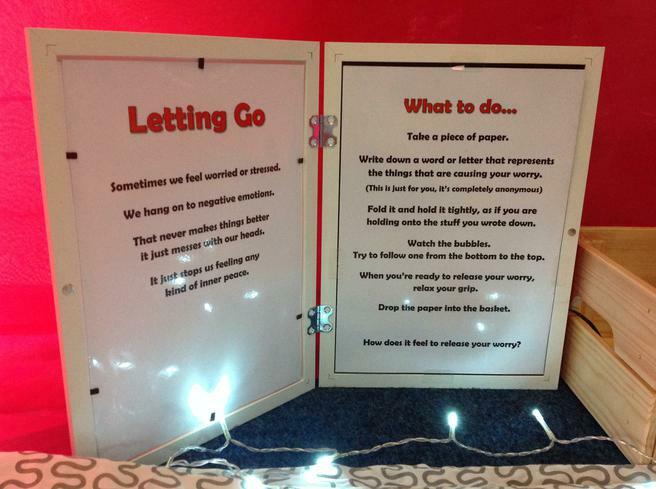 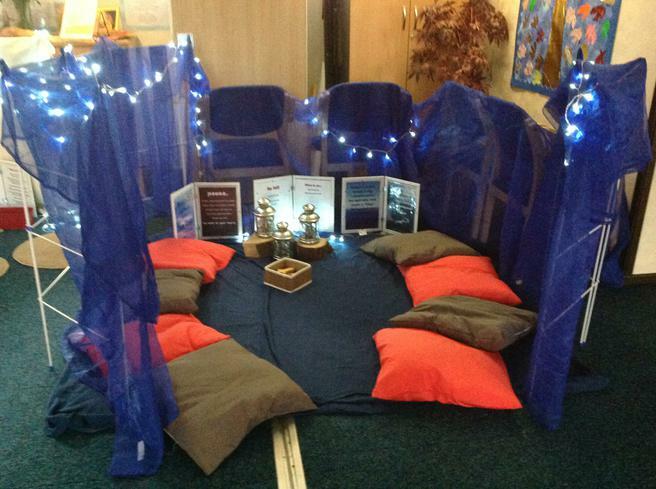 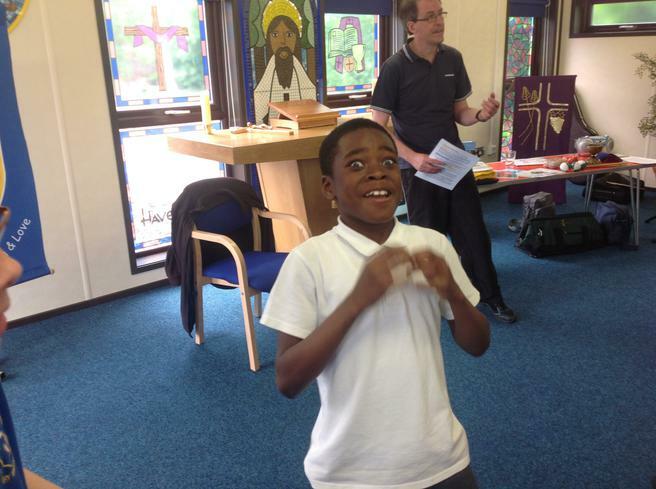 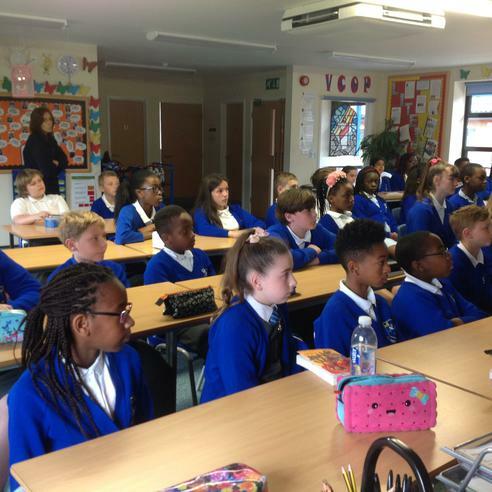 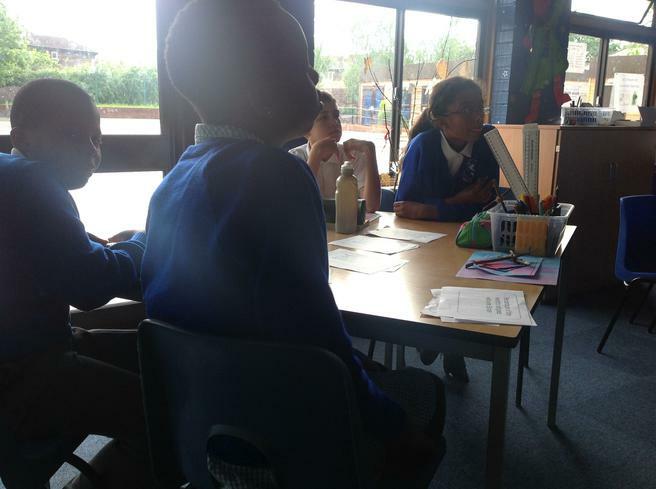 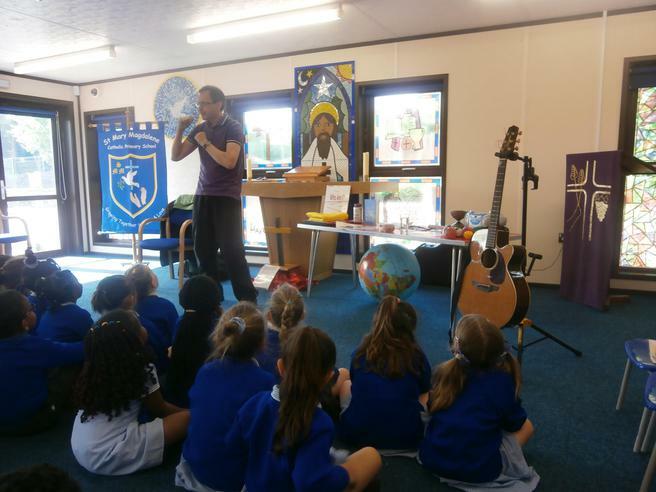 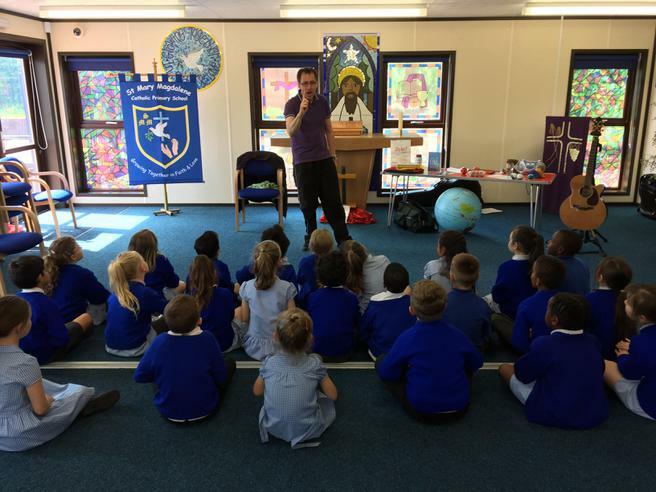 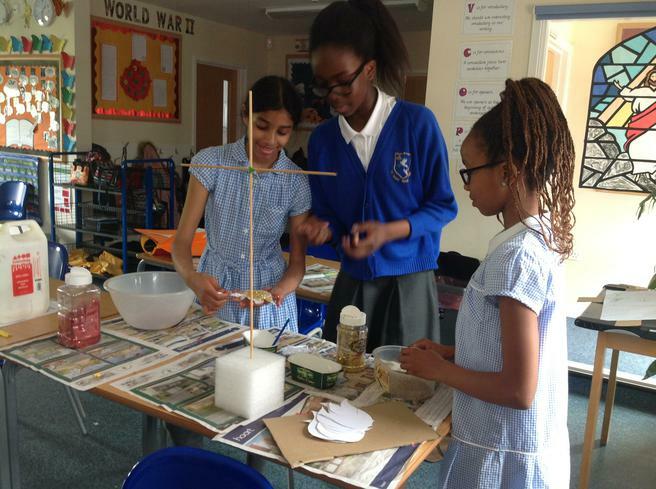 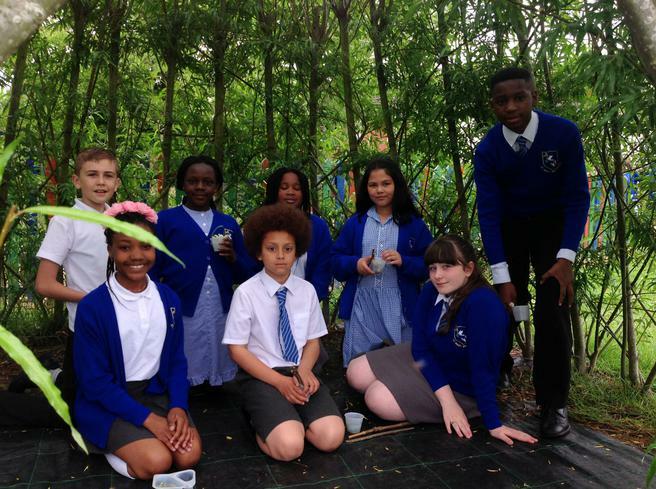 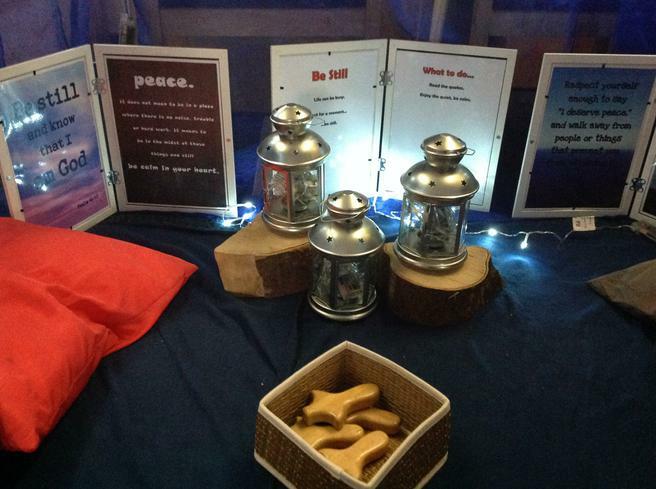 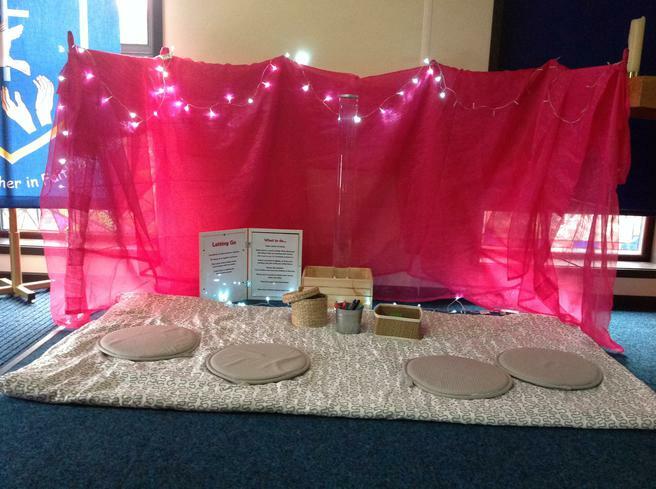 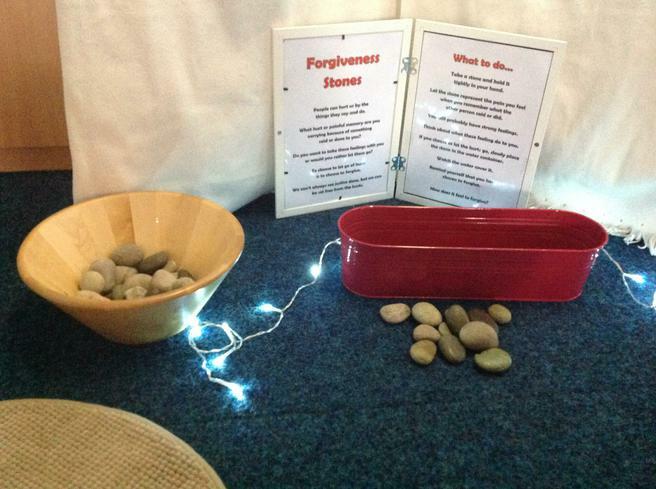 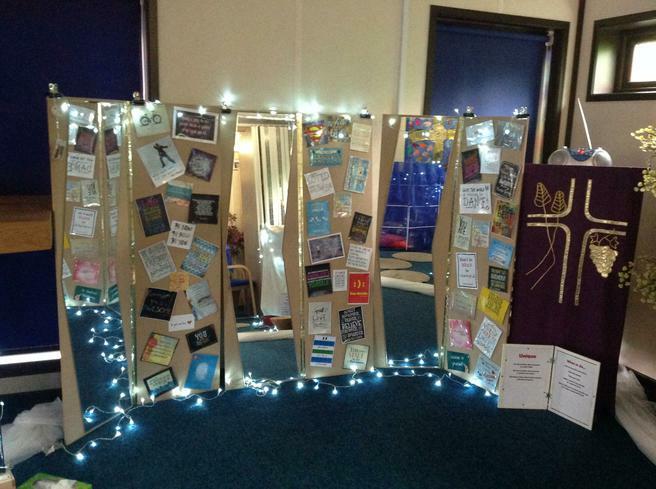 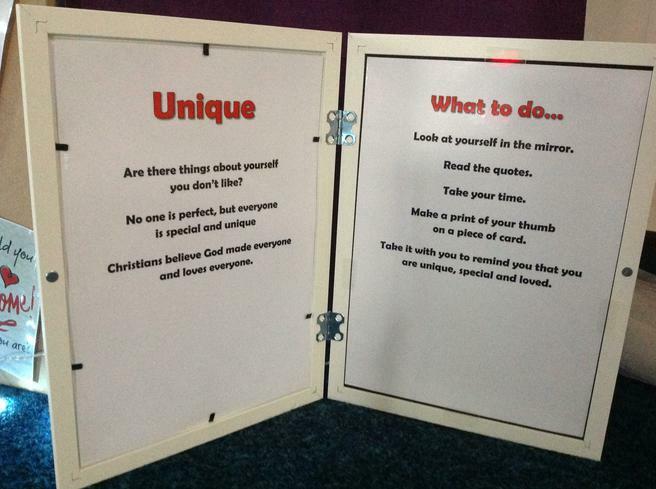 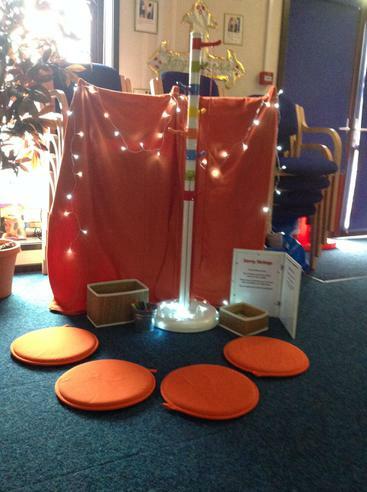 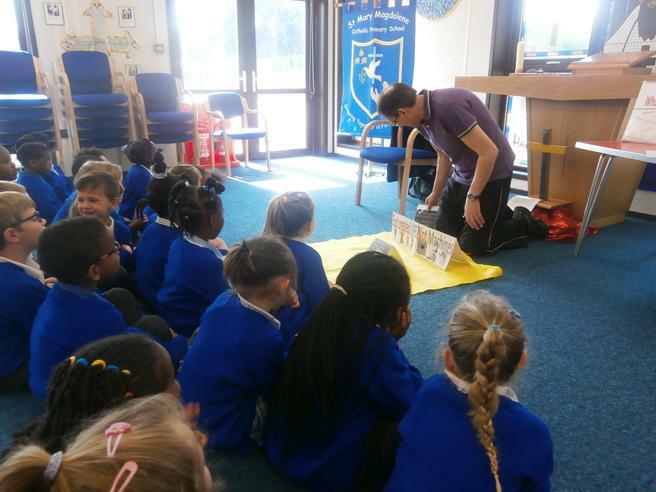 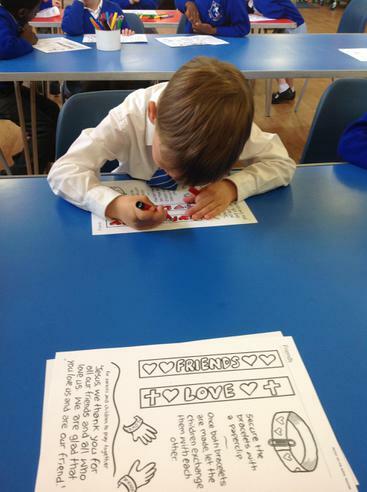 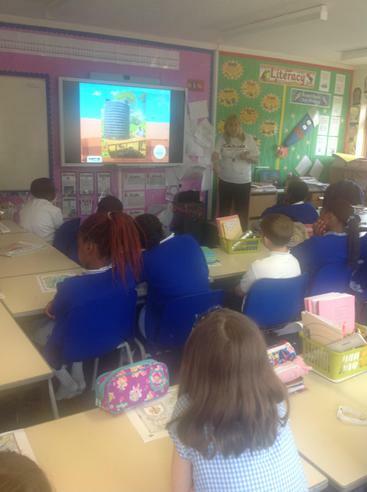 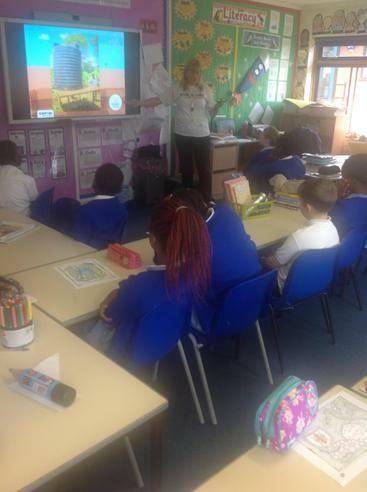 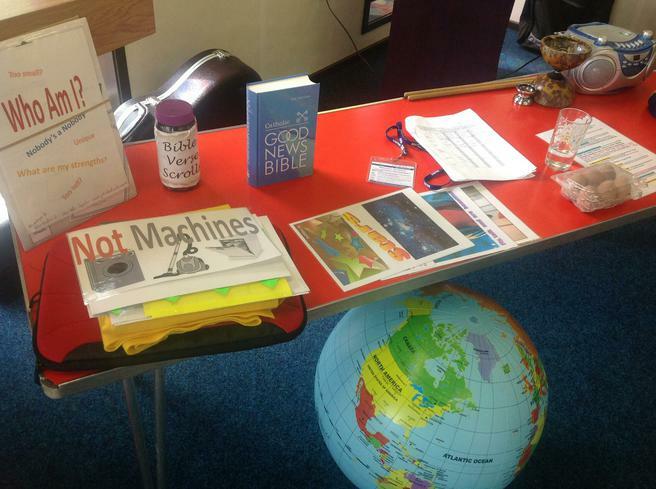 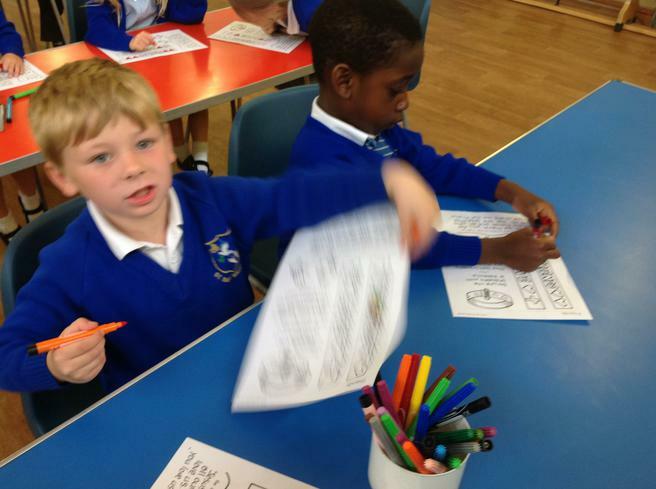 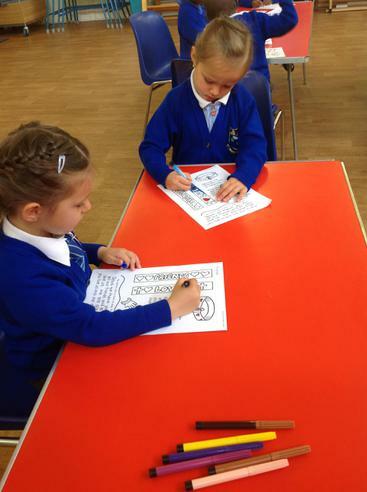 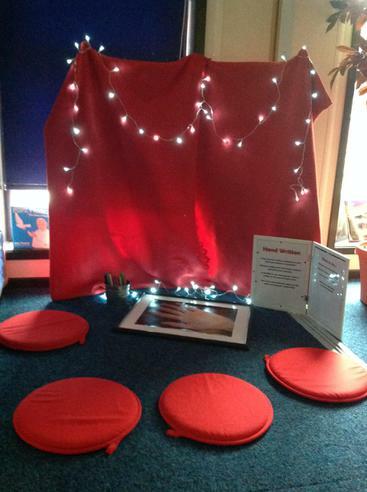 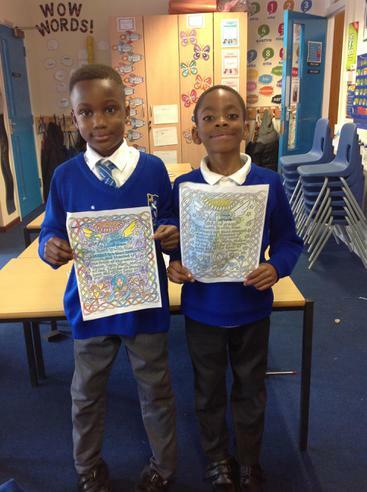 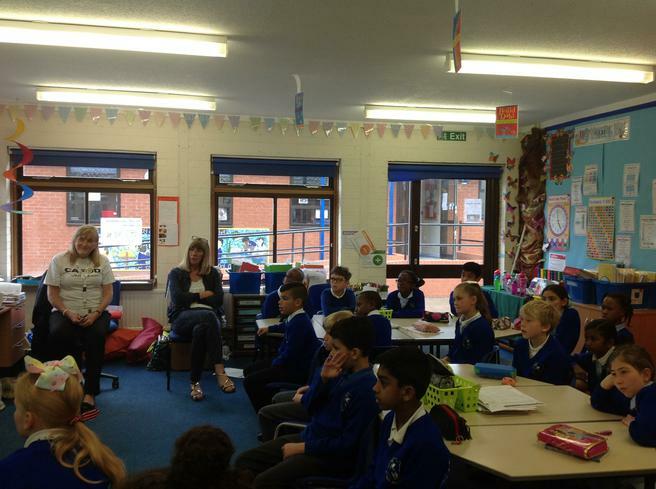 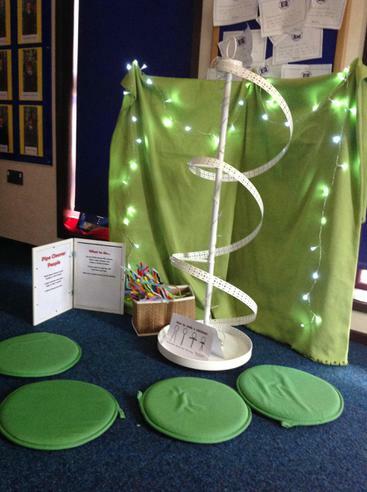 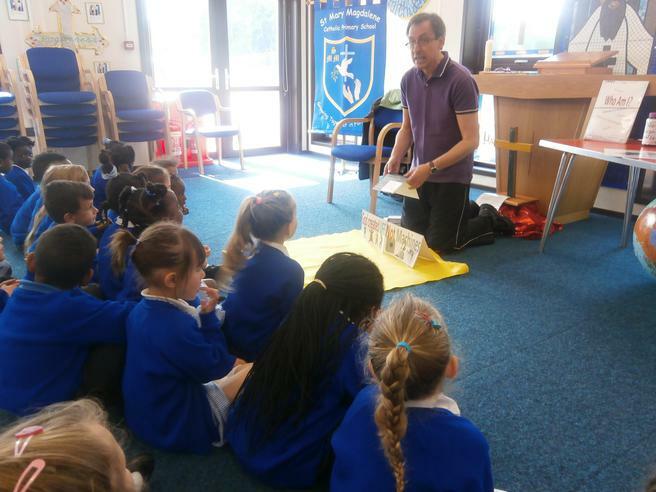 The next three days we have the Bible Reading Federation in school offering interactive workshops on different aspects of our faith. 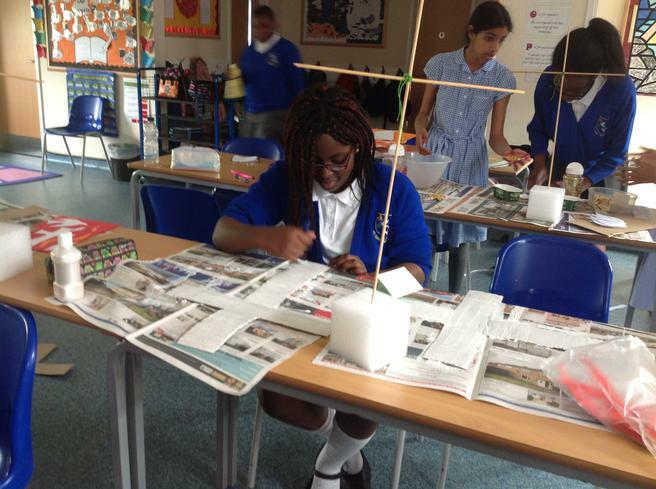 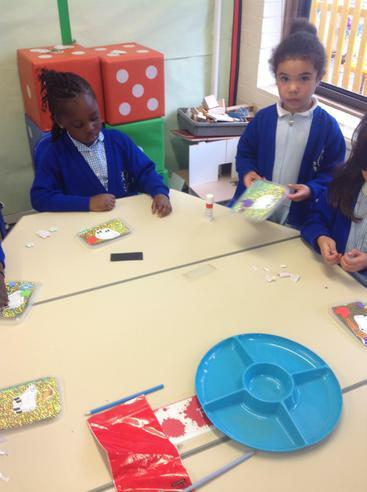 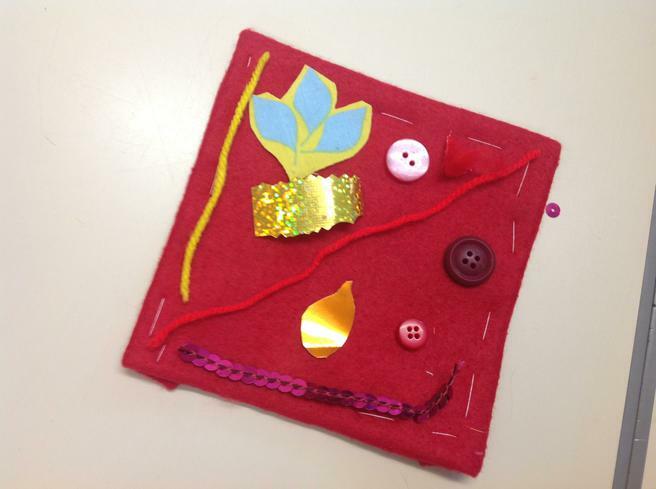 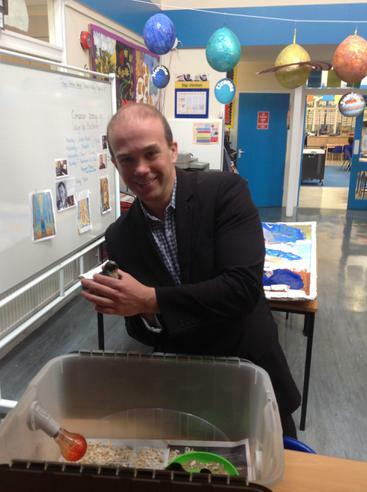 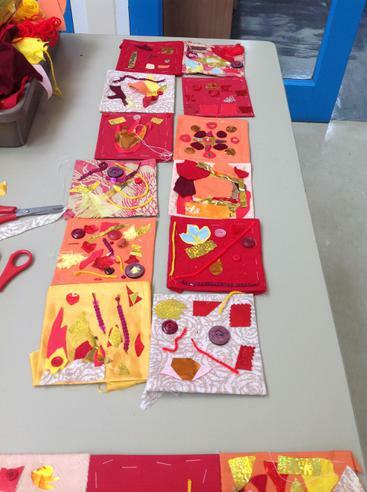 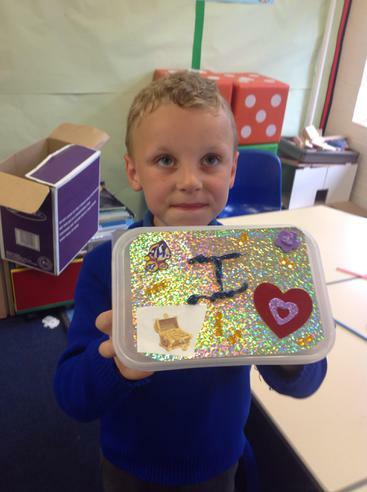 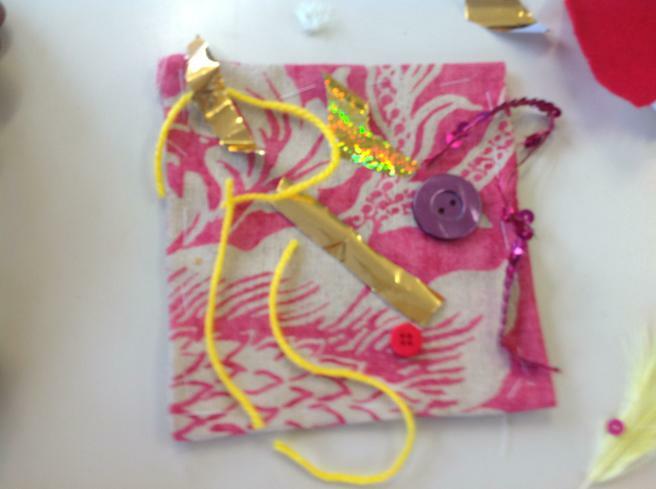 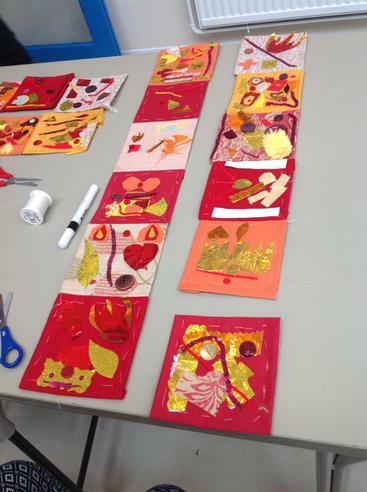 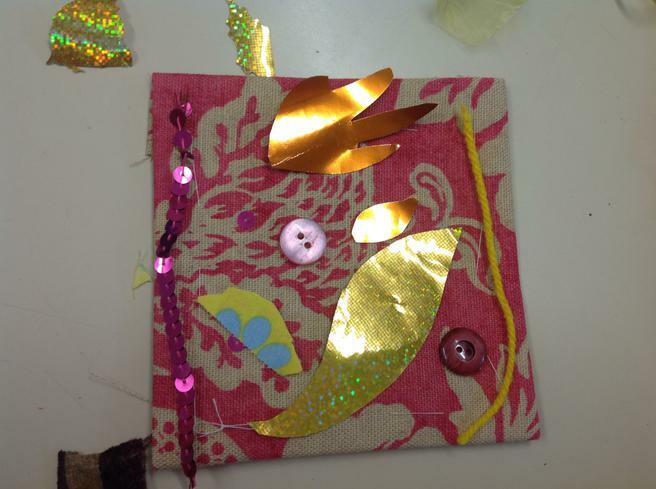 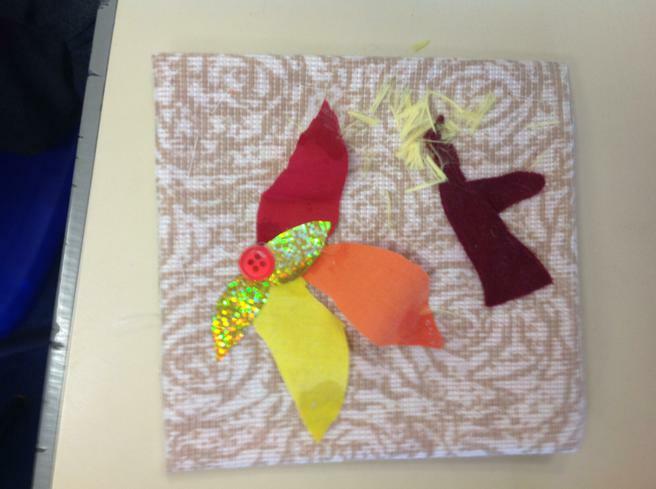 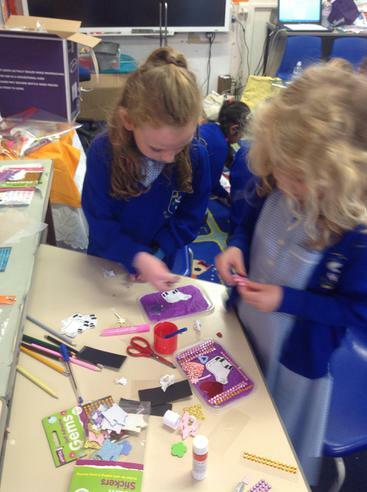 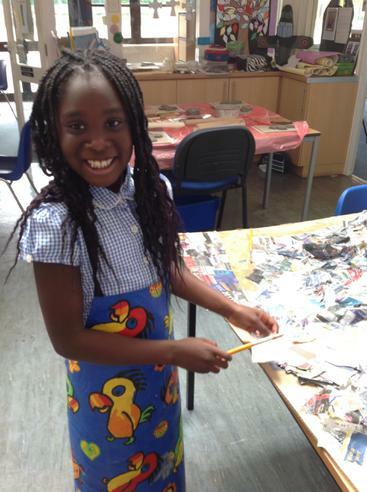 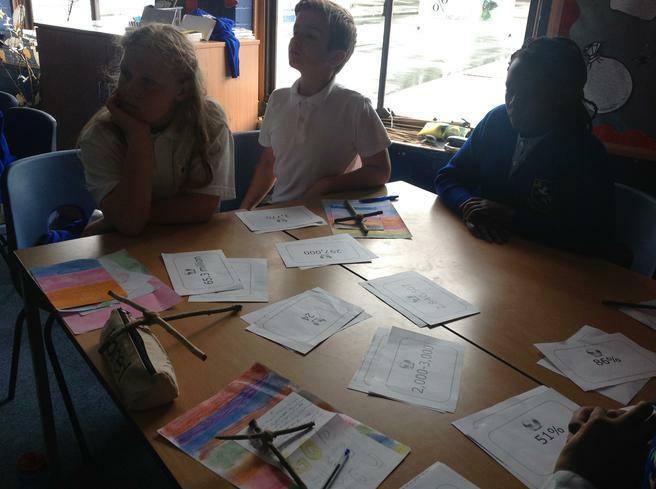 The theme of our workshops is "Who am I?" 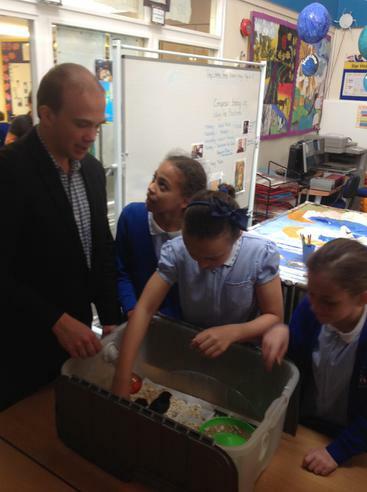 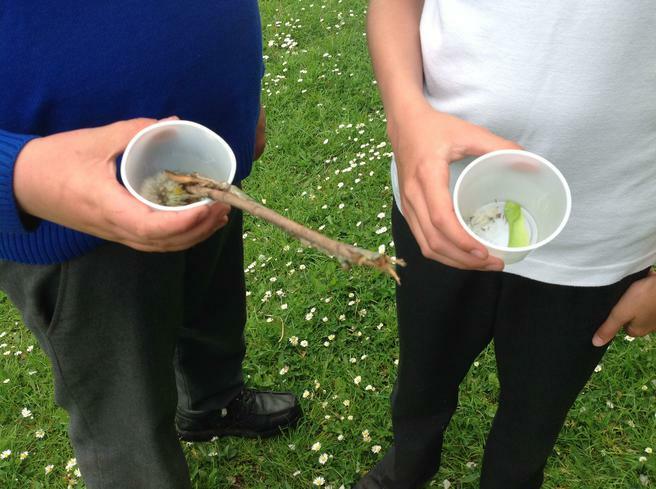 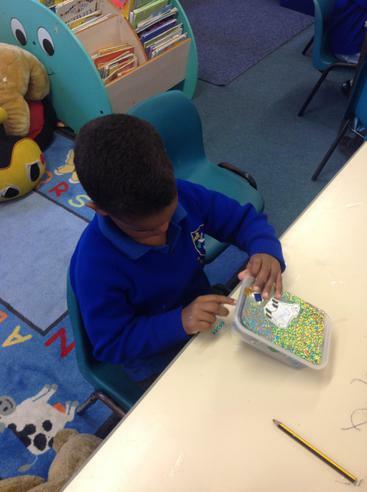 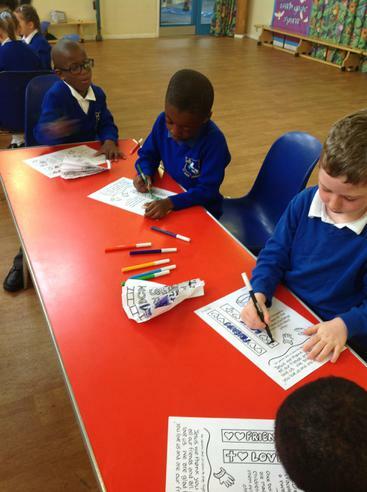 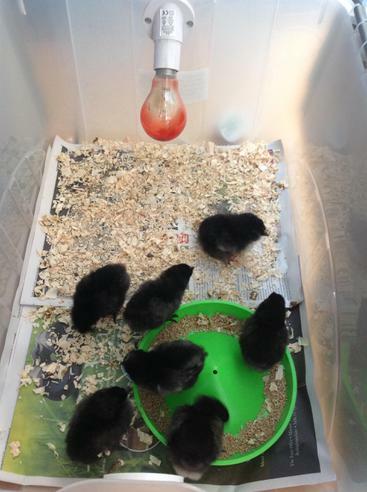 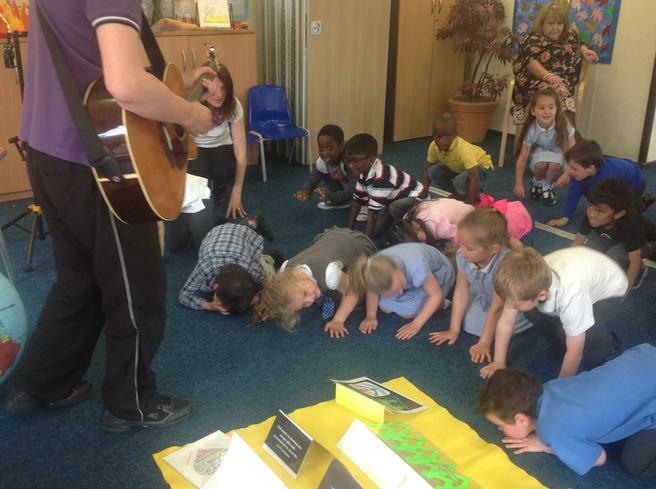 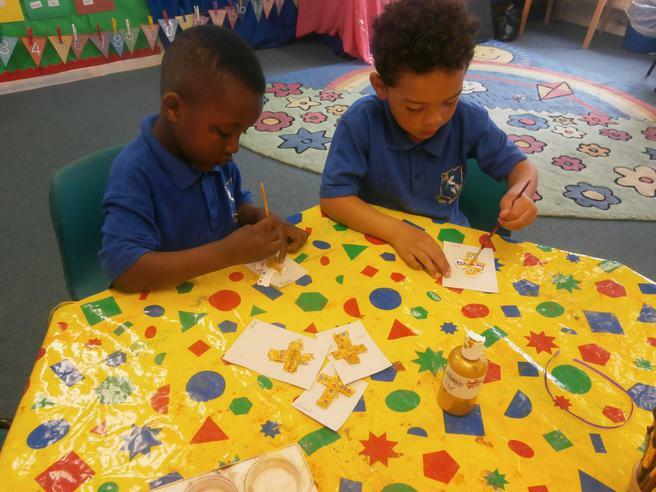 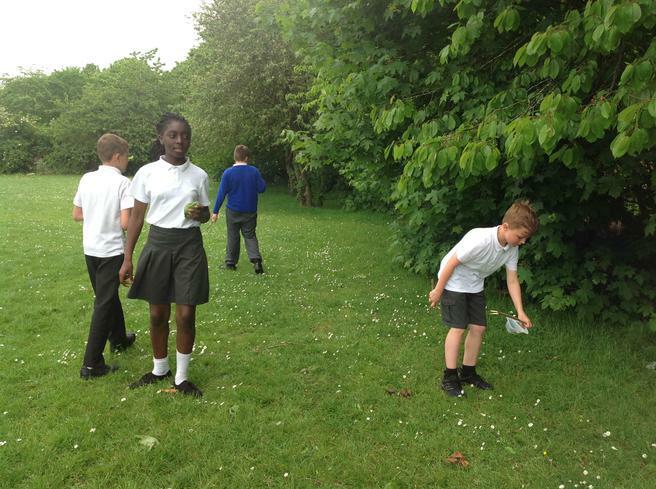 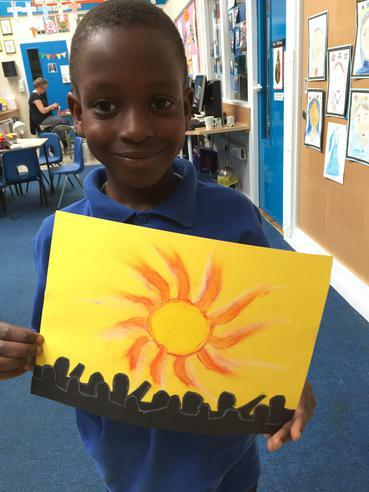 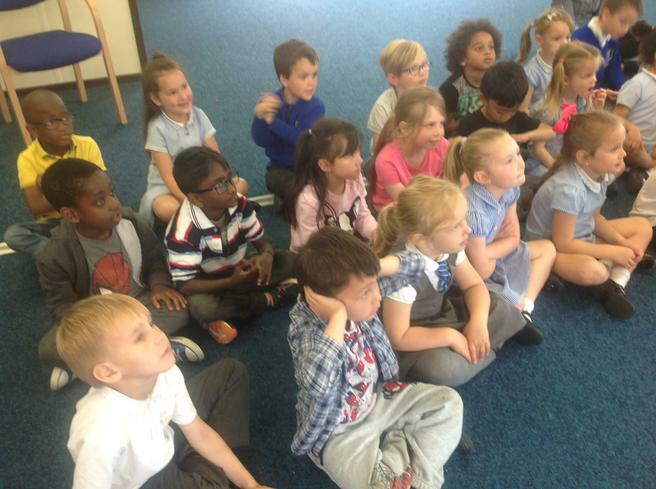 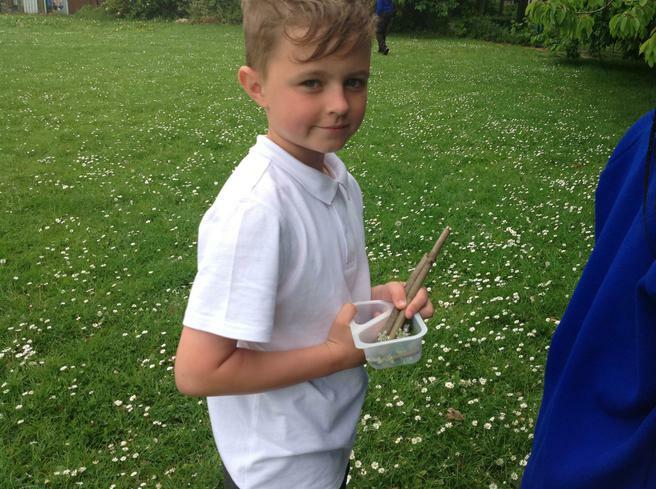 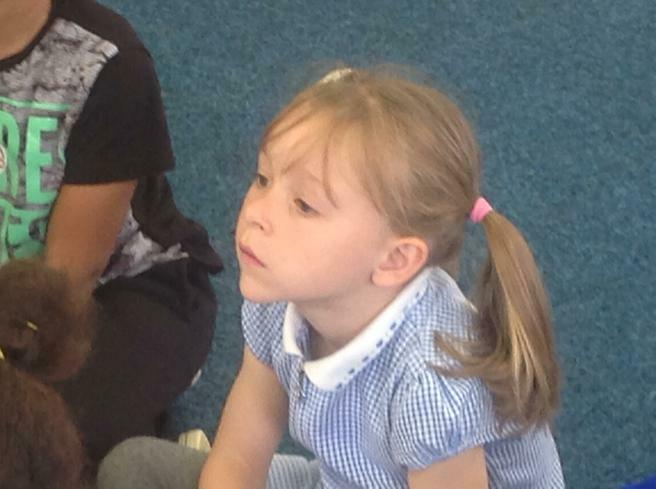 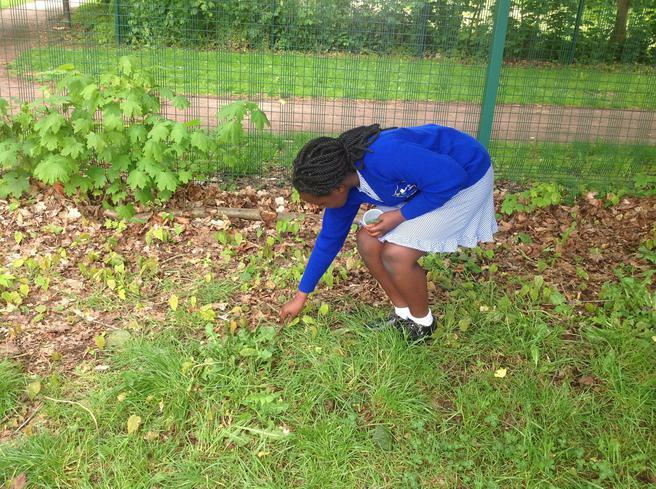 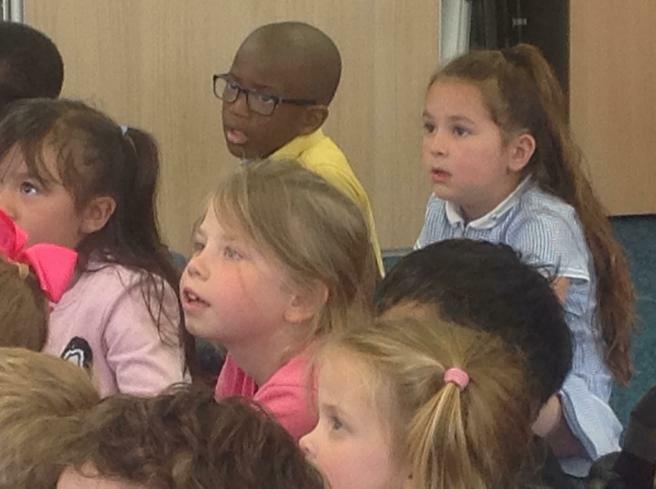 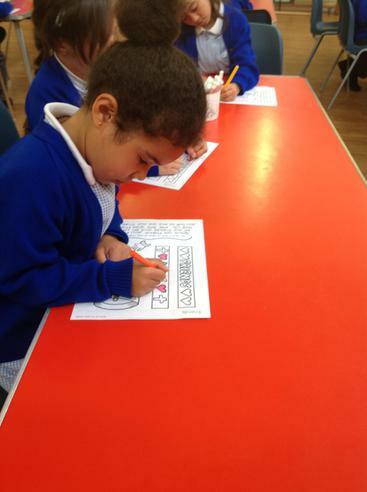 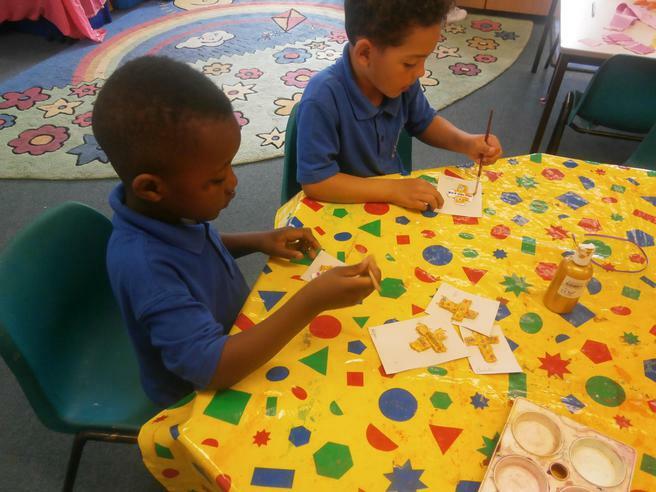 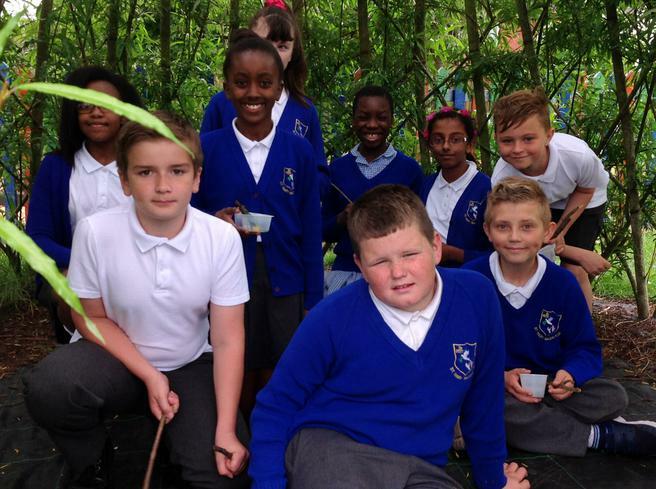 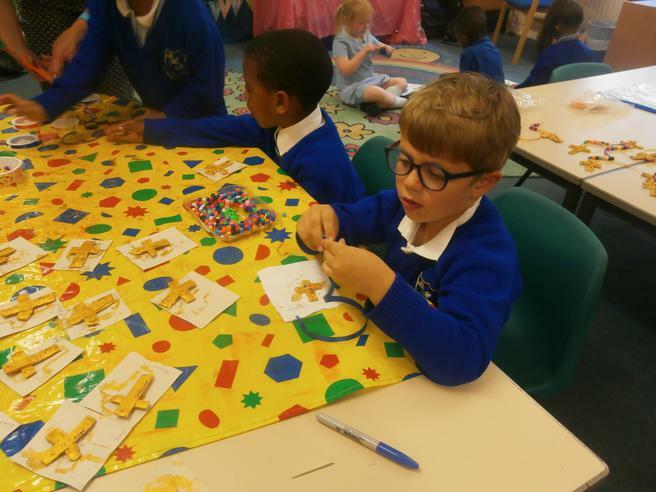 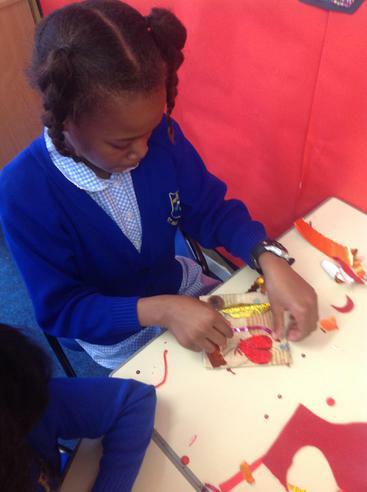 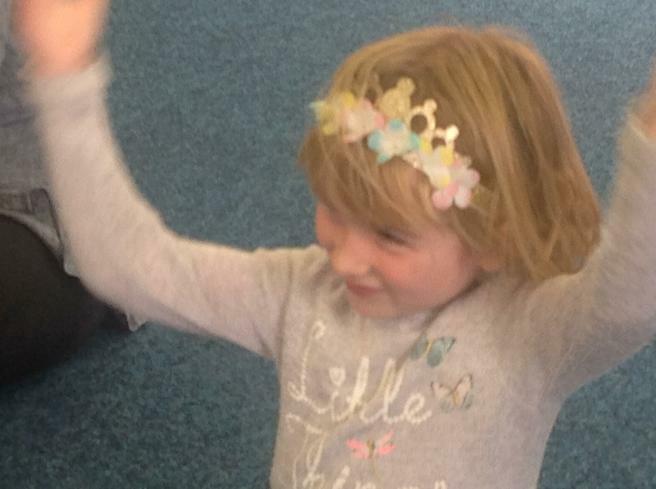 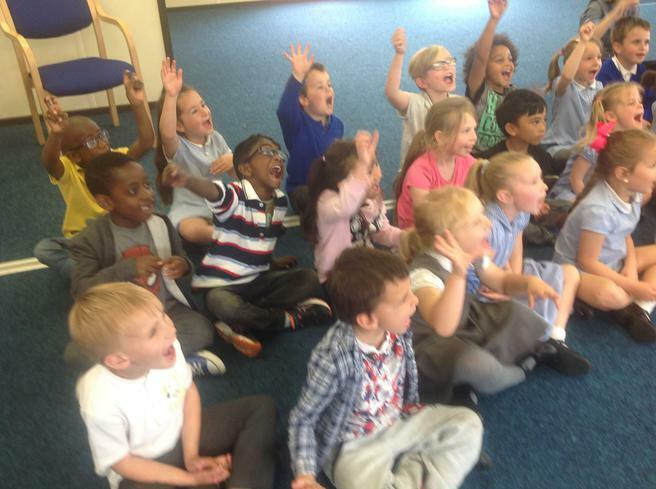 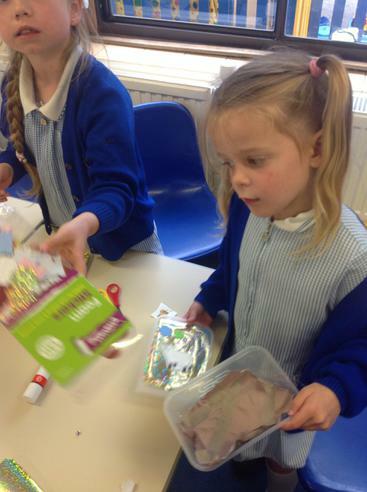 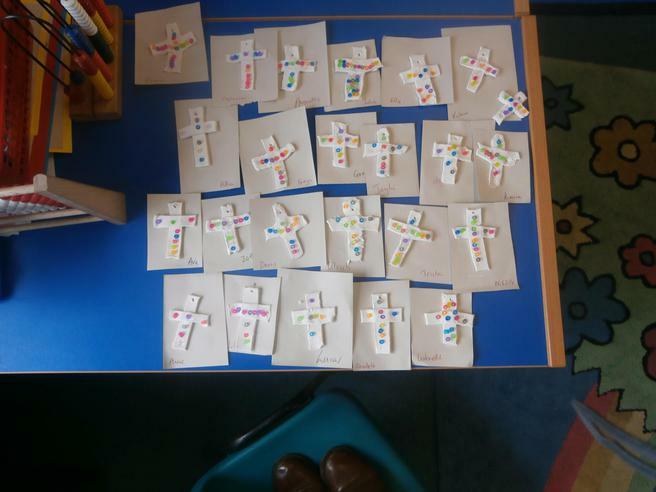 The children are exploring their unique identity in Gods eyes, in a meaningful yet enjoyable way. 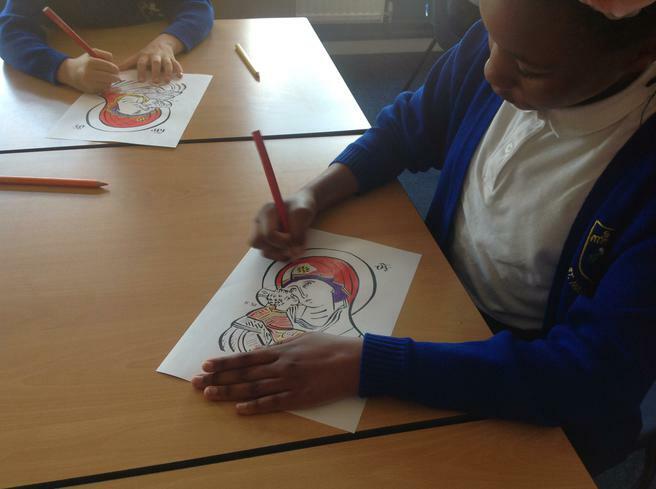 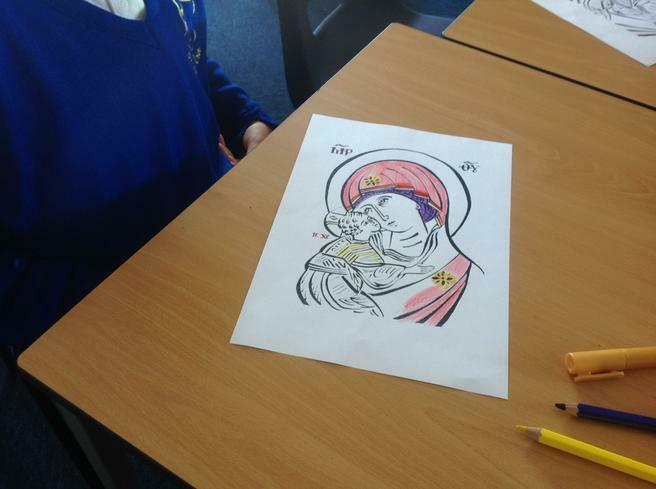 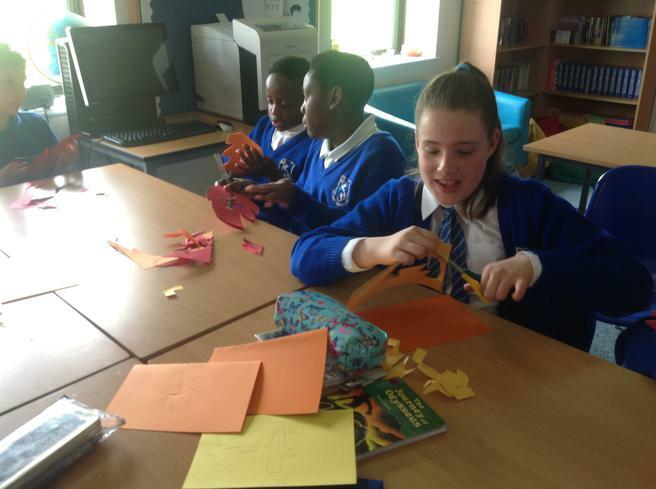 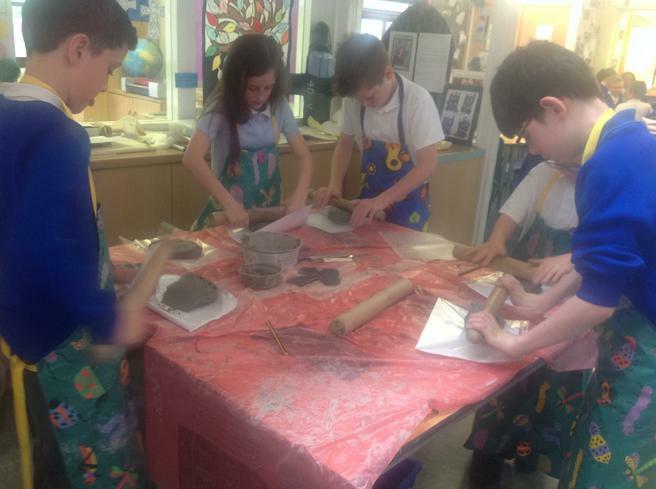 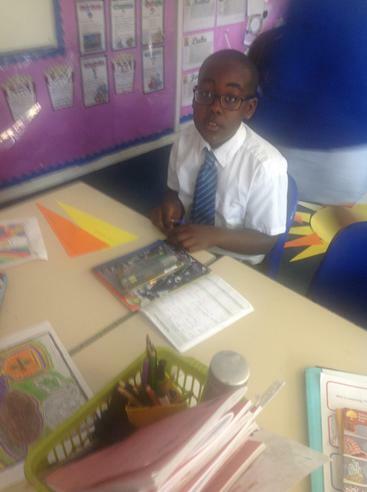 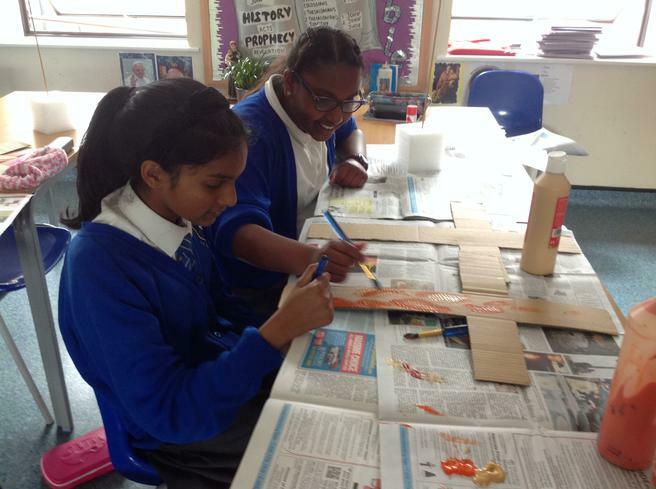 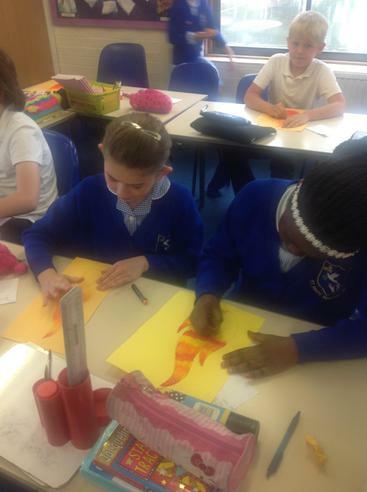 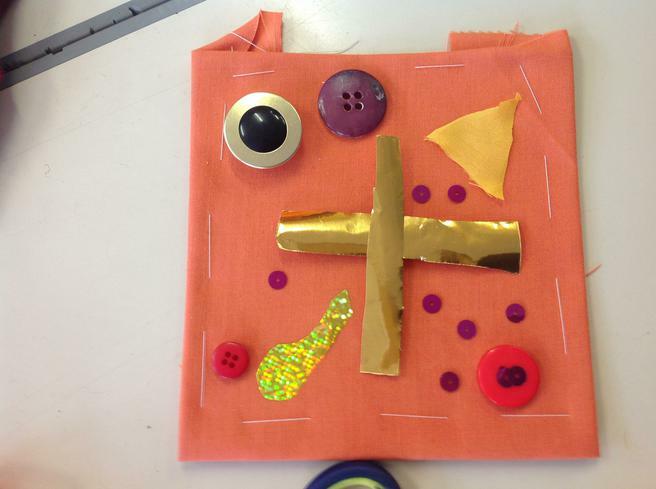 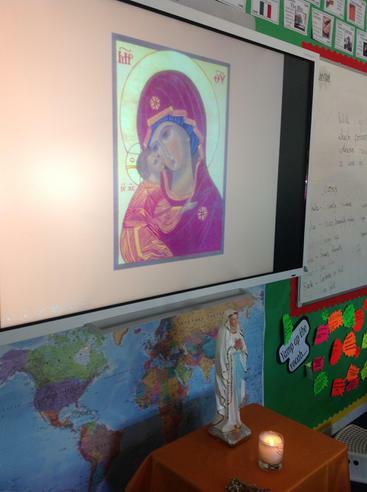 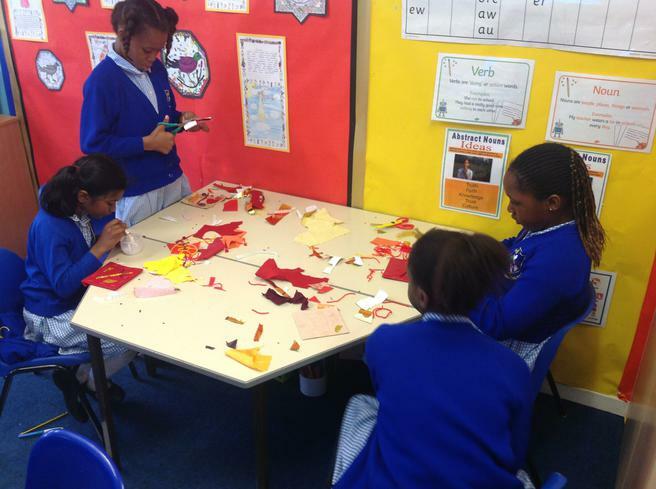 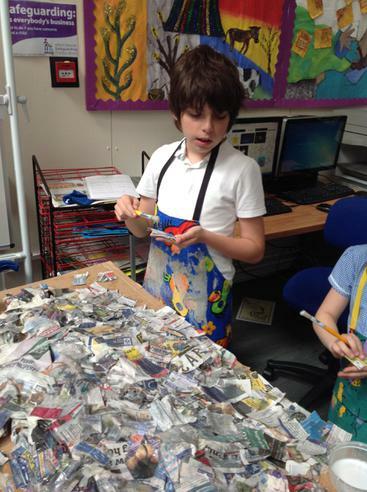 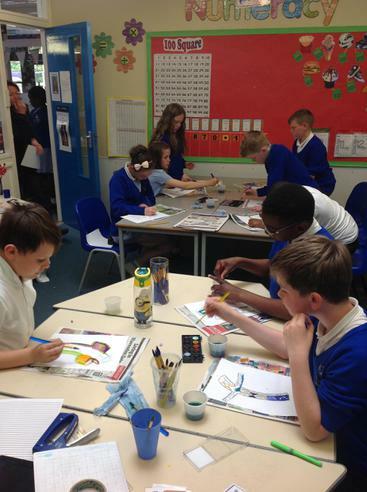 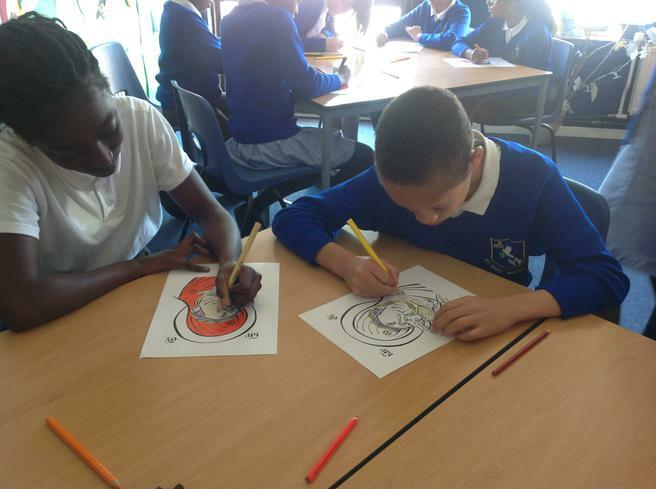 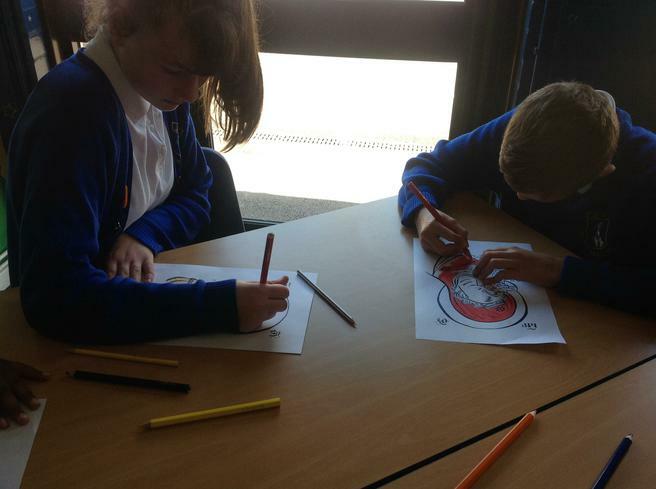 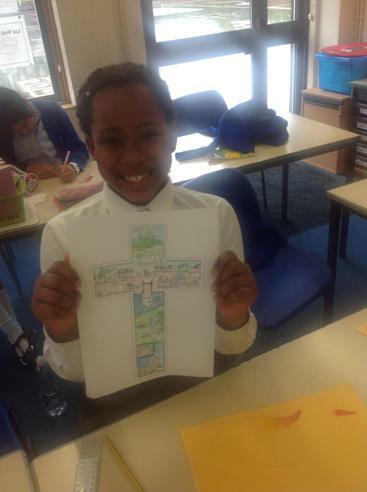 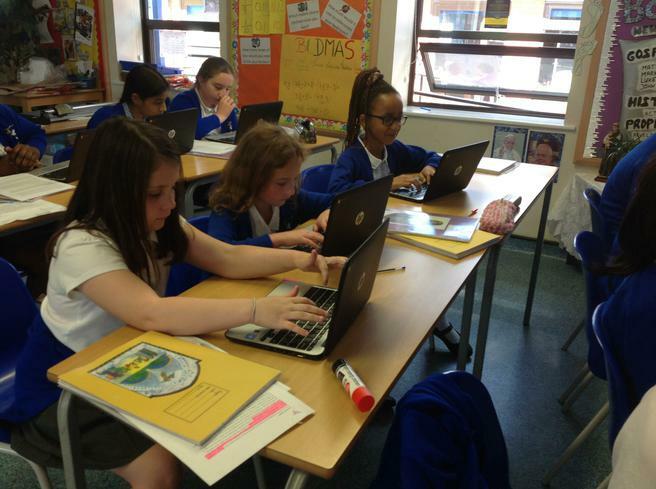 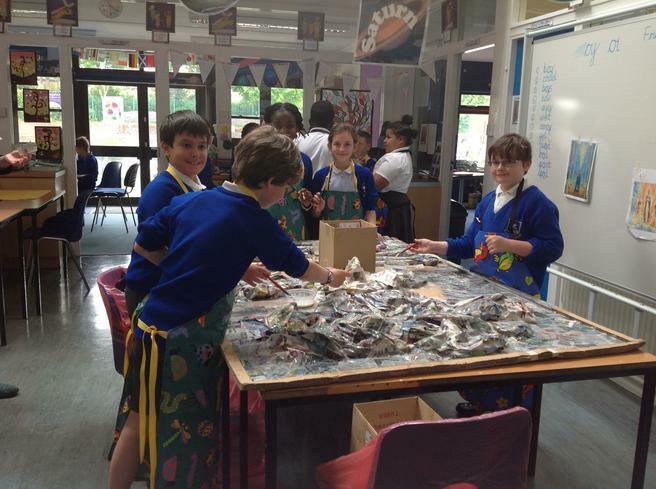 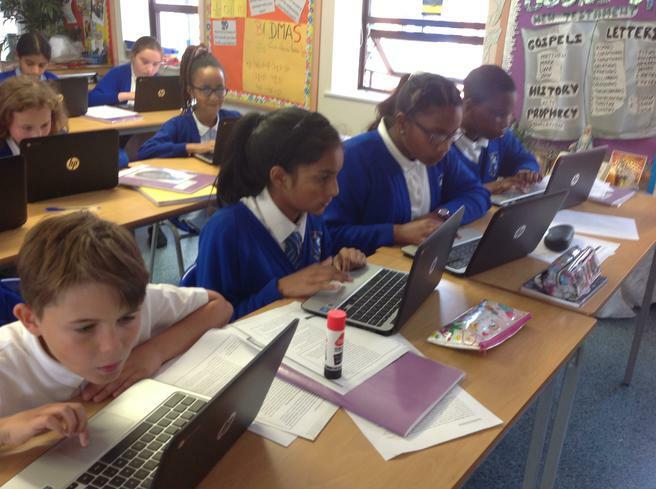 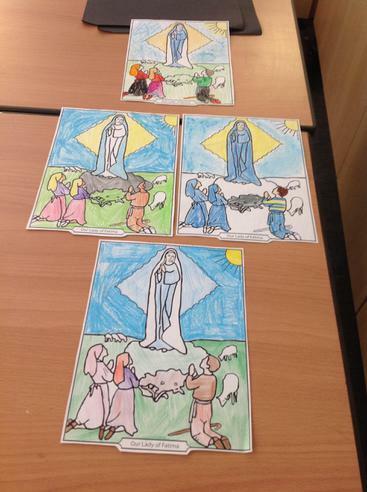 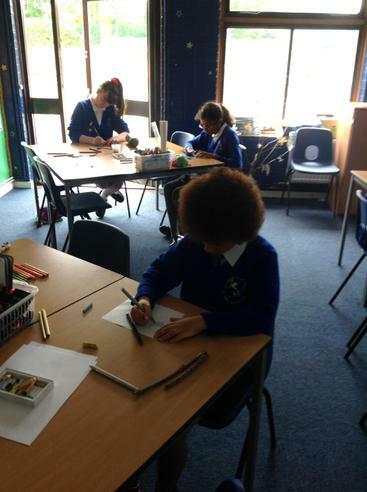 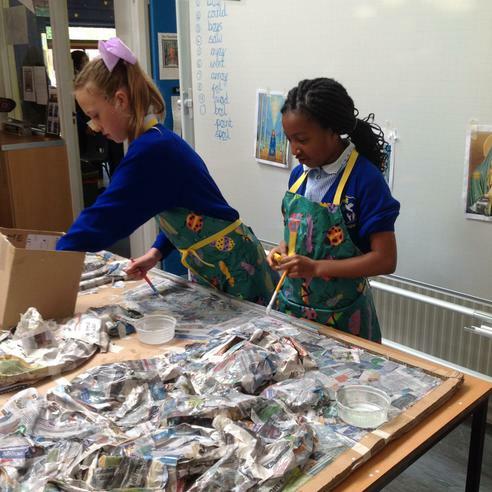 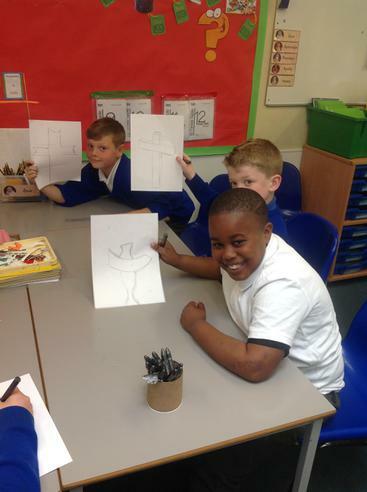 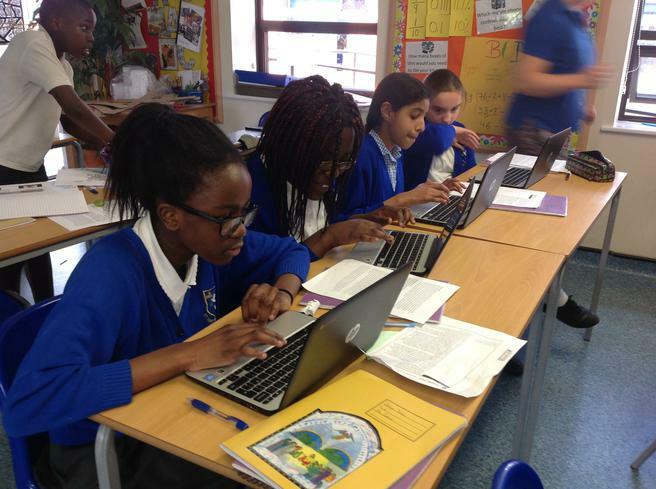 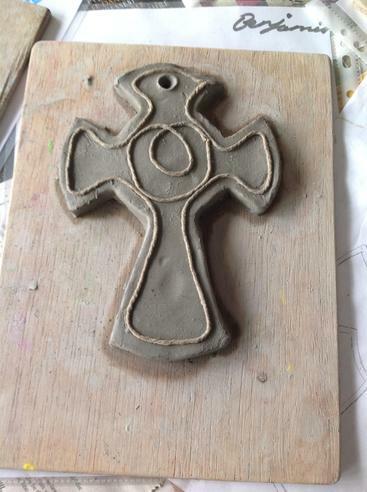 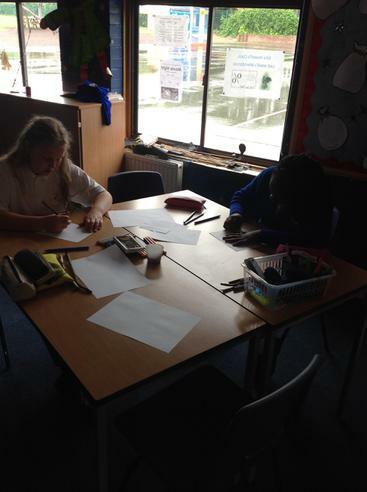 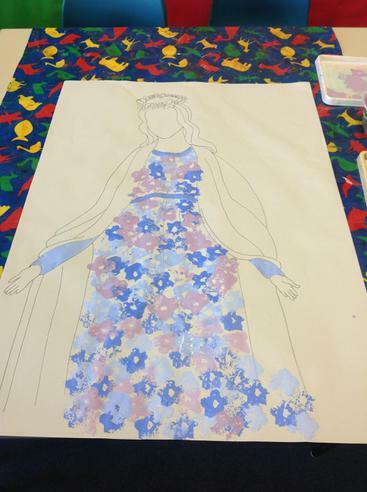 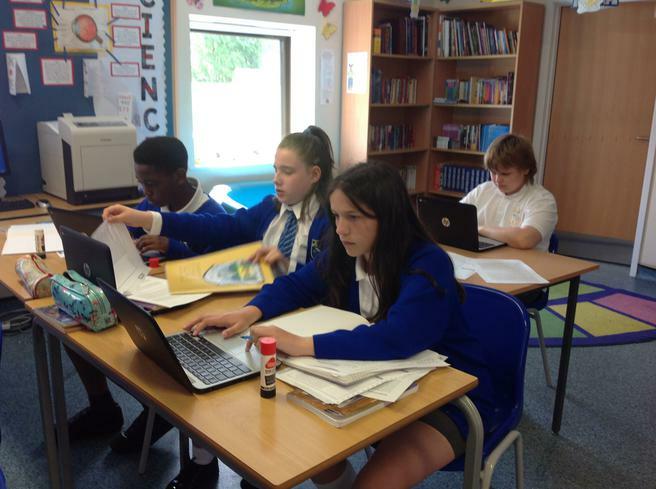 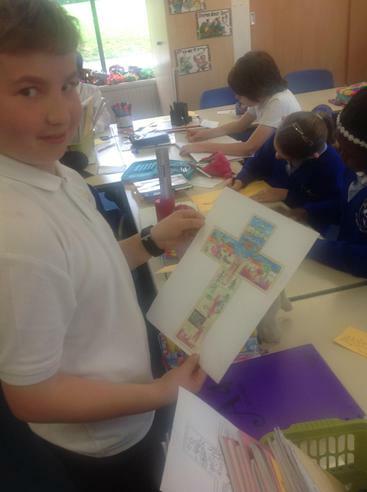 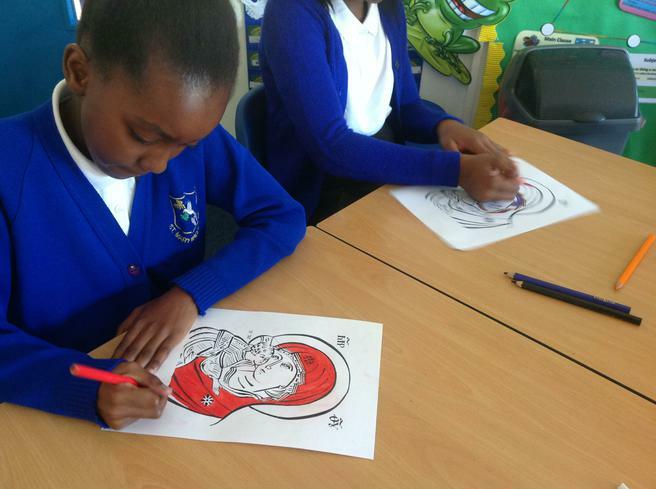 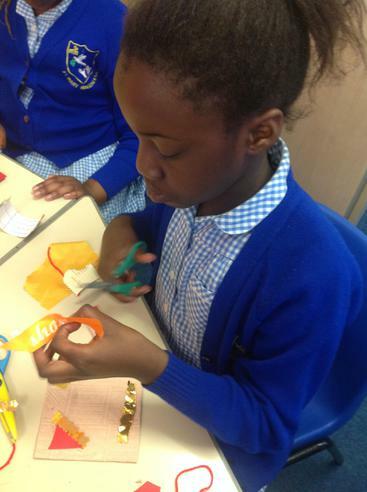 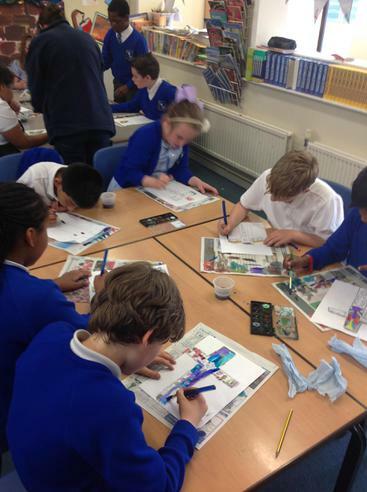 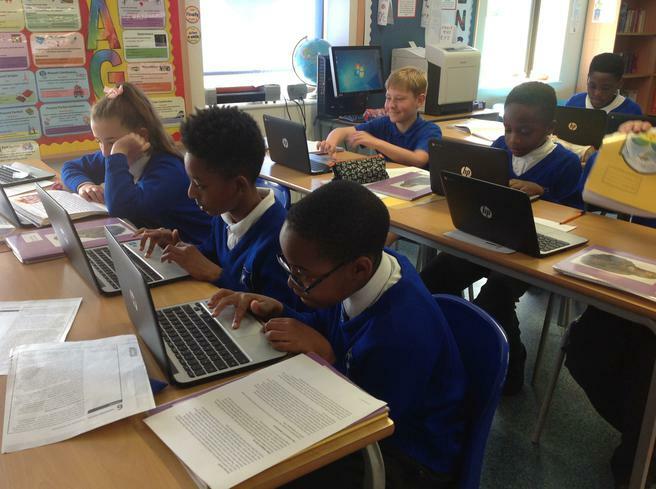 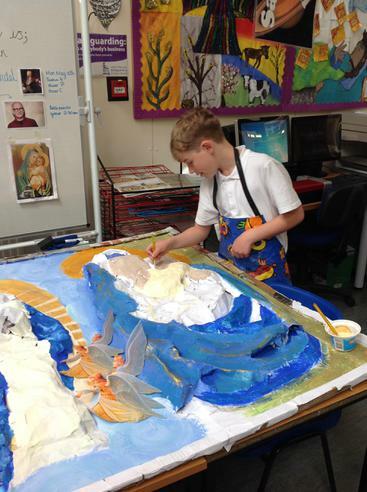 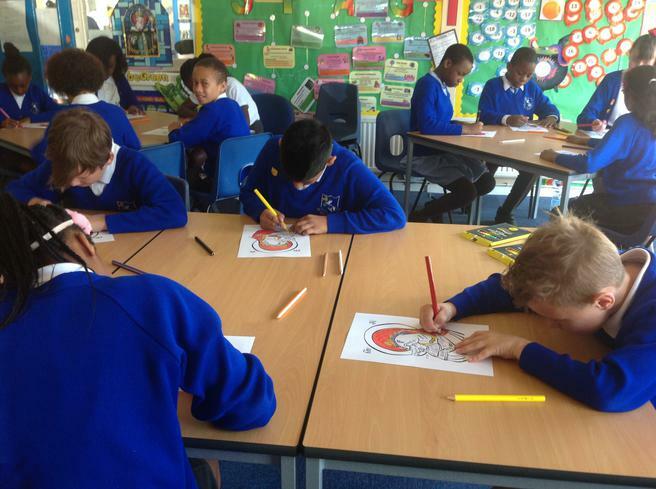 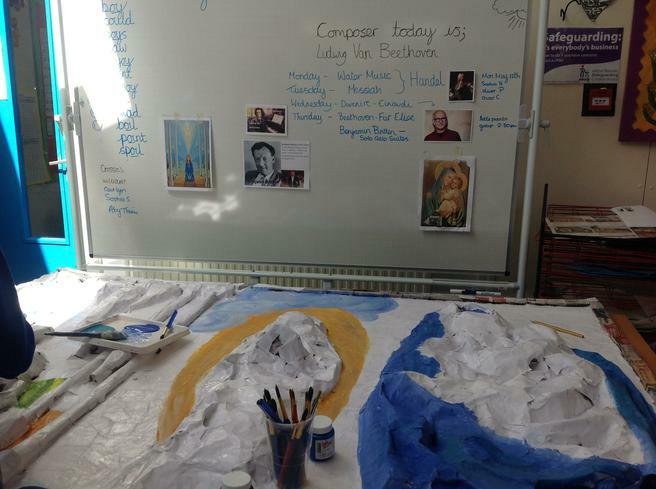 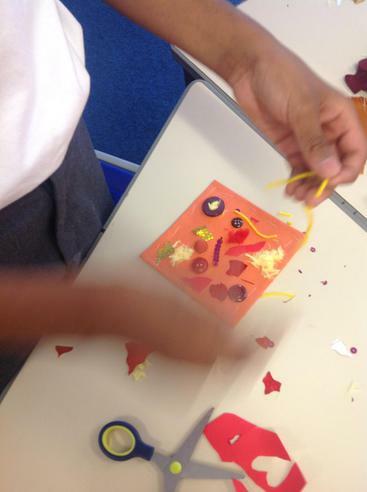 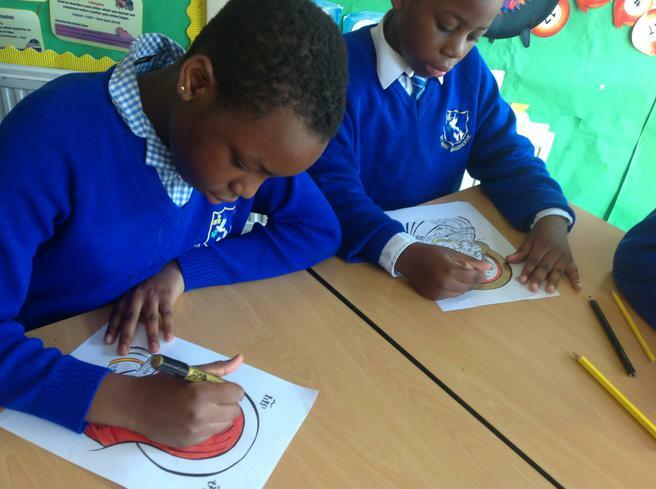 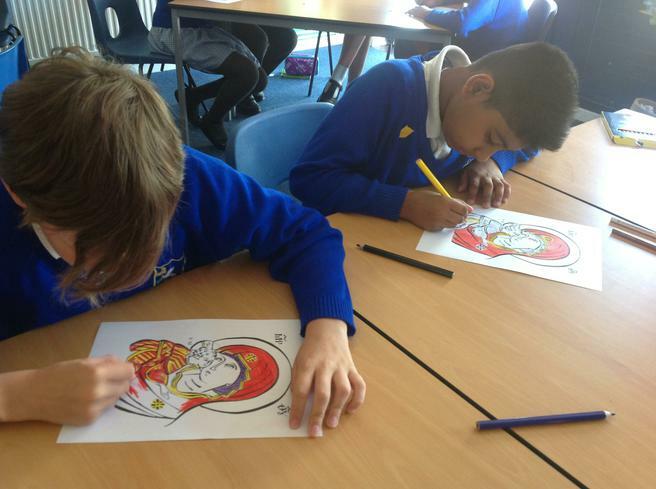 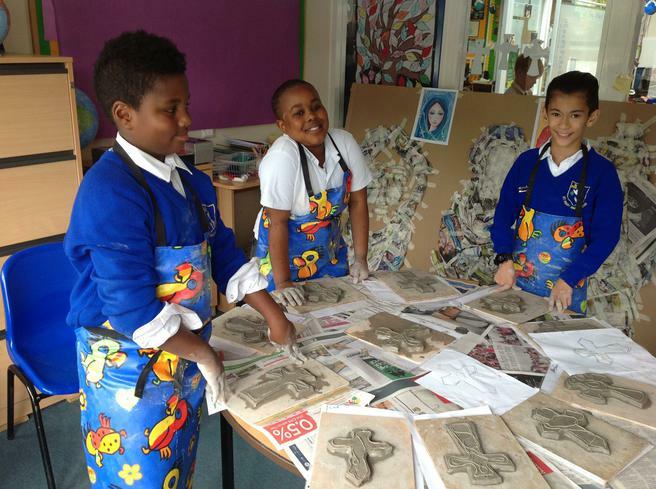 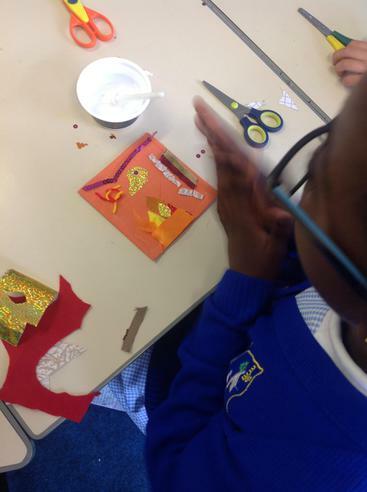 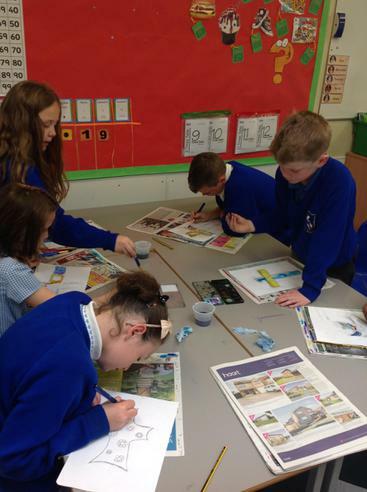 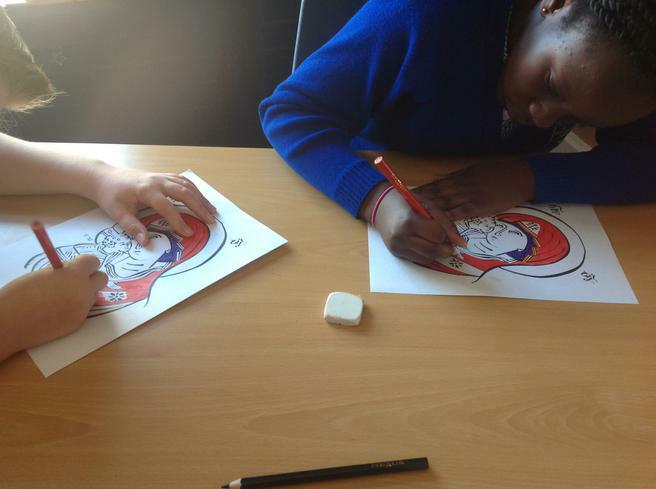 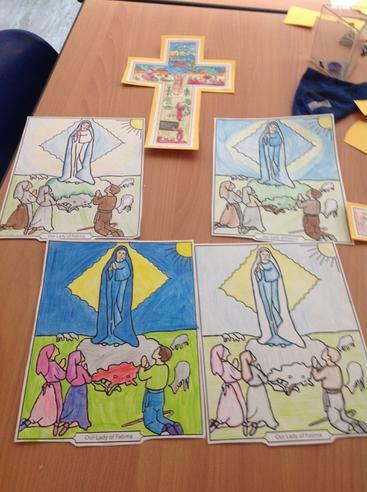 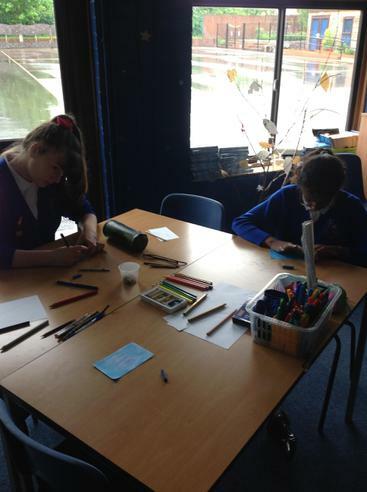 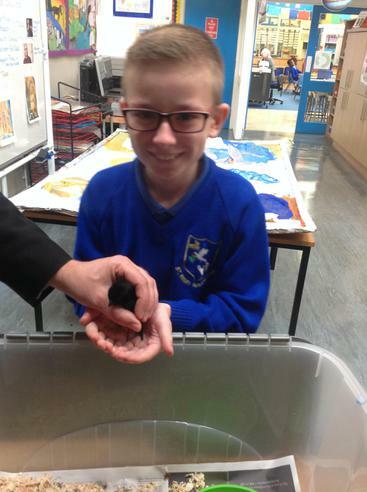 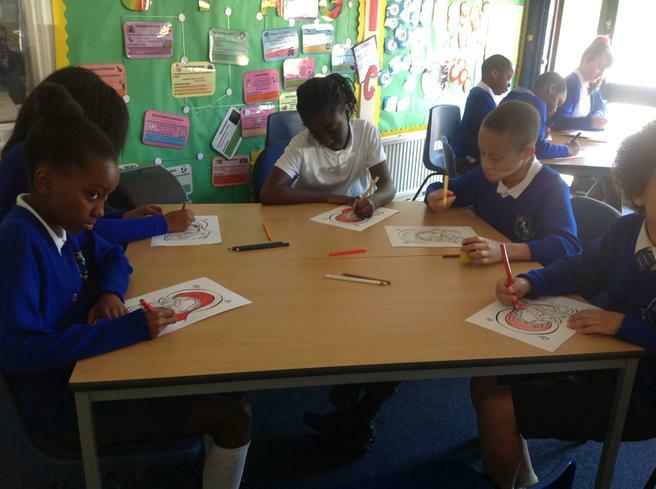 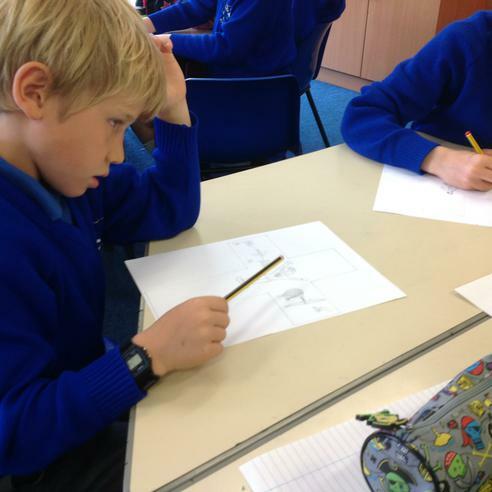 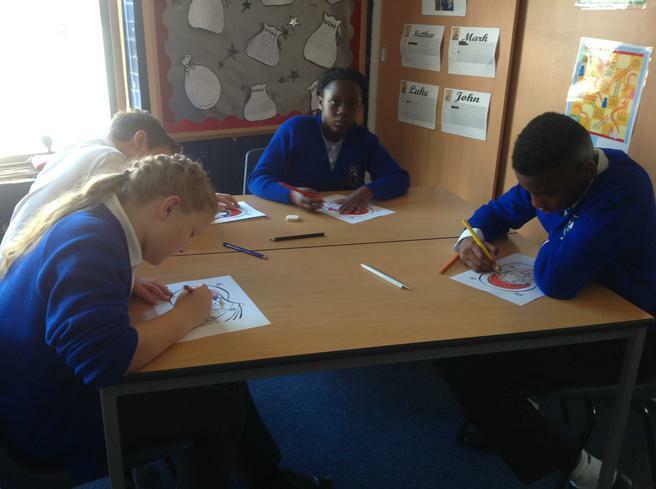 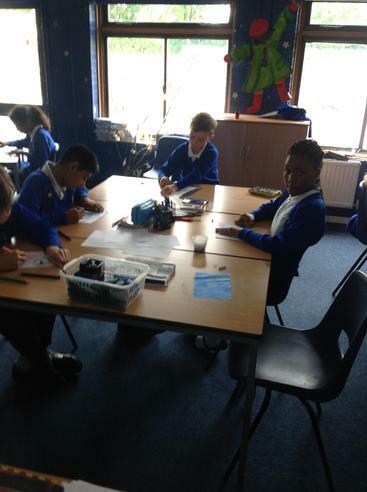 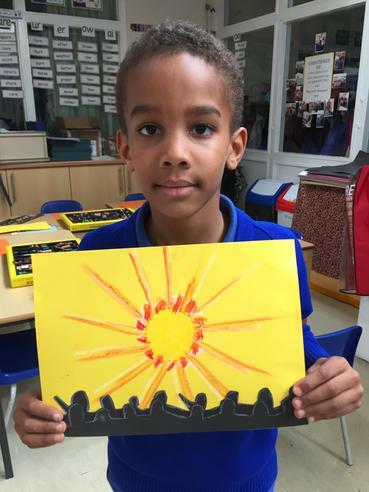 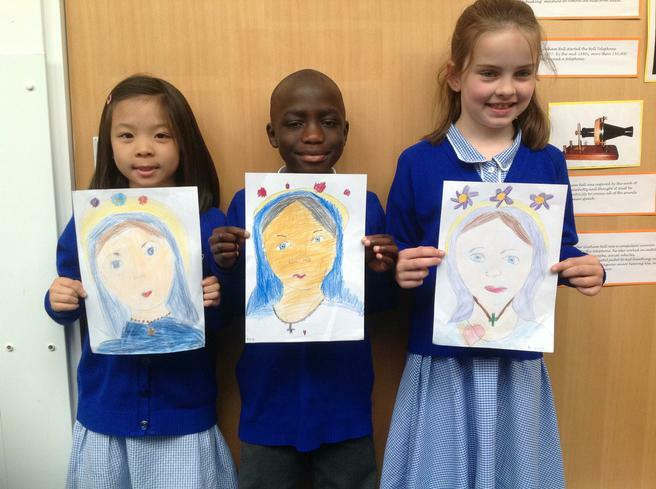 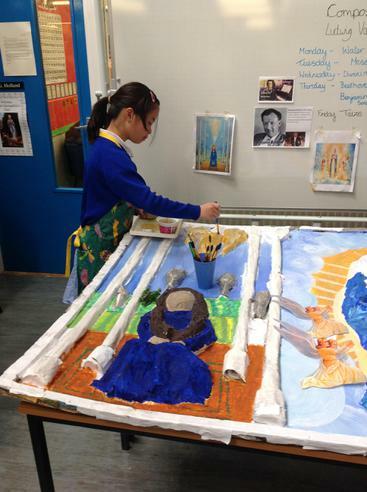 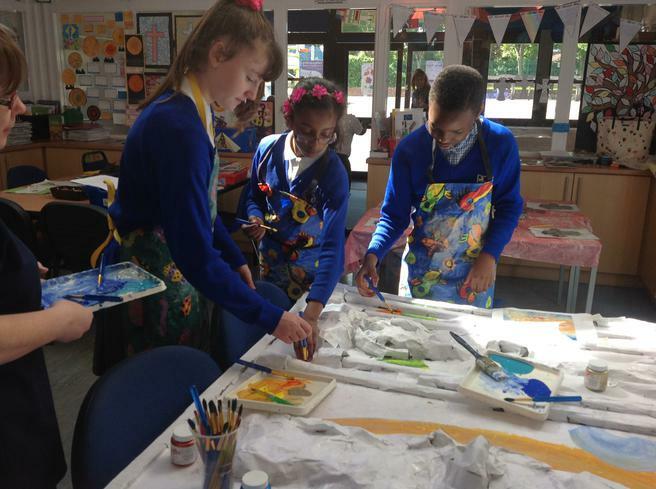 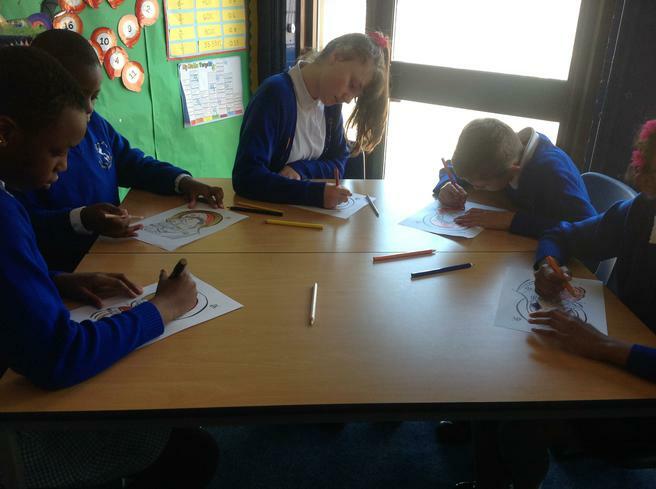 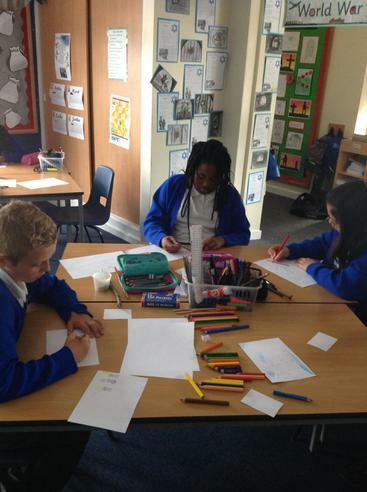 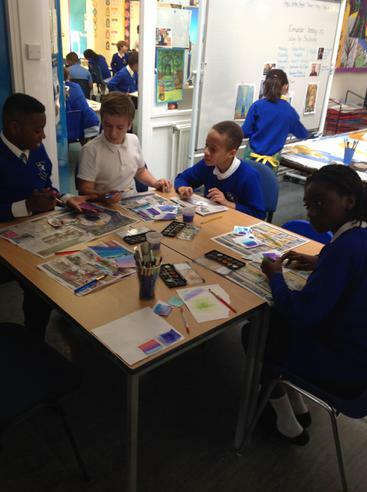 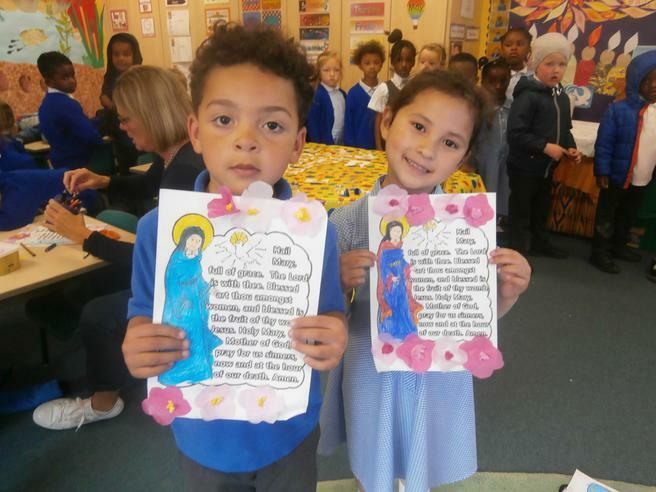 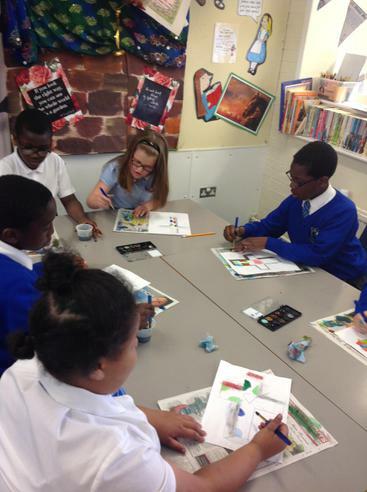 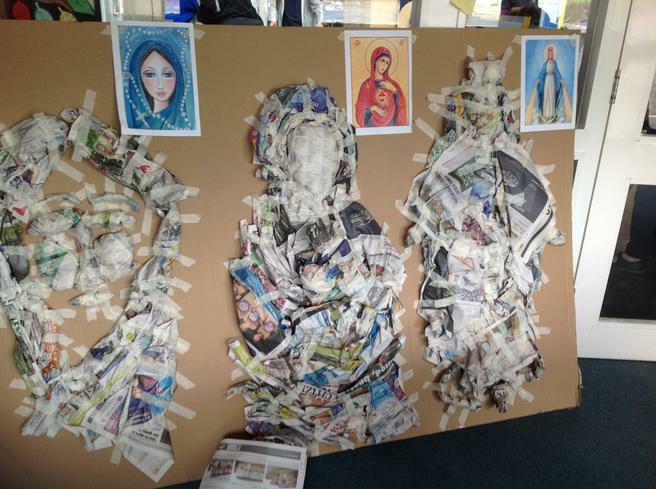 Year 6 are studying Iconography - During the Month of Mary they have looked at the Mother of God of Compassion Icon and have studied the symbolism of each colour, gesture, form and their meanings. 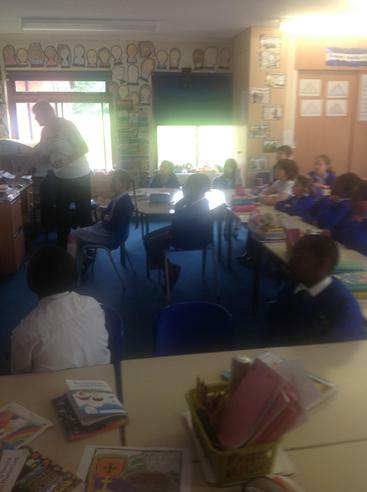 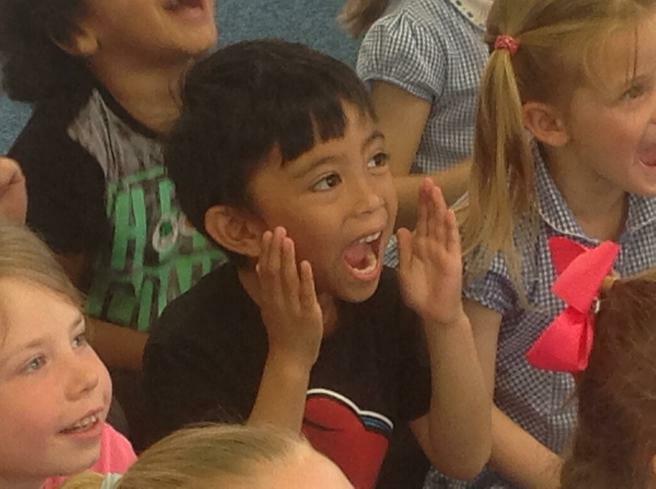 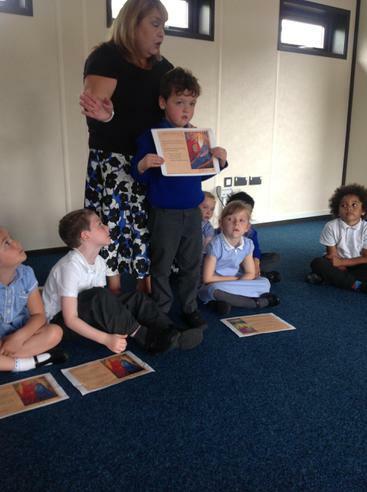 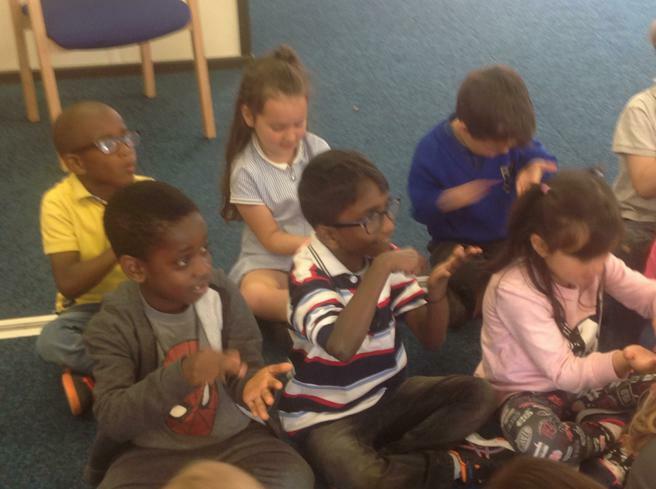 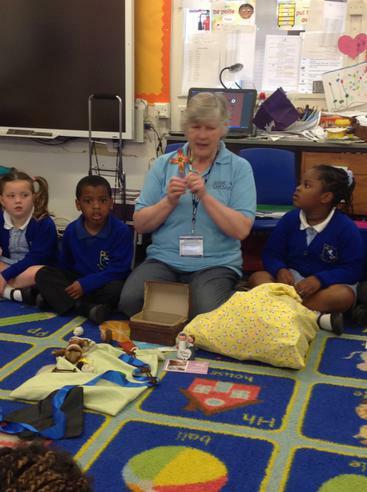 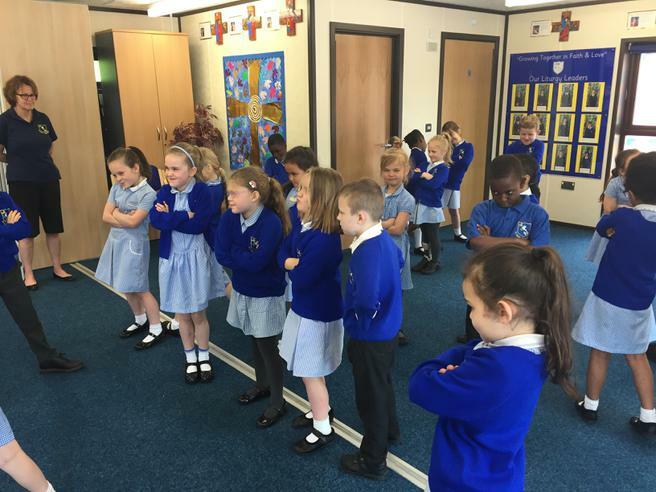 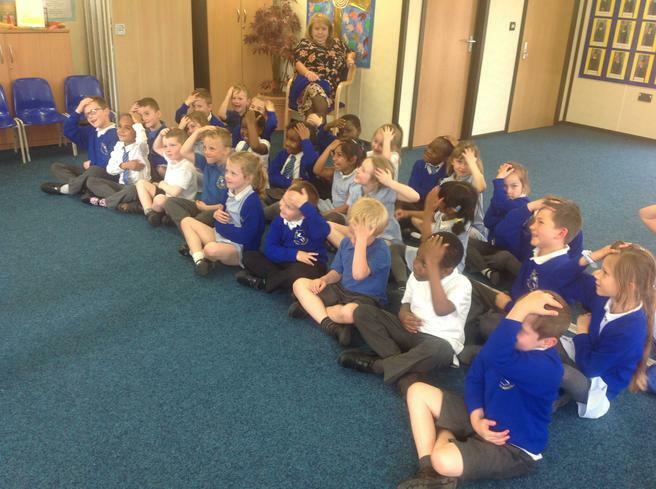 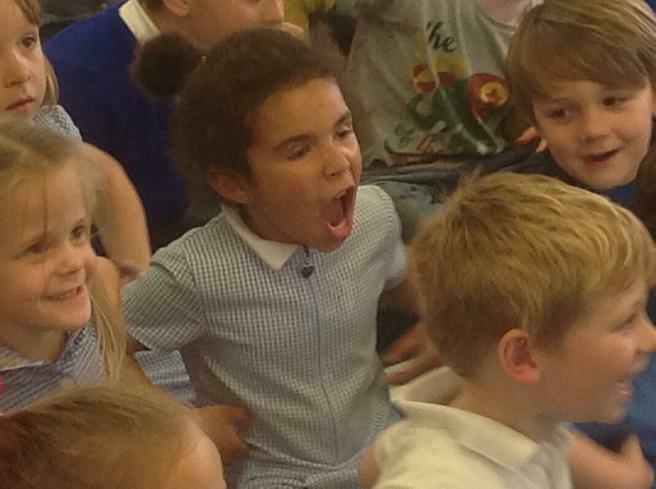 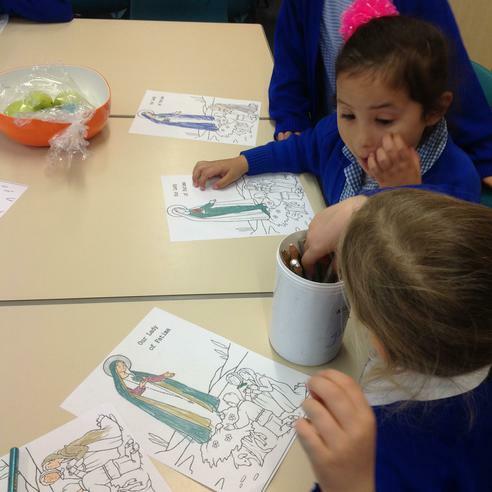 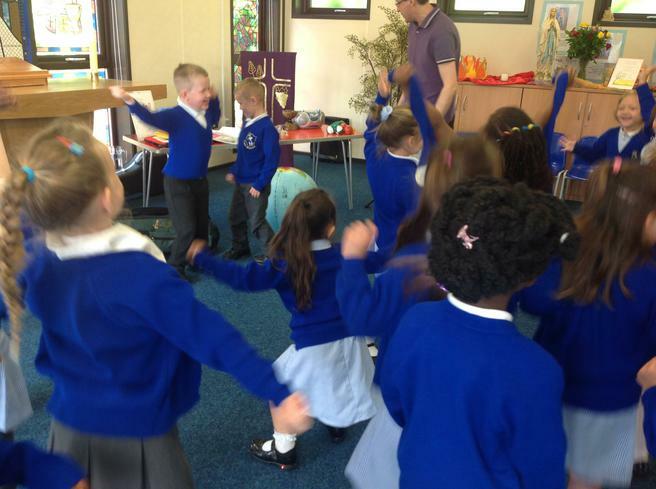 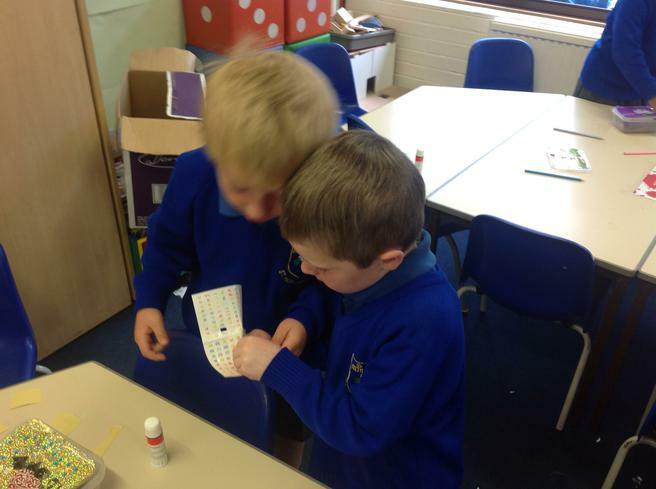 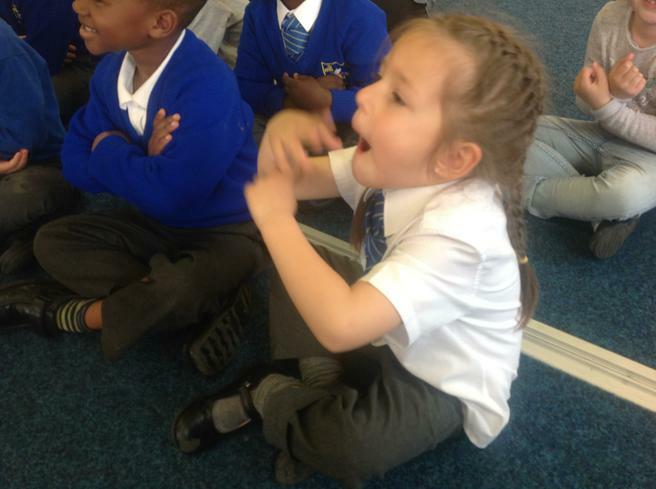 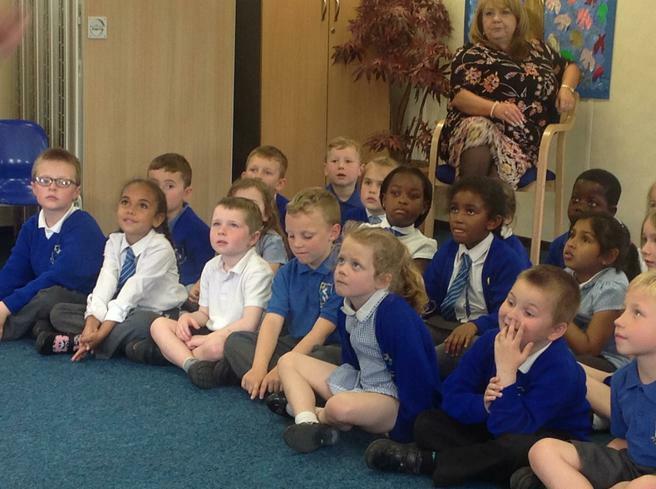 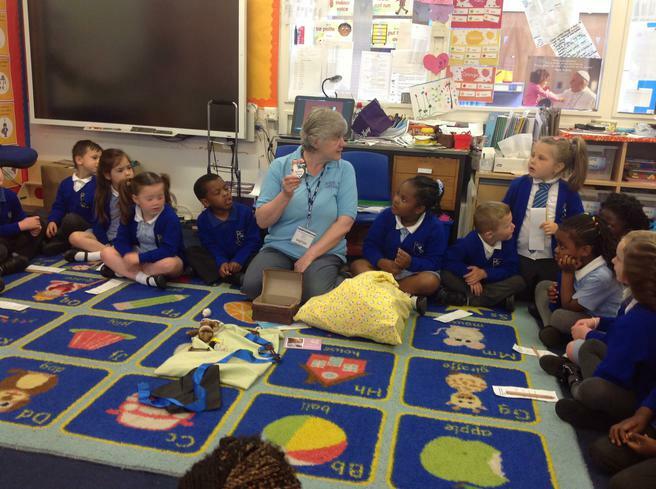 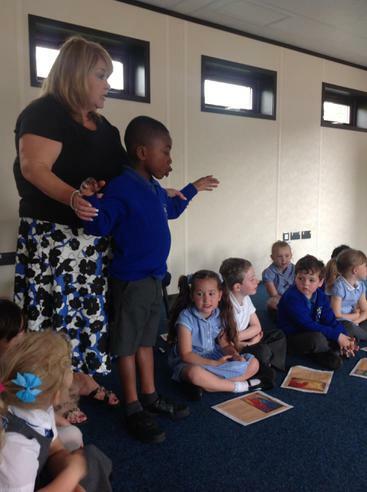 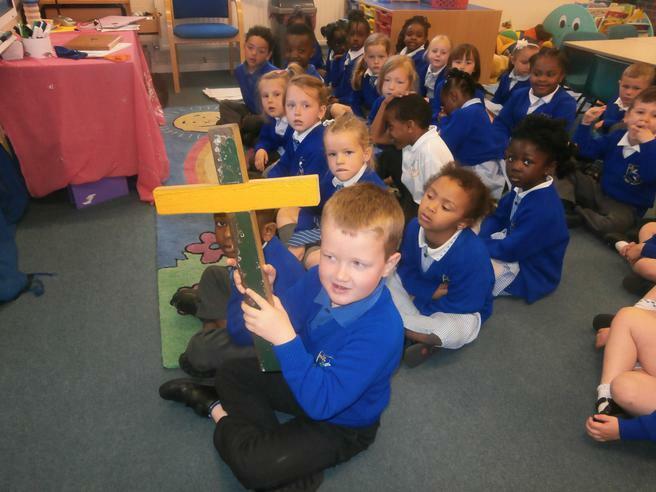 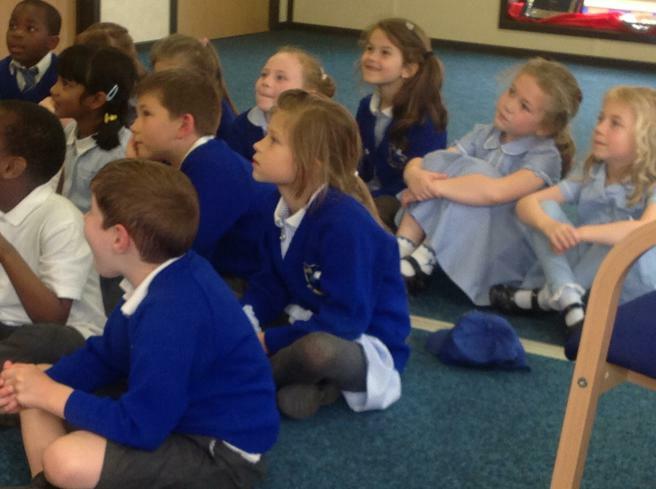 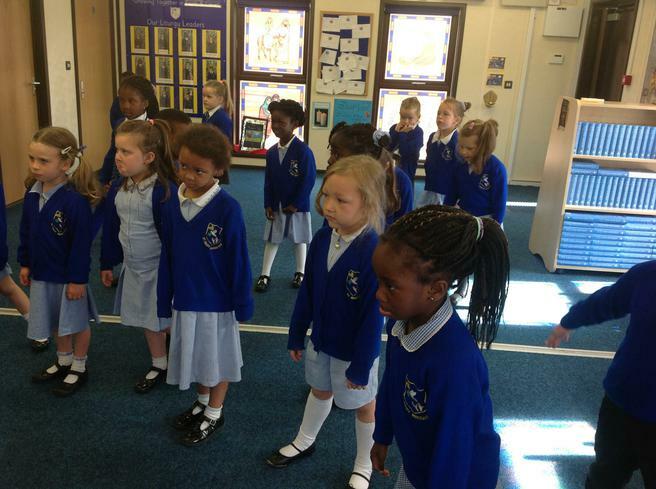 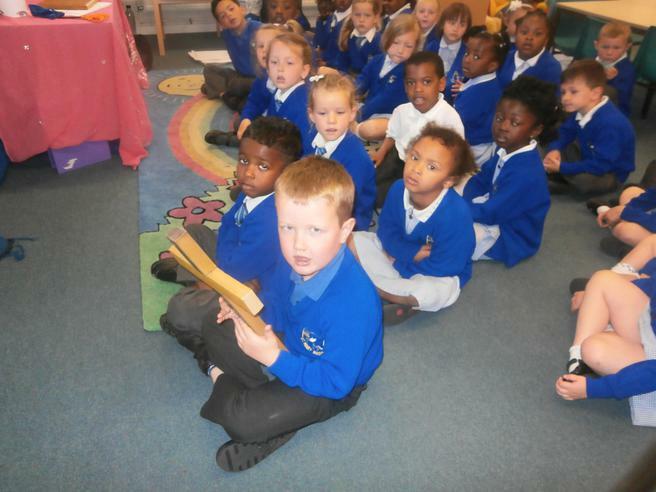 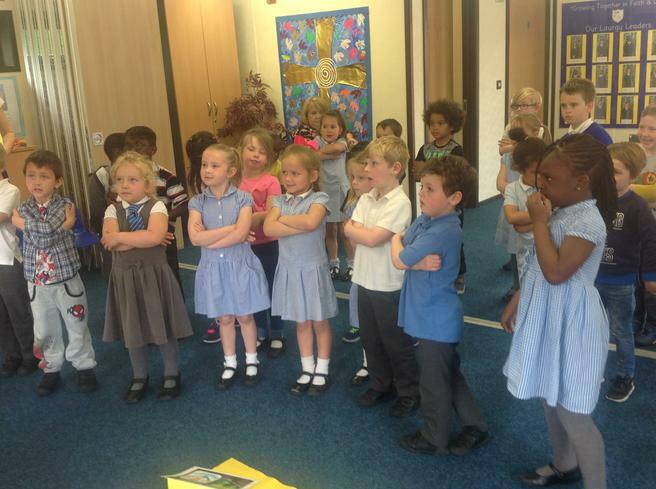 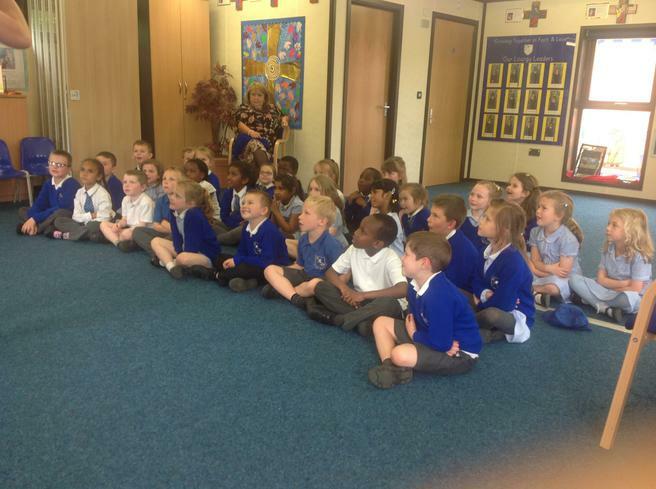 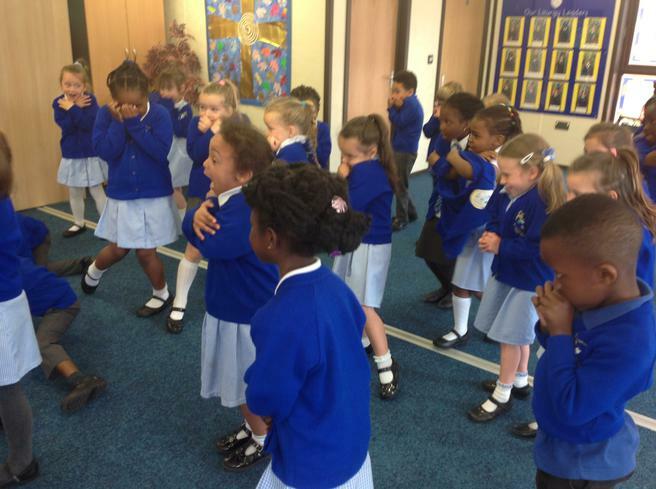 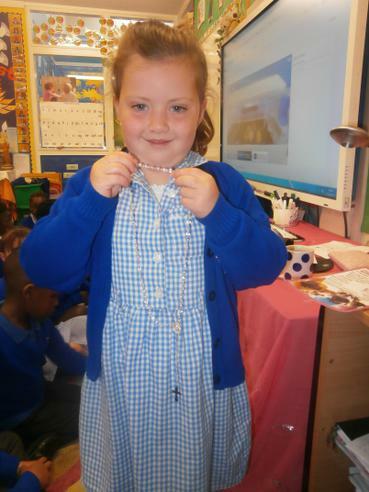 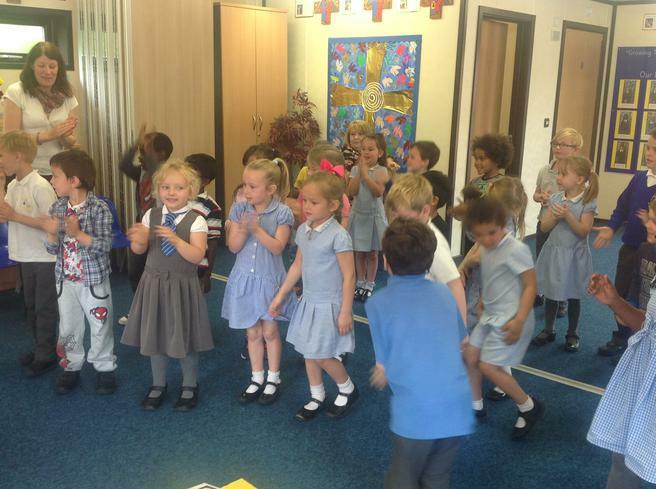 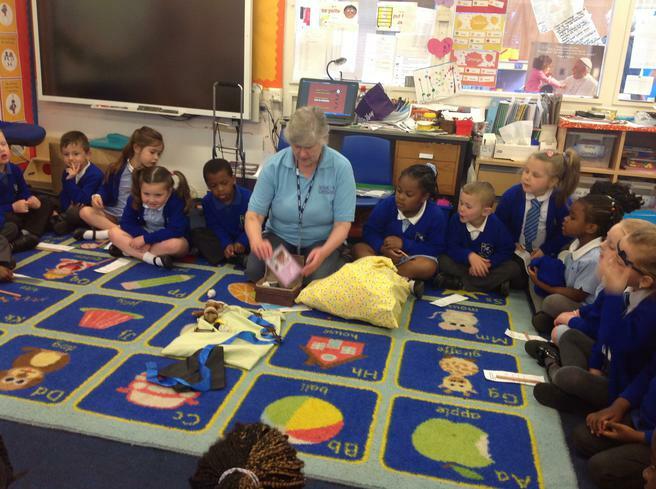 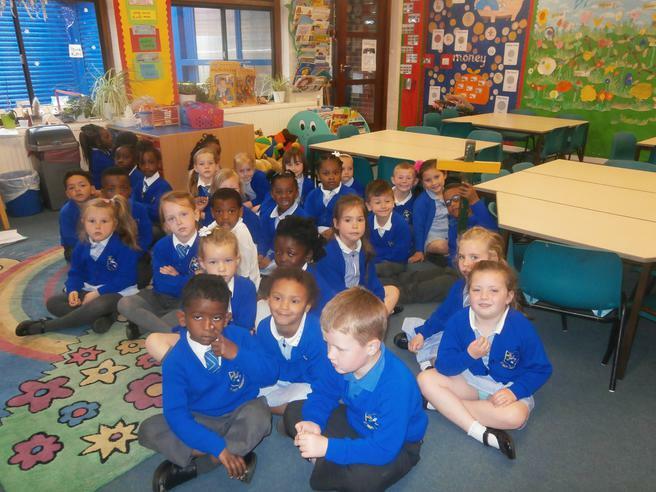 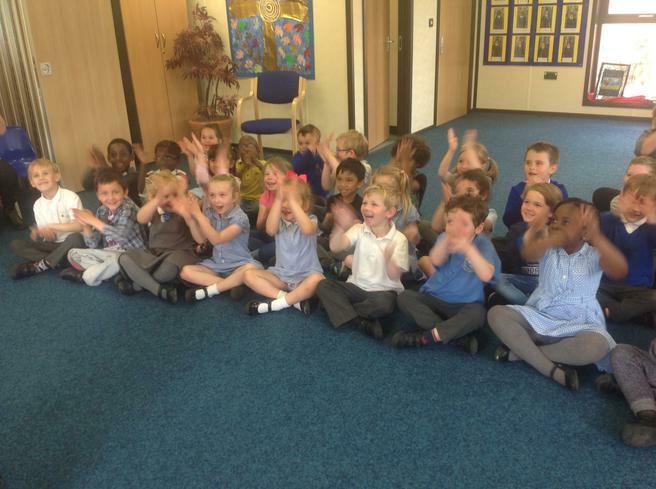 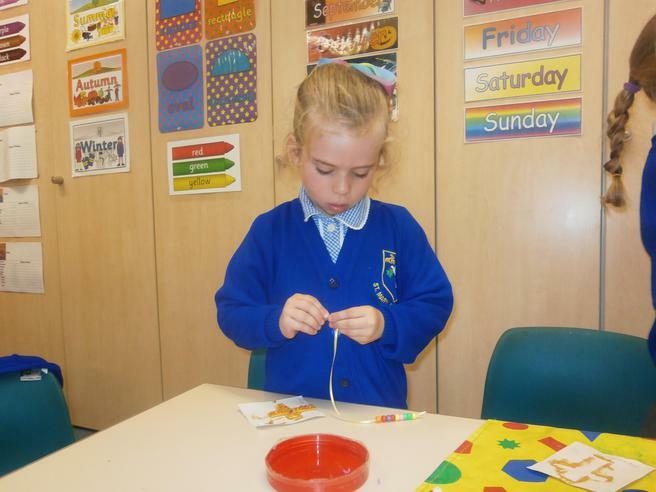 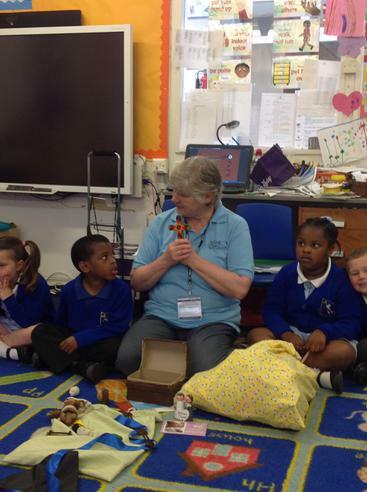 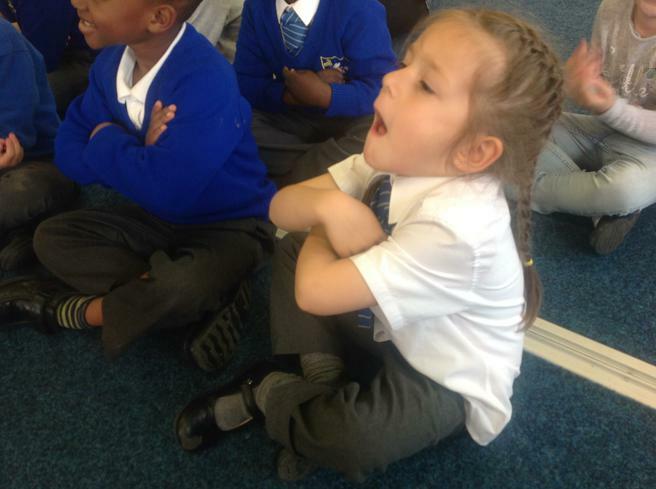 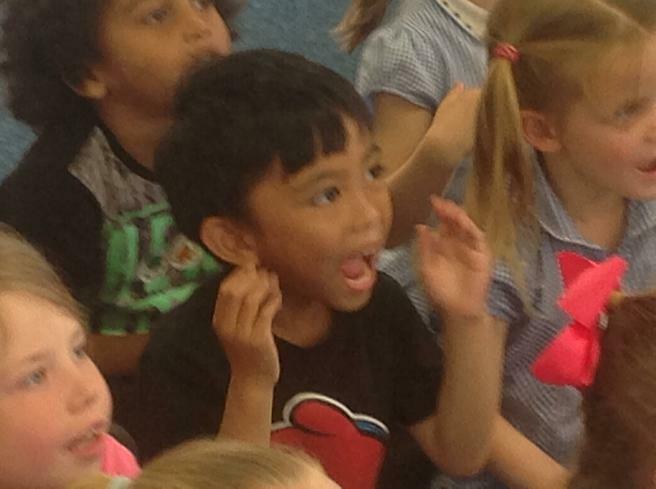 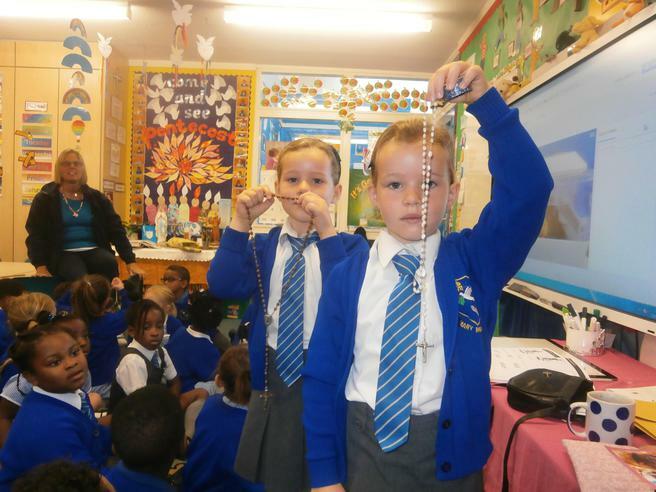 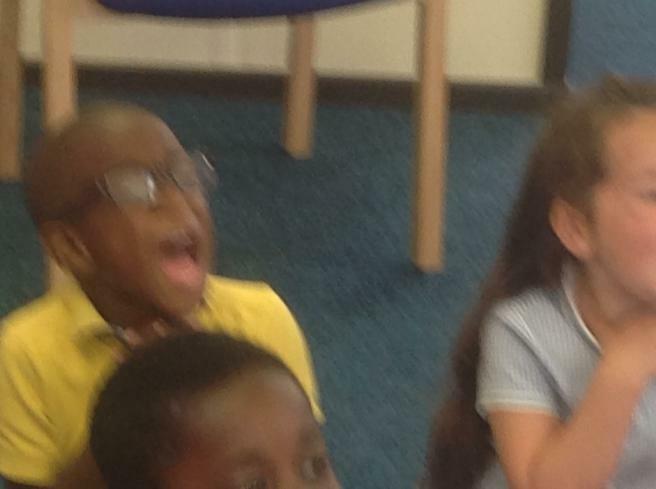 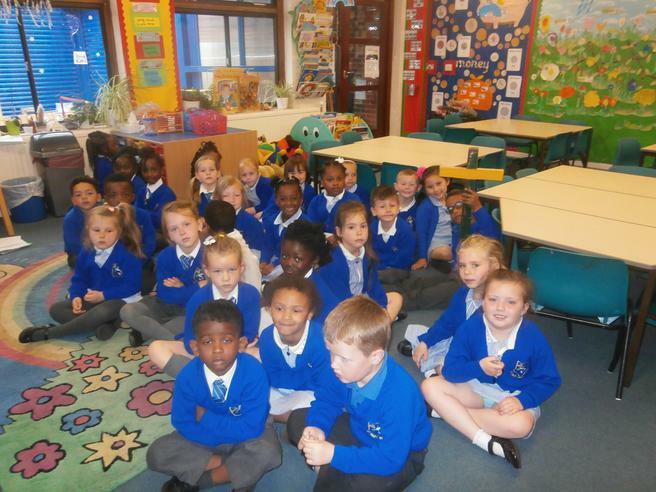 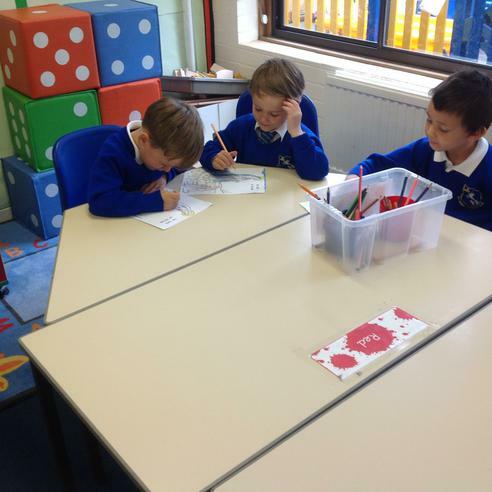 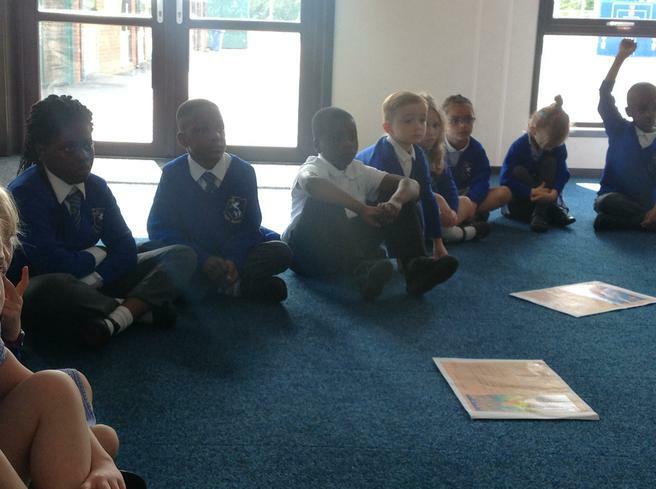 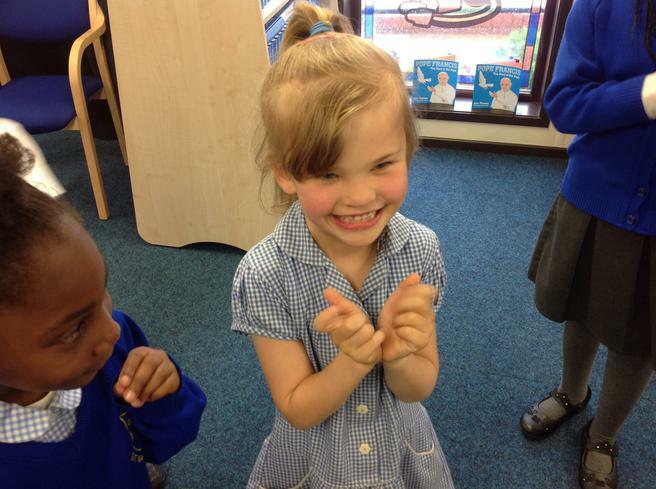 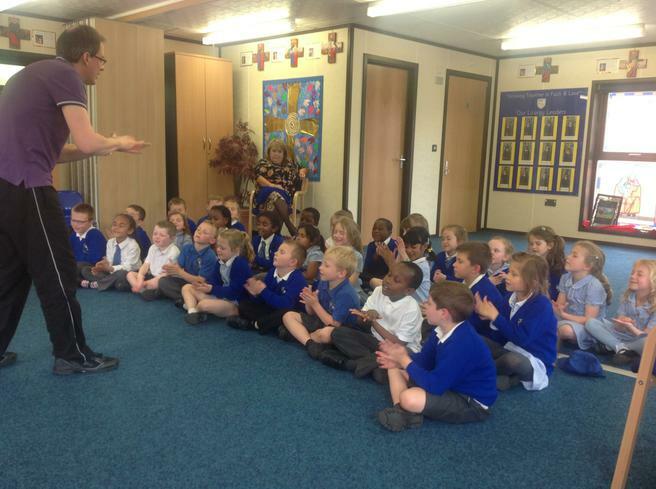 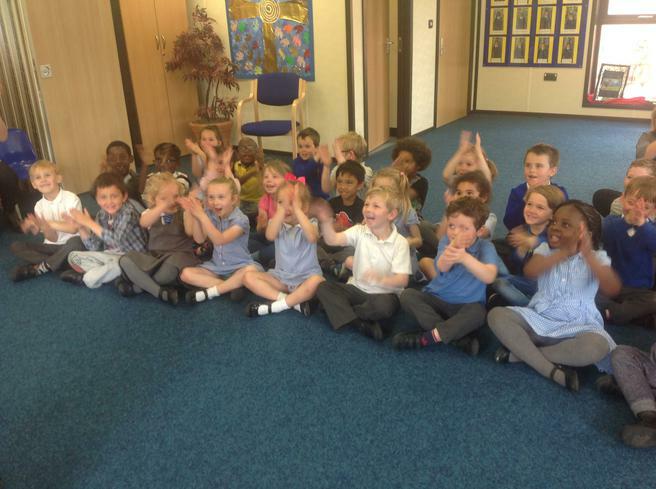 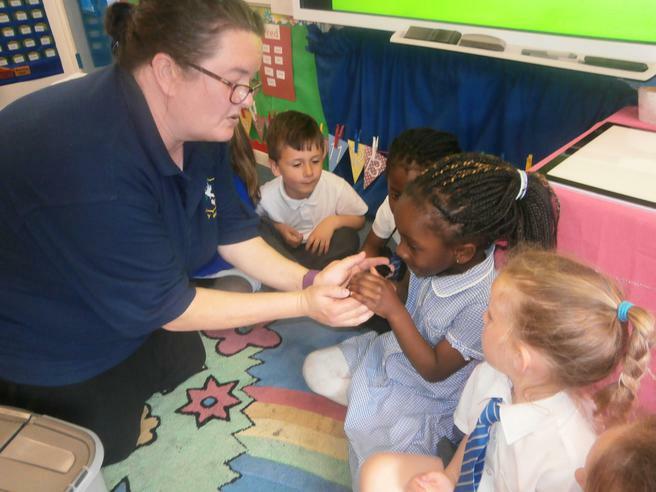 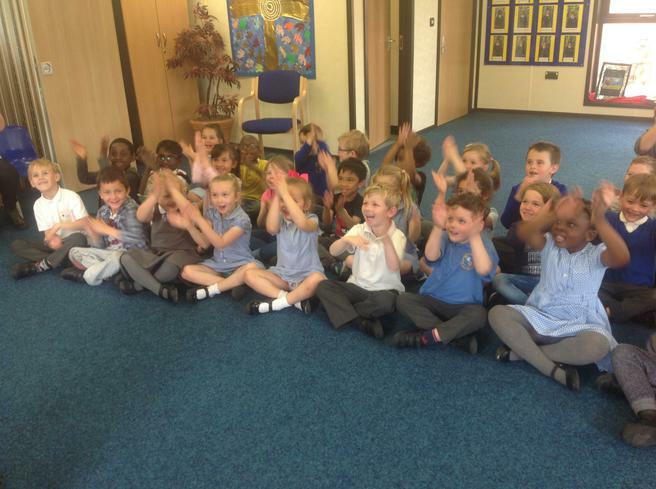 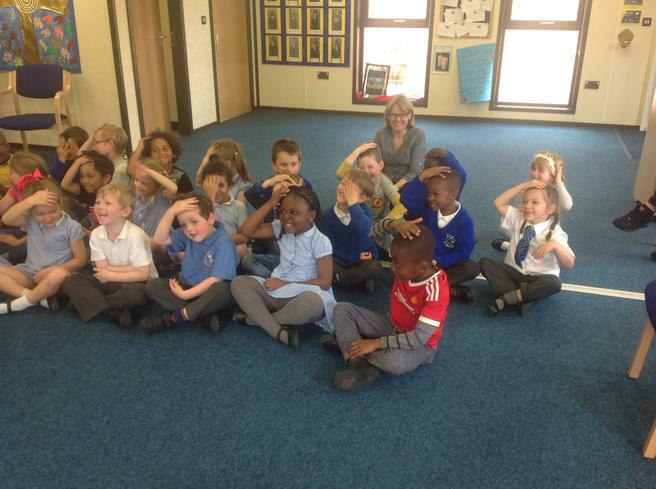 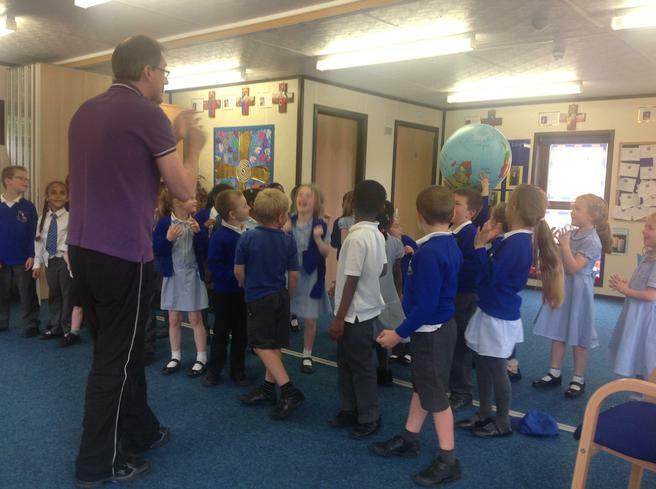 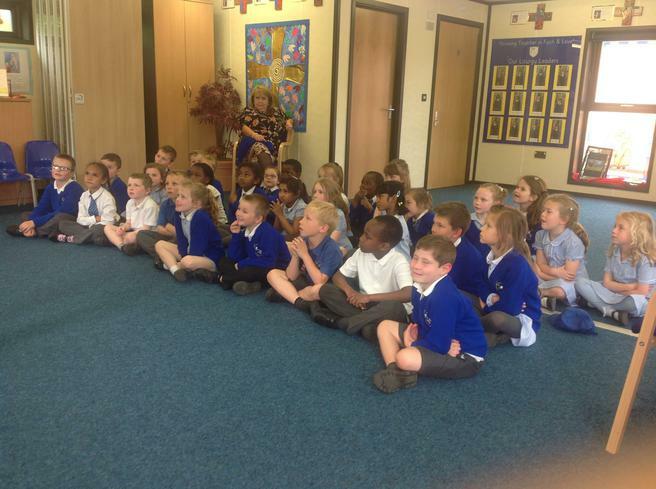 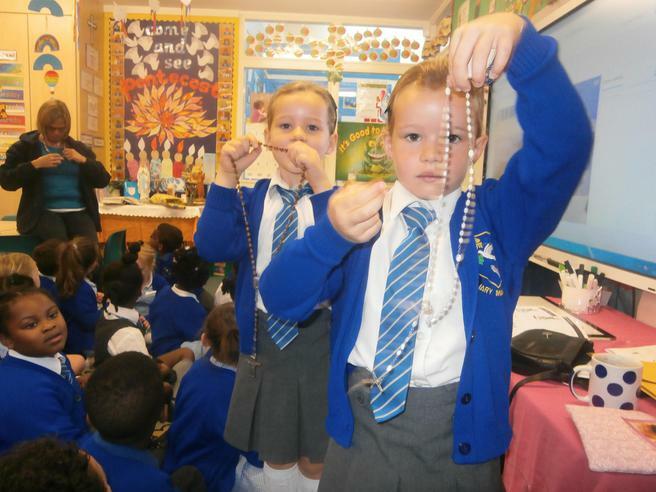 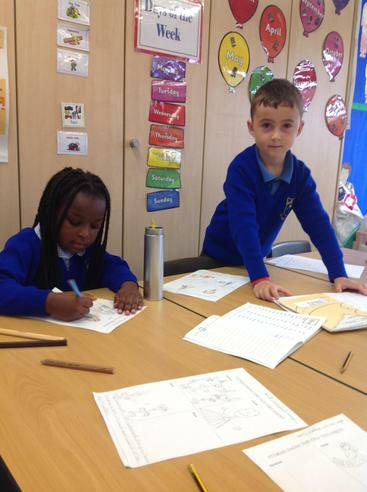 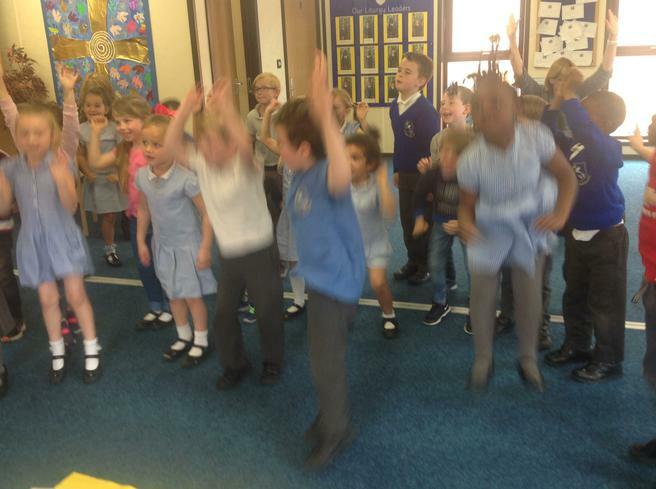 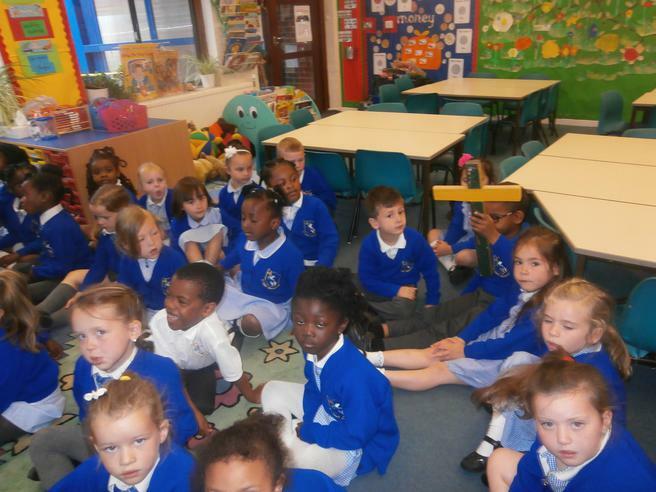 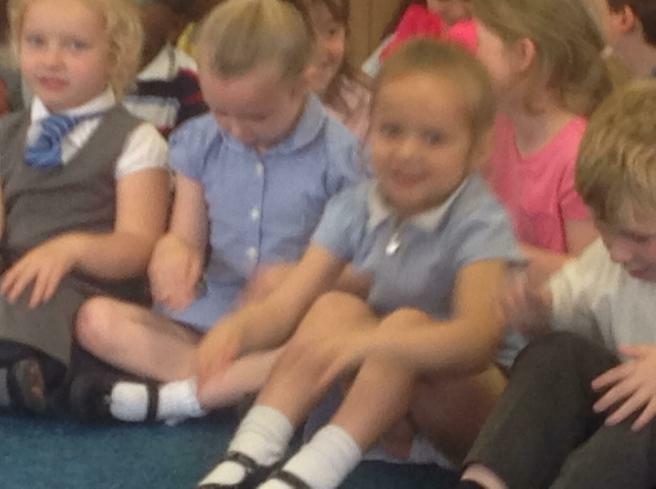 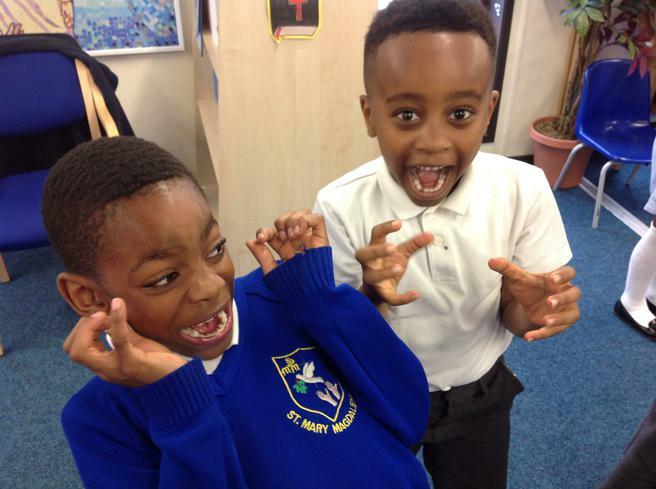 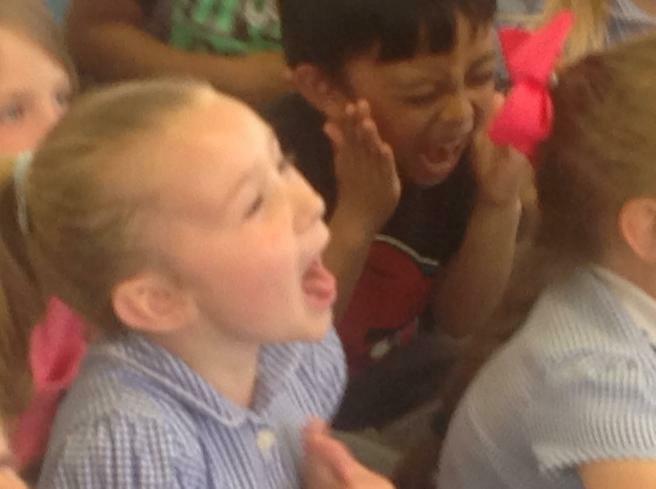 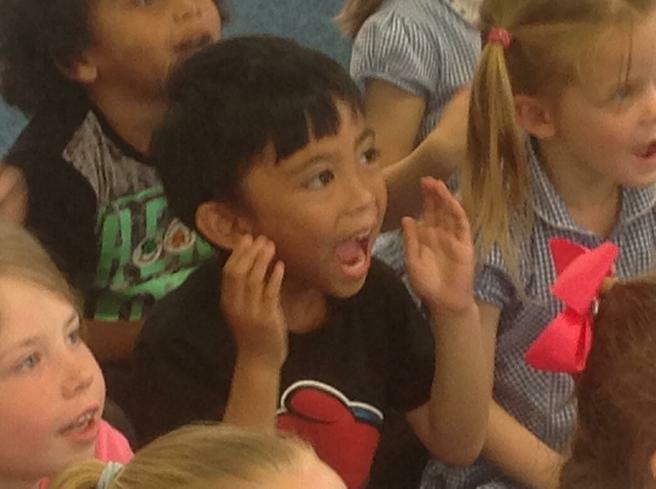 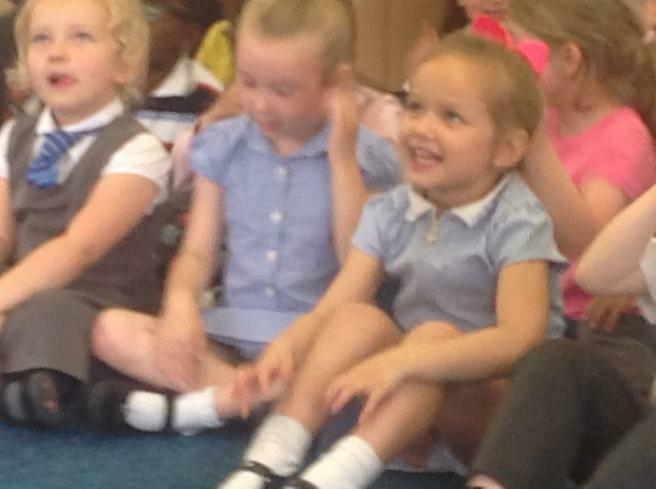 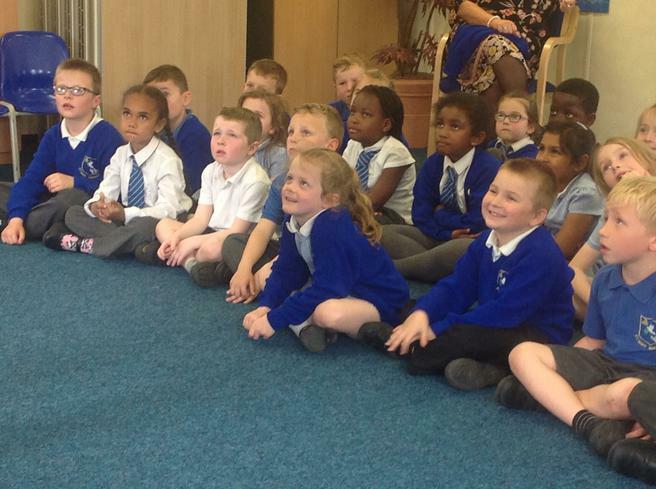 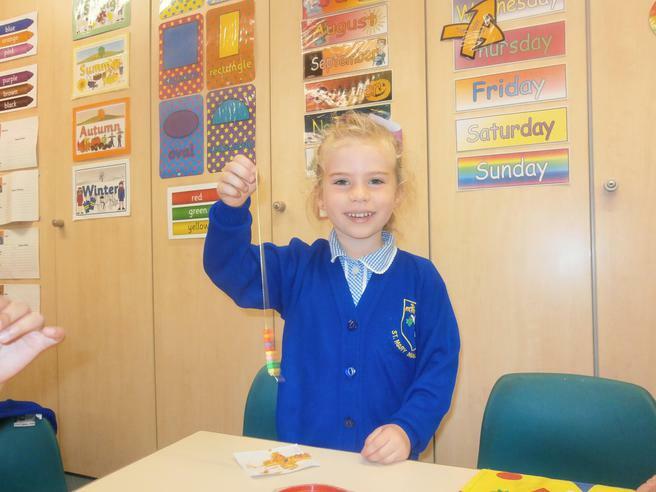 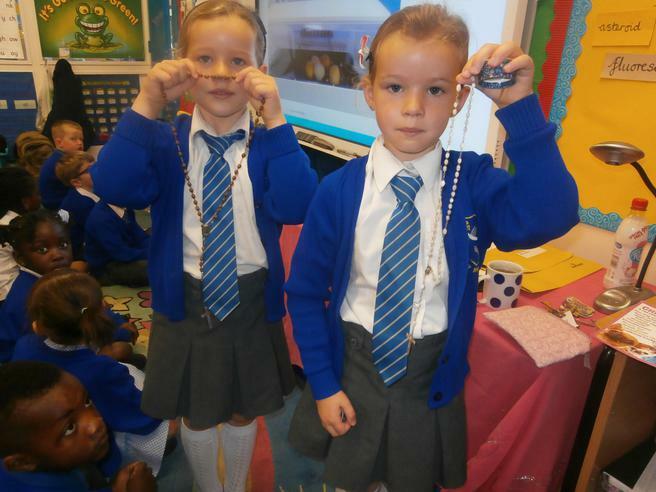 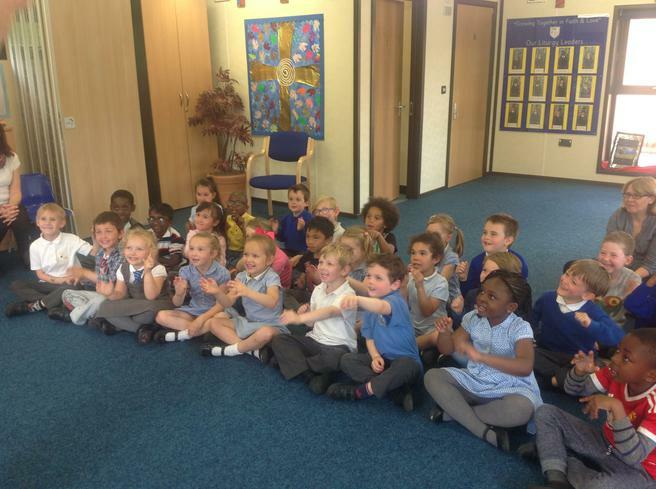 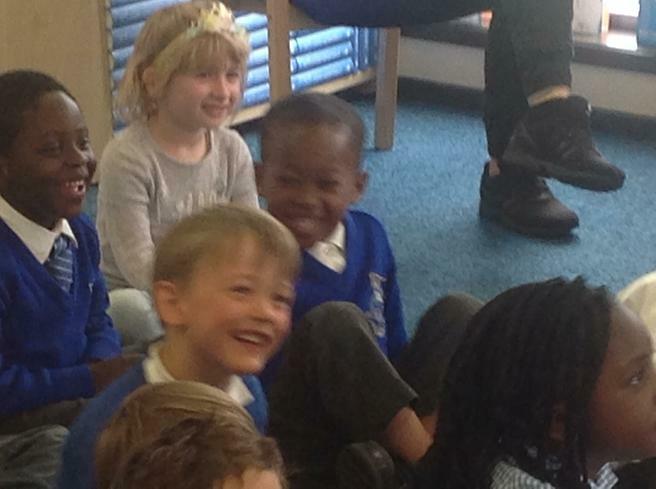 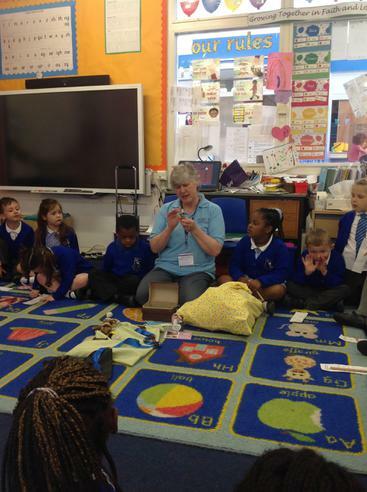 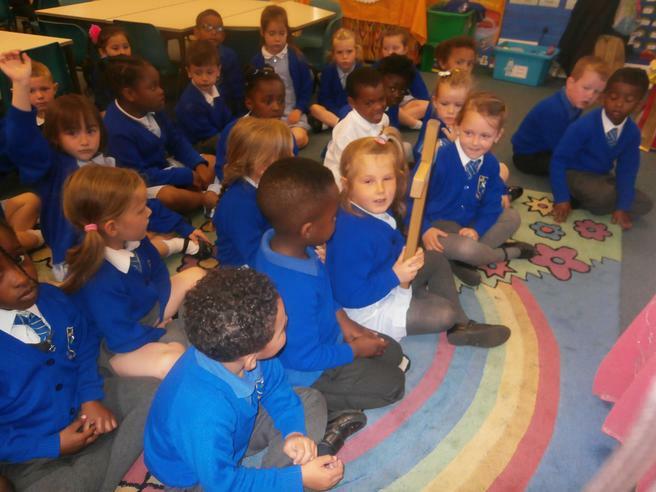 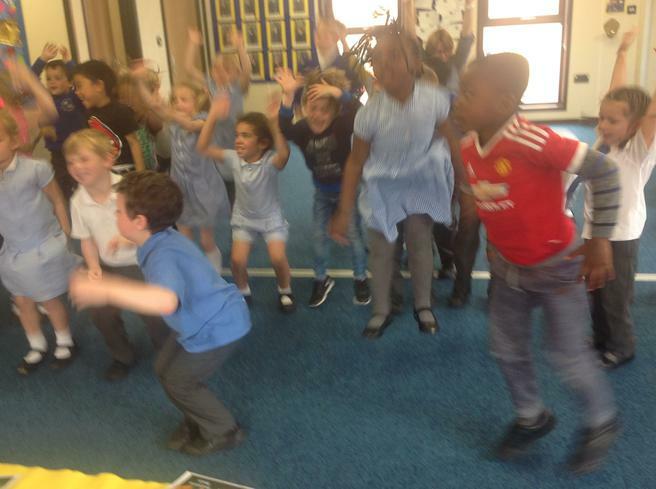 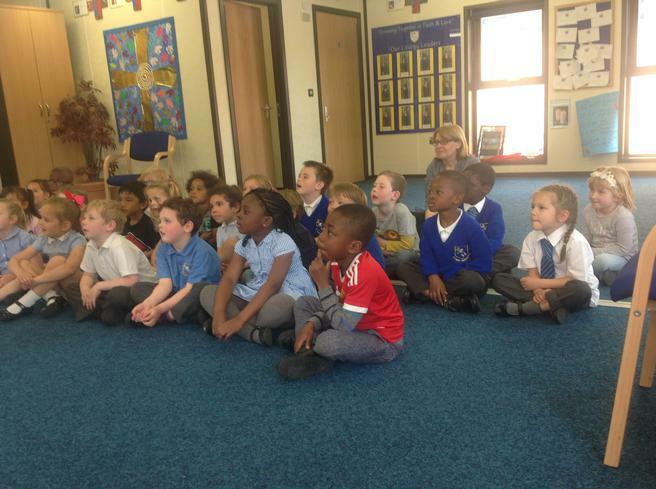 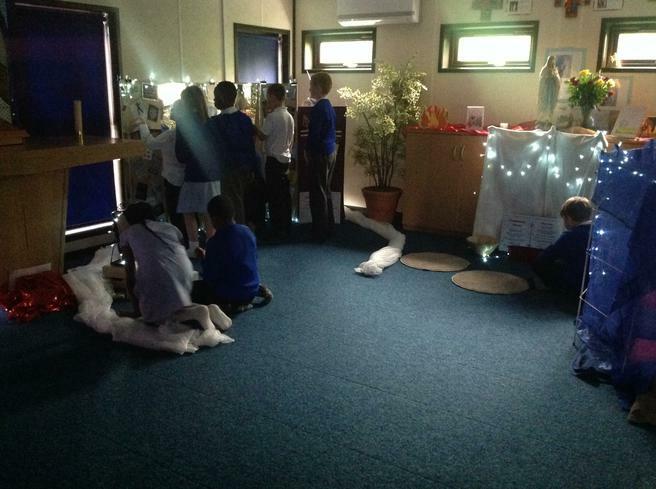 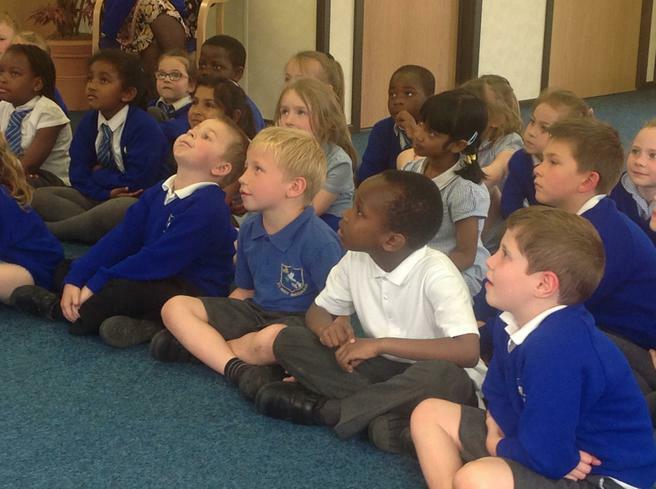 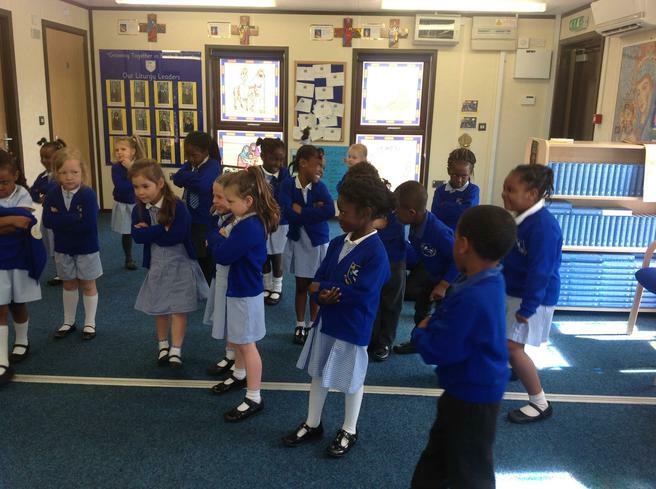 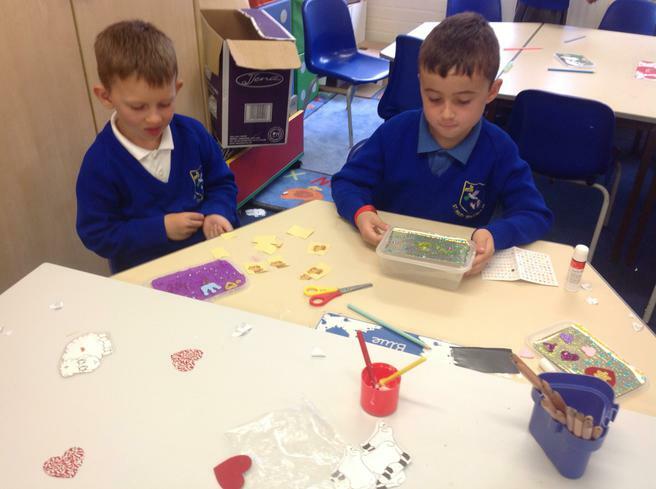 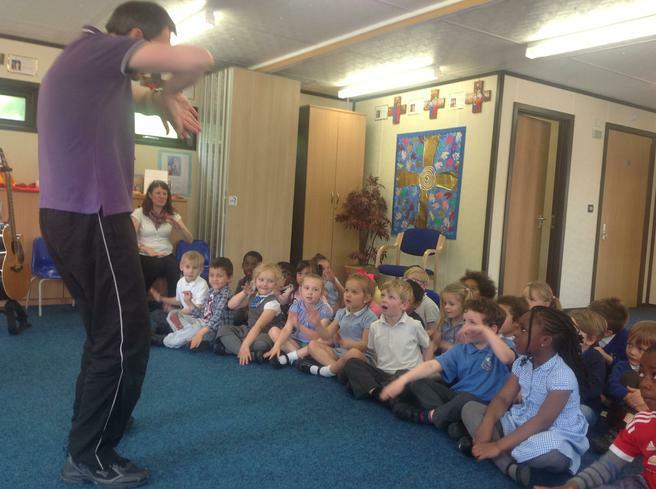 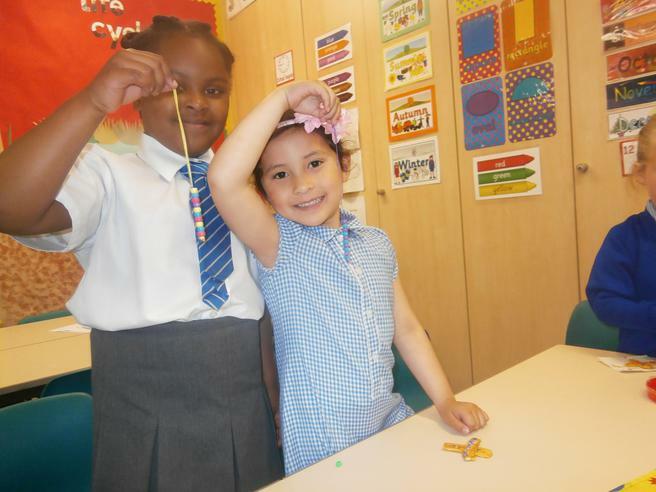 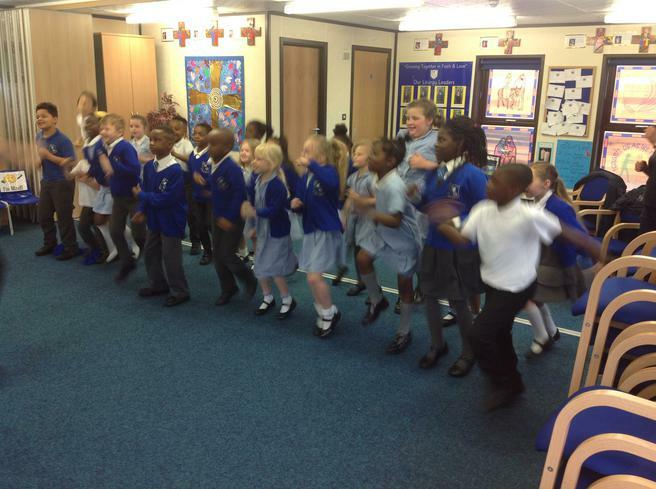 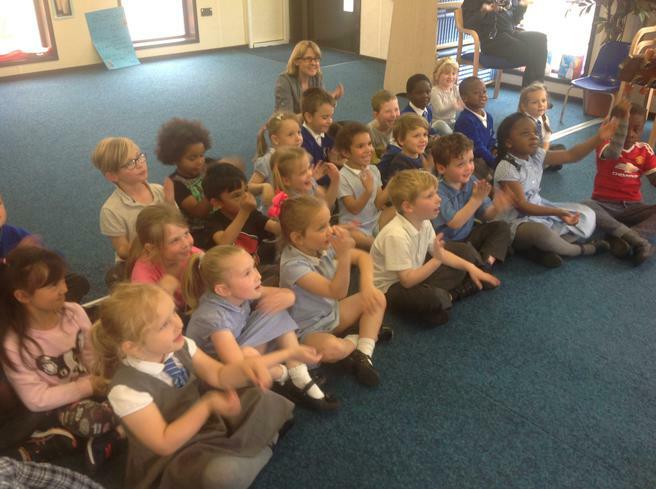 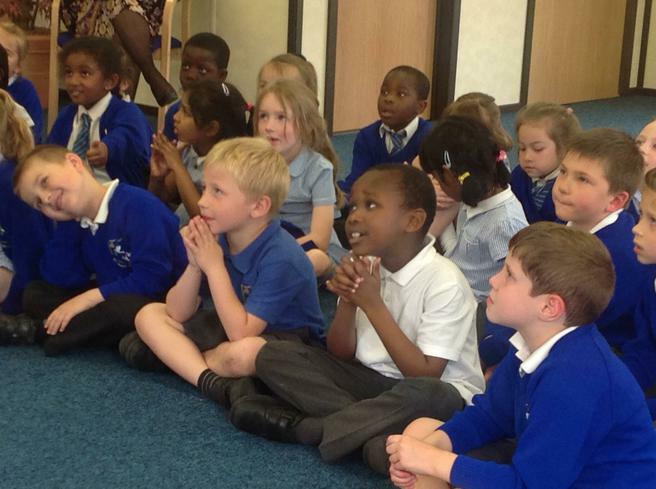 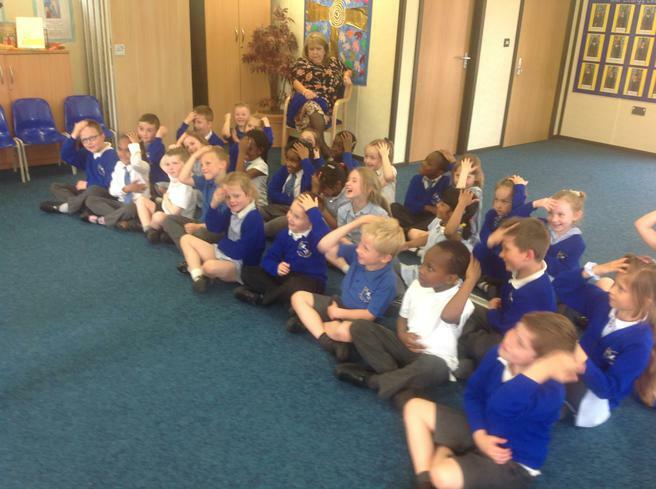 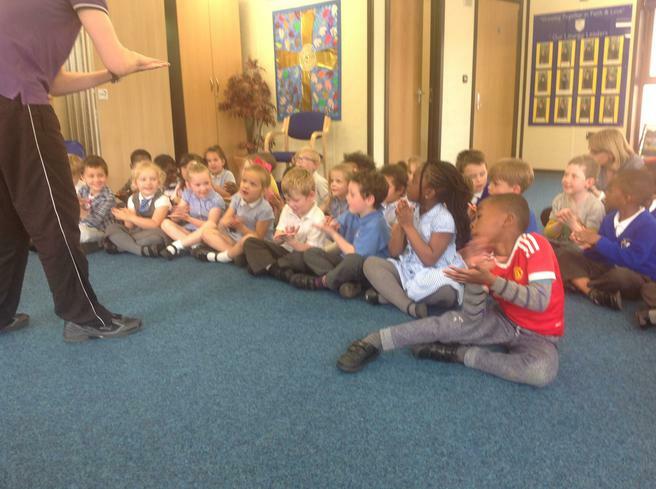 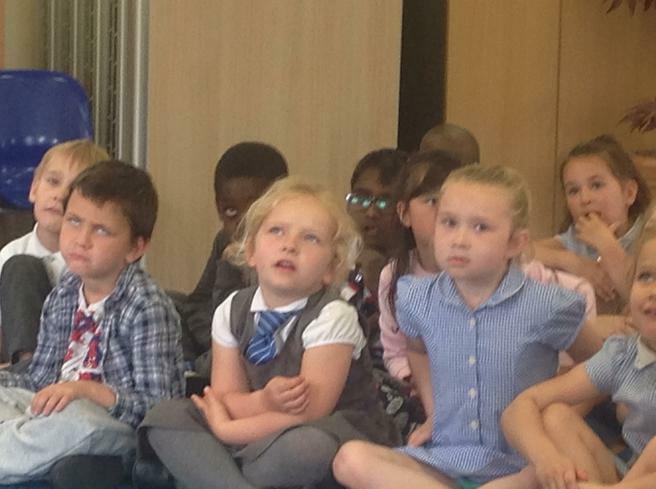 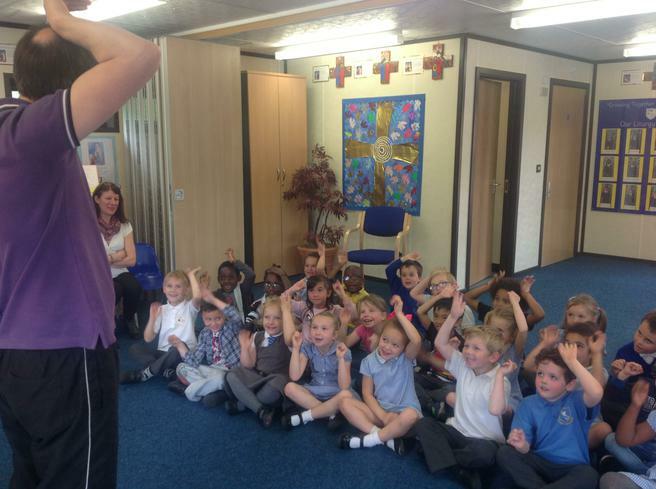 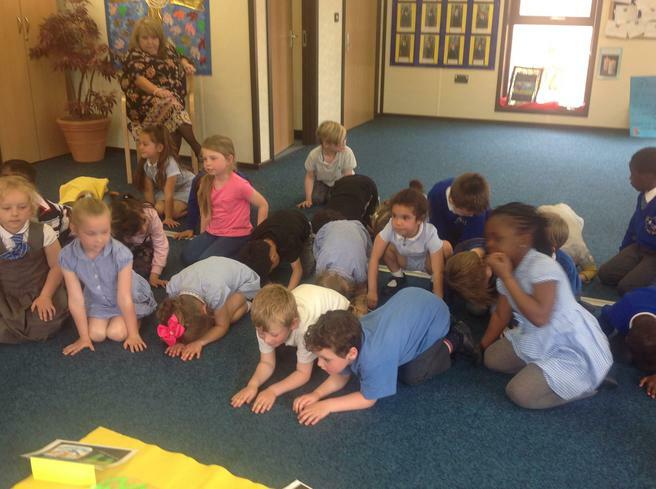 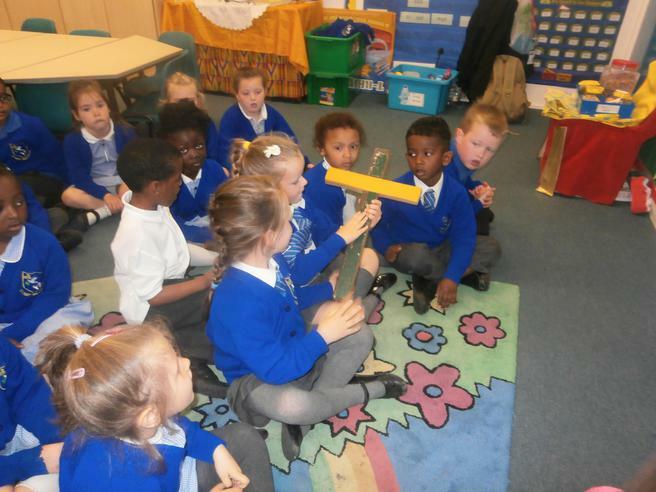 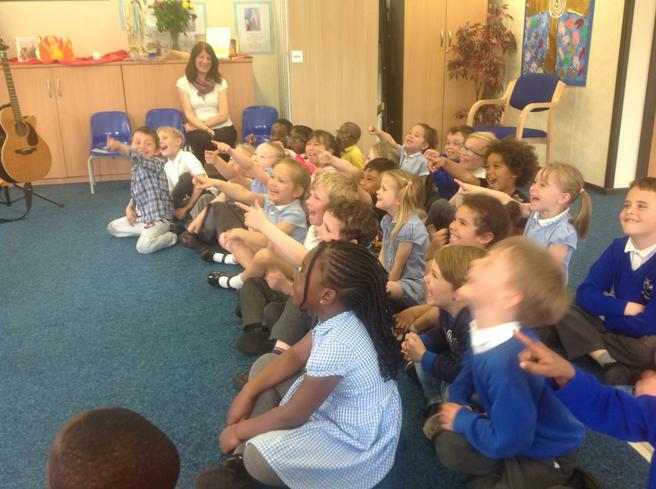 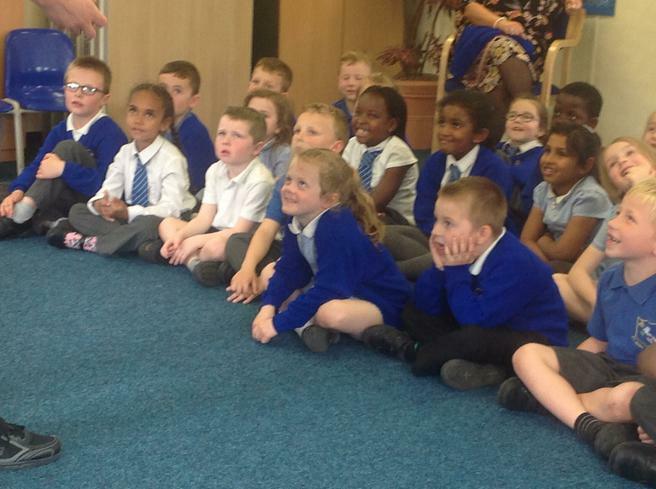 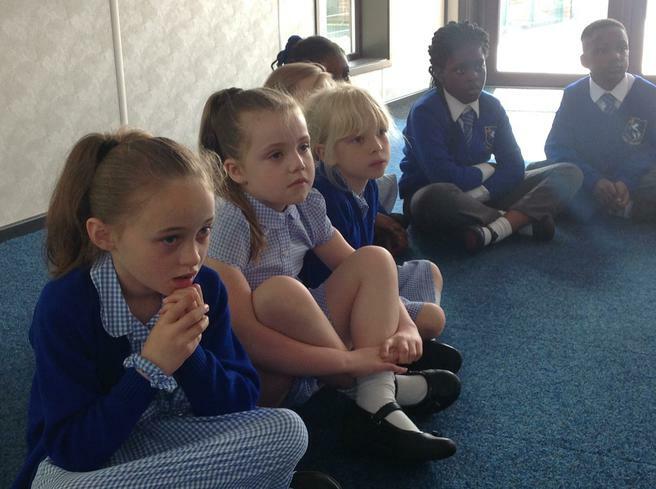 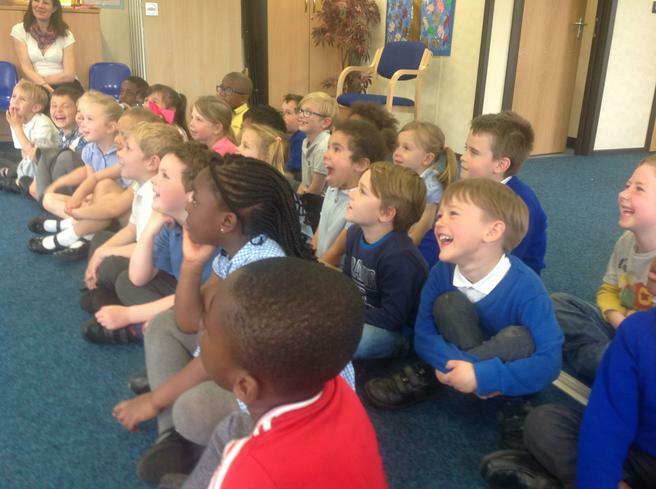 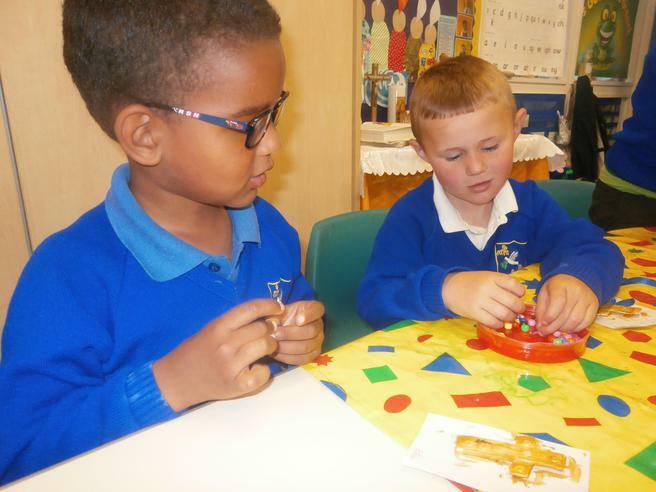 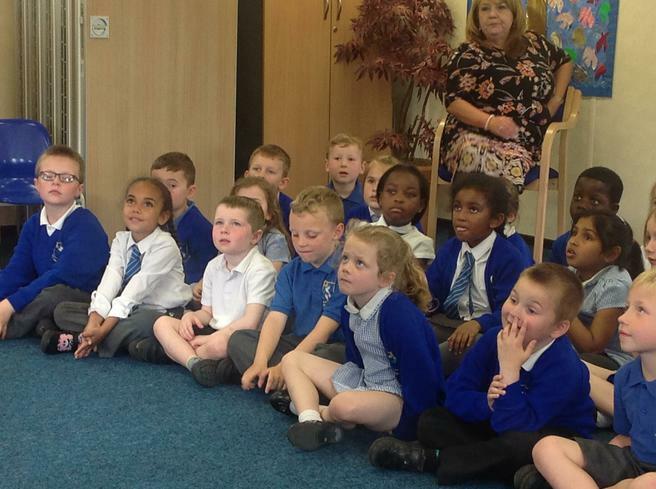 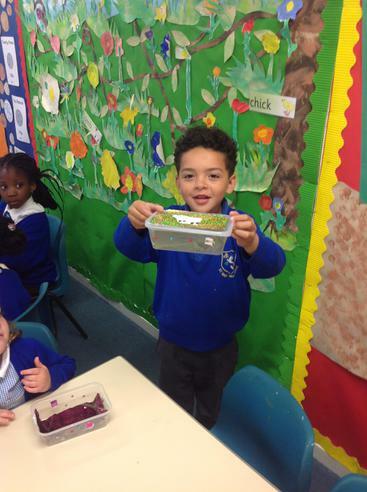 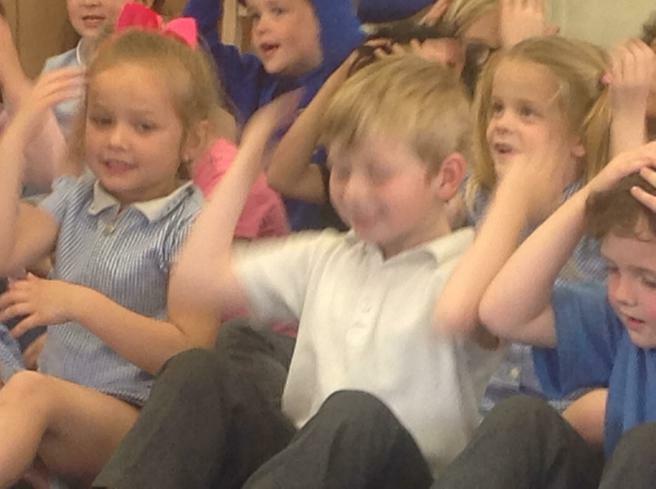 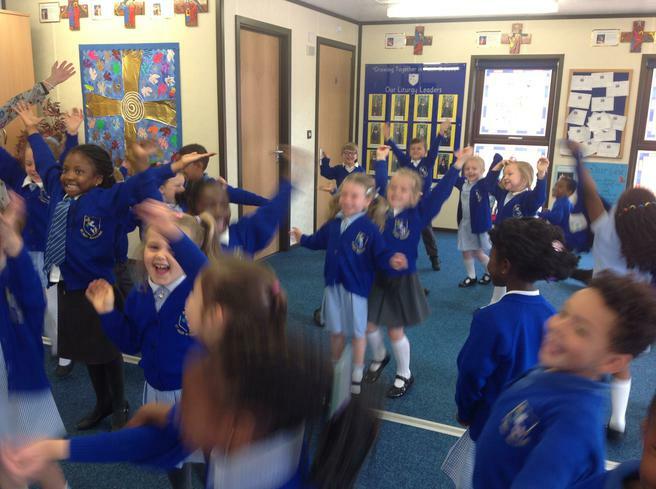 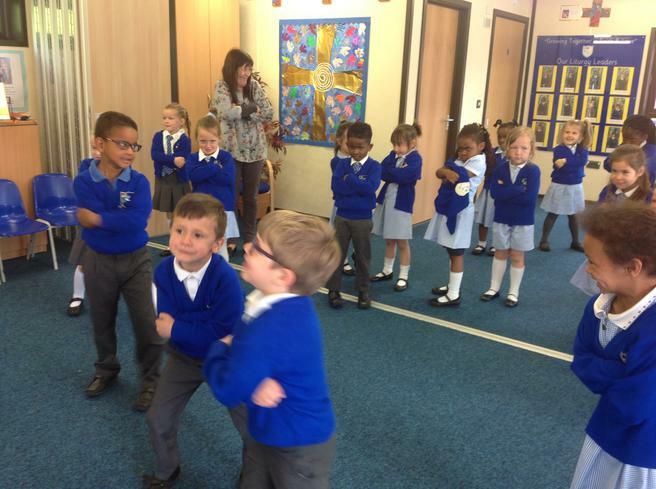 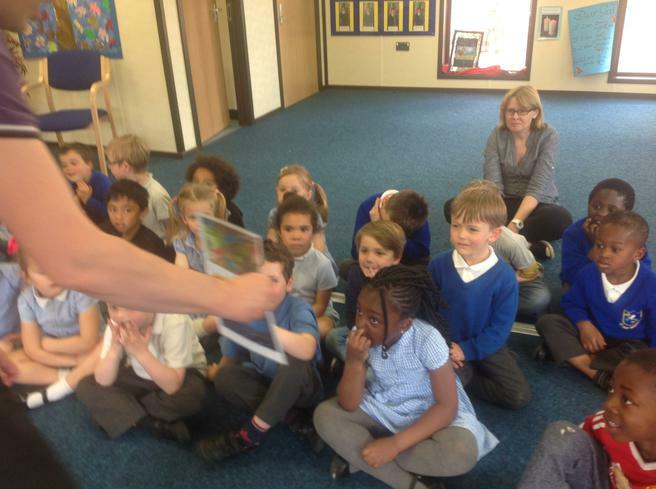 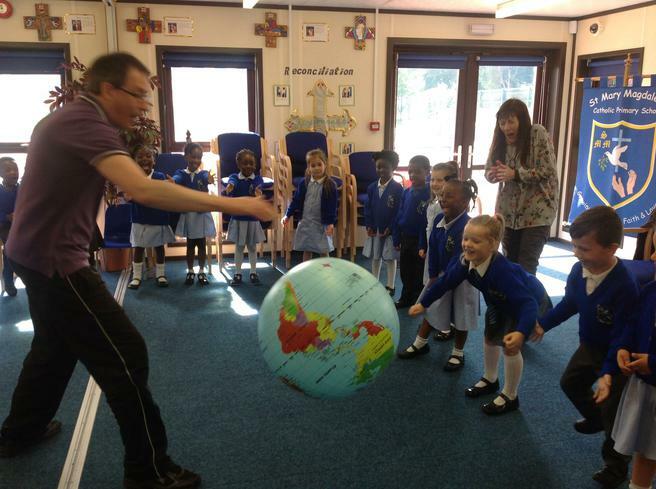 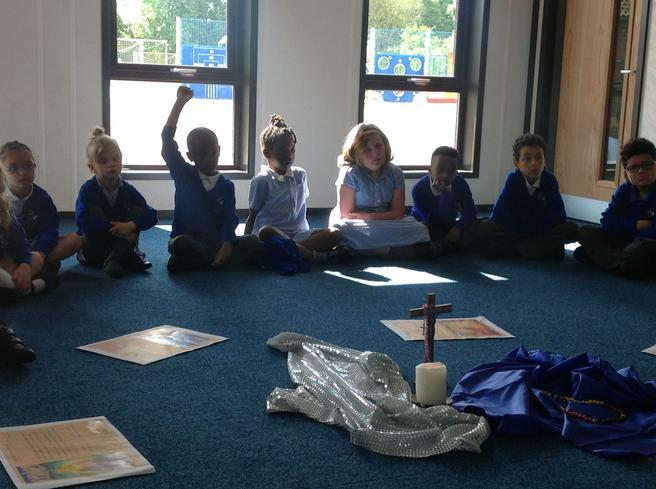 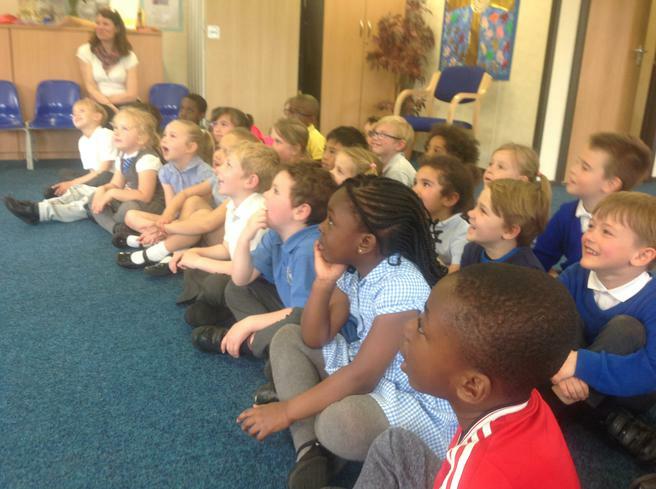 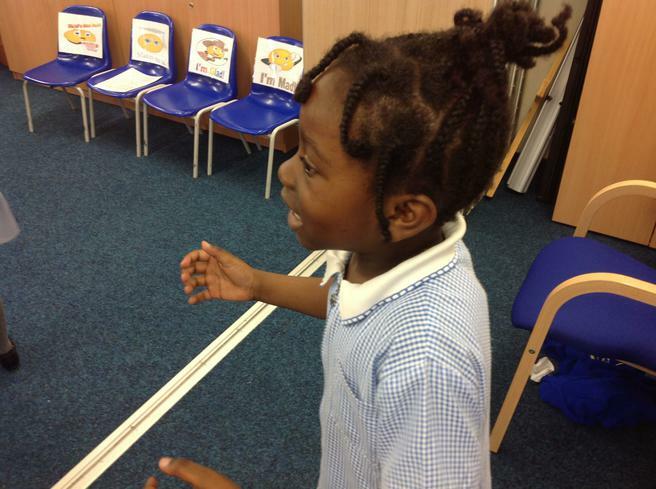 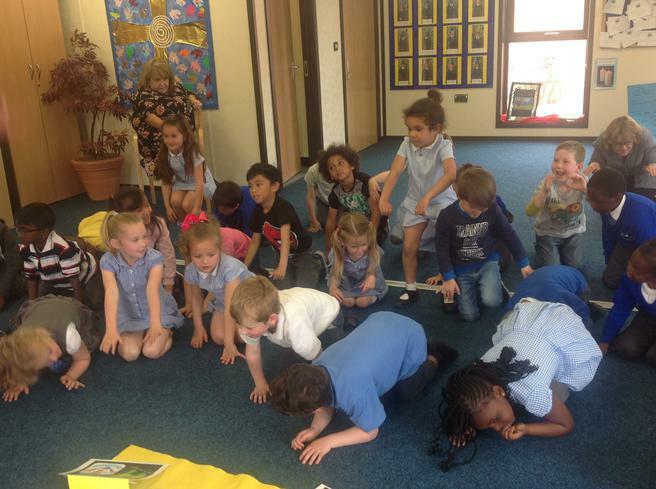 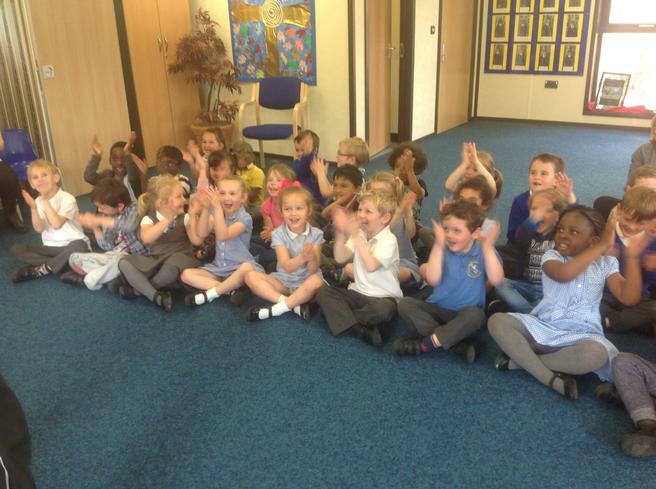 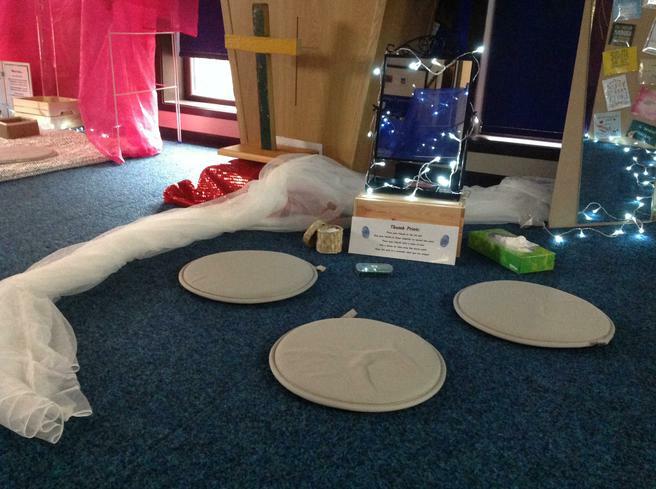 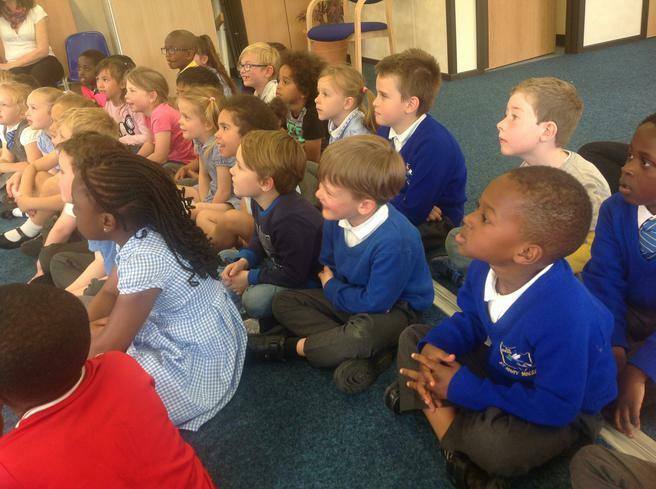 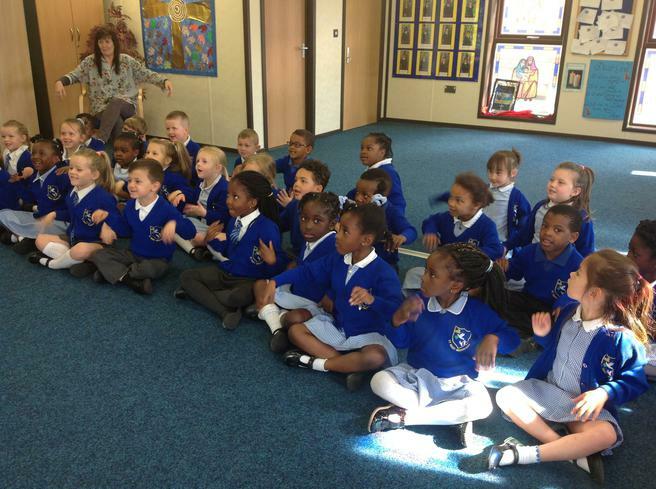 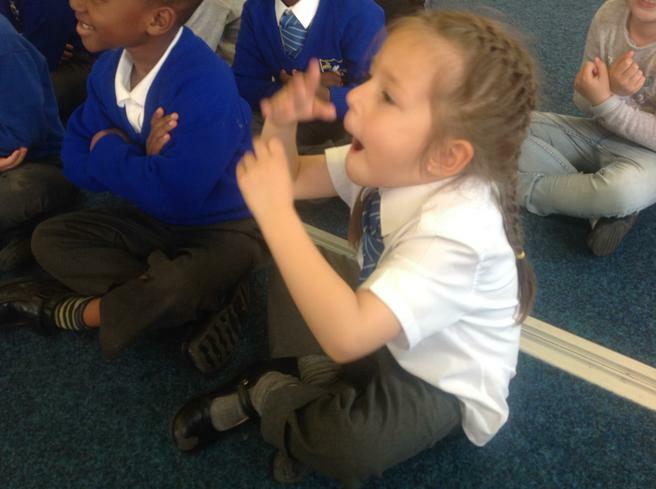 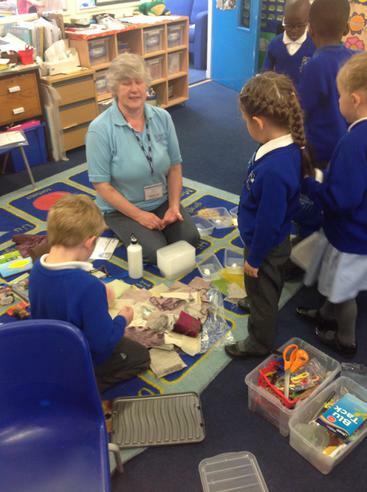 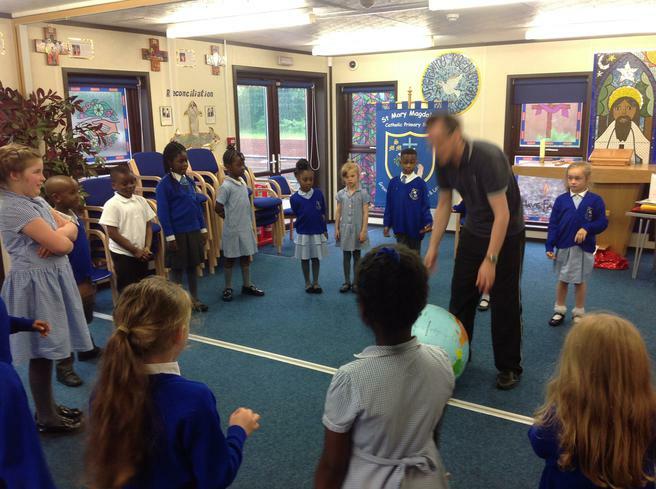 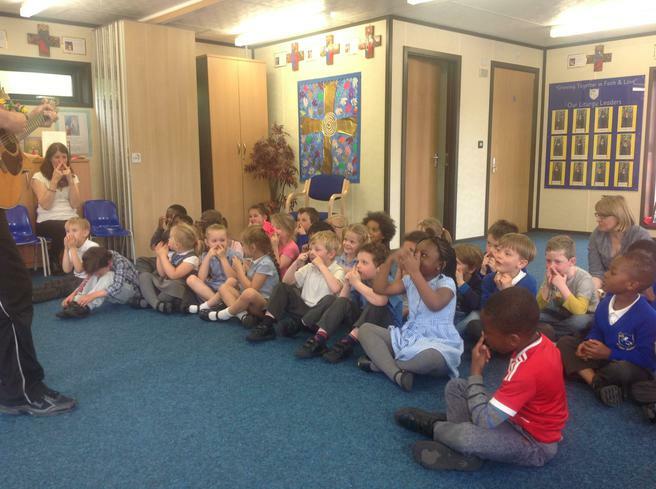 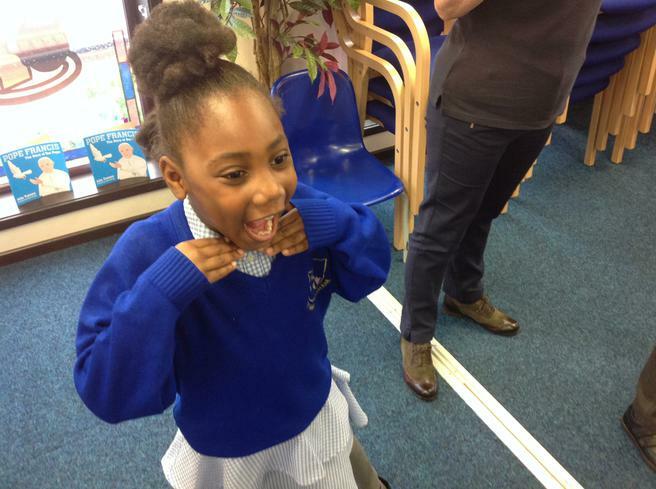 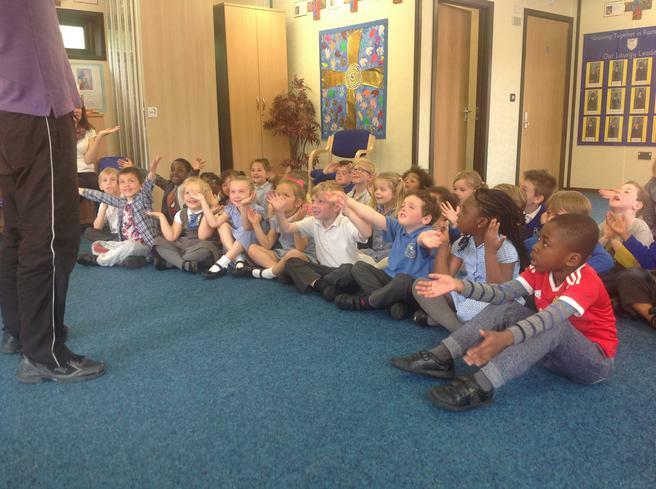 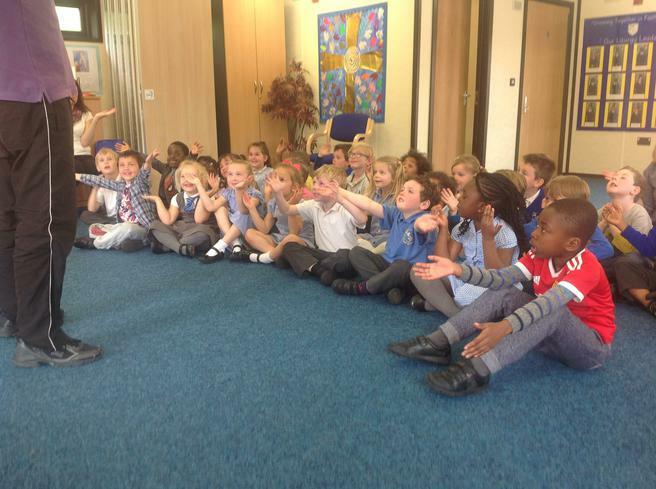 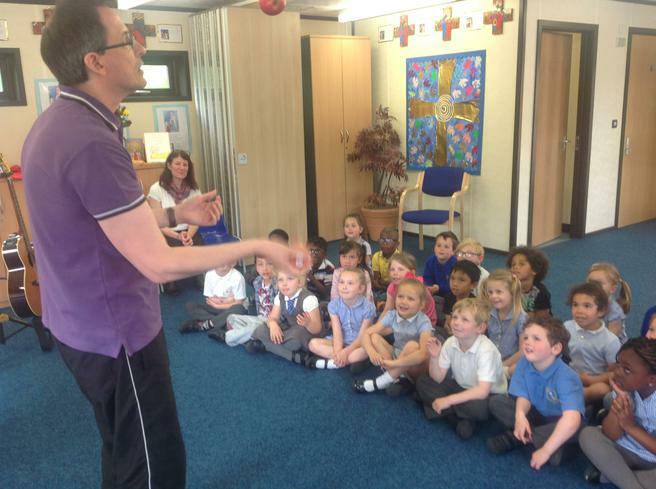 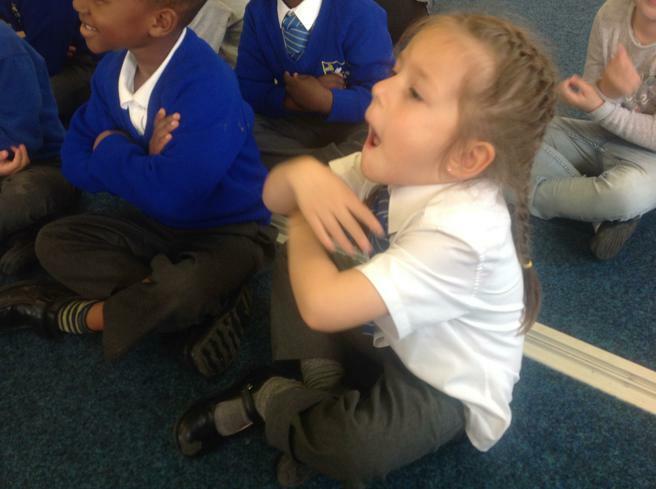 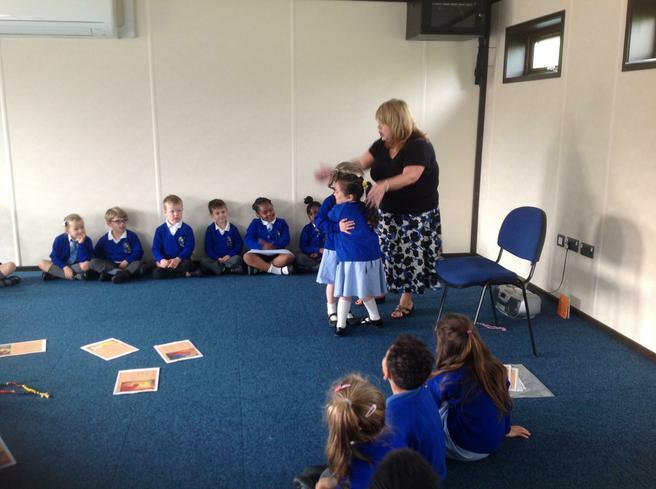 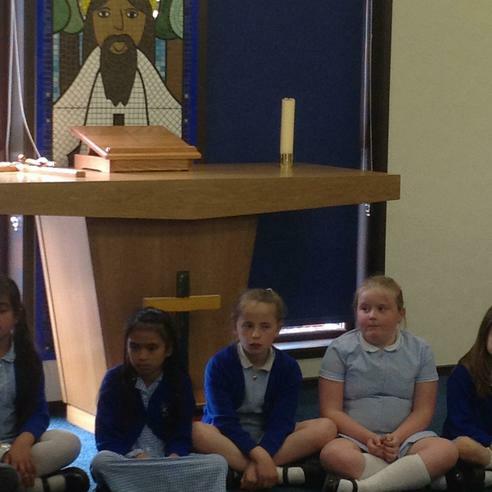 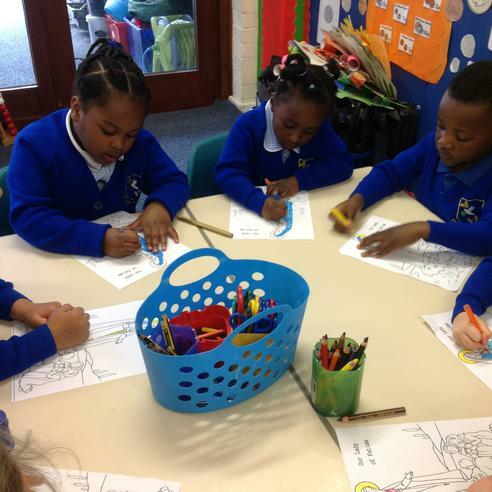 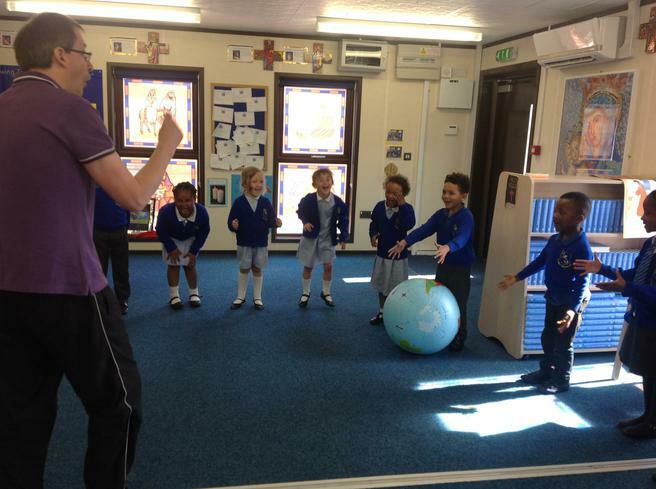 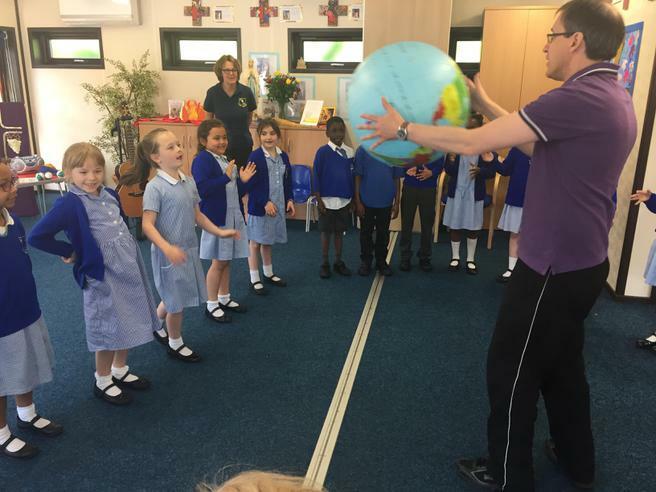 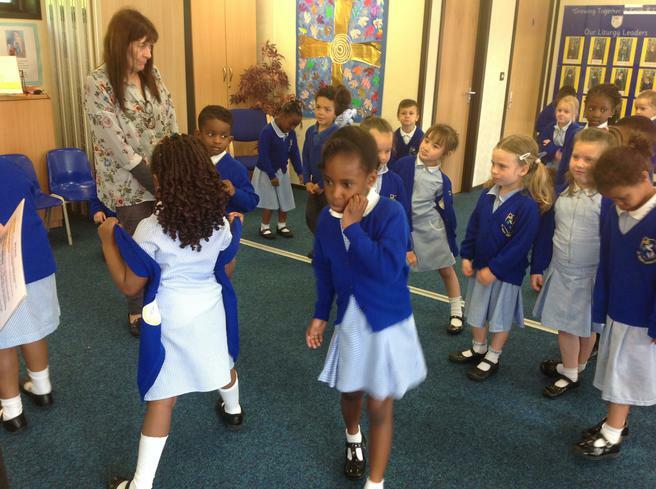 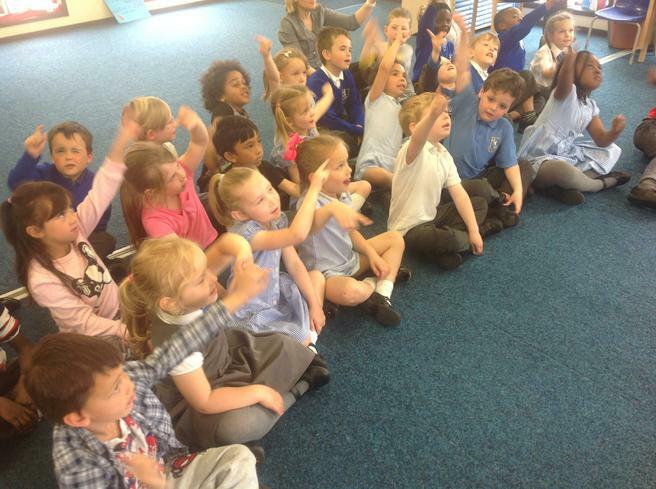 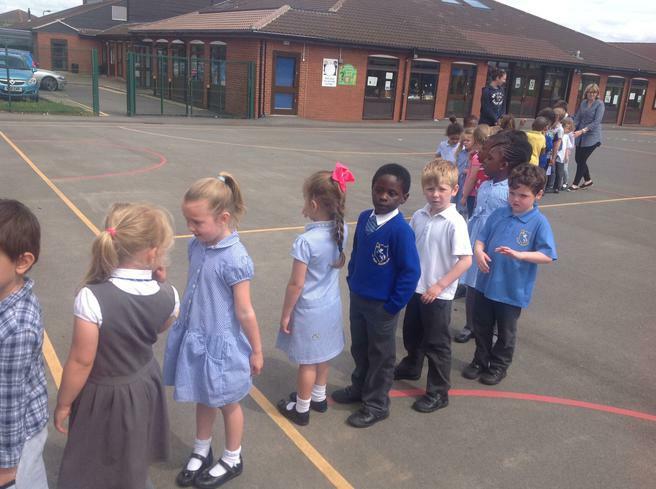 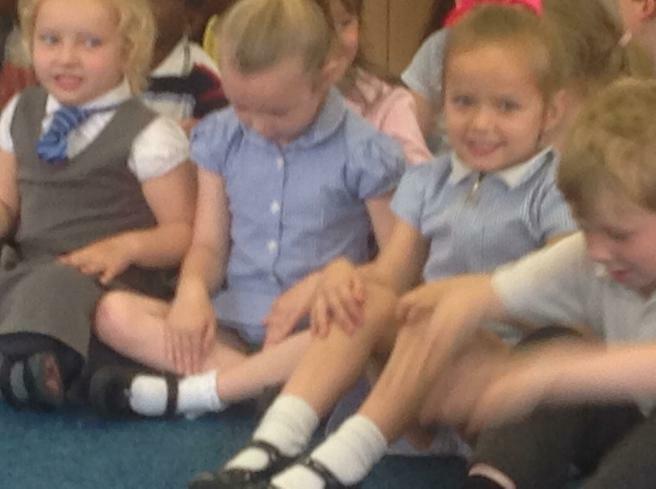 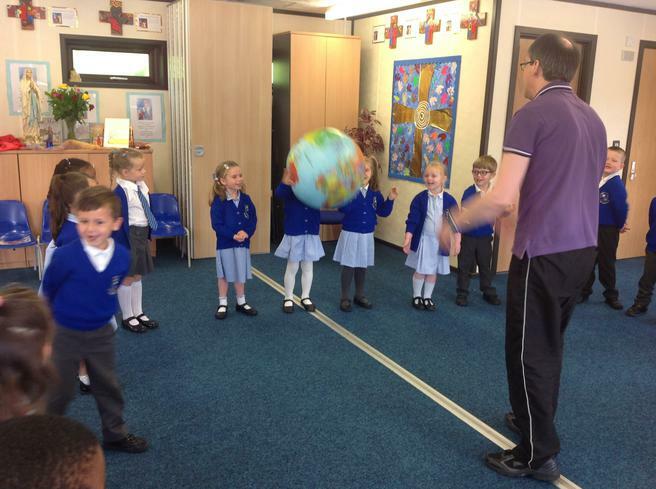 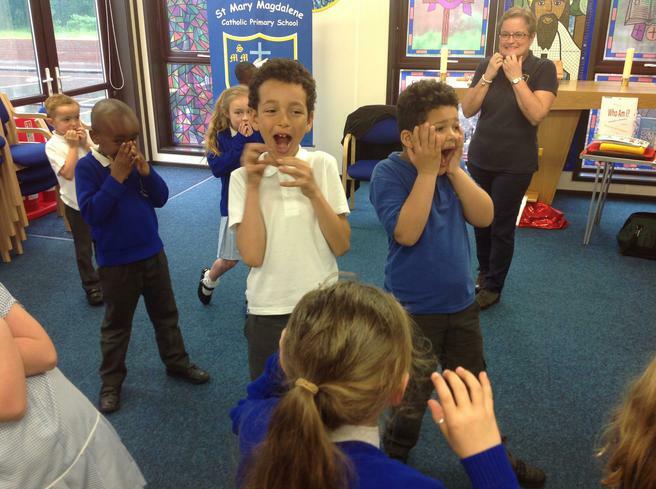 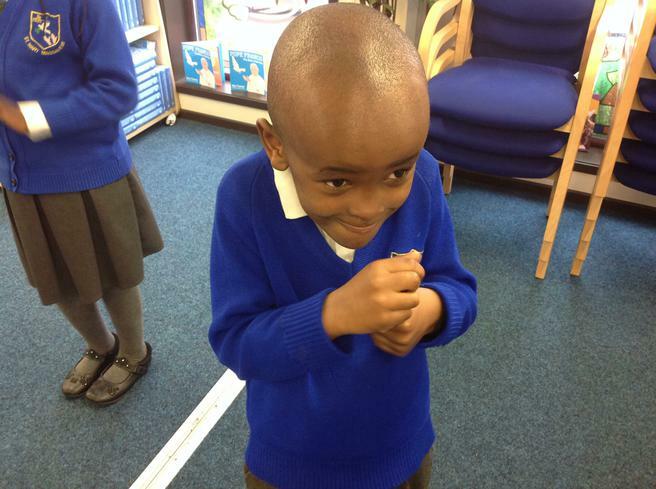 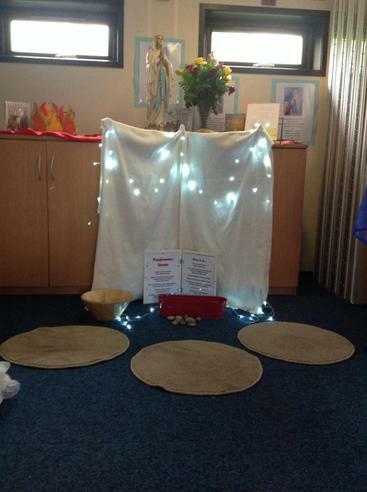 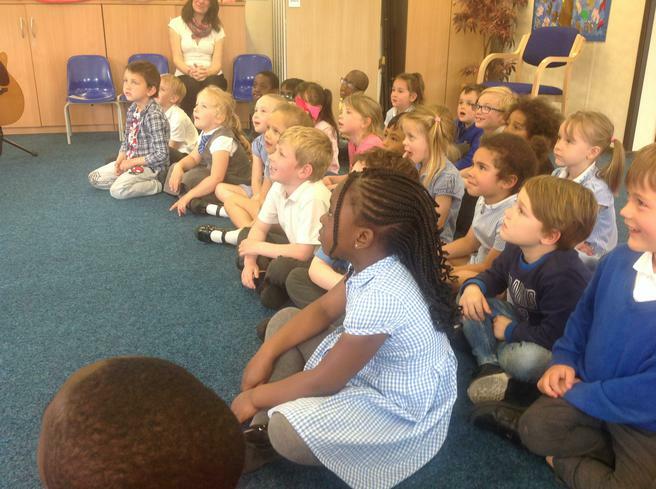 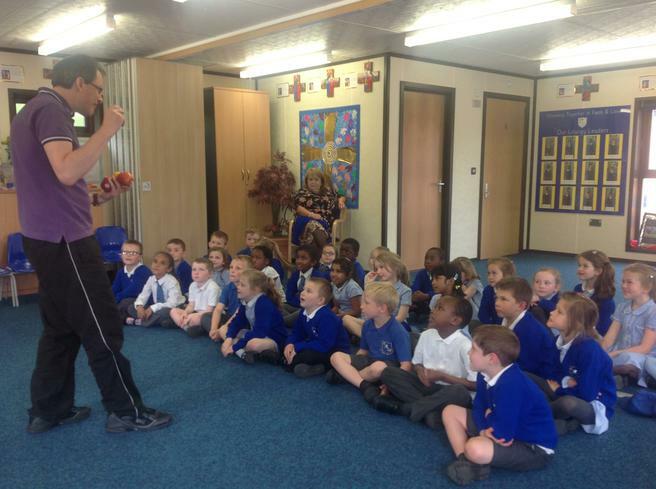 Mrs Jones with Reception/Year 1 exploring the "Rosary" and acting out the "Hail Mary." 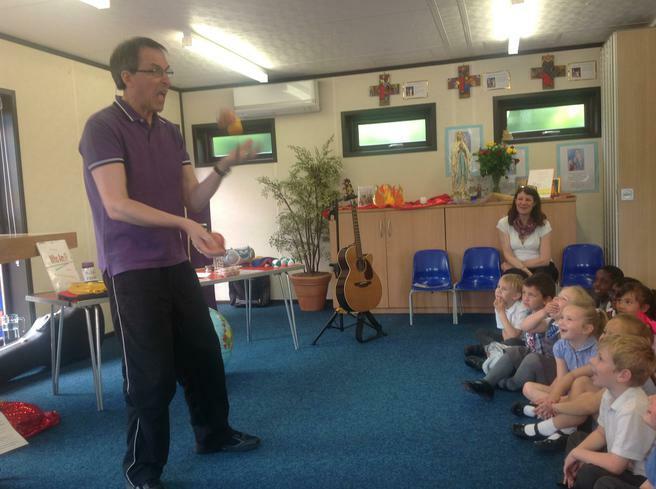 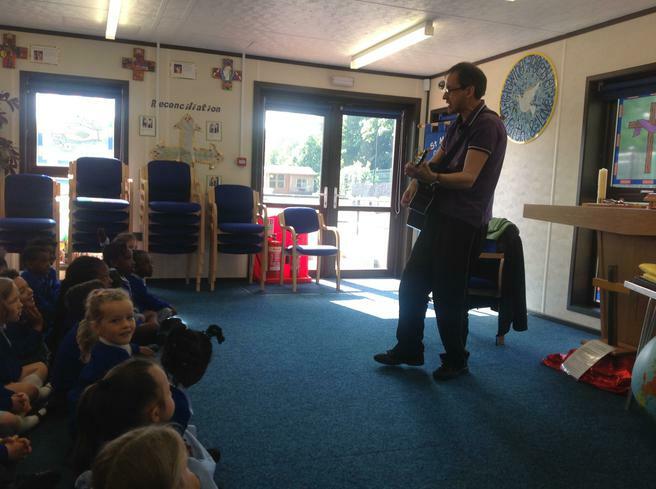 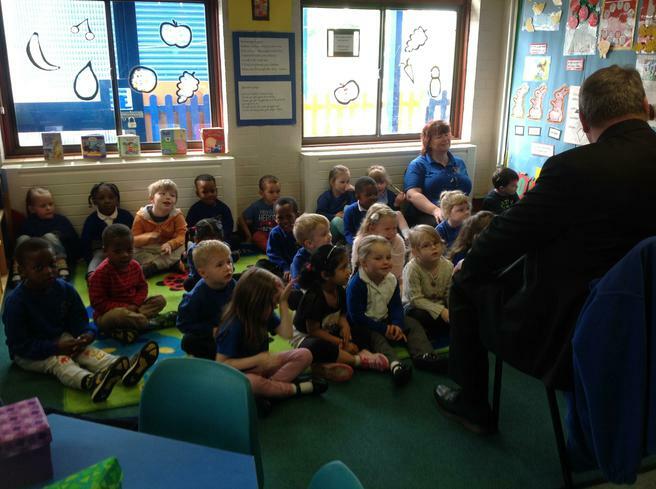 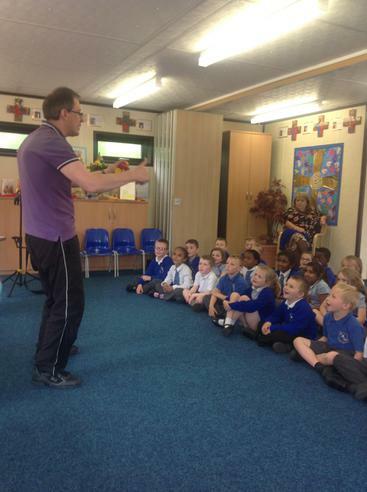 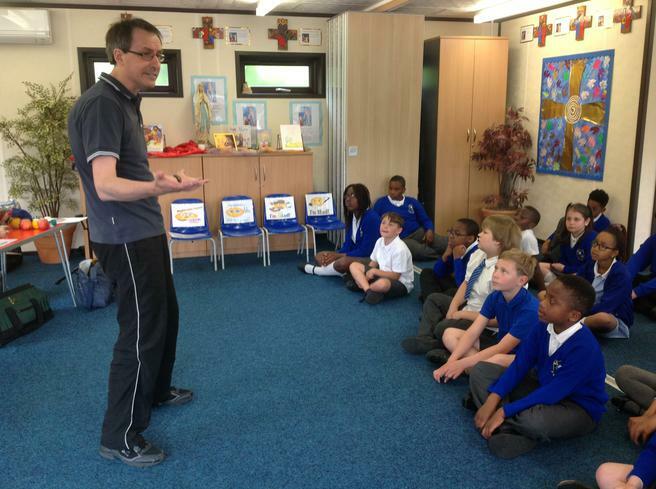 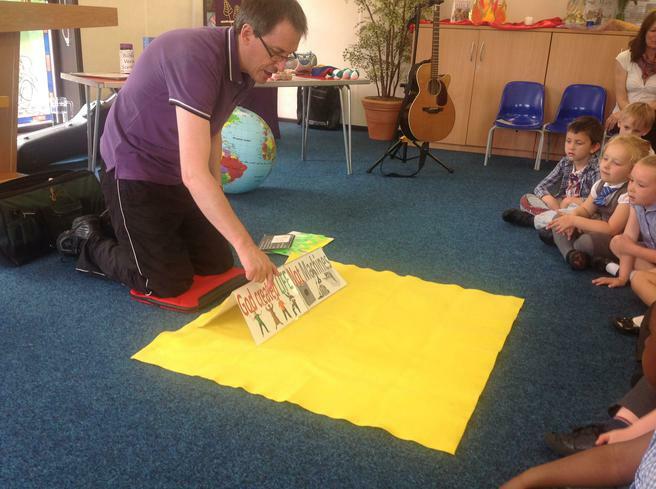 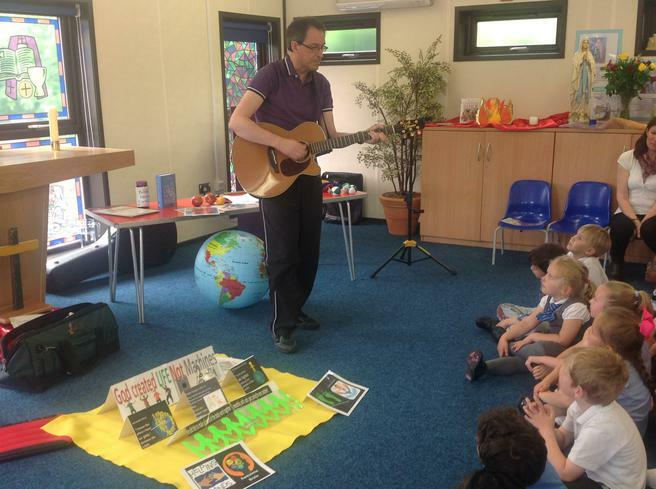 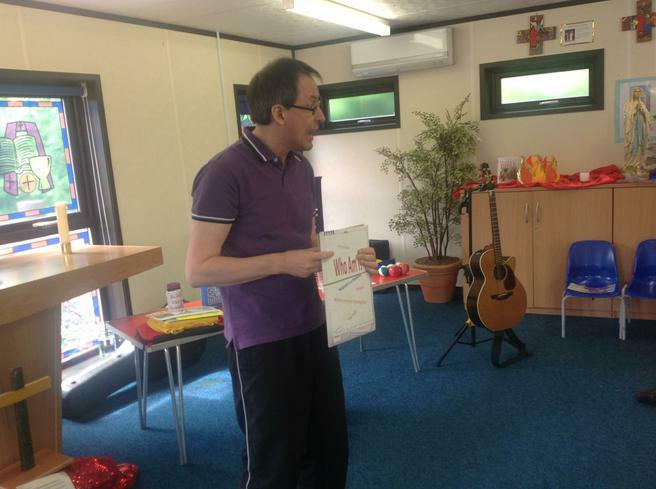 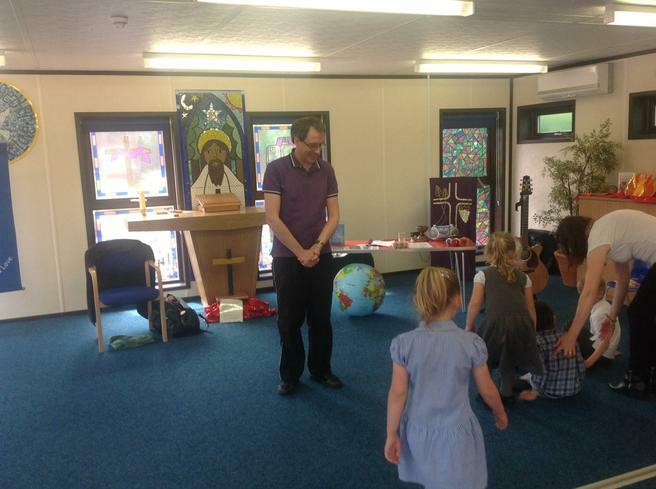 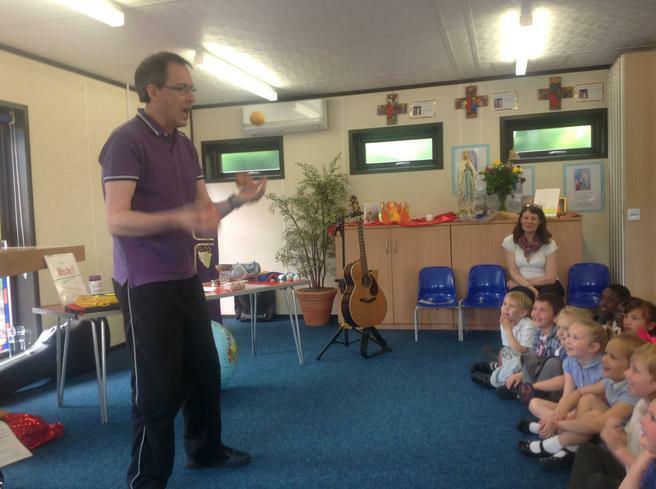 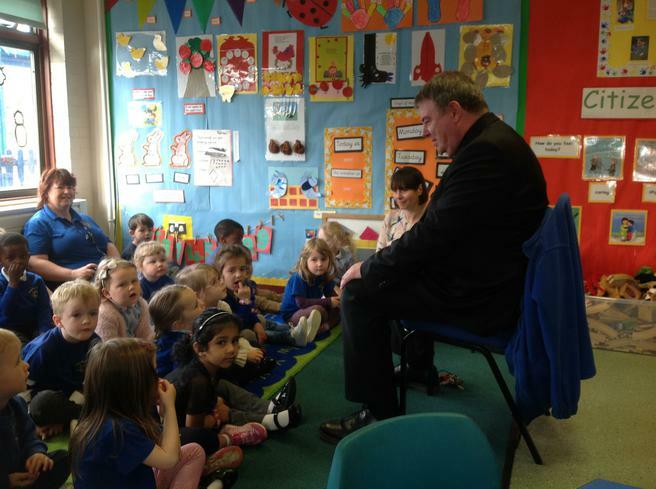 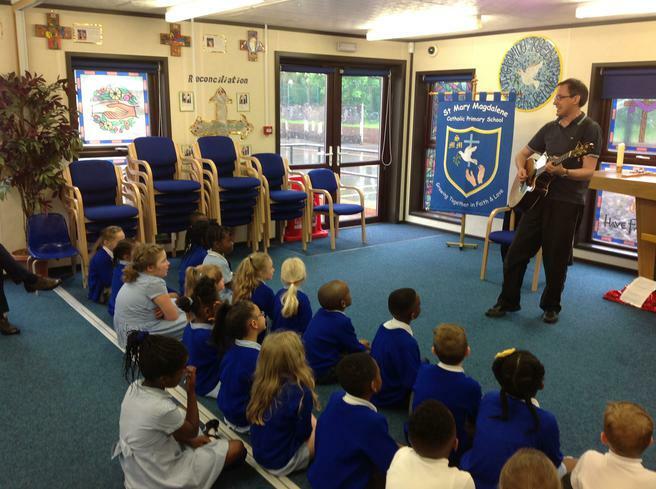 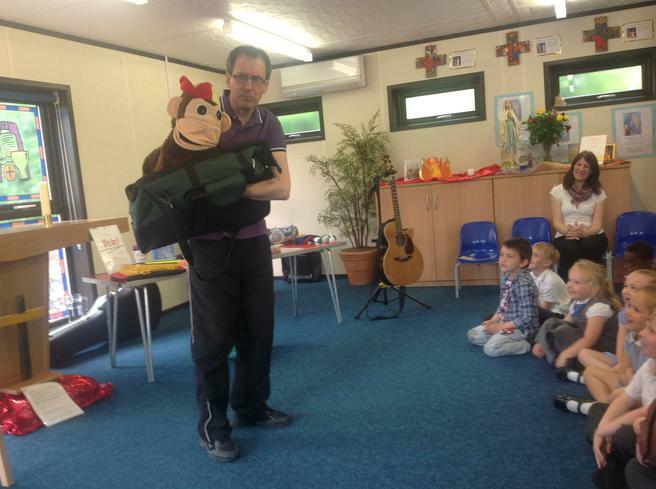 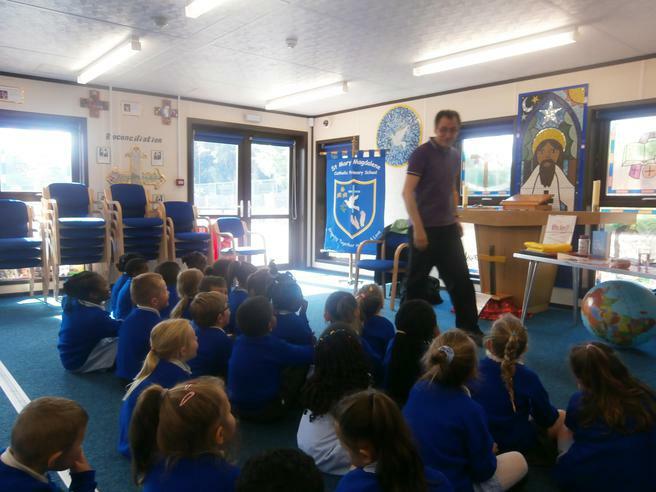 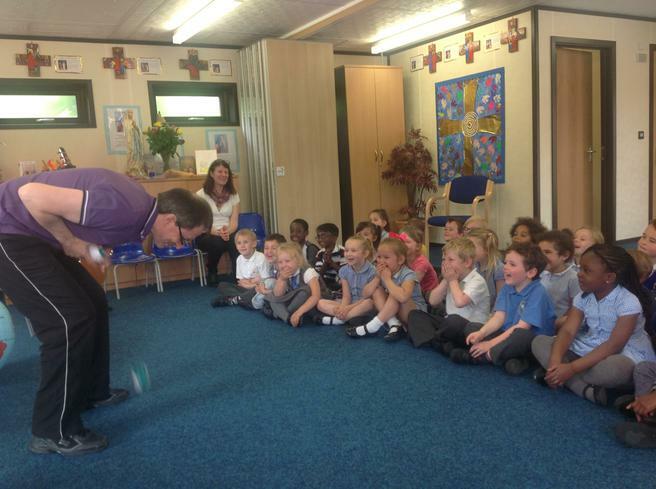 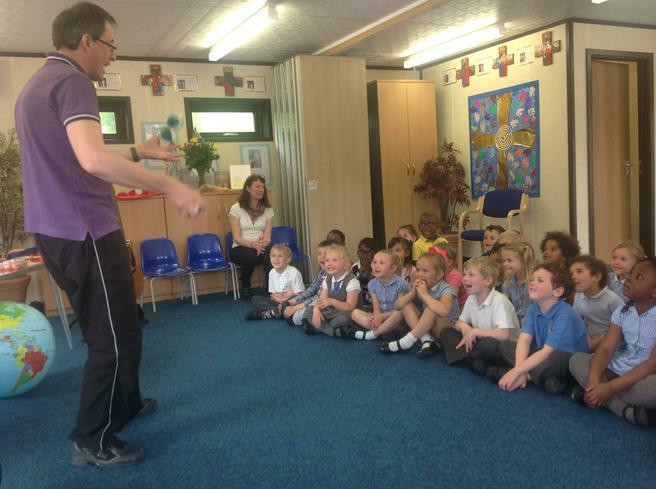 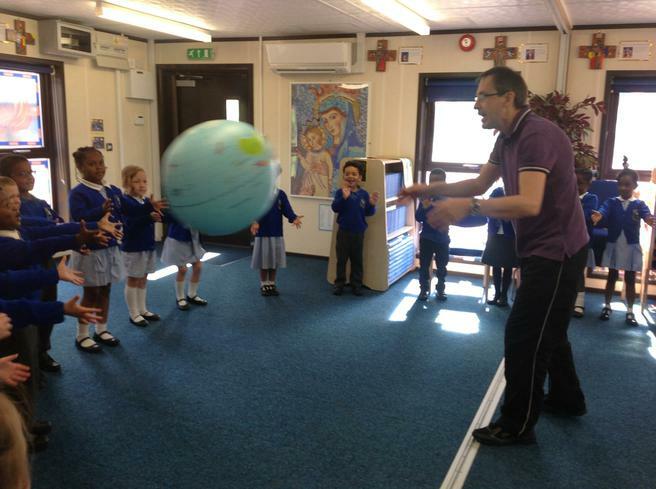 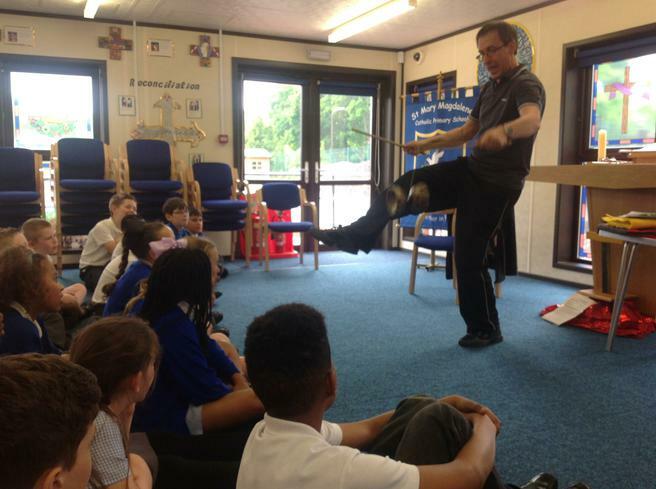 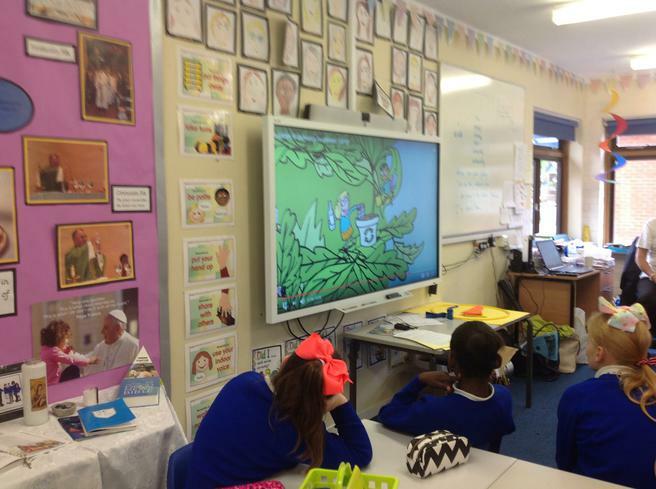 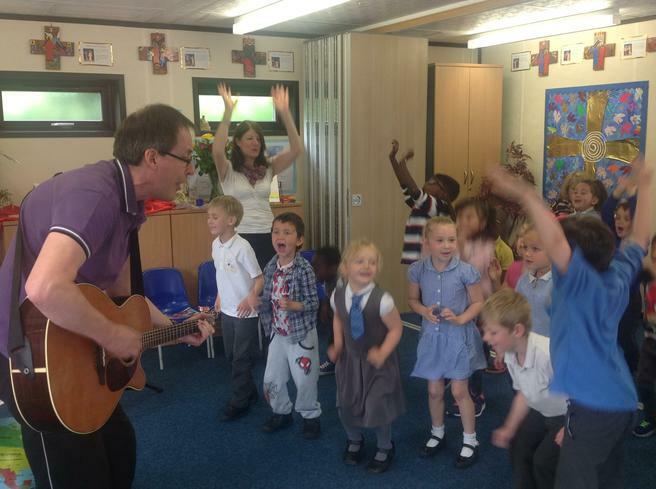 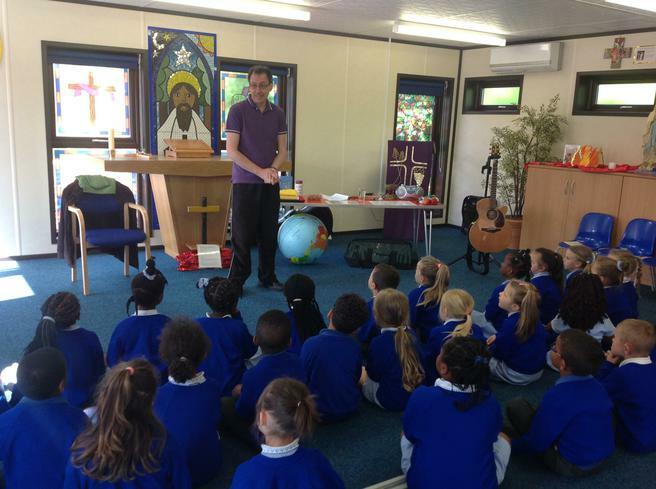 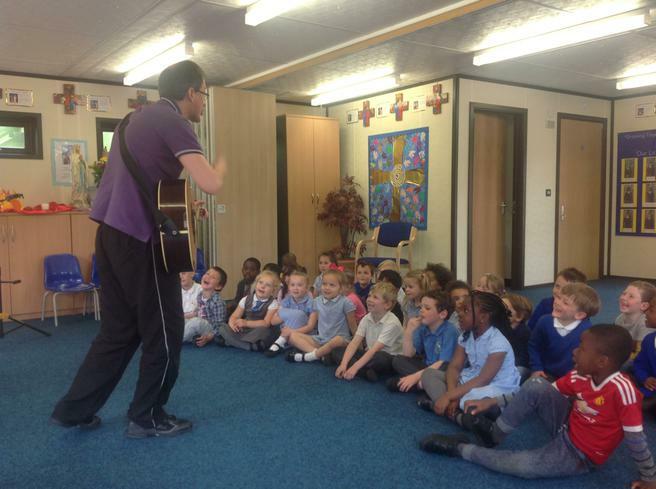 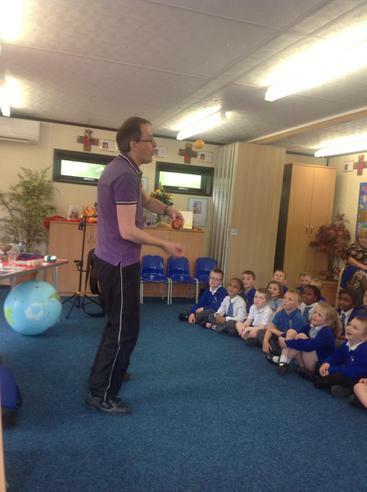 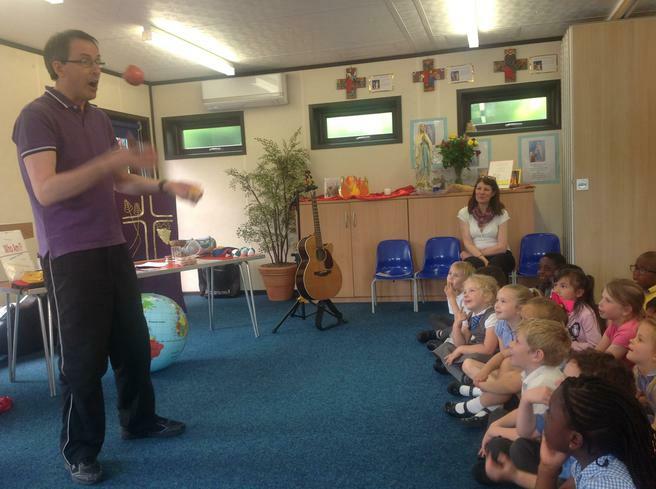 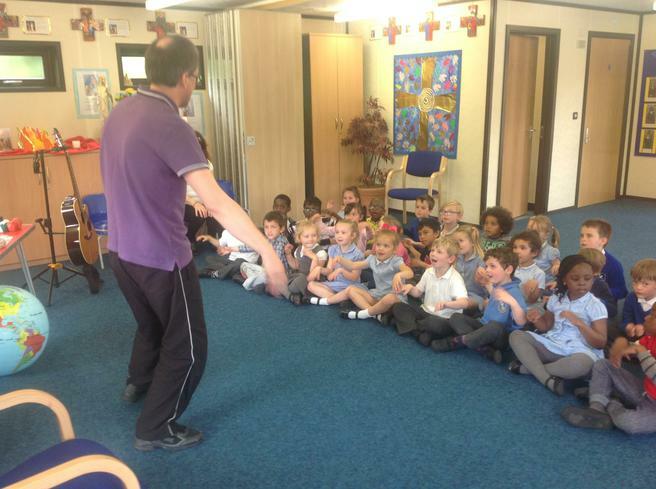 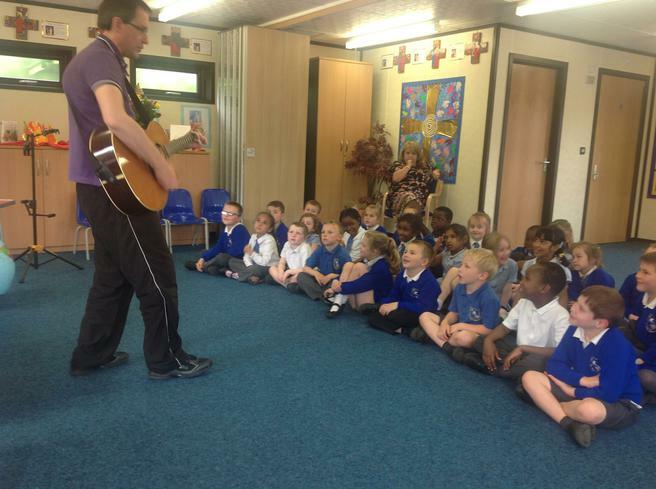 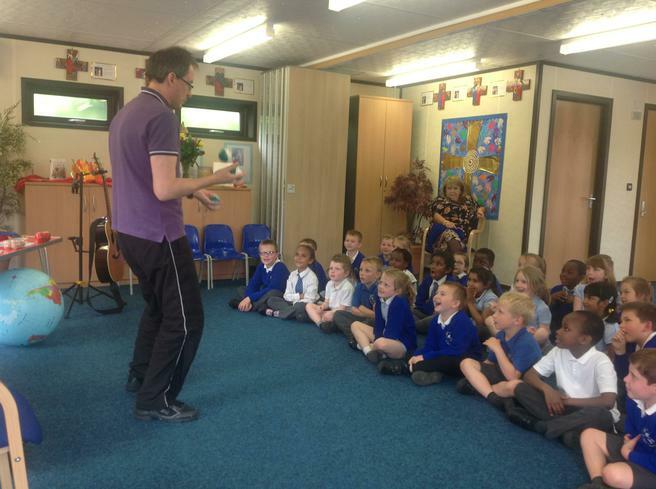 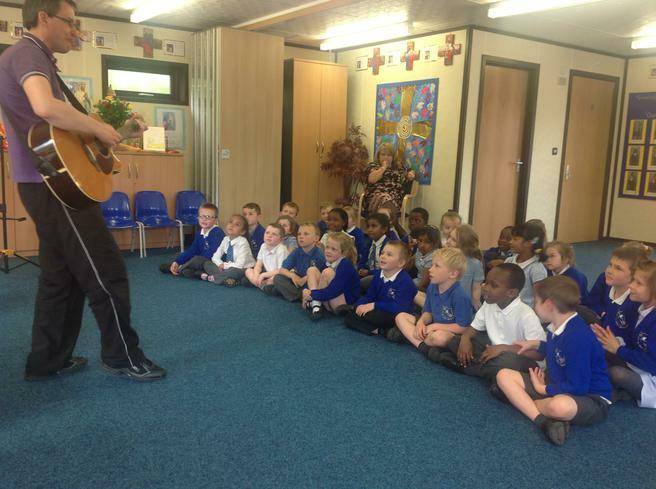 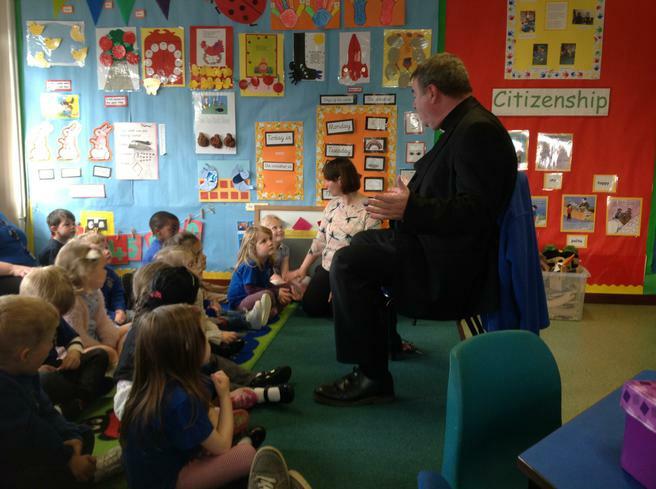 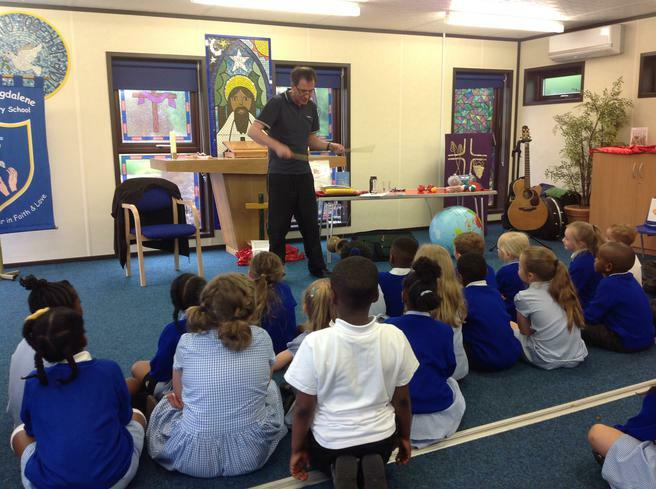 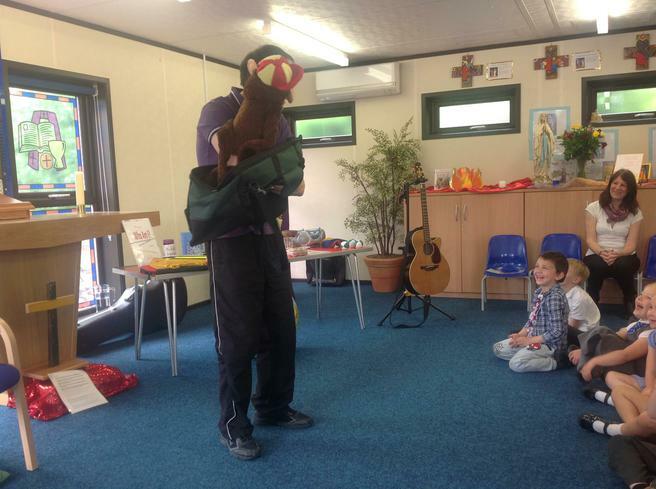 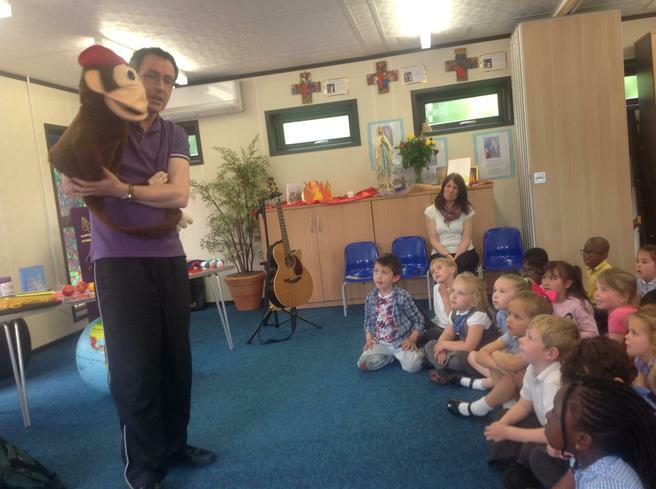 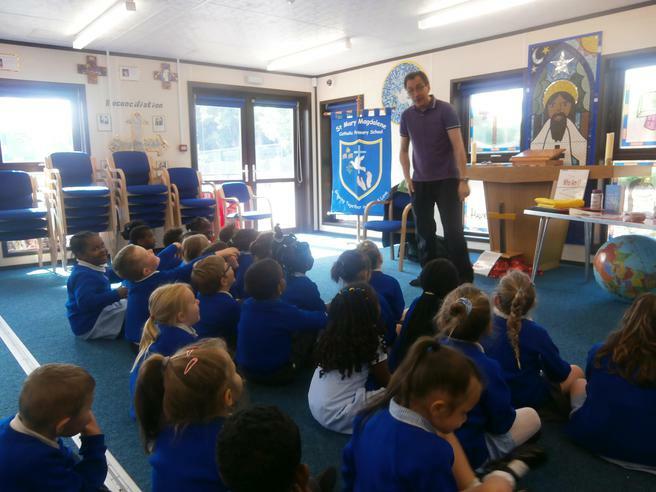 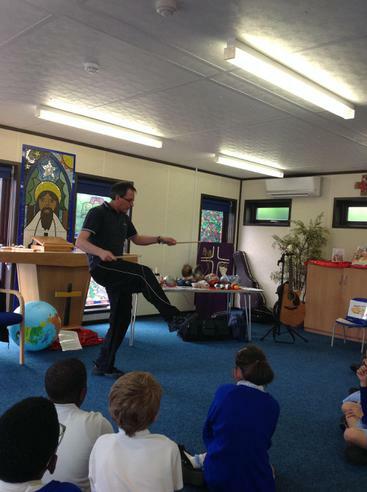 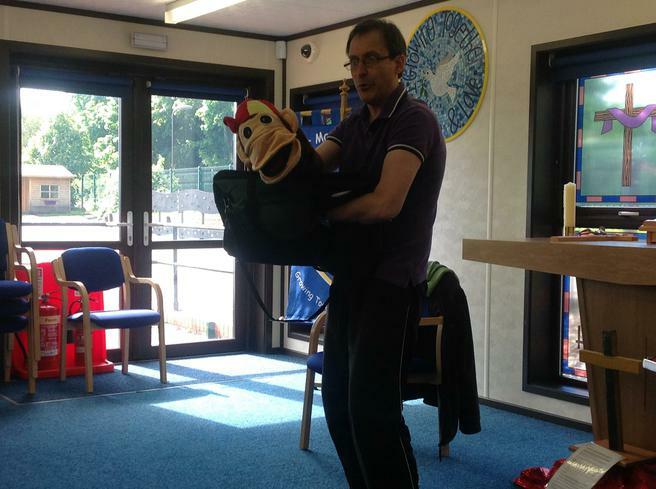 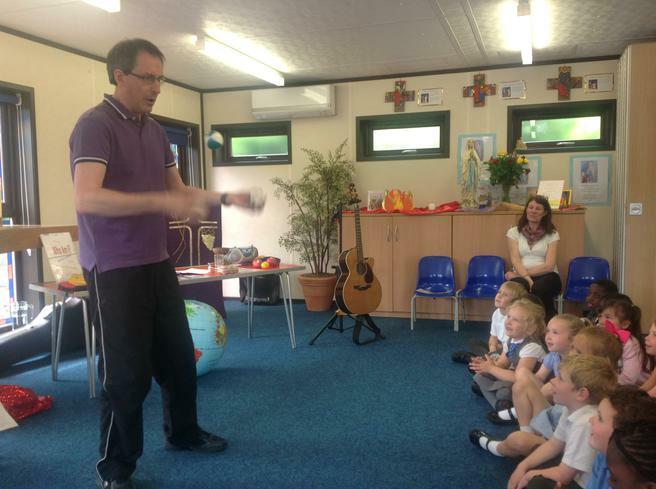 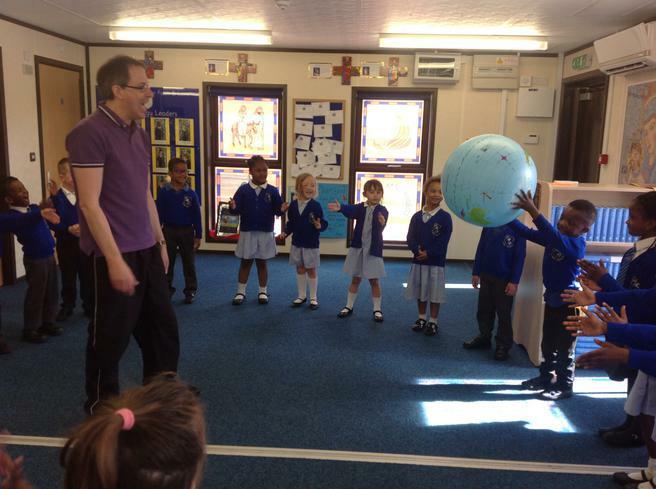 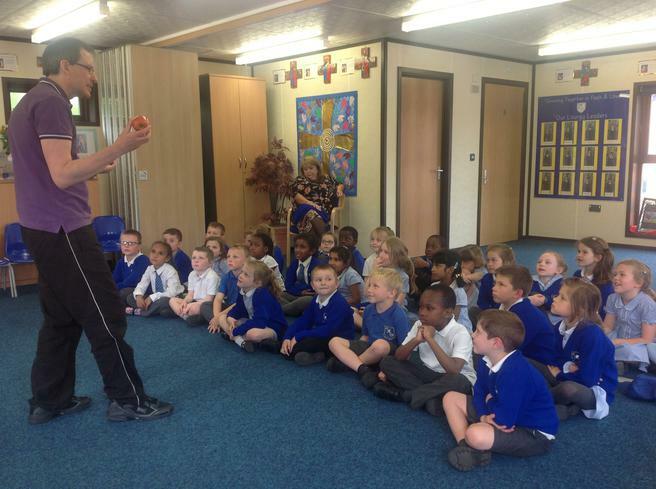 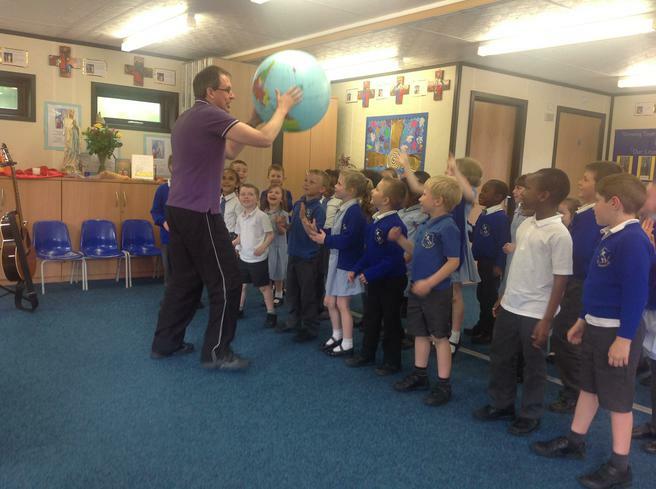 Fr Bernard in the Nursery - telling the story of "David and Goliath." 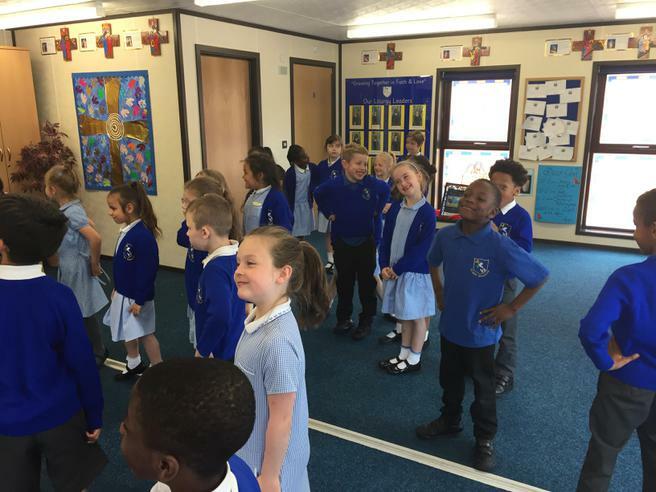 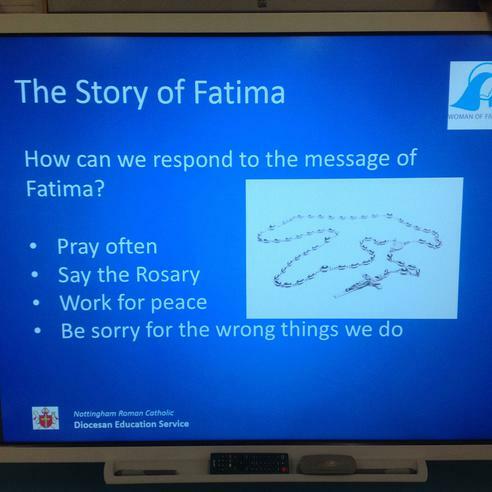 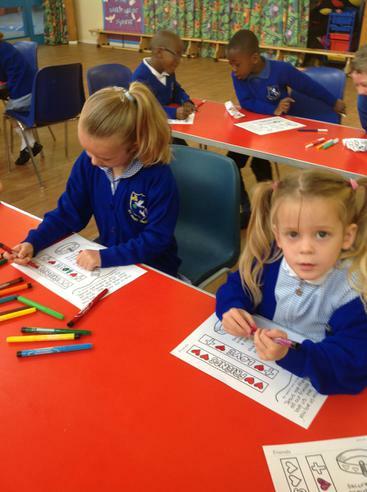 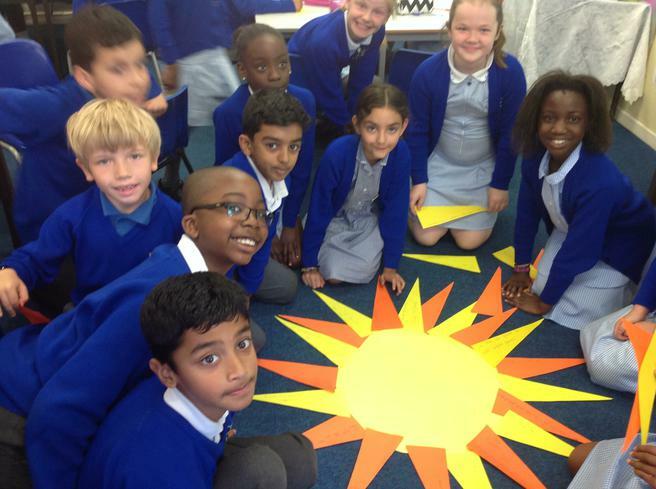 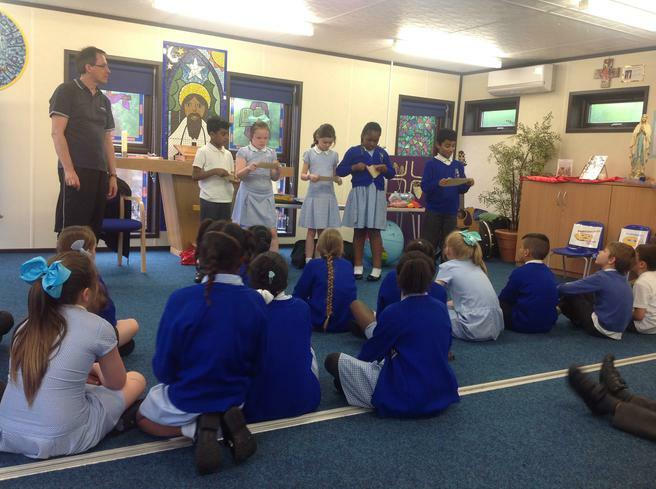 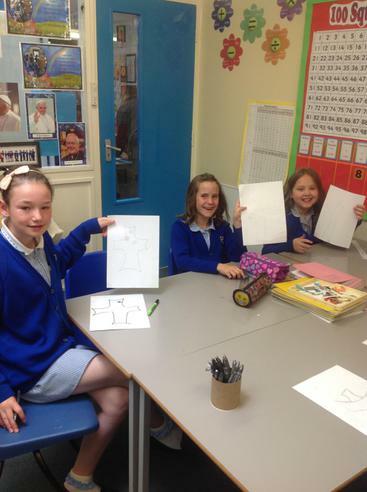 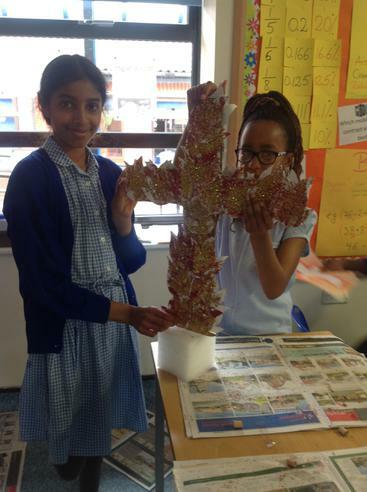 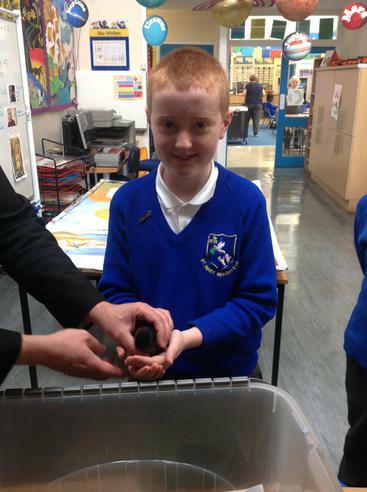 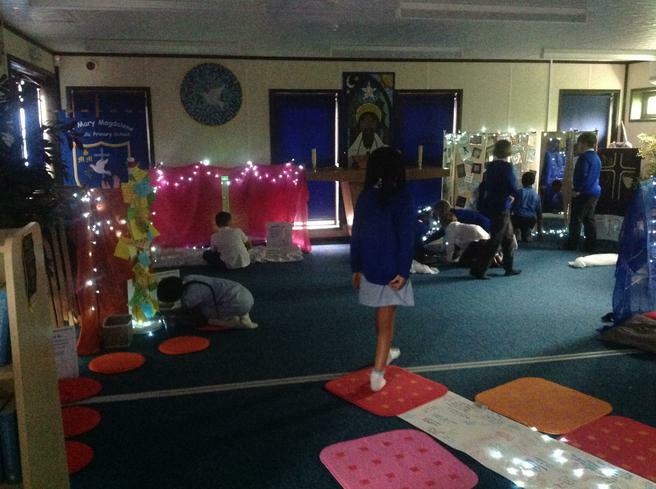 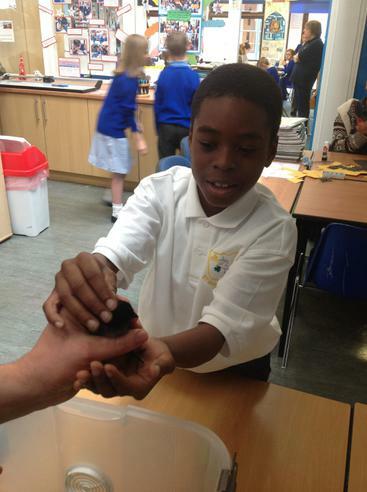 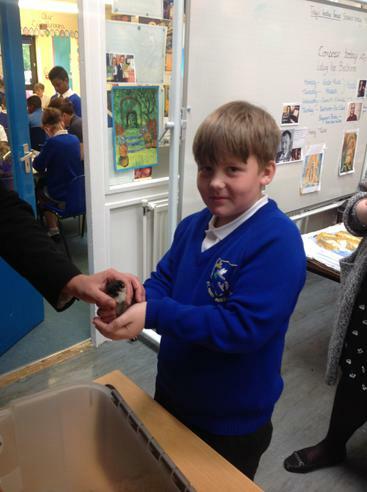 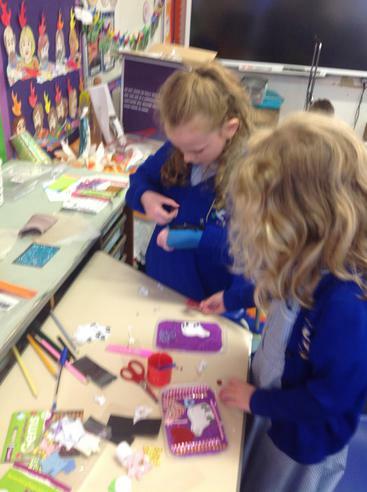 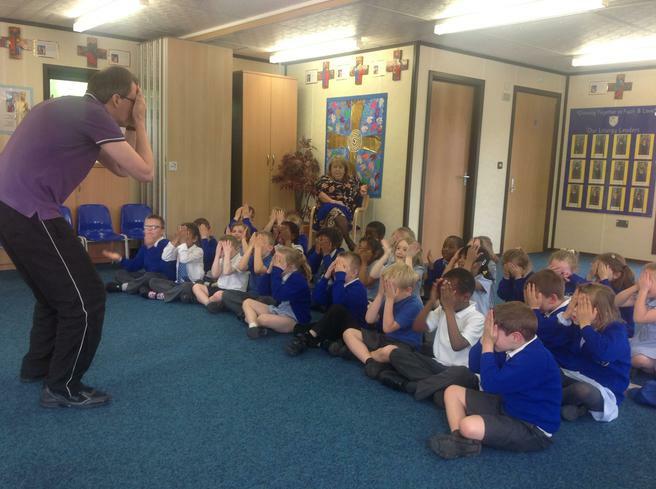 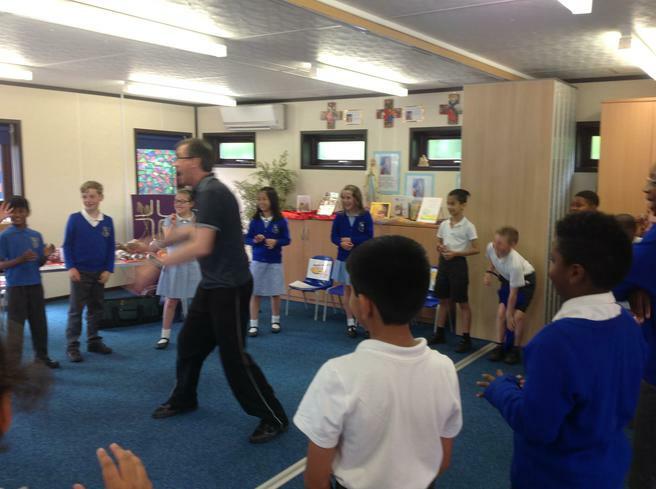 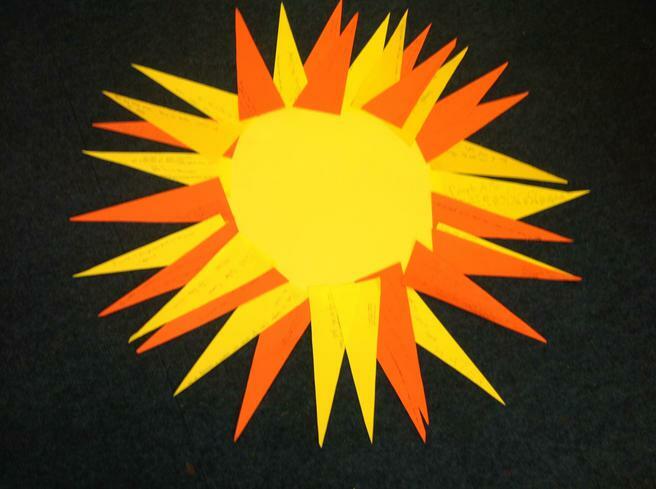 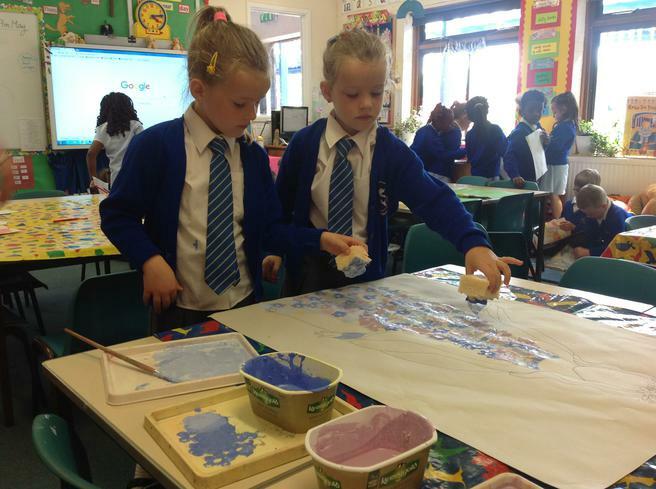 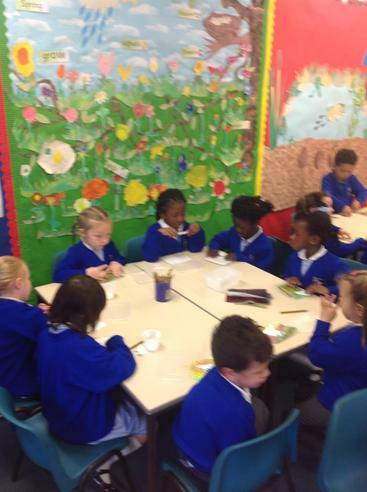 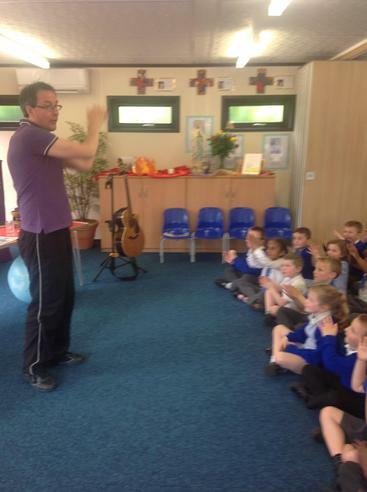 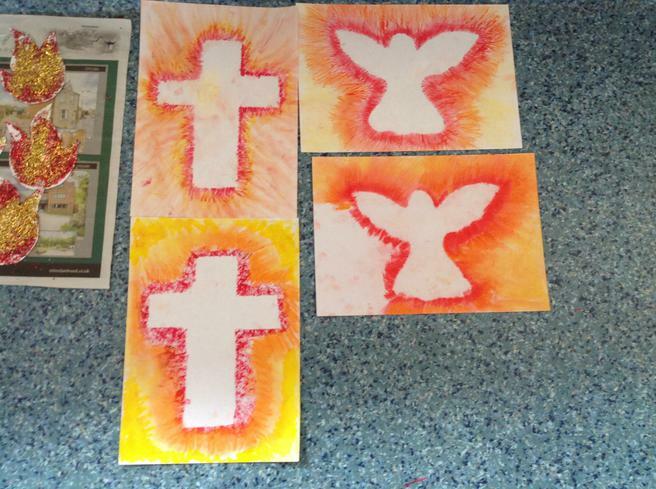 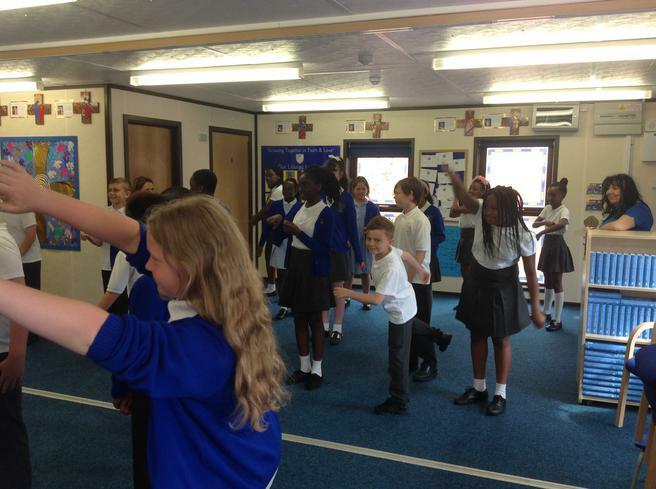 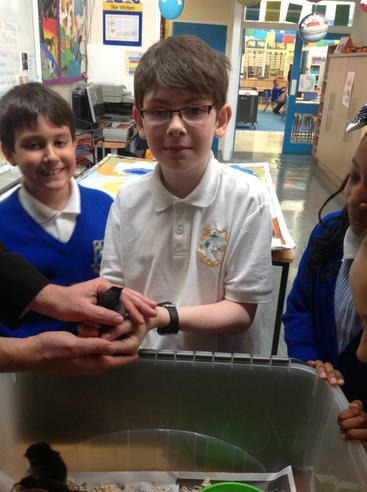 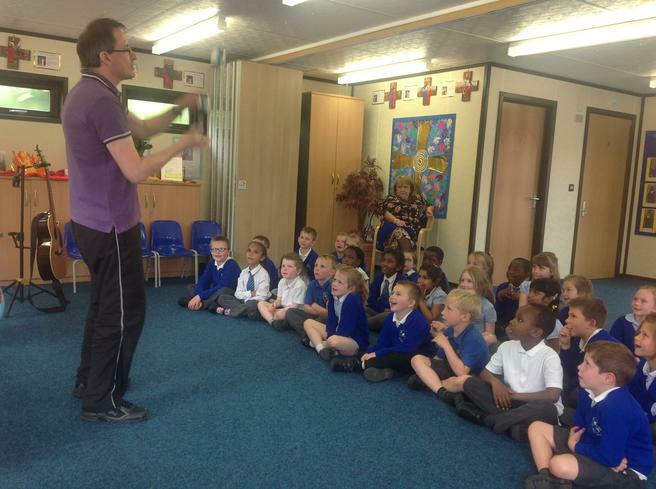 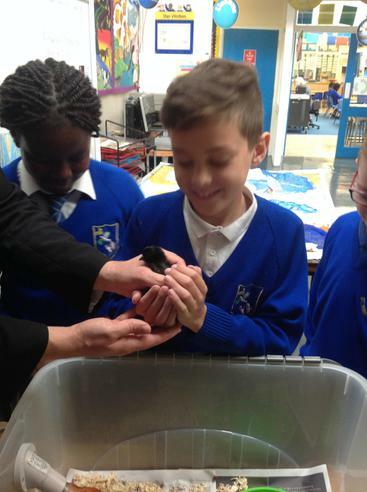 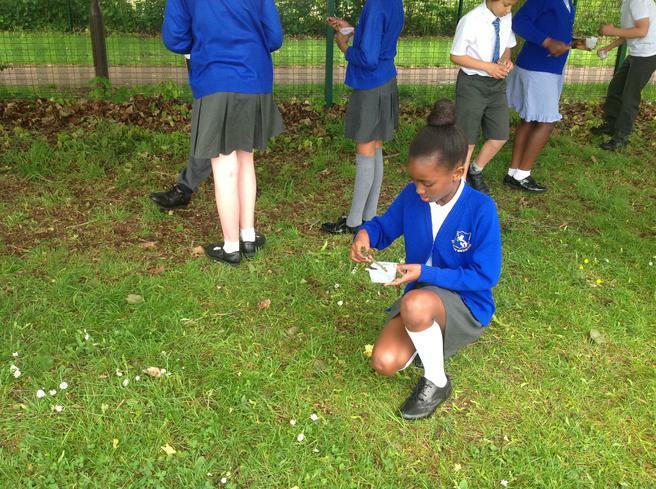 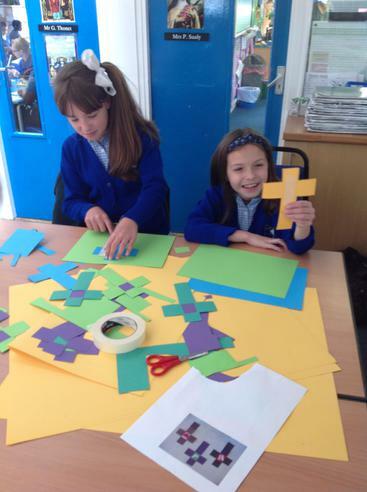 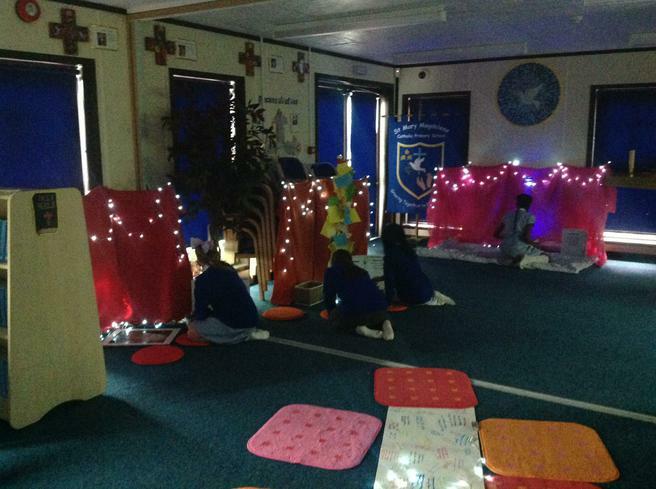 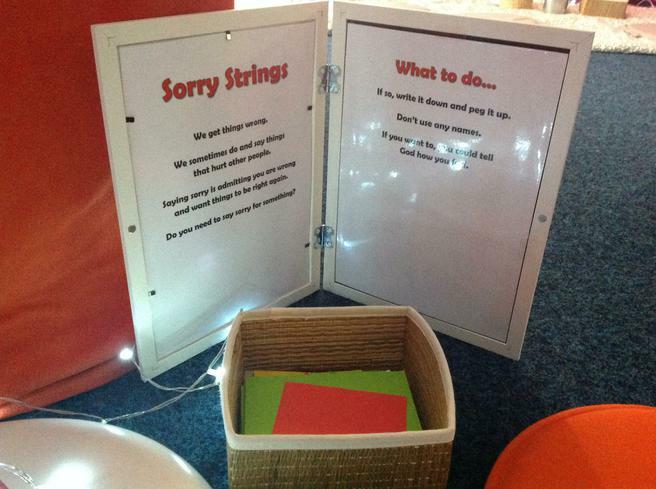 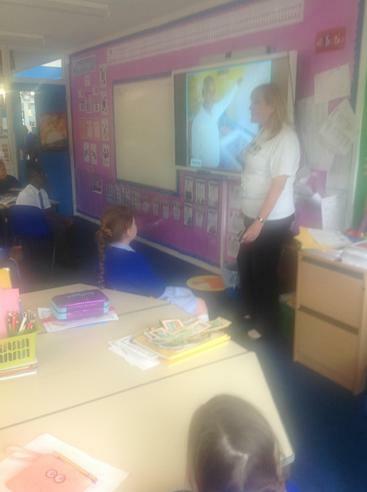 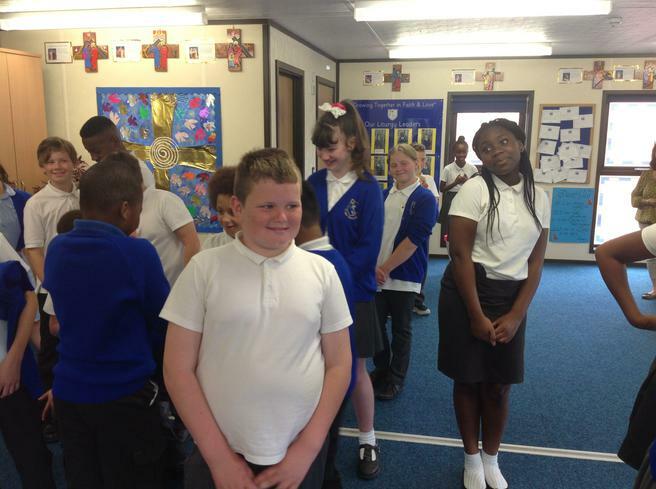 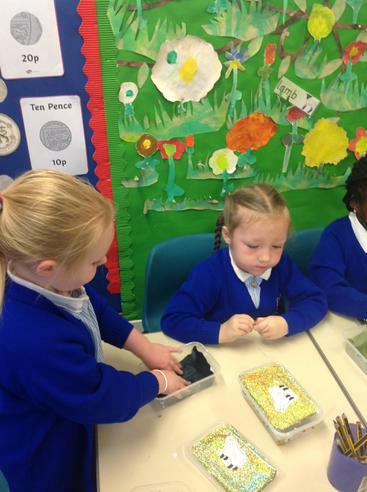 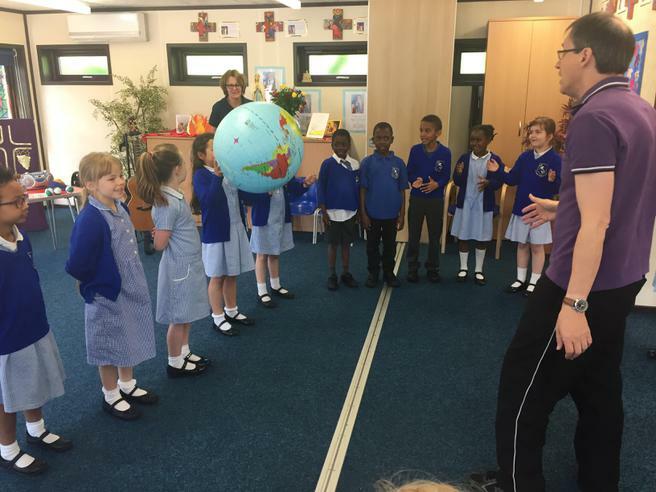 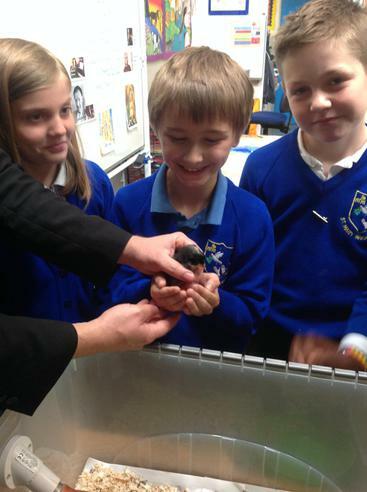 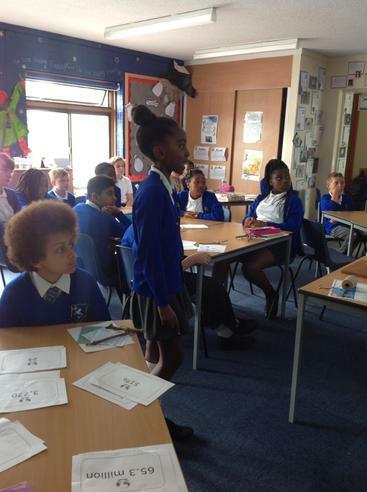 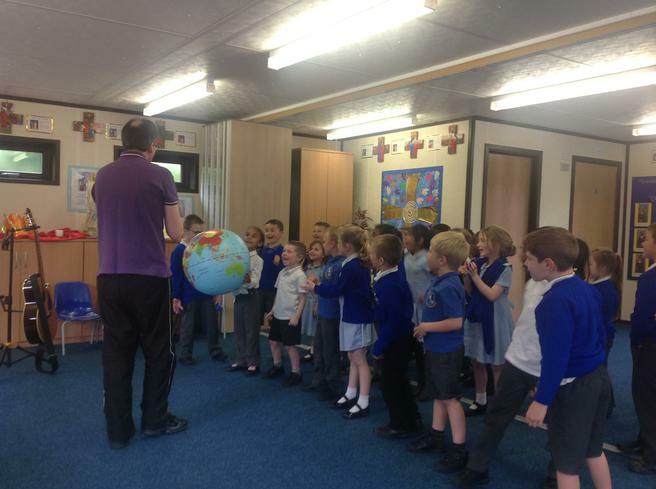 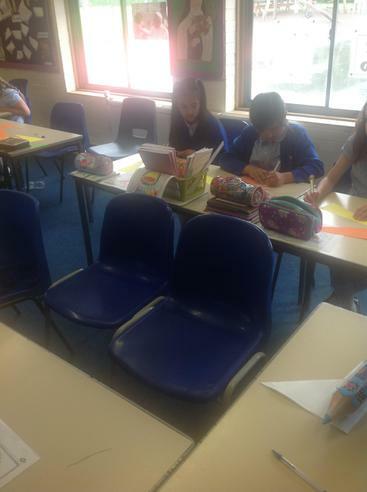 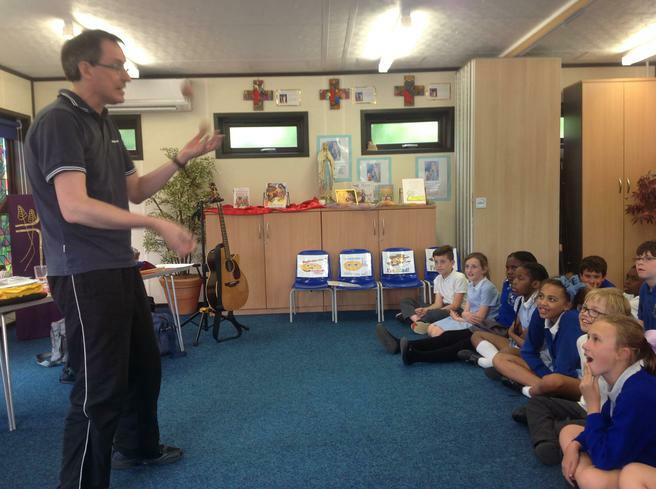 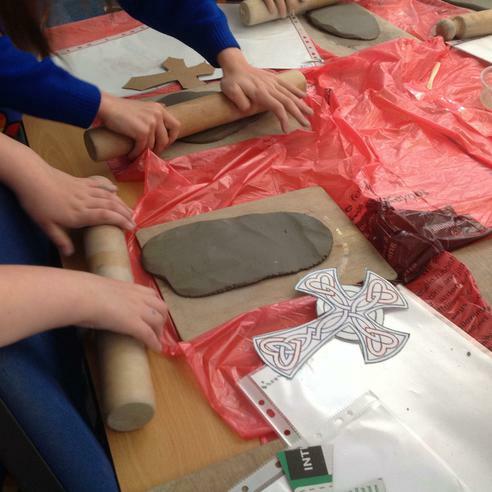 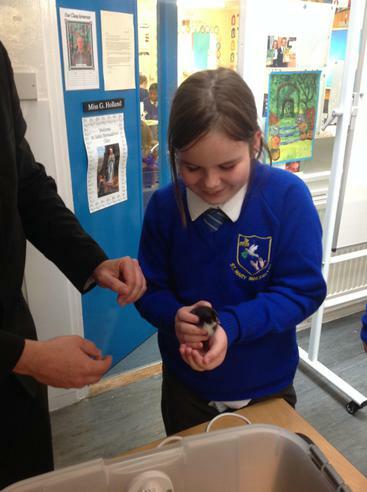 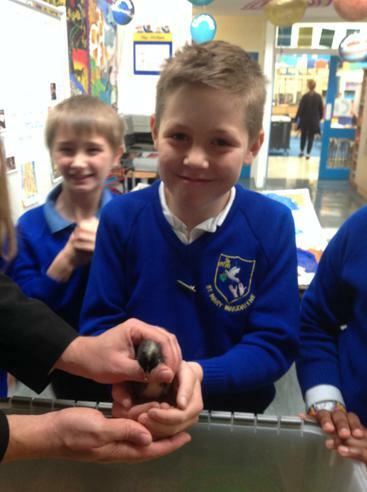 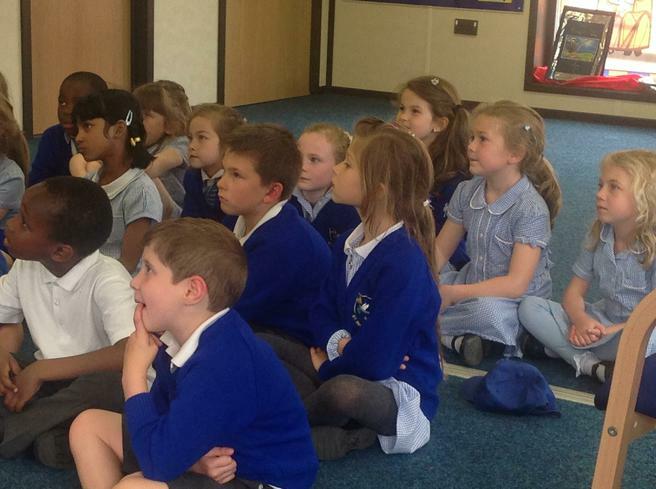 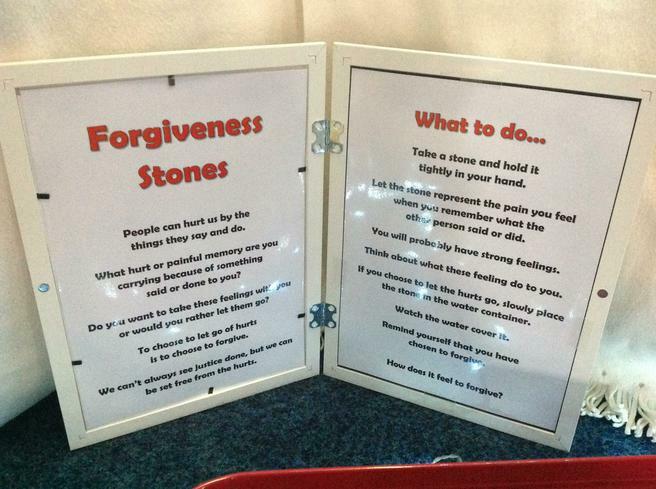 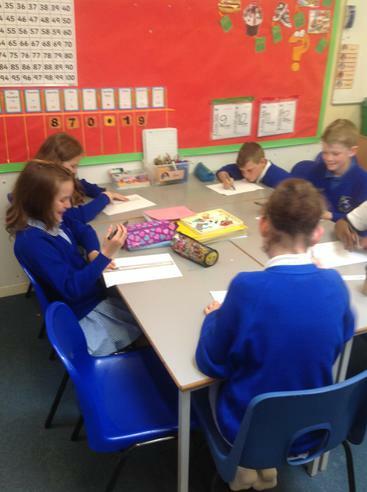 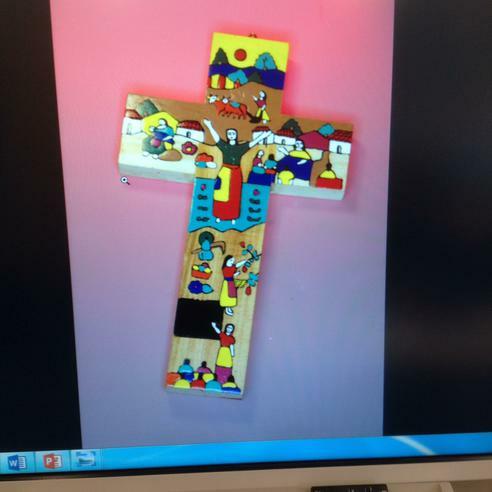 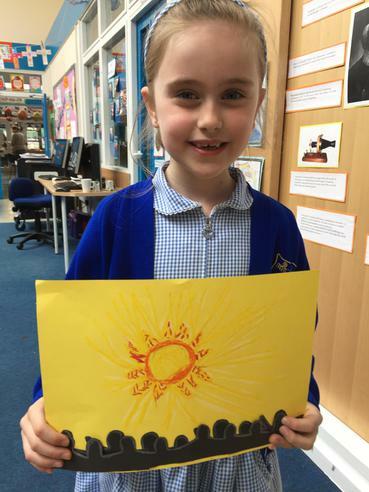 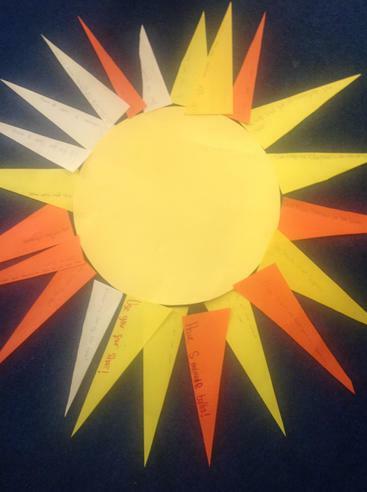 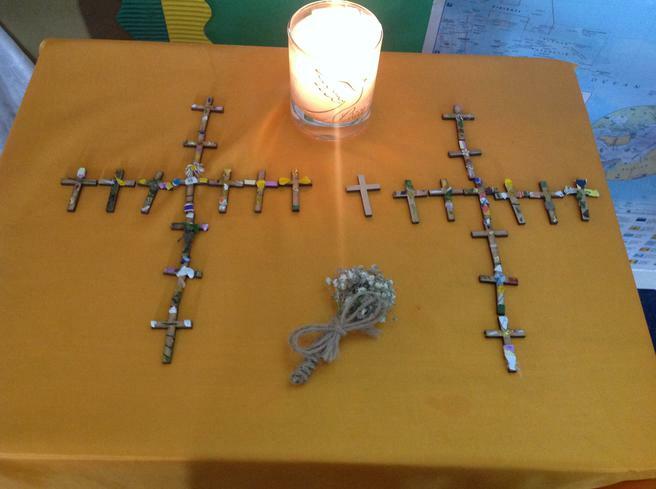 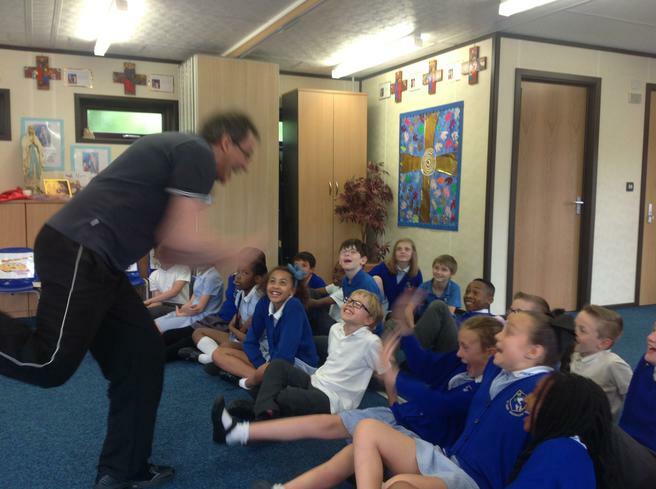 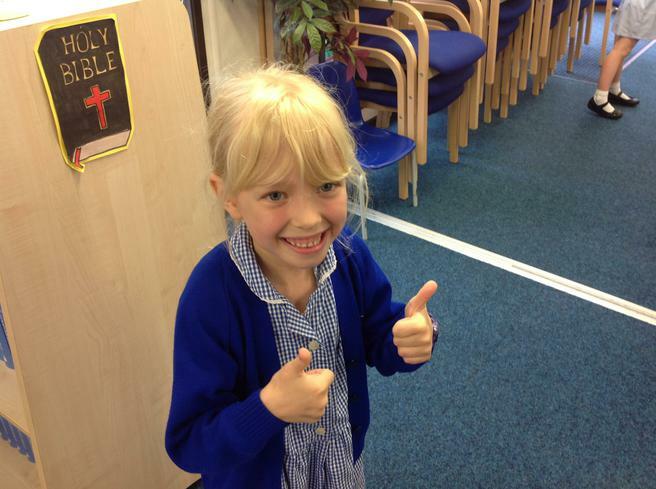 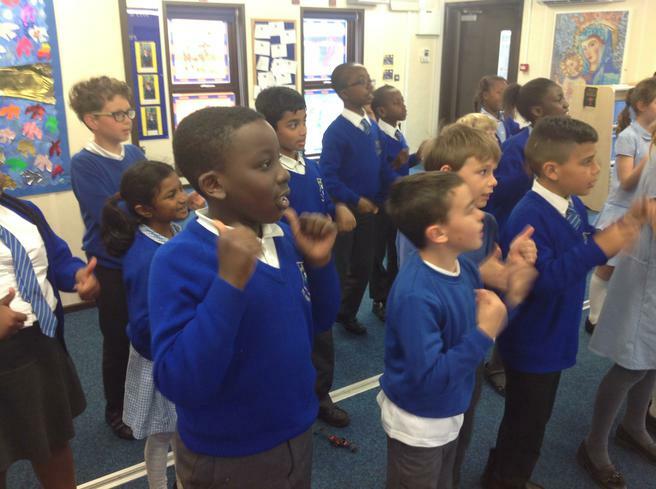 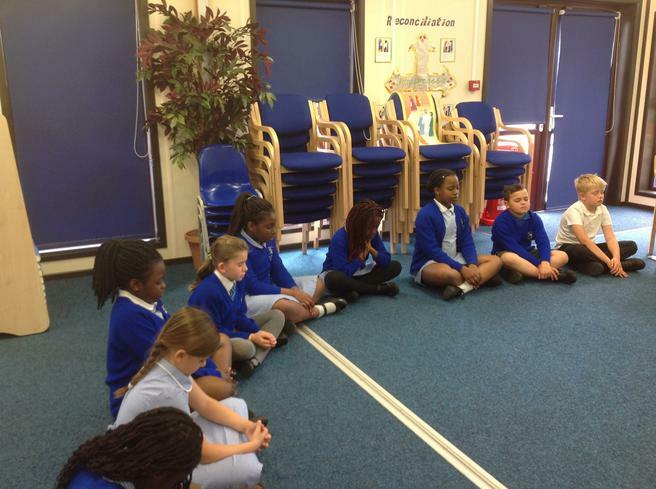 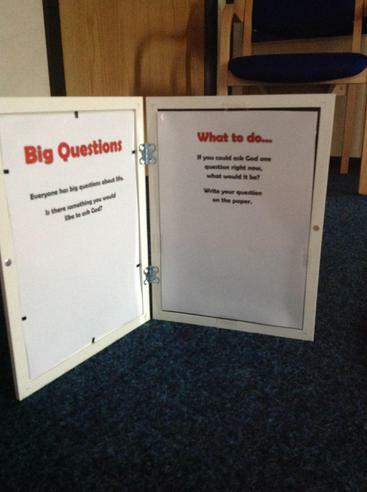 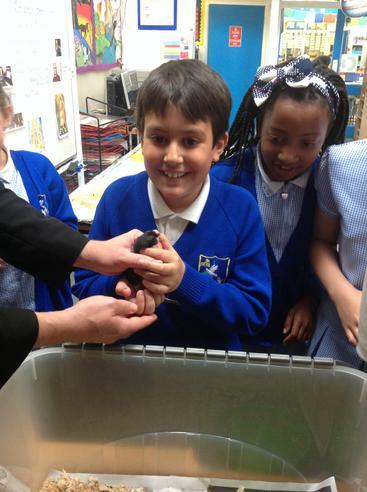 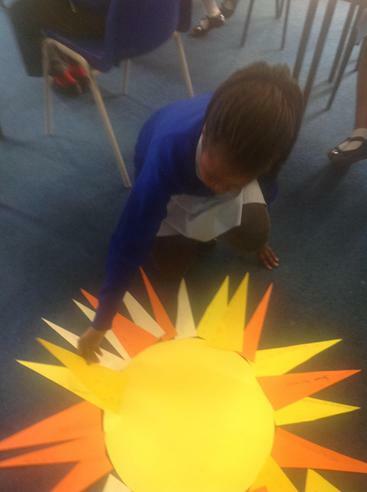 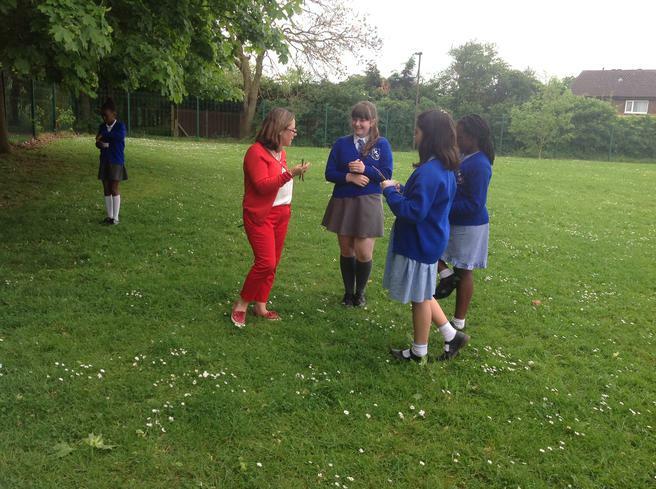 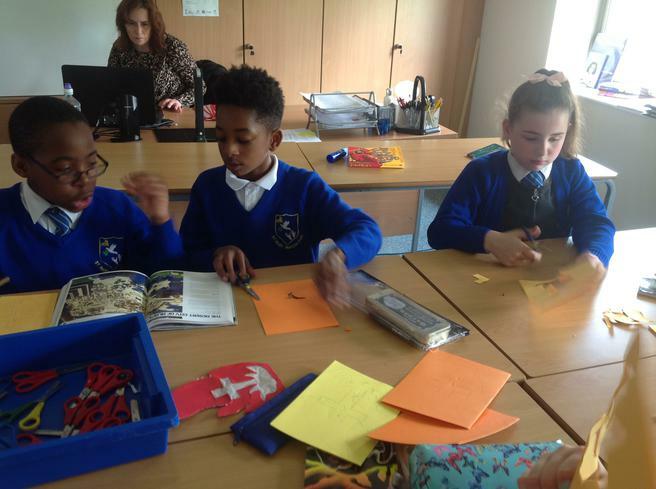 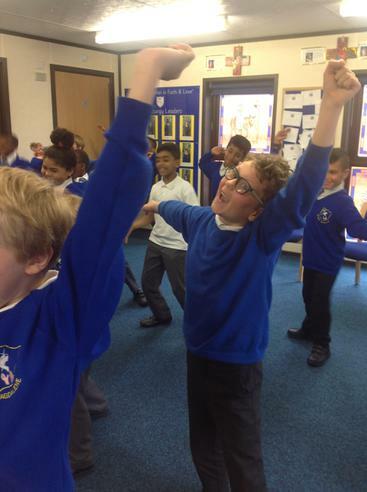 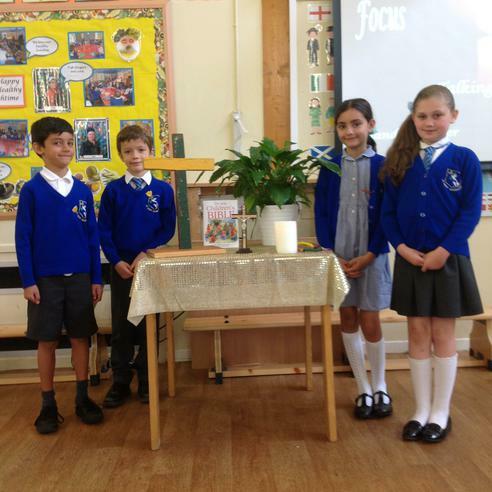 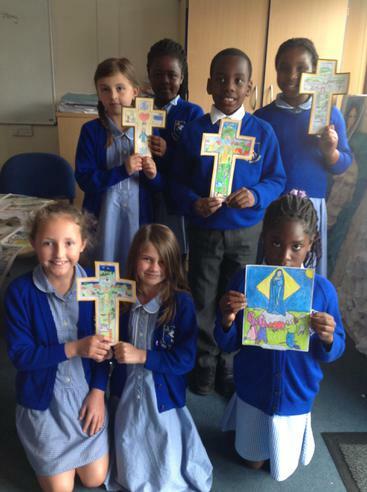 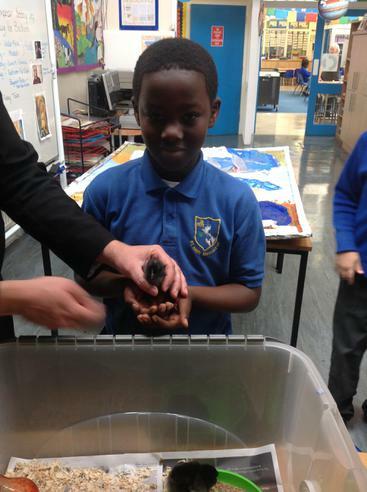 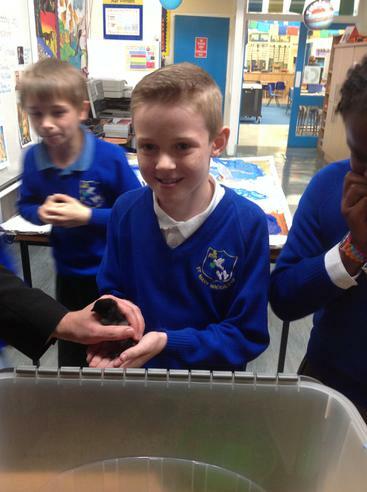 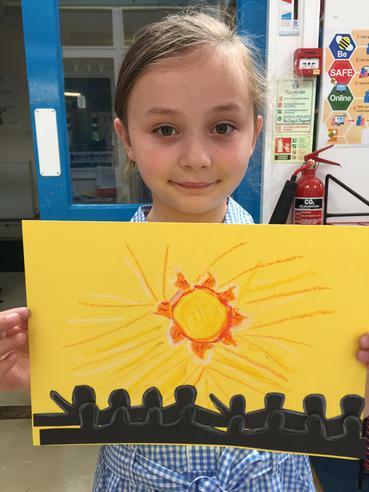 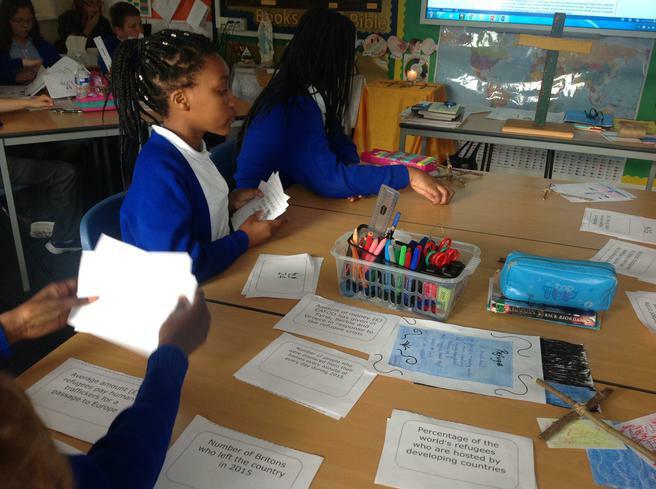 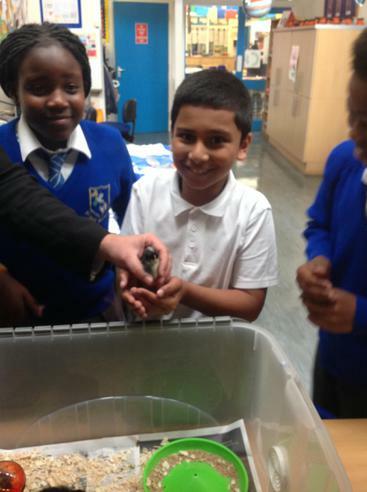 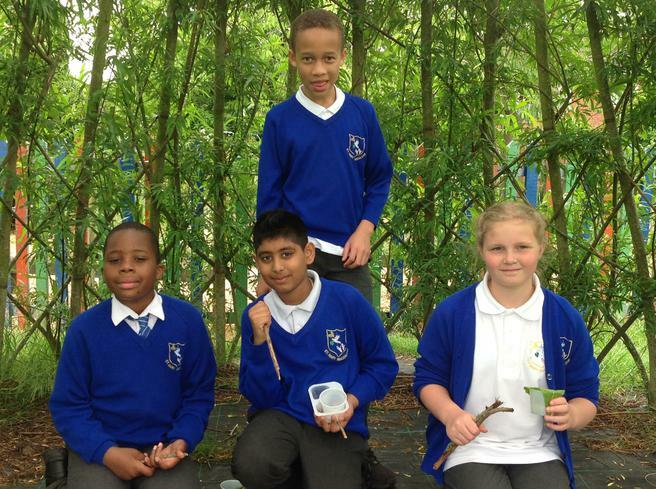 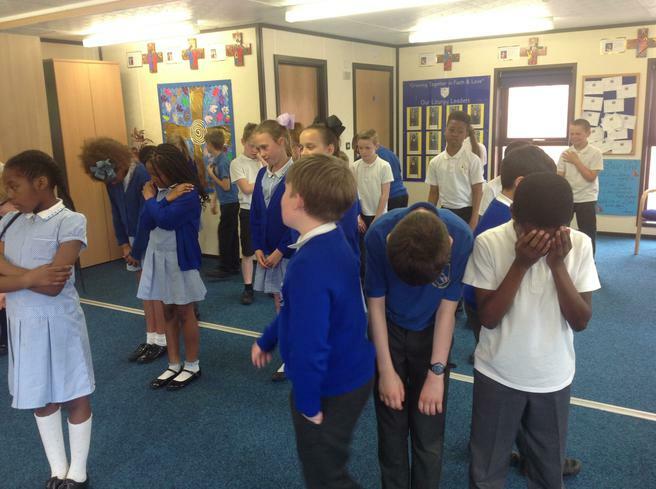 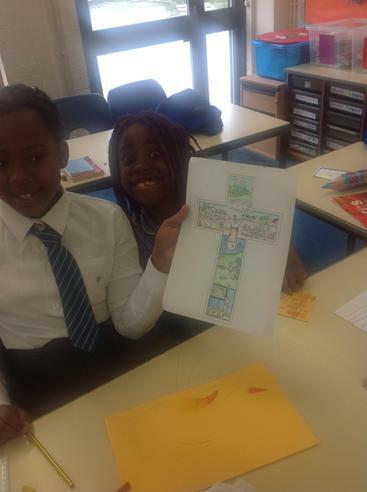 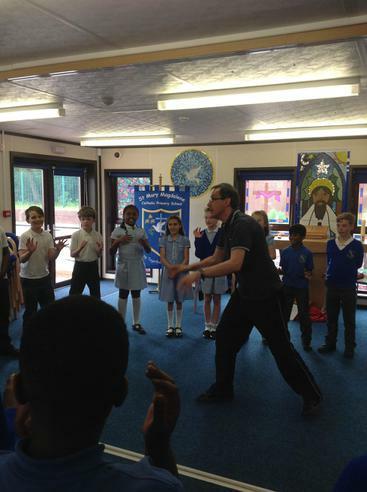 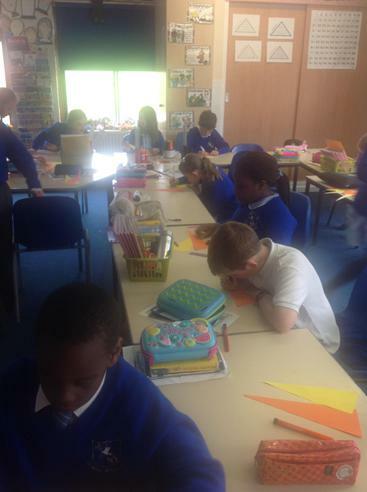 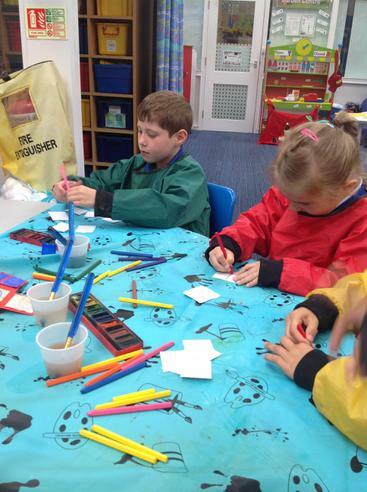 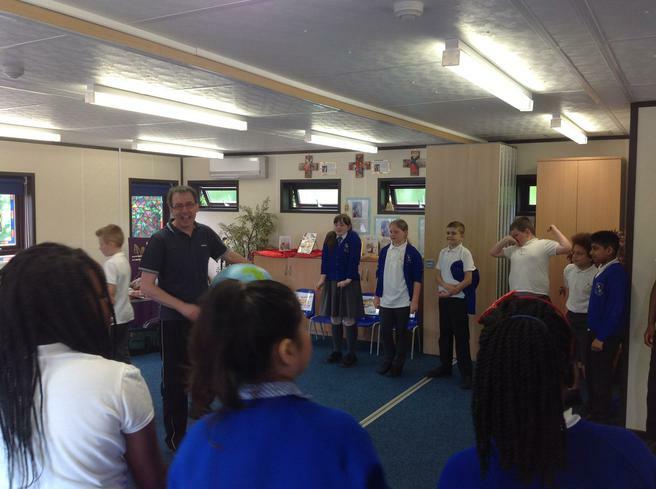 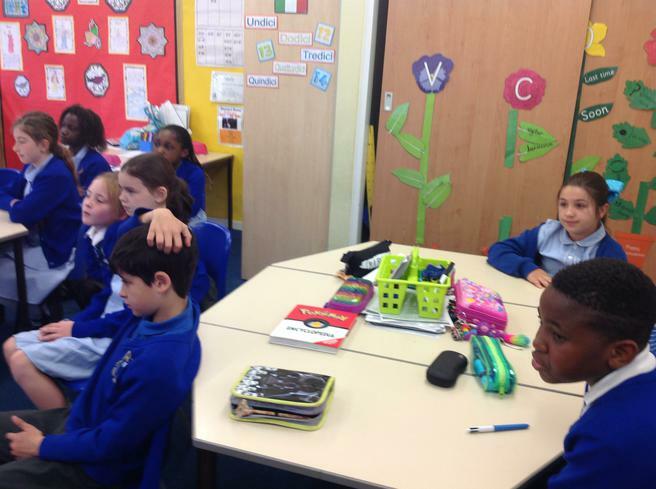 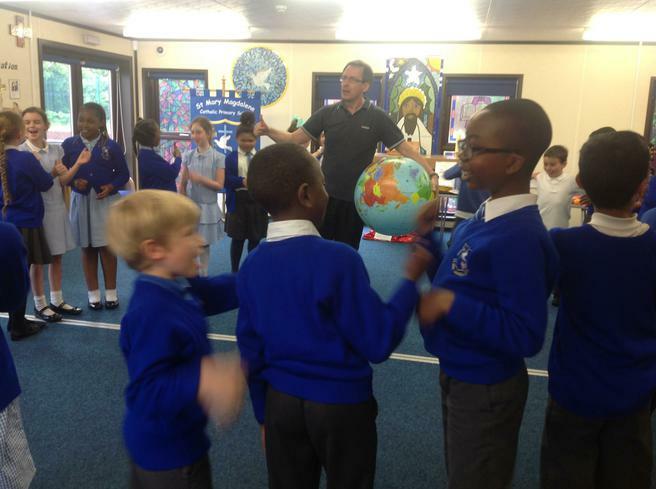 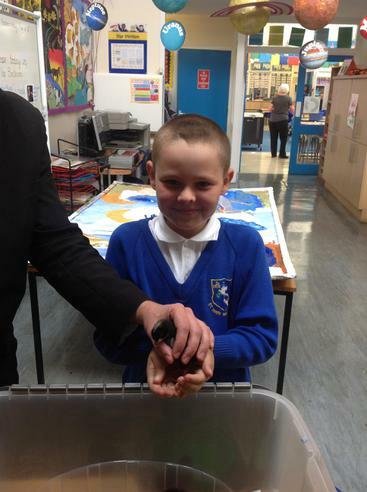 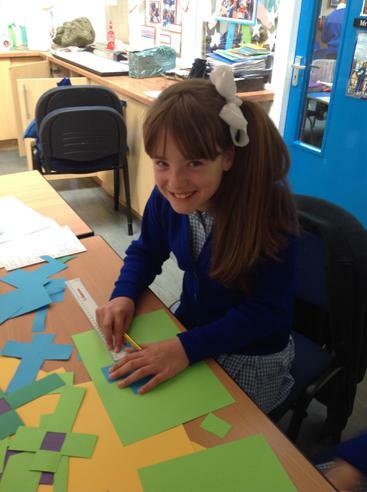 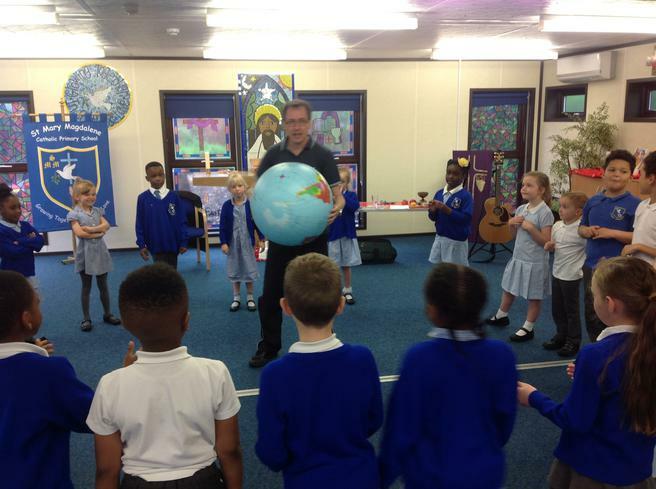 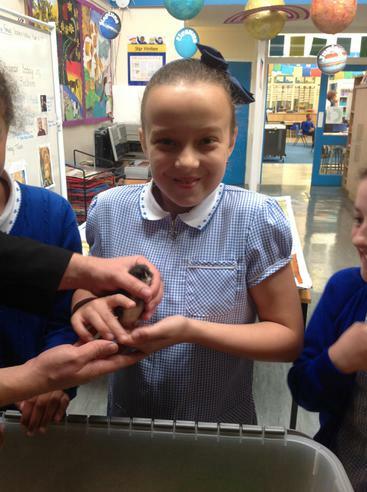 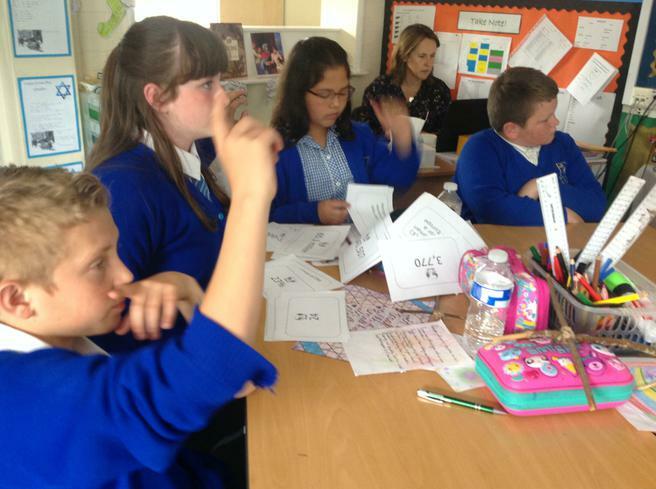 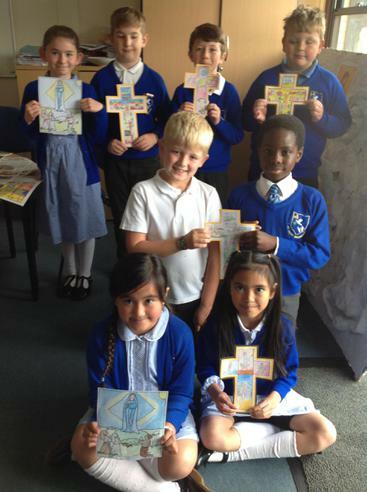 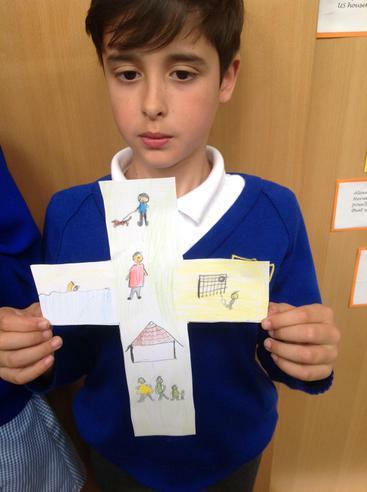 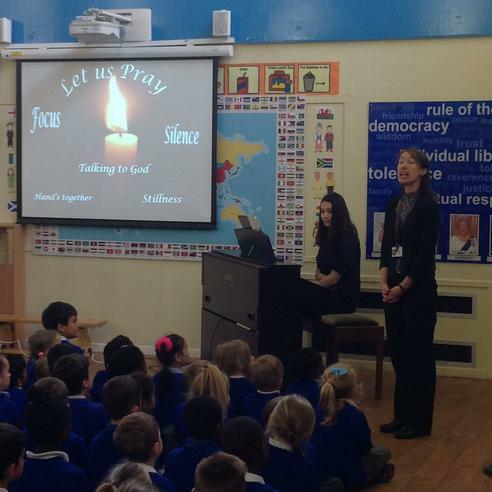 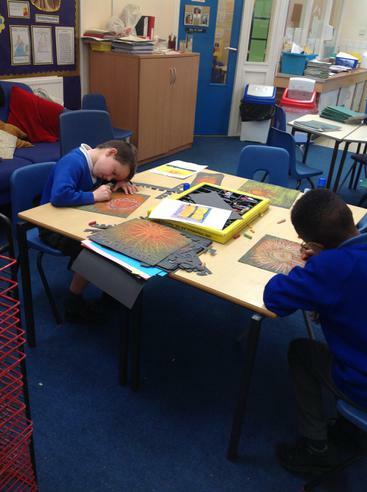 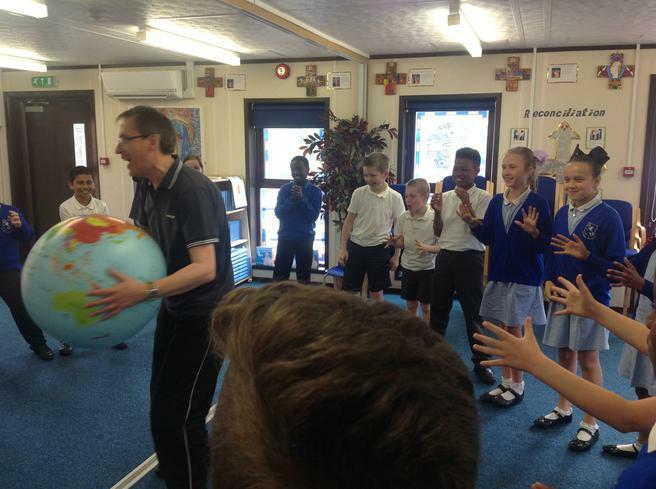 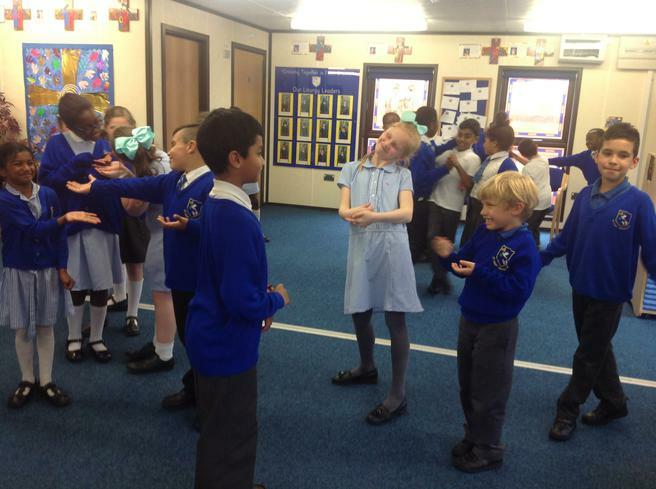 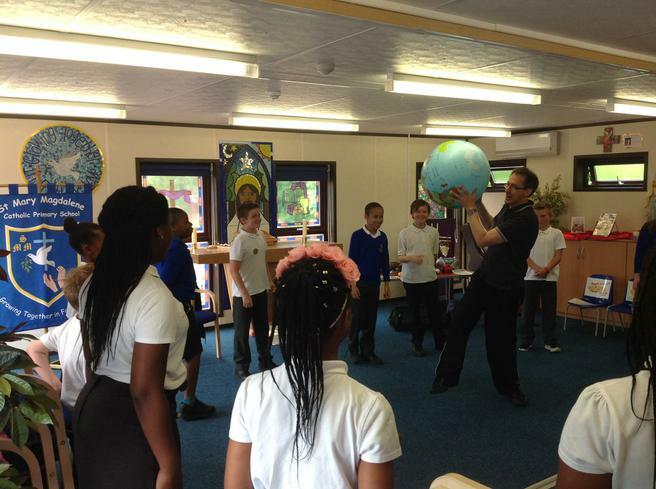 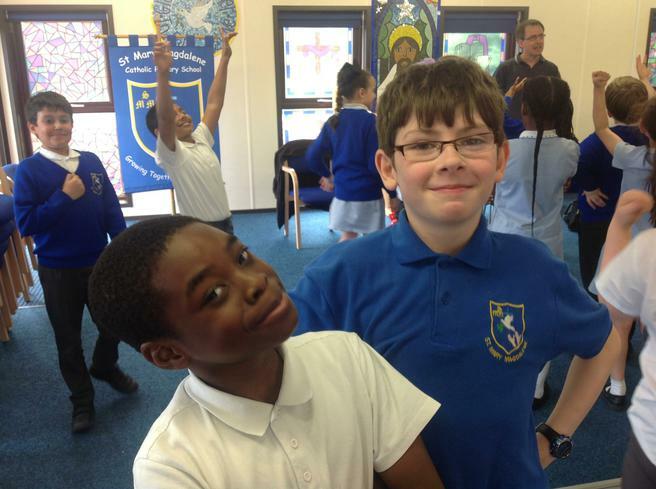 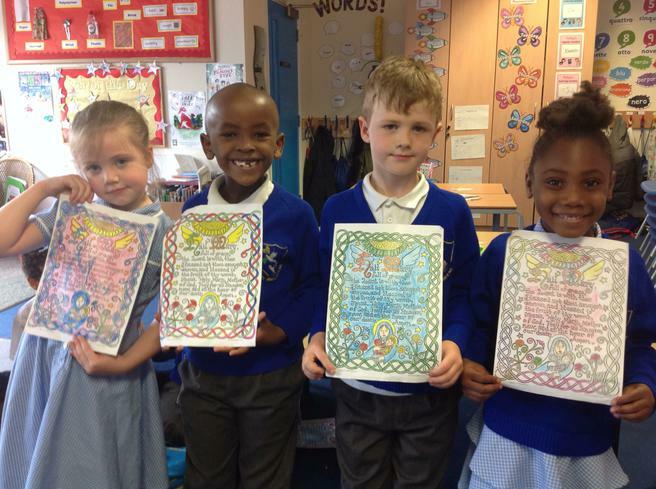 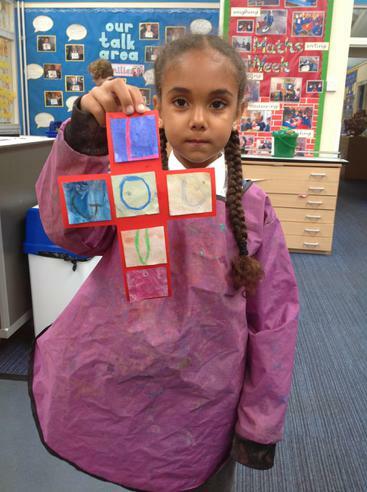 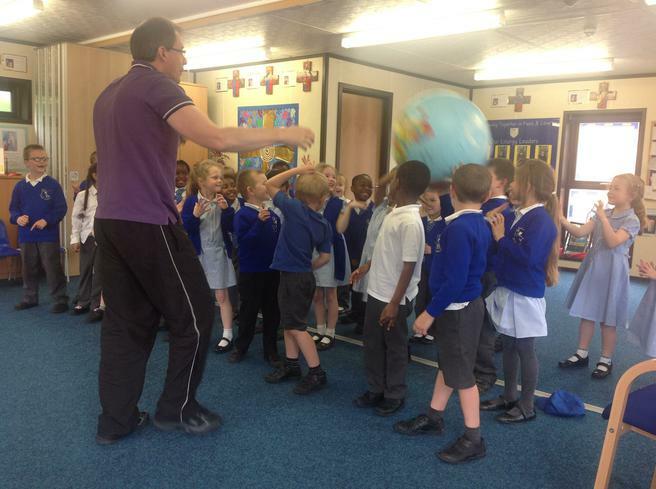 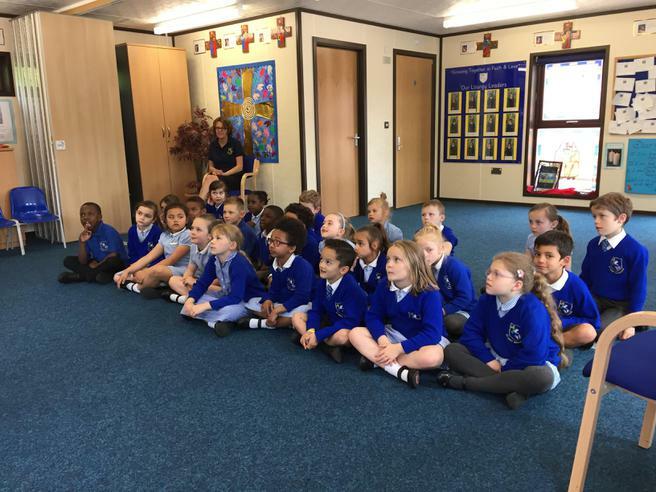 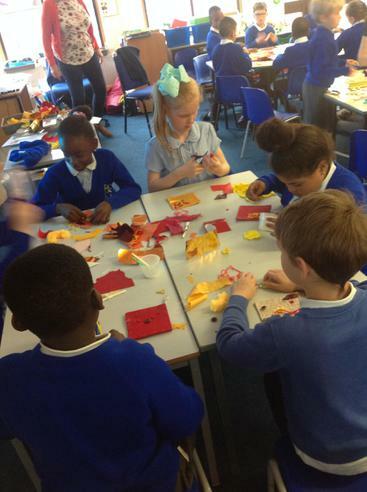 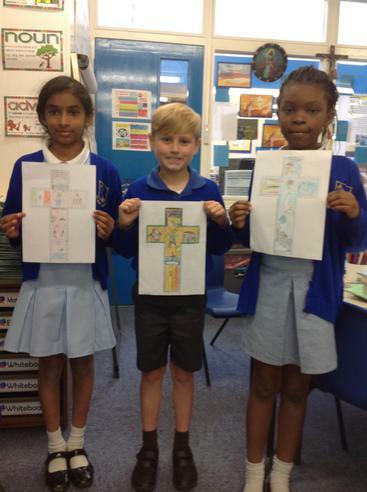 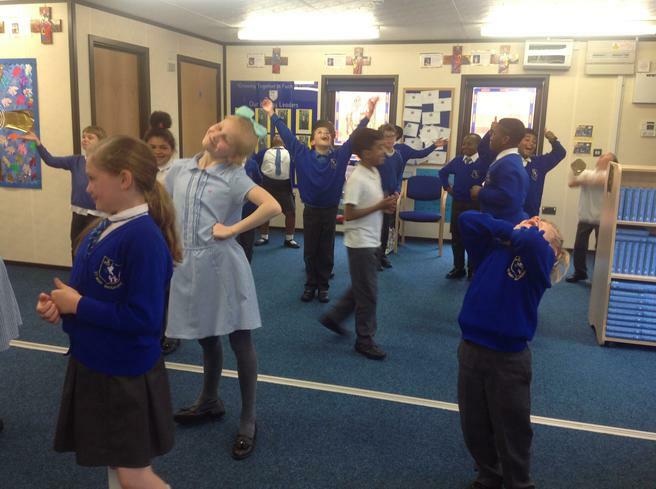 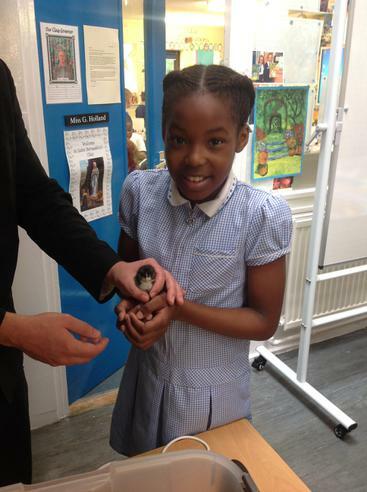 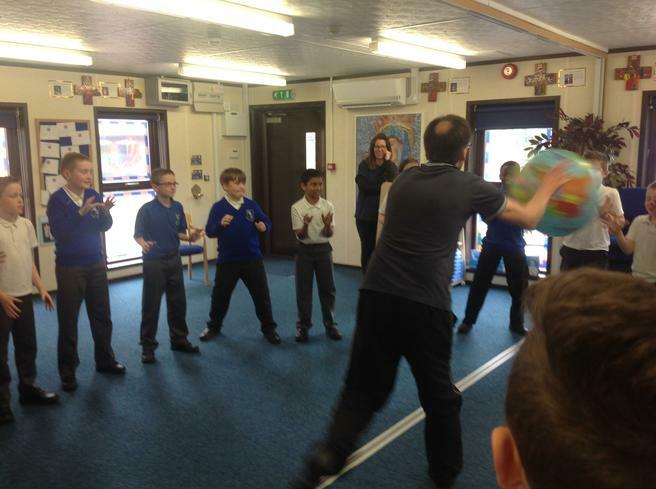 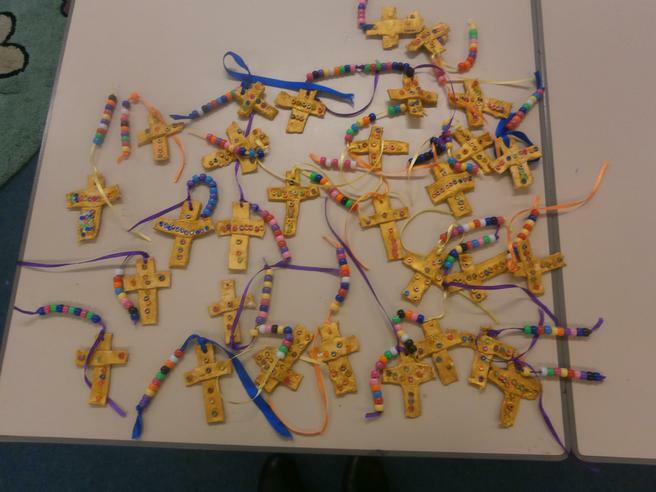 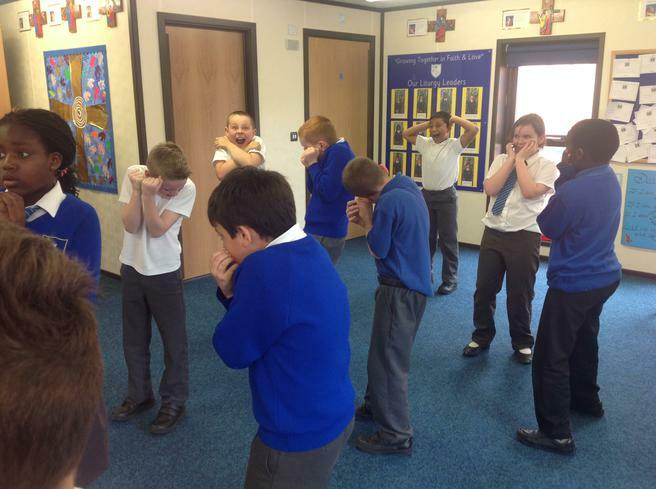 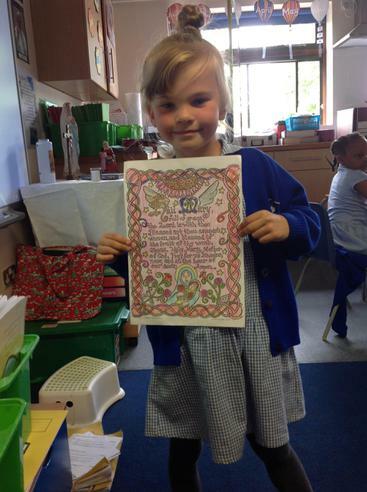 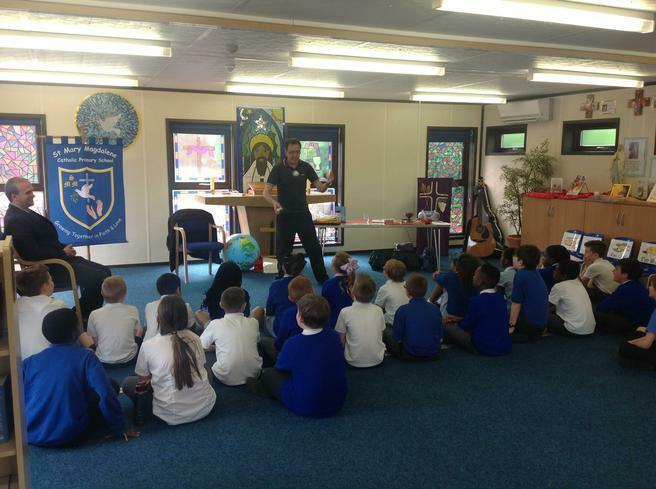 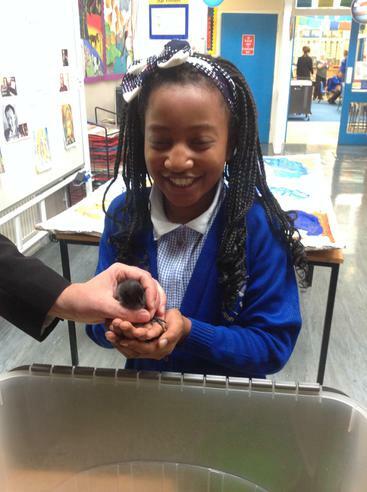 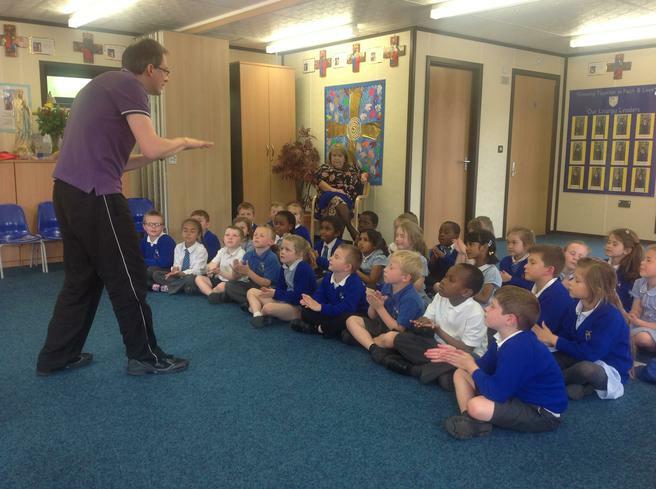 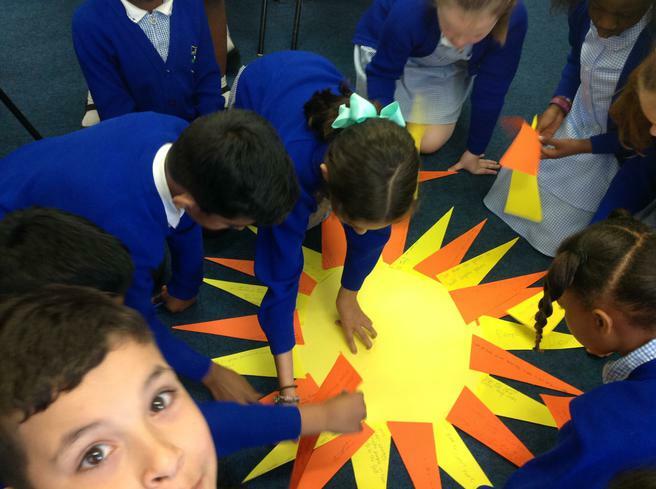 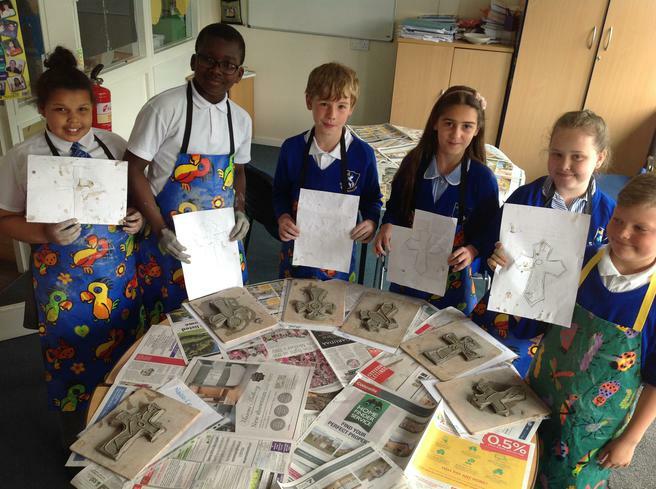 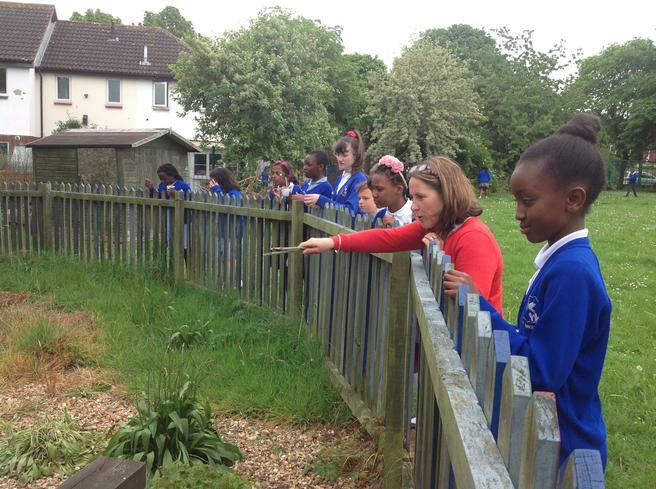 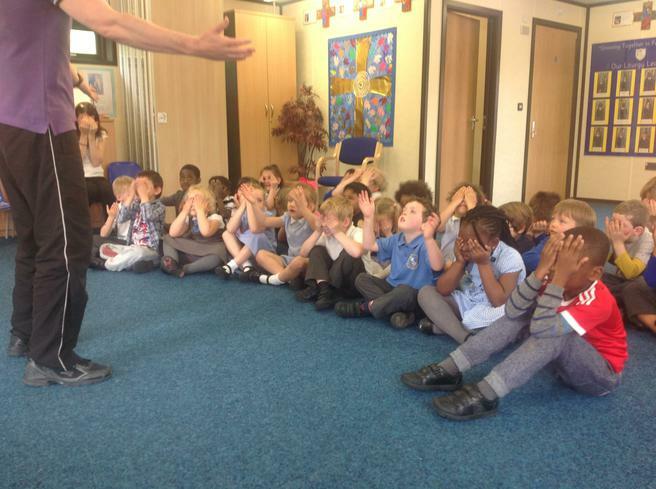 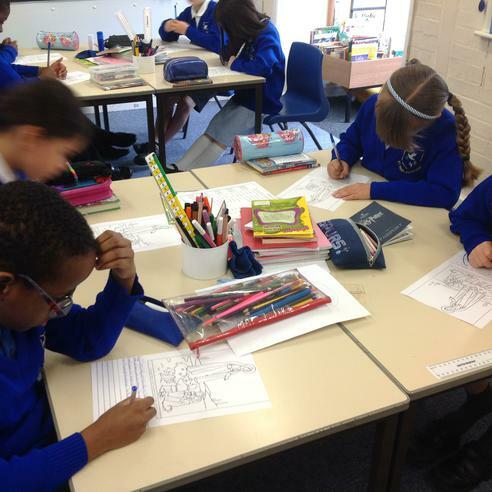 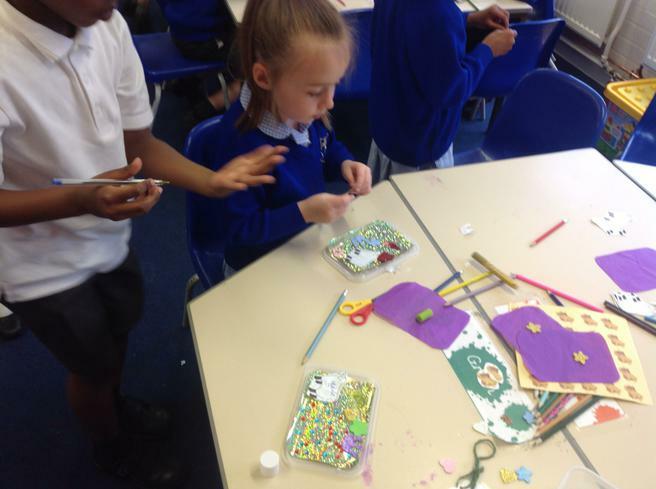 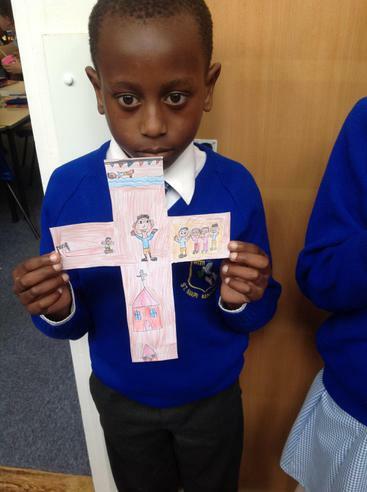 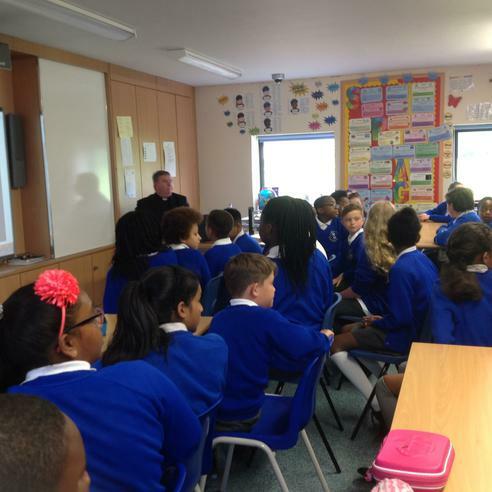 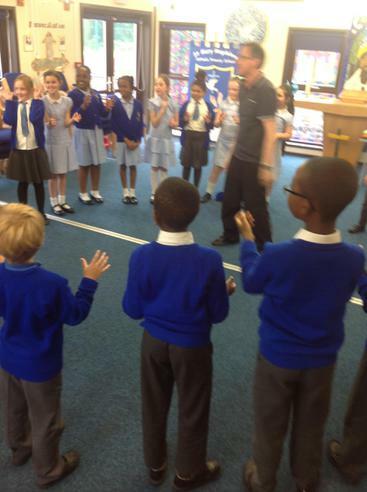 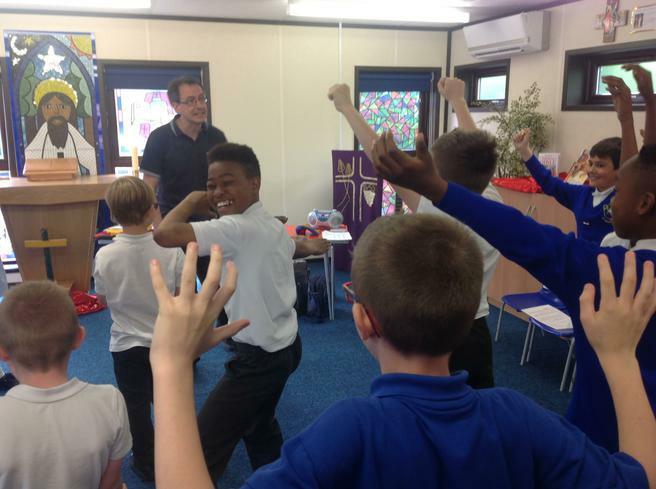 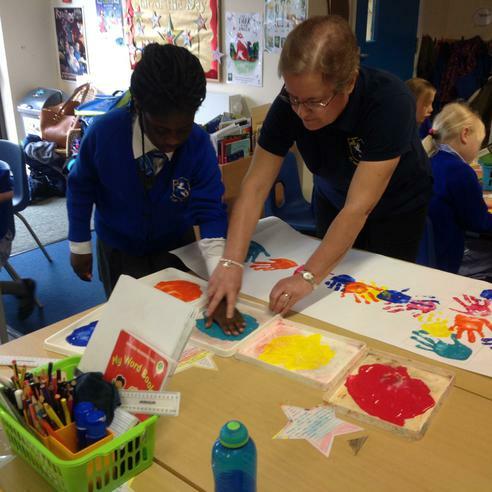 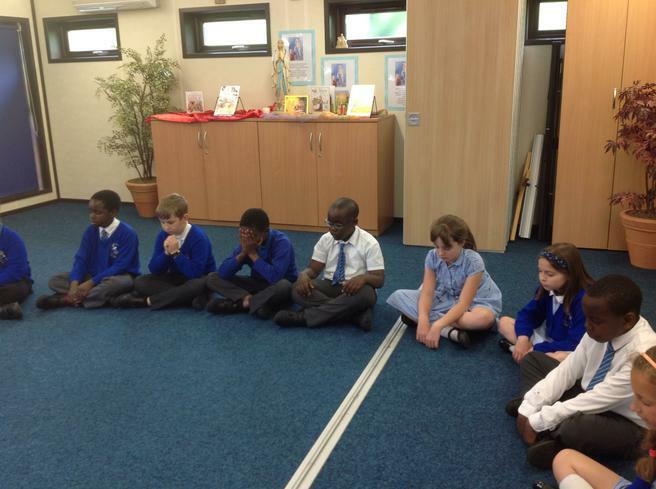 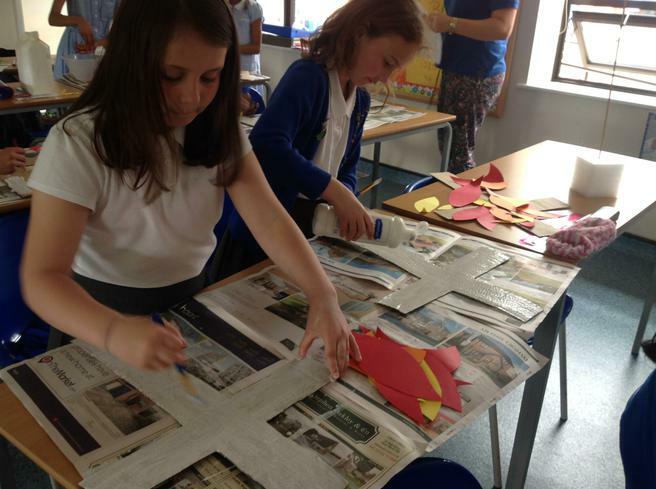 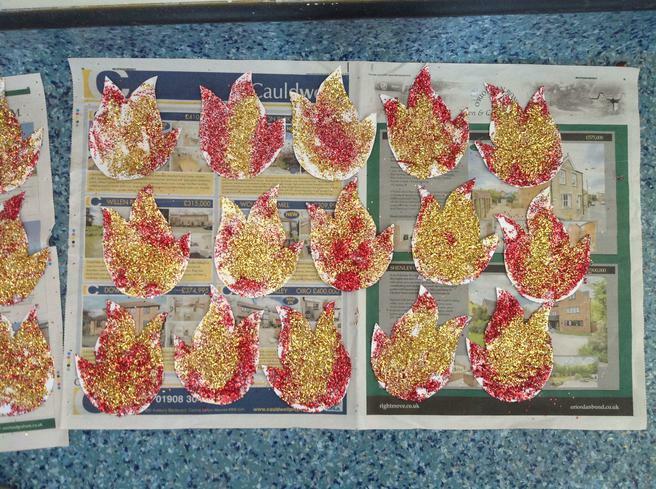 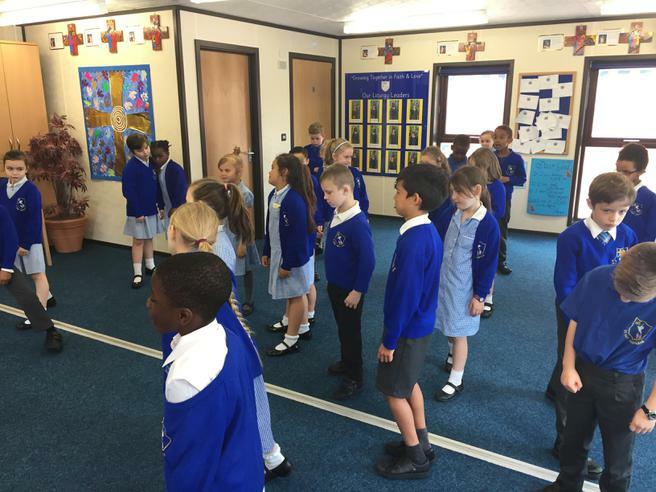 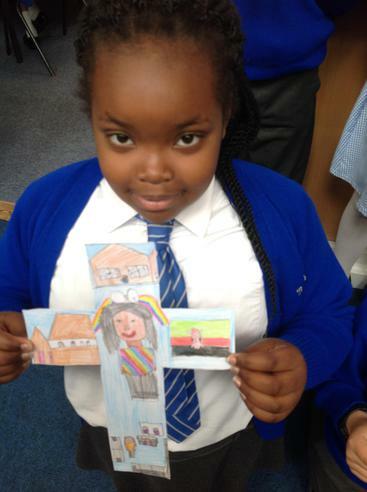 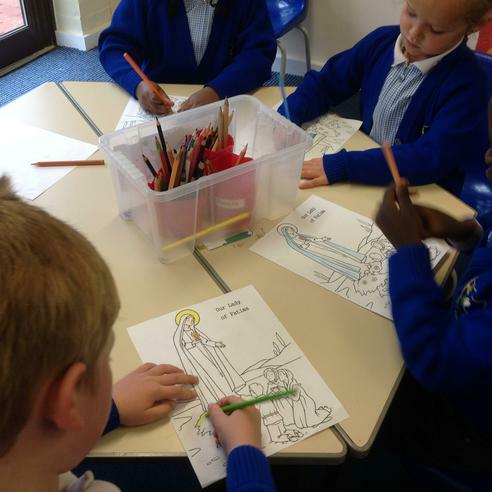 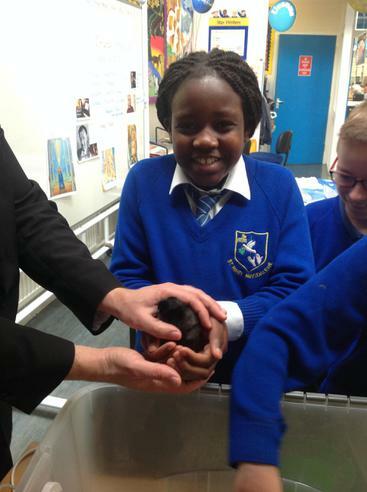 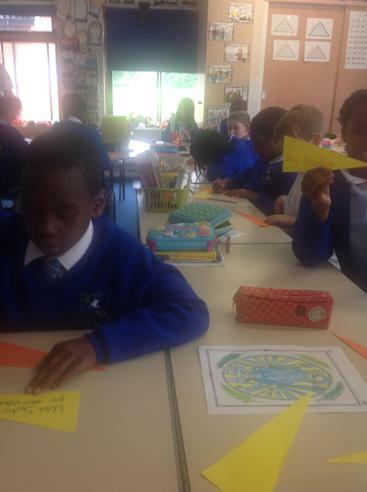 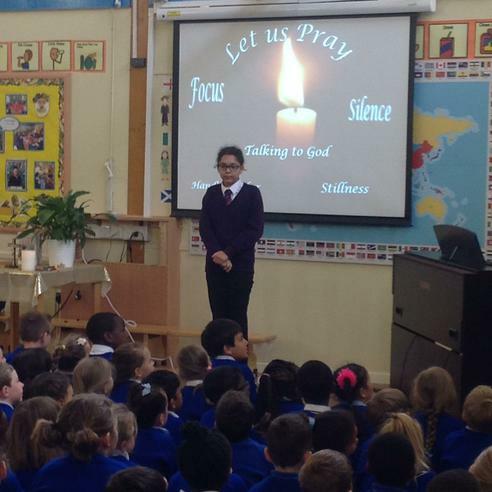 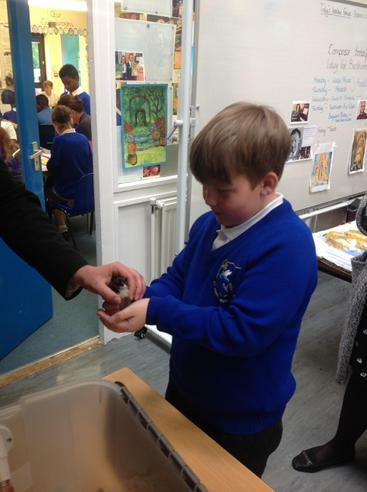 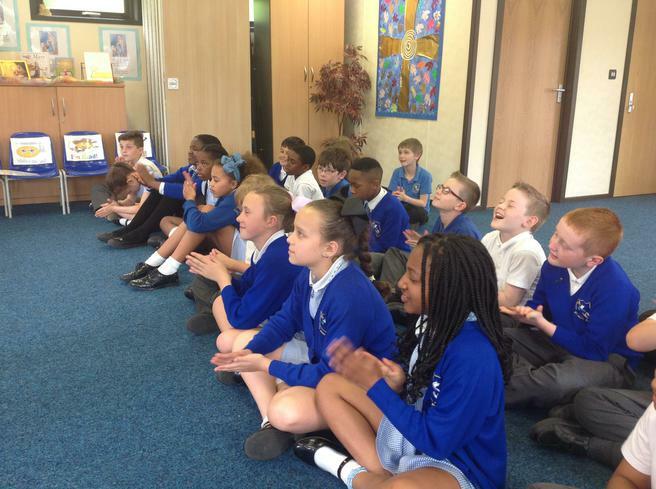 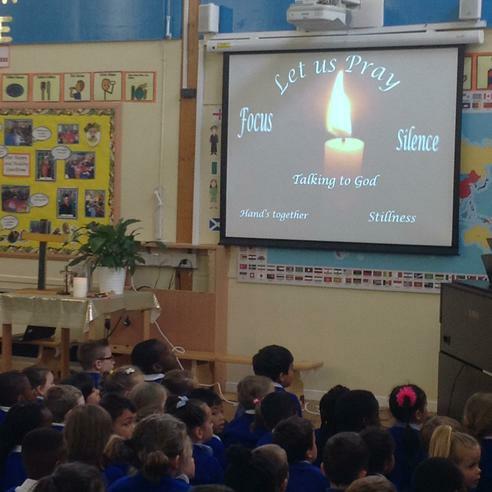 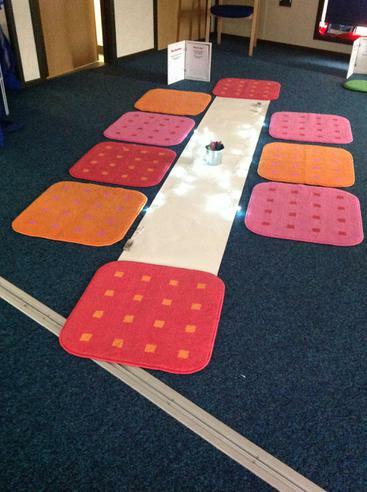 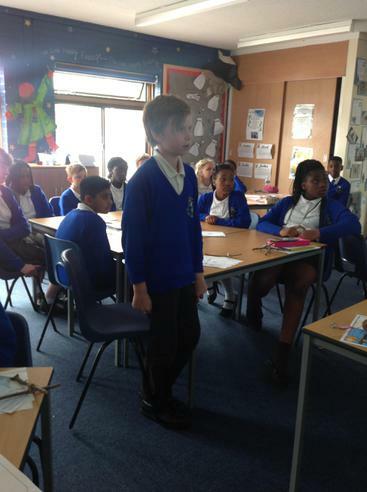 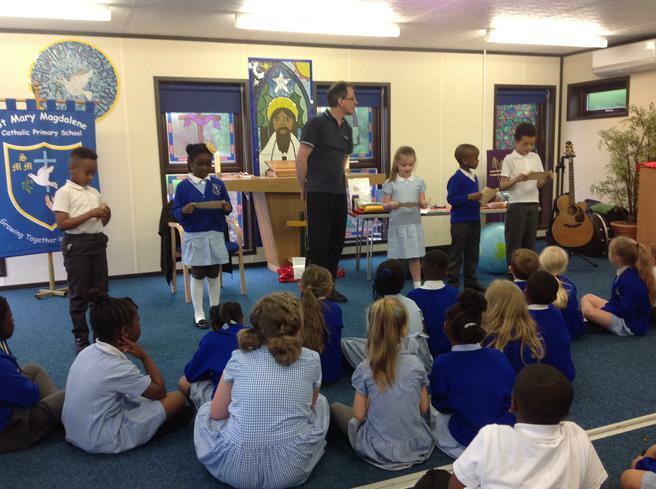 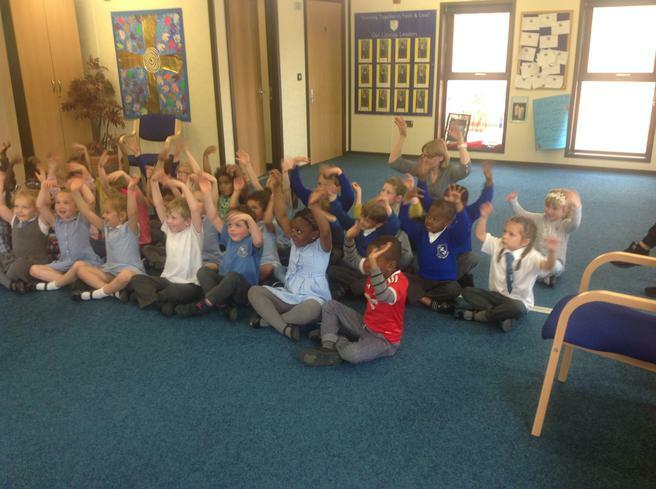 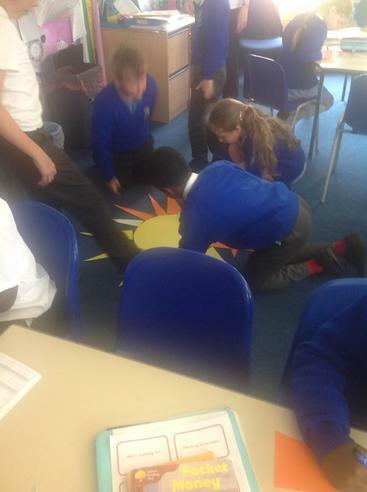 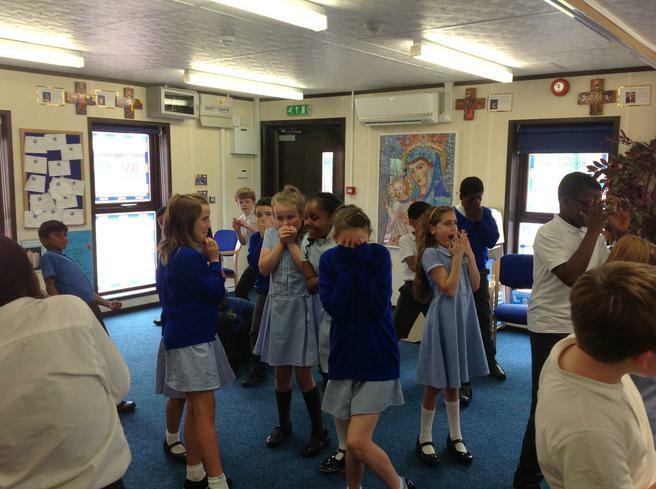 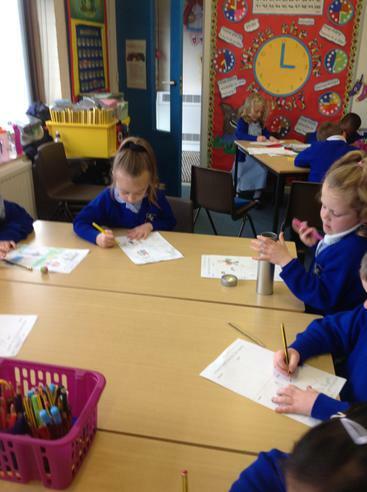 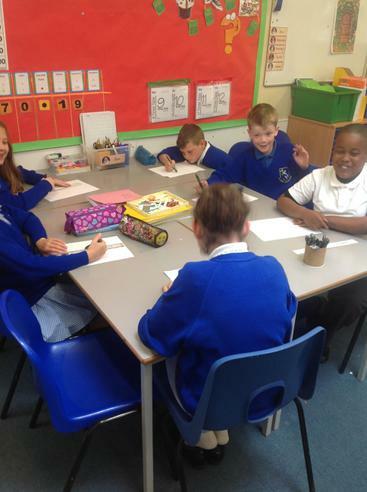 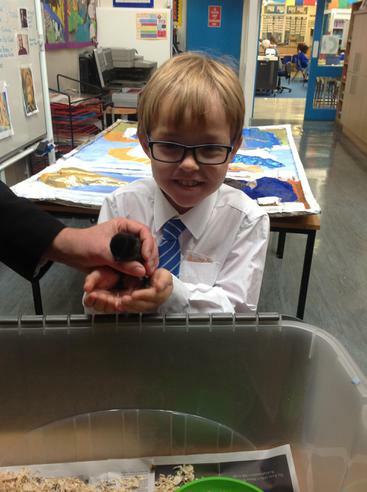 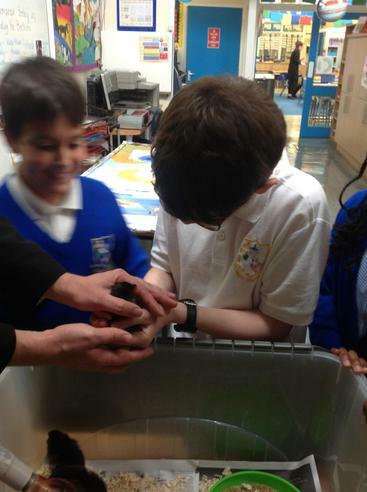 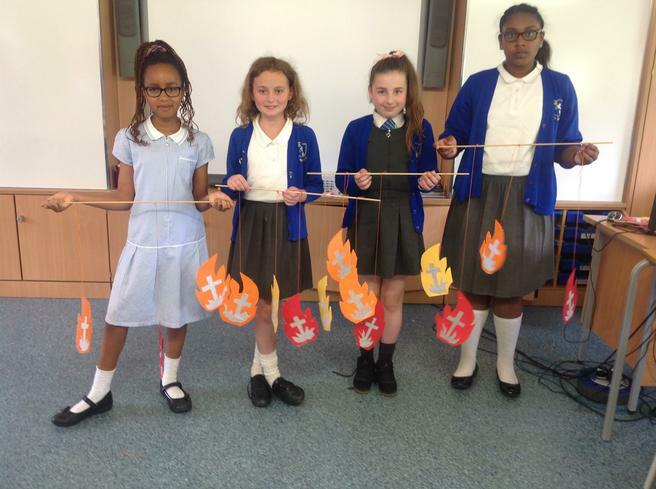 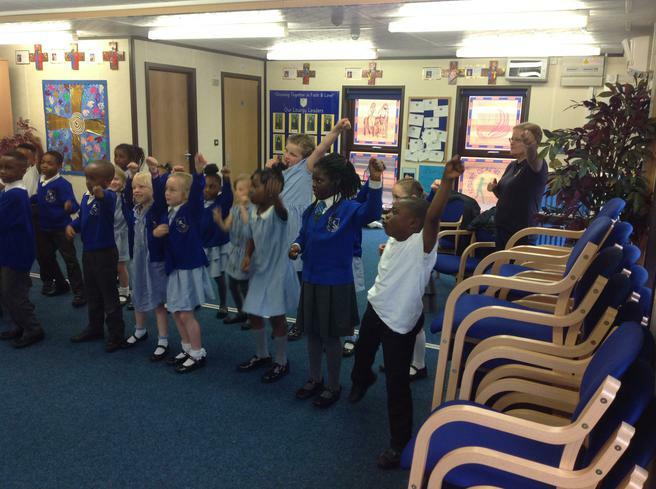 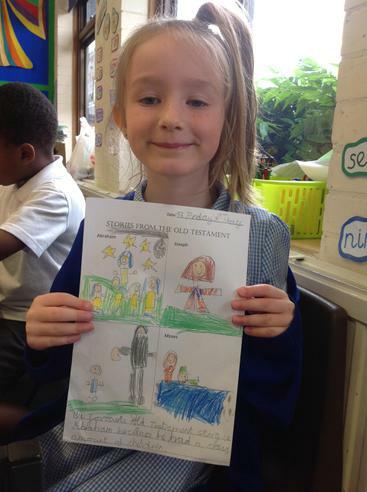 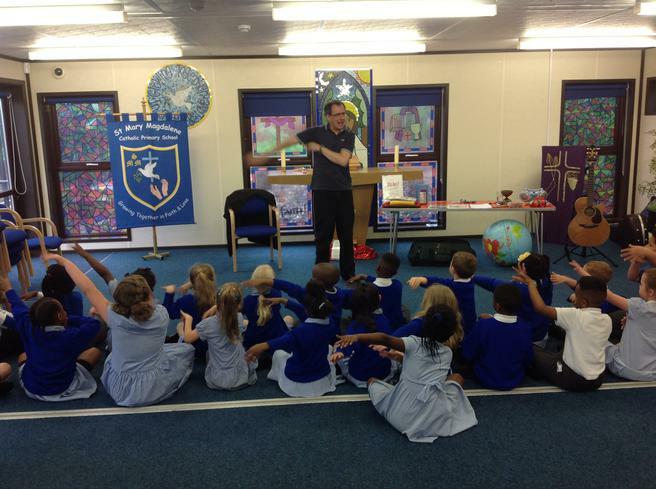 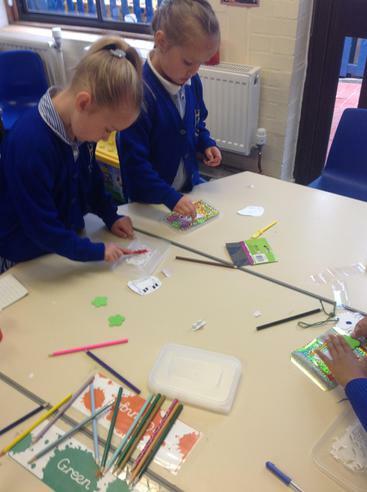 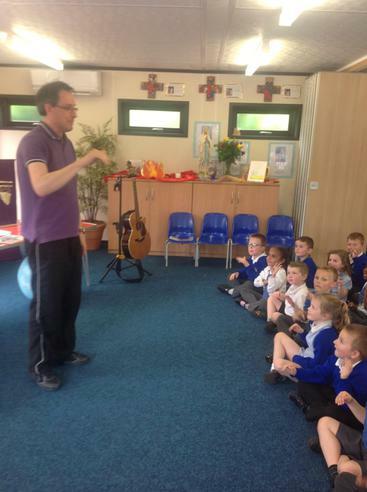 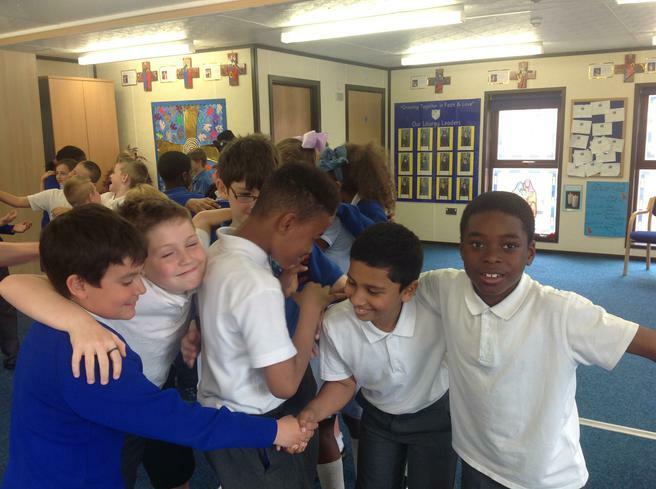 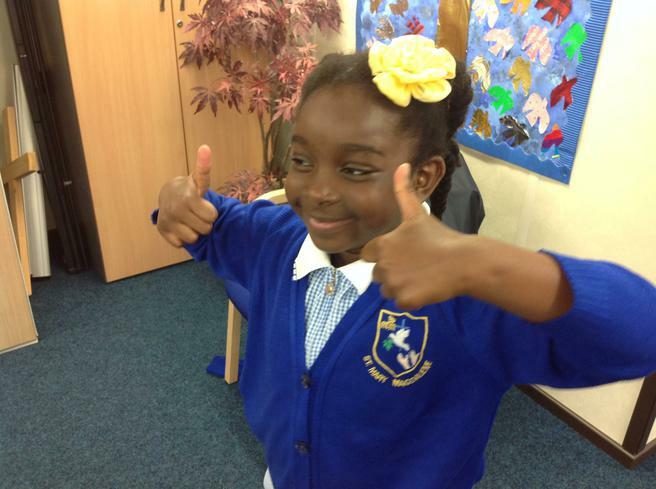 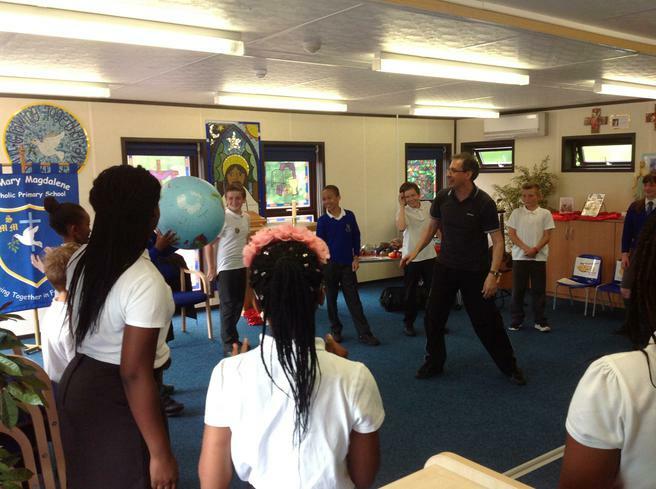 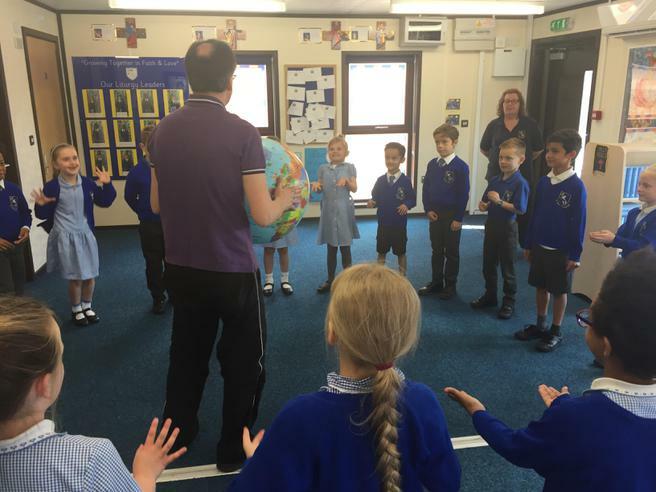 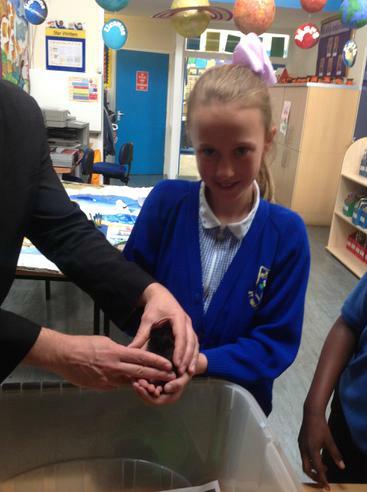 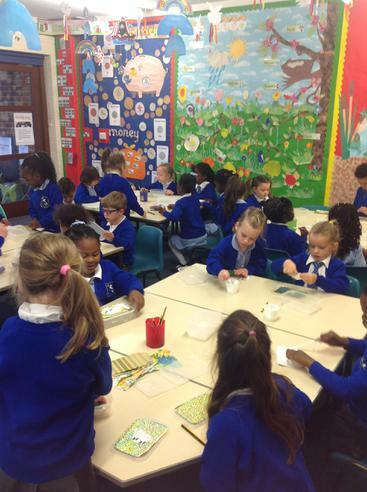 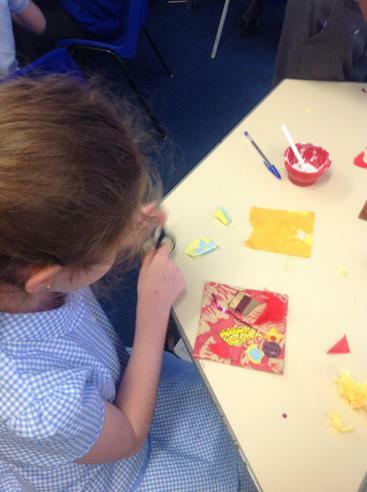 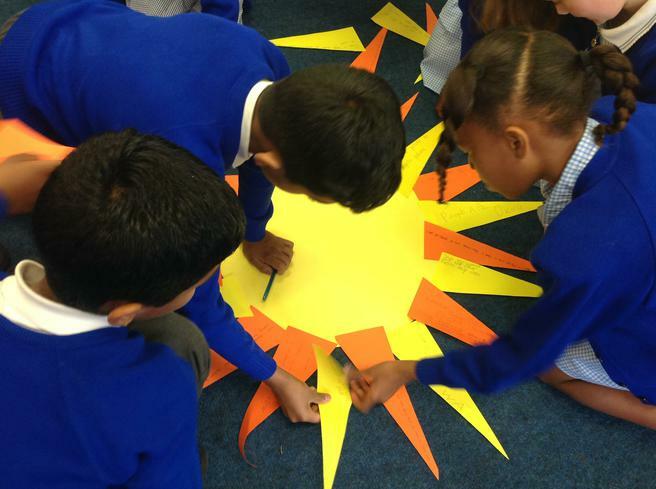 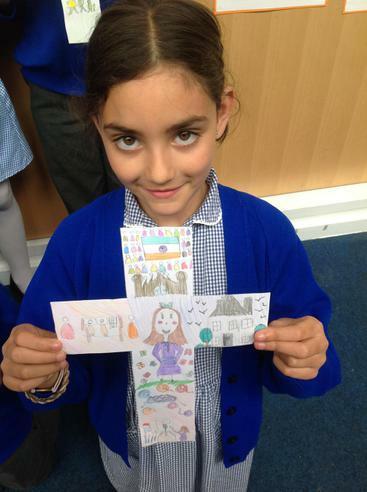 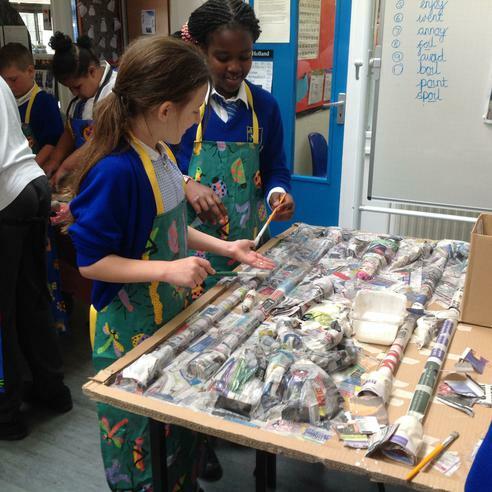 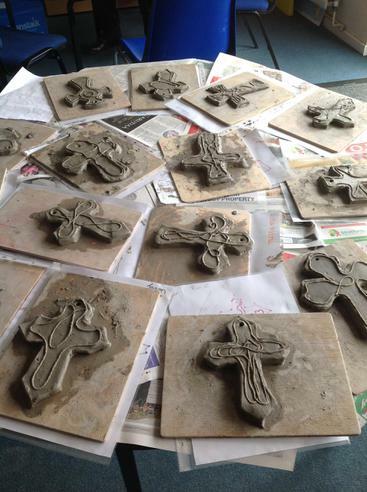 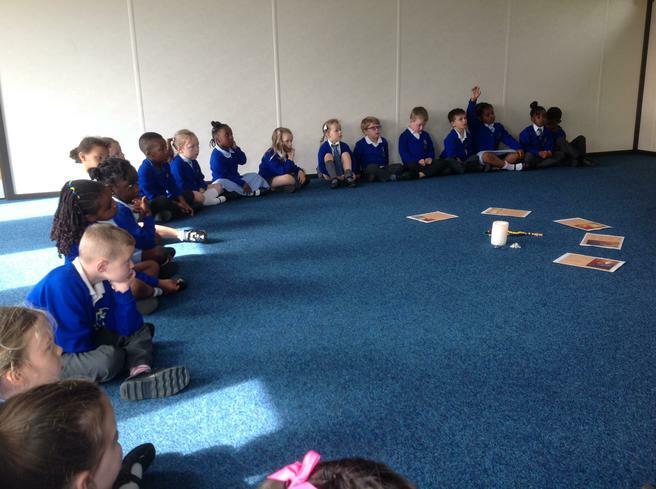 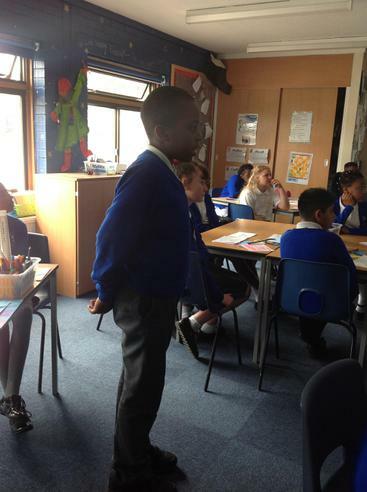 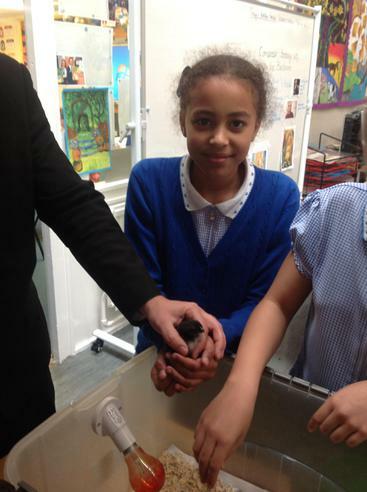 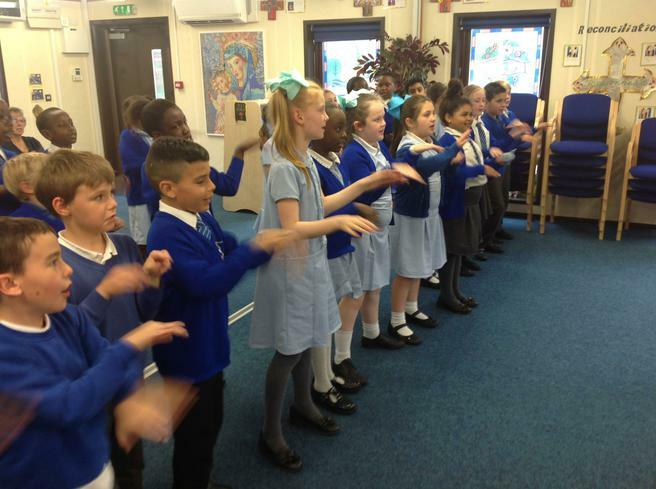 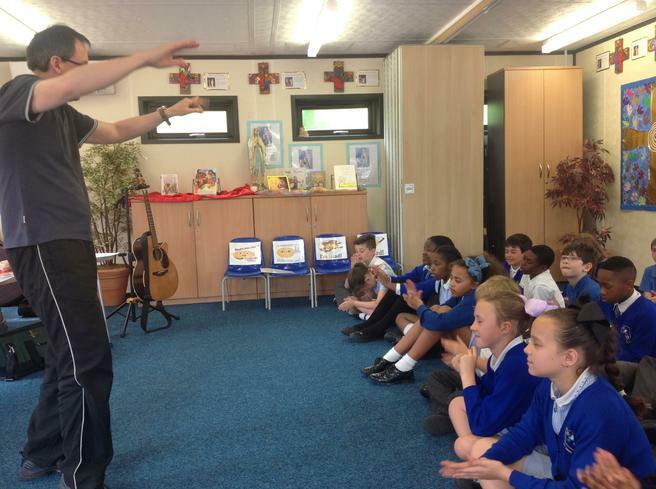 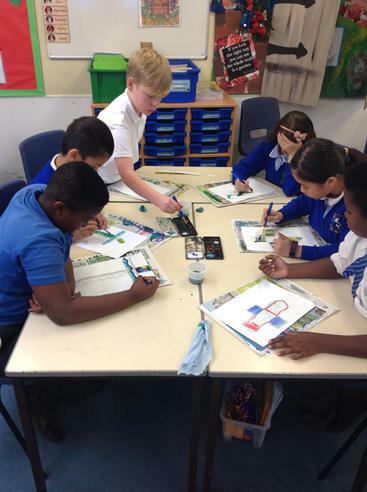 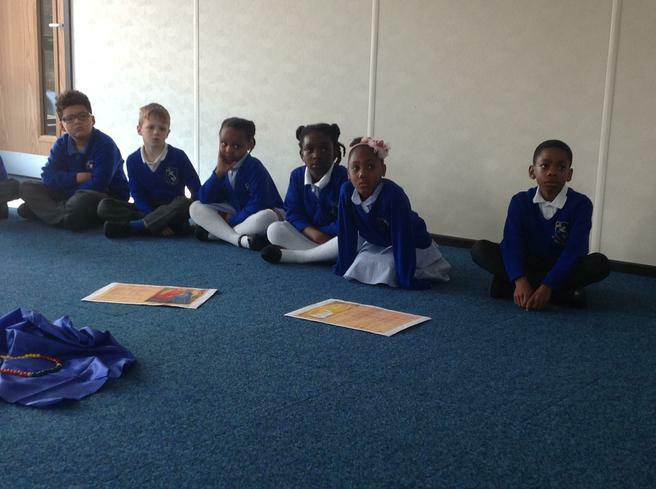 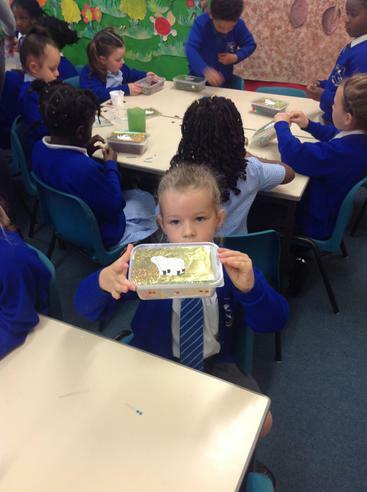 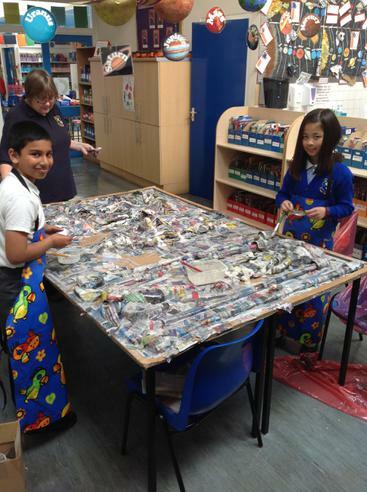 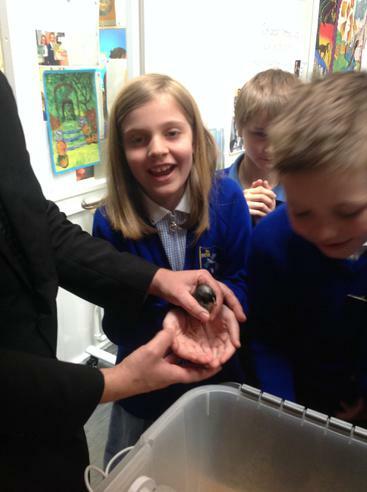 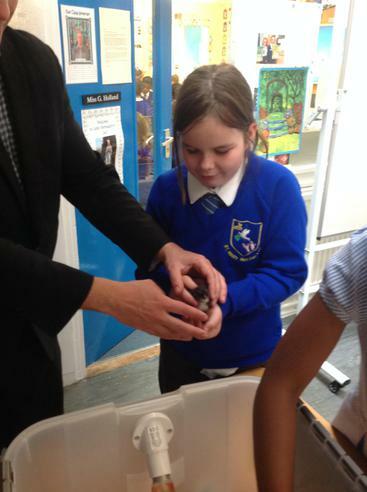 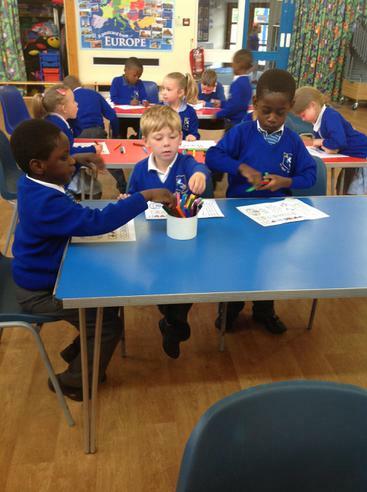 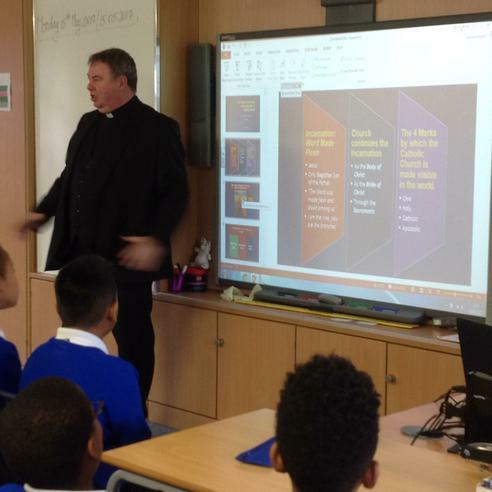 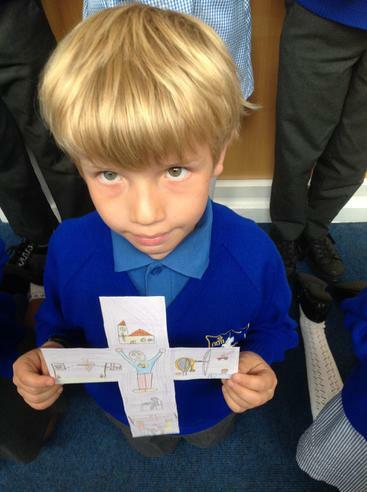 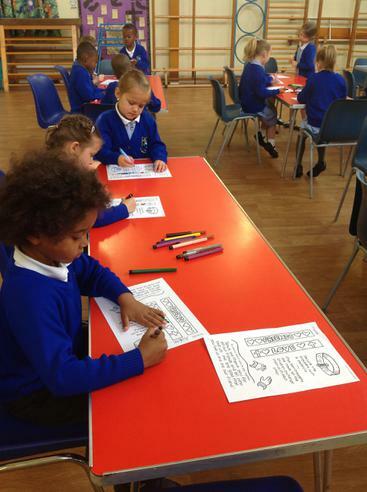 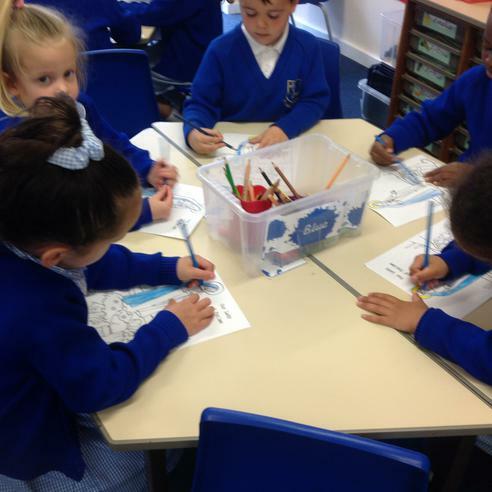 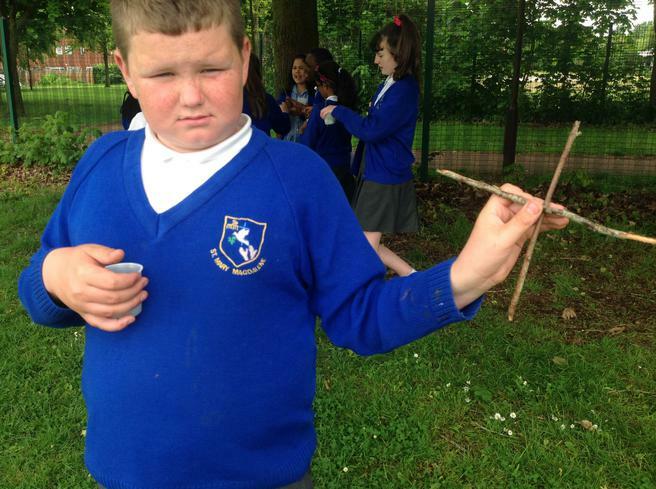 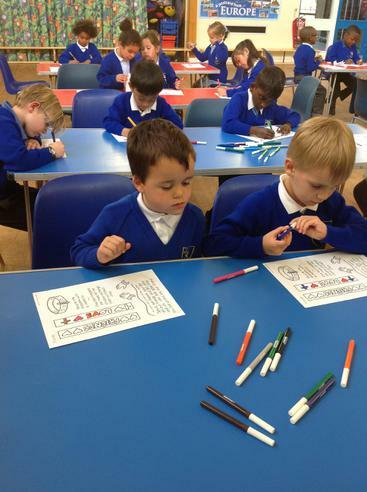 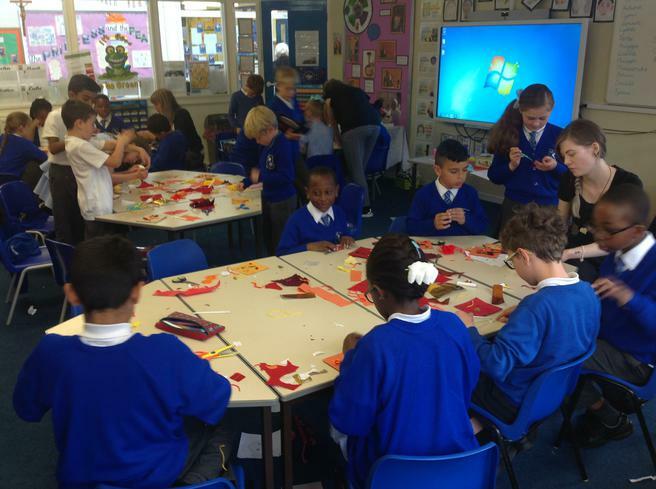 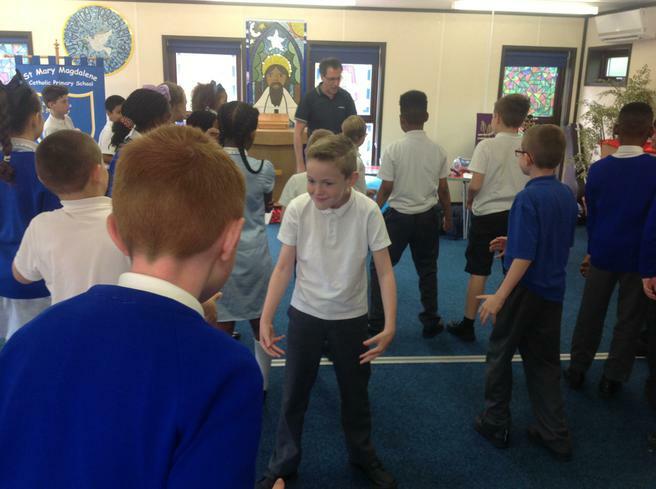 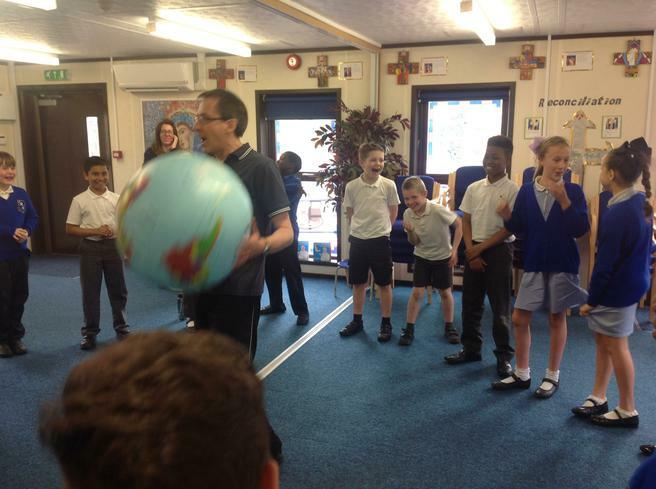 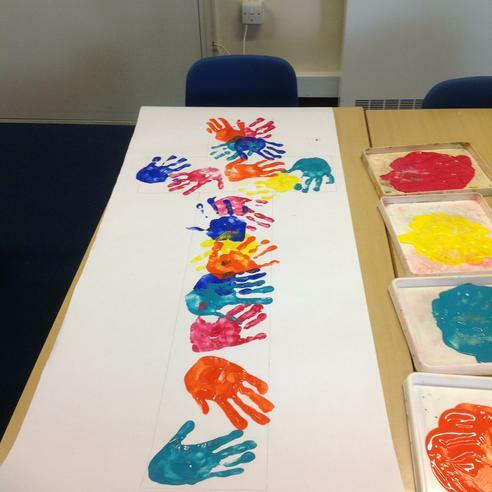 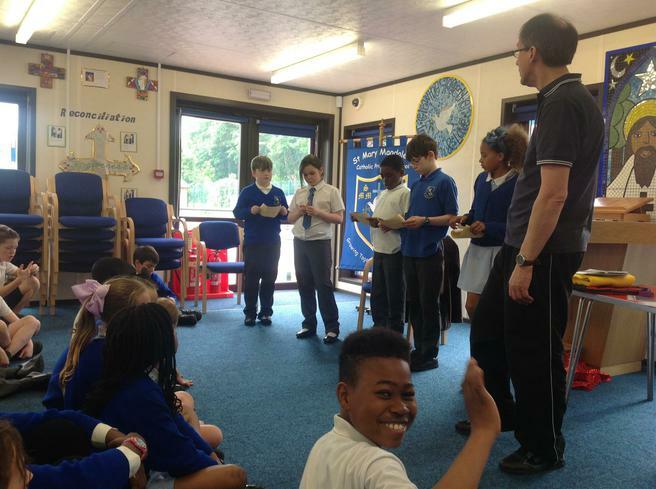 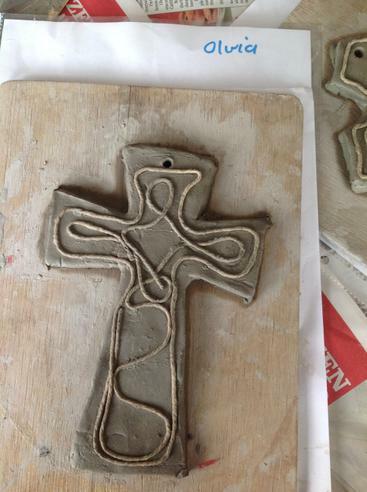 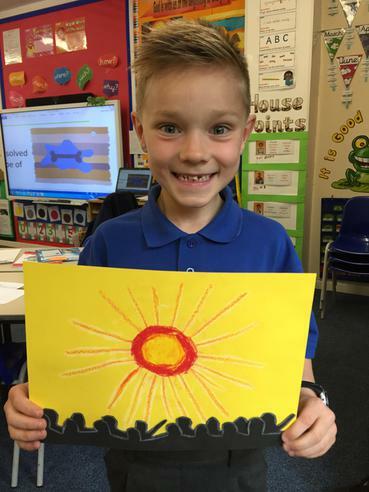 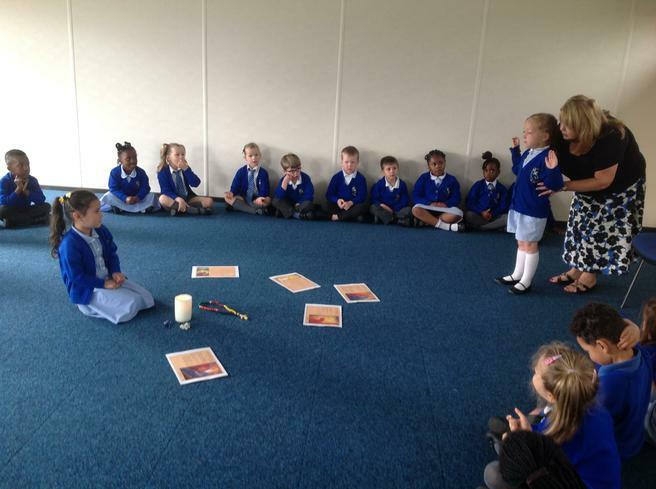 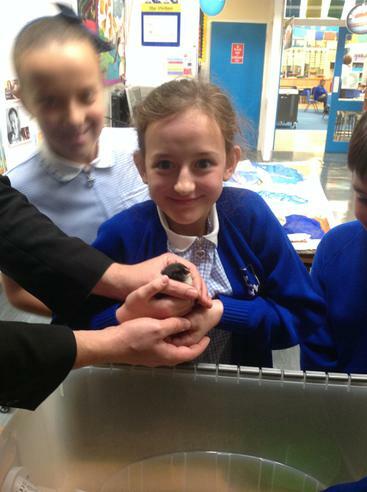 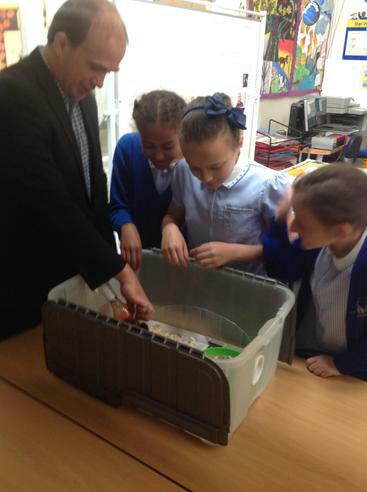 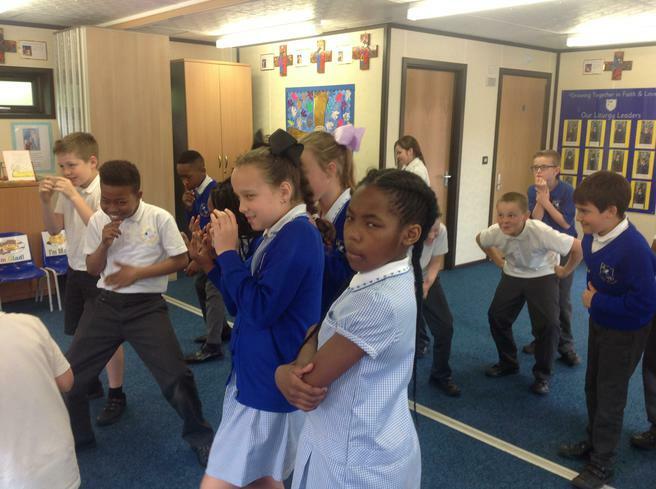 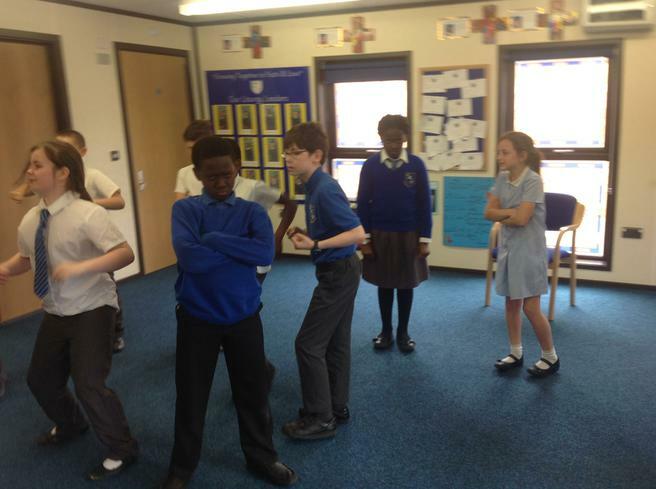 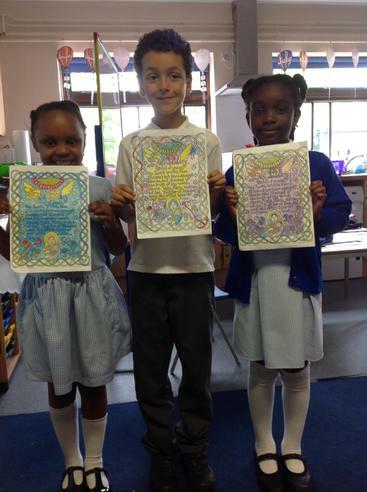 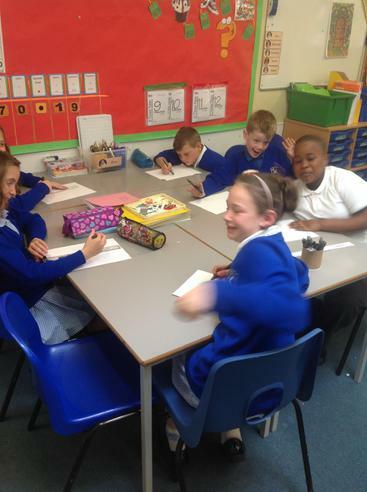 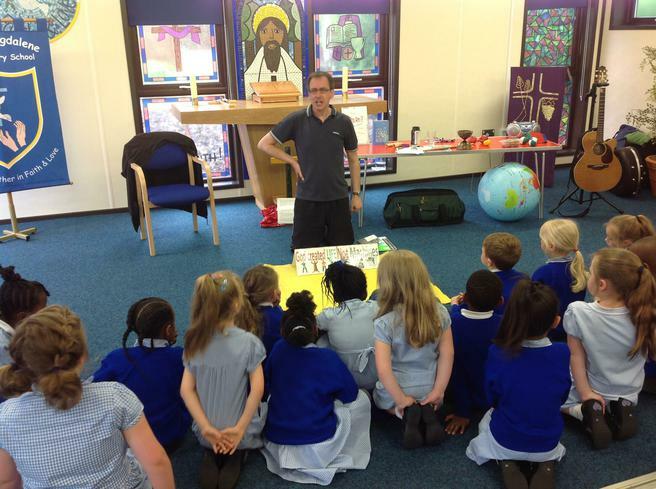 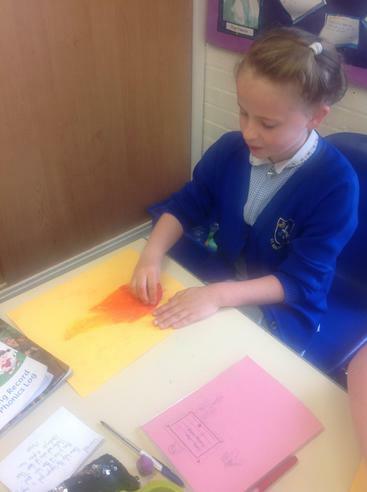 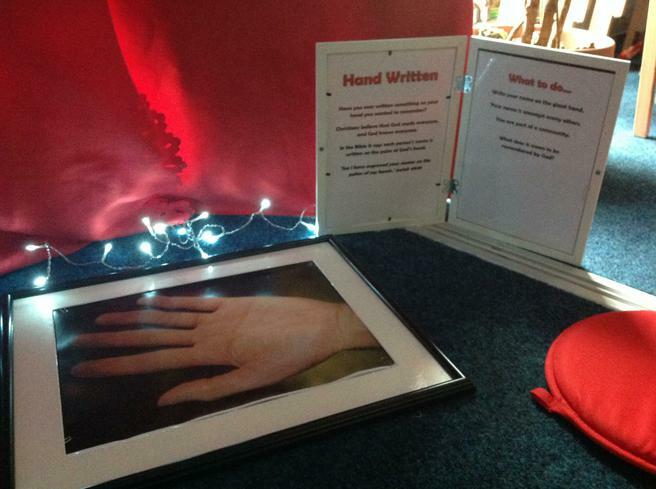 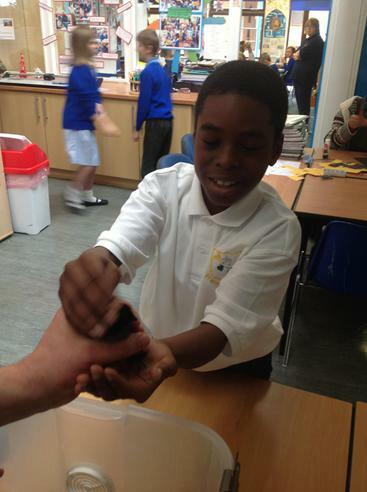 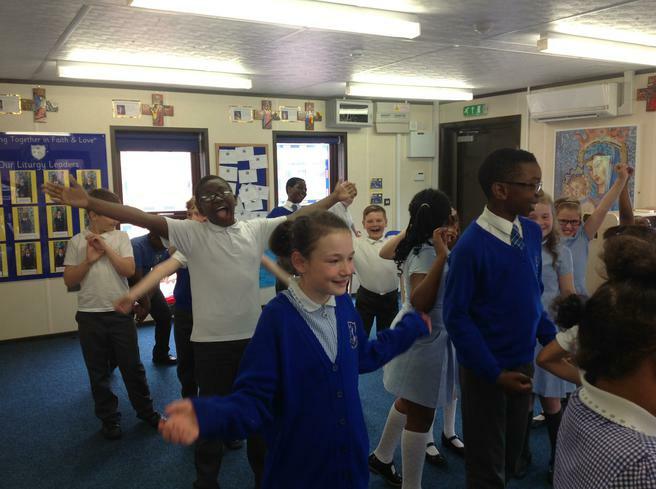 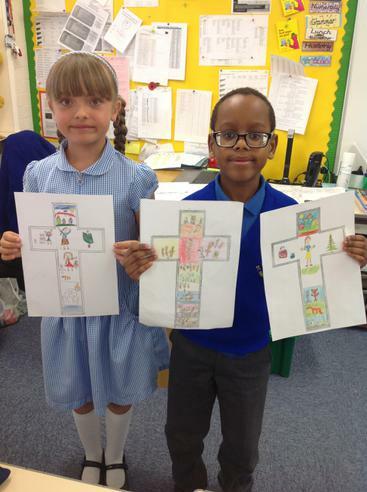 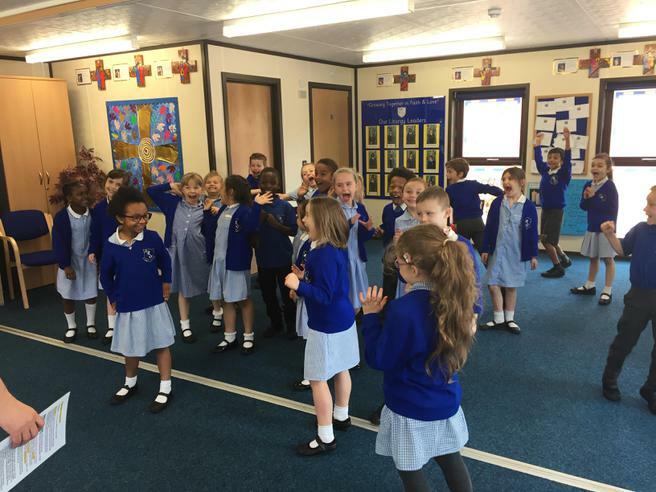 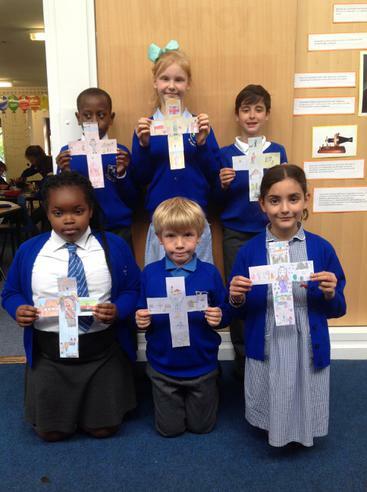 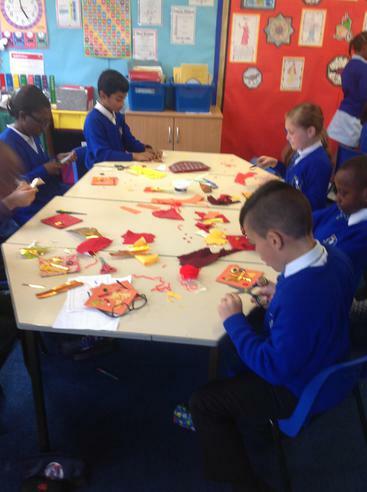 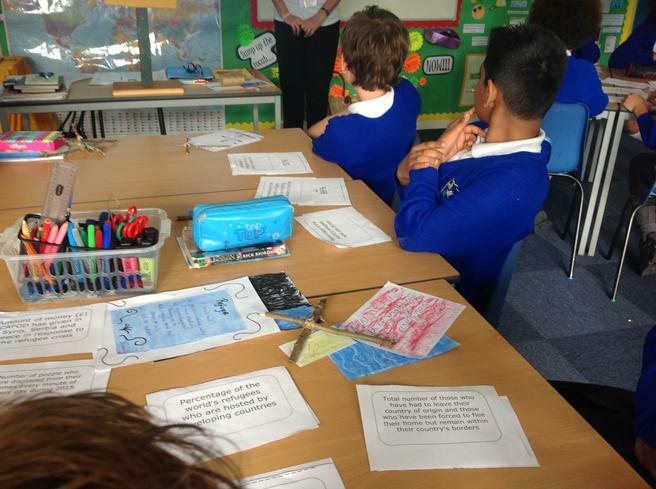 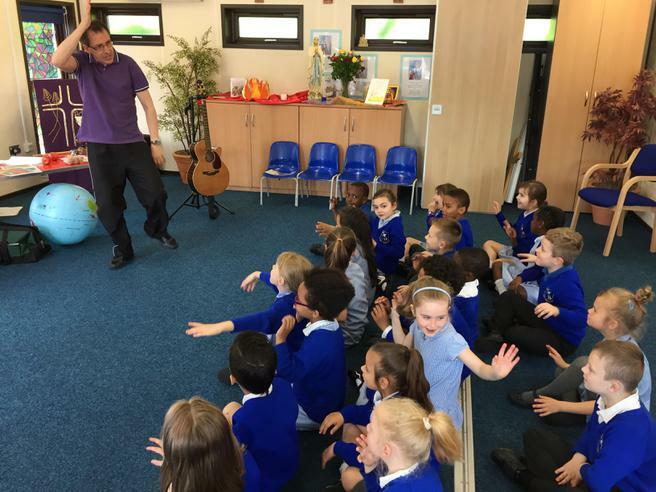 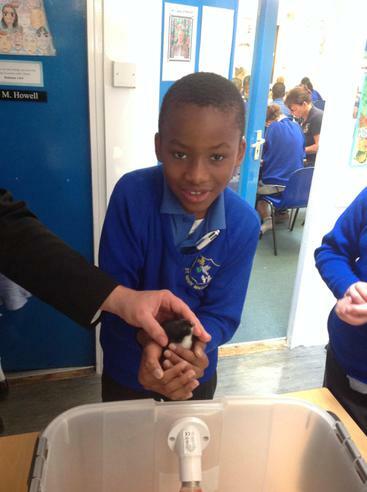 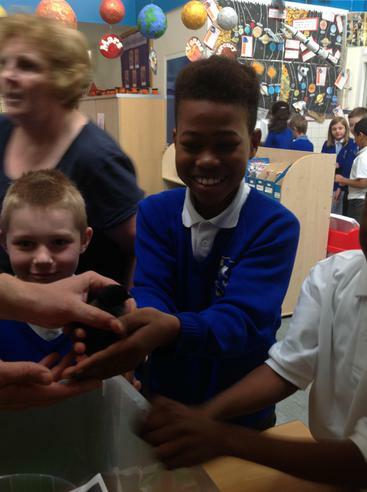 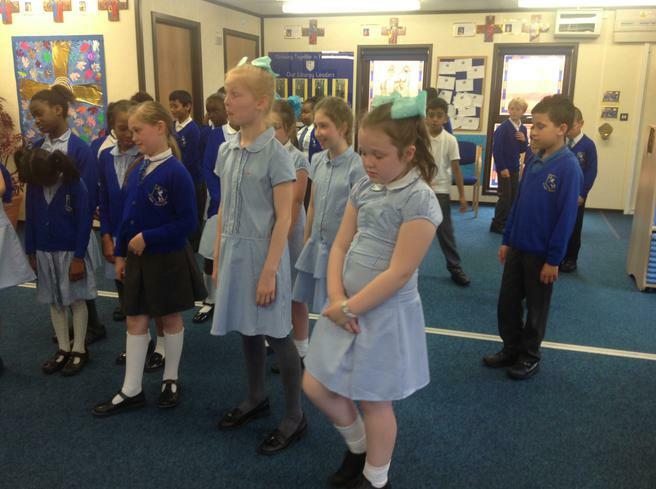 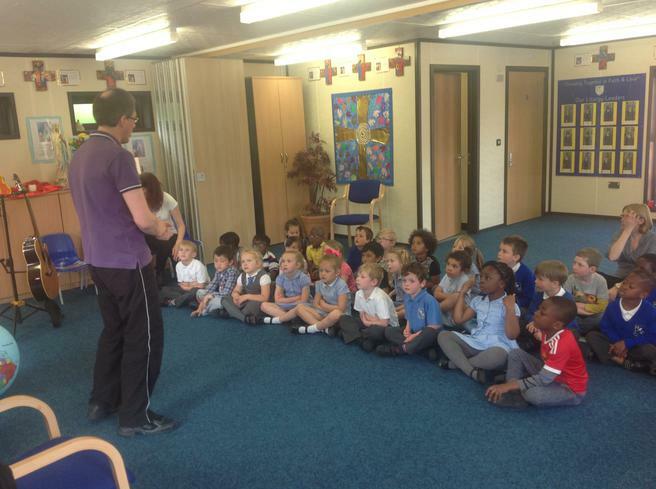 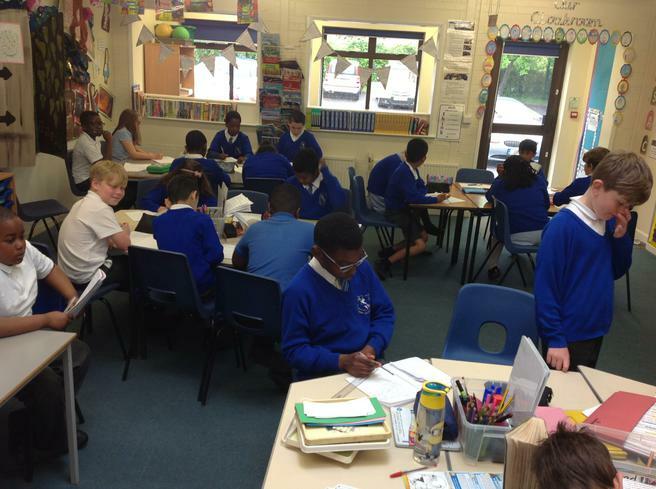 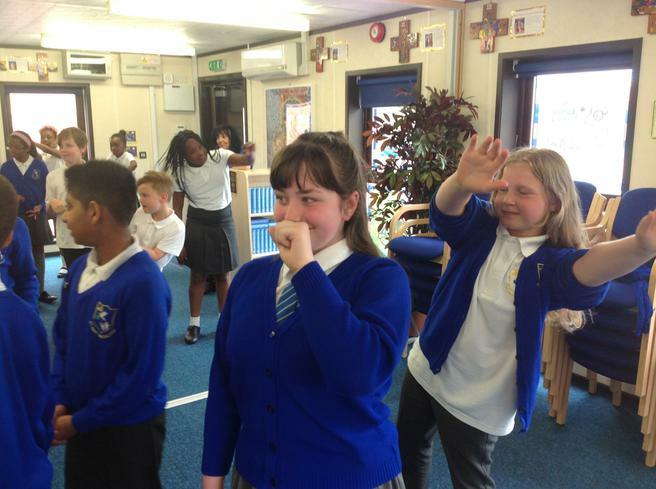 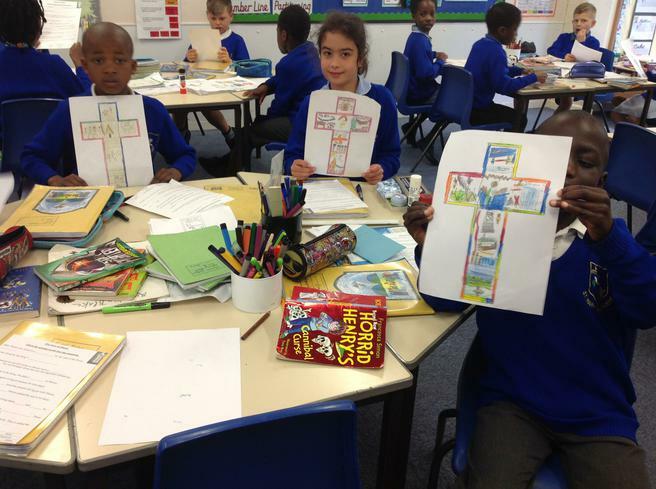 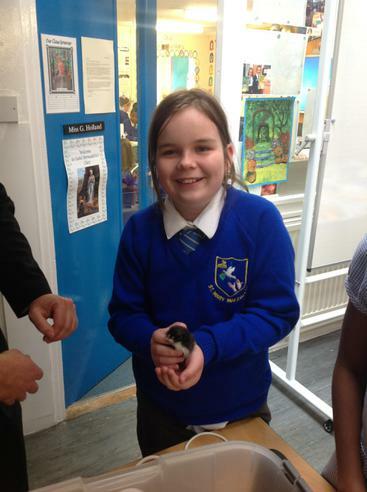 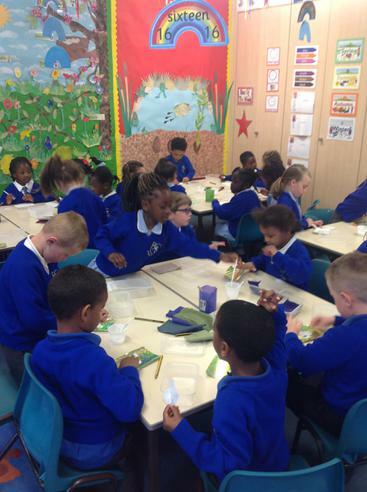 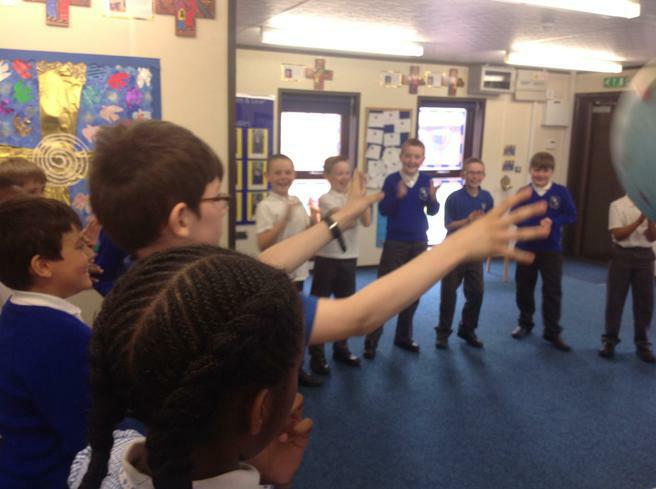 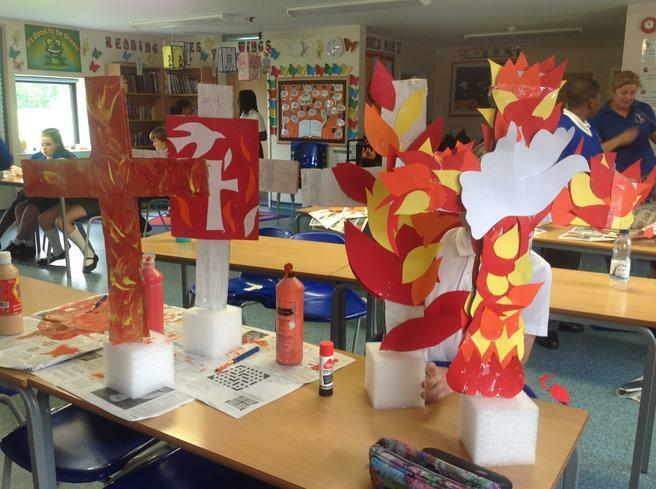 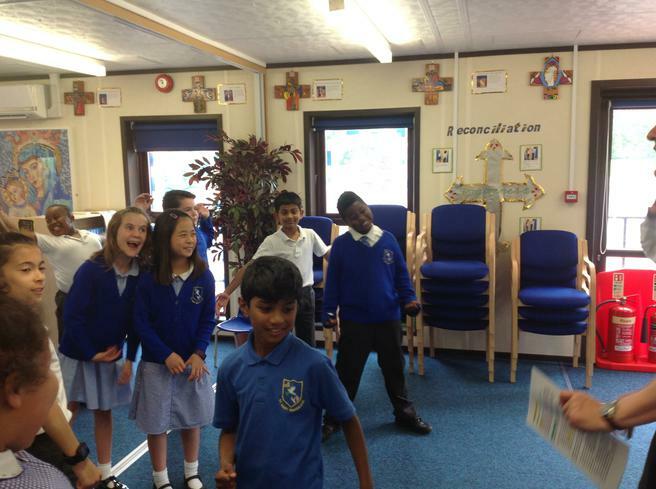 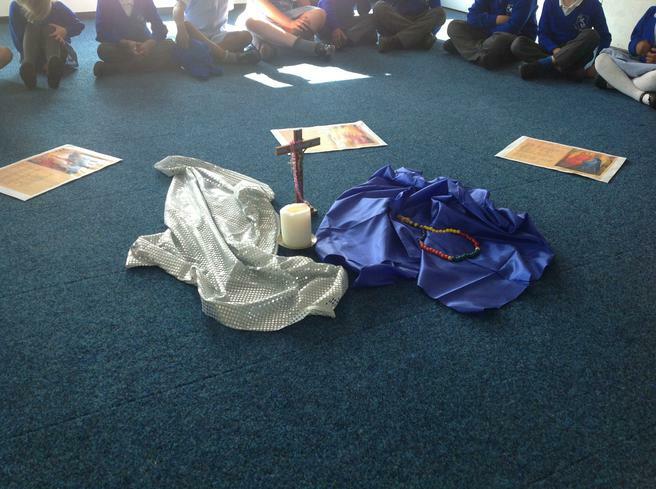 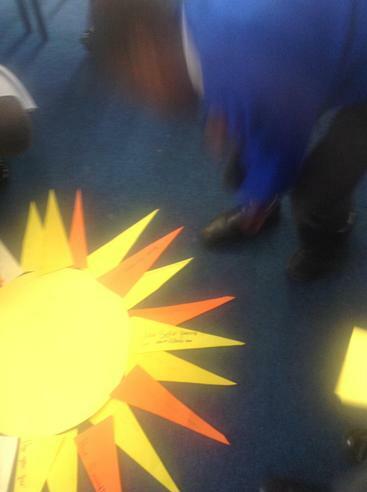 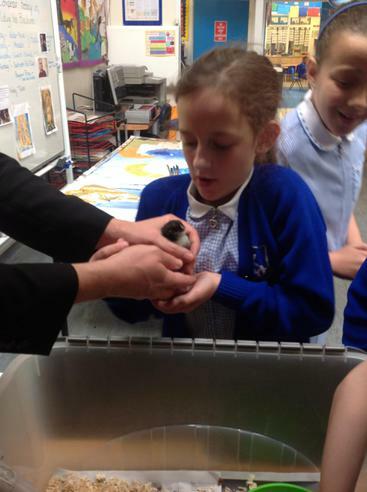 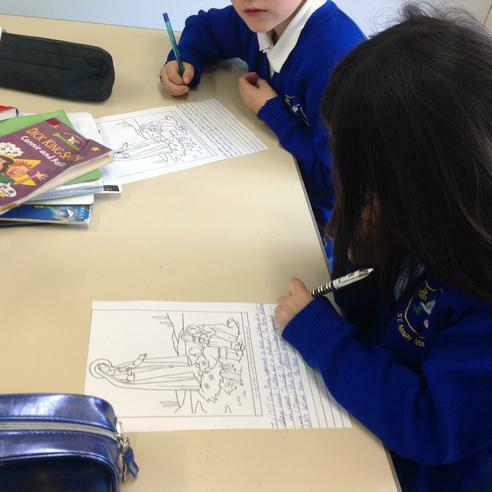 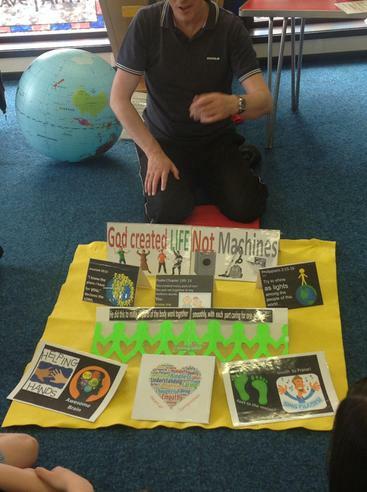 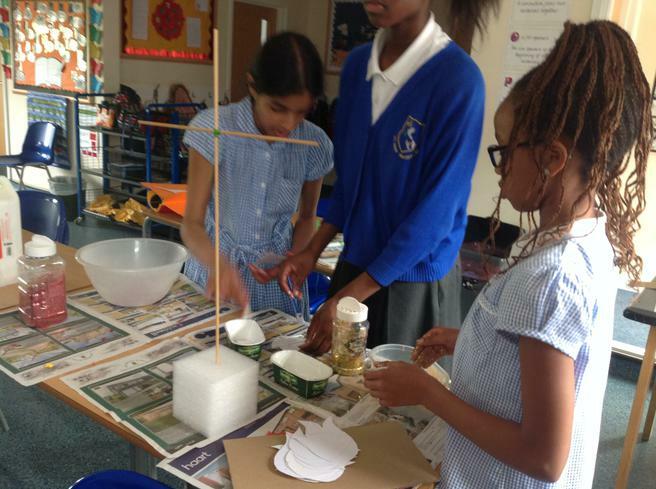 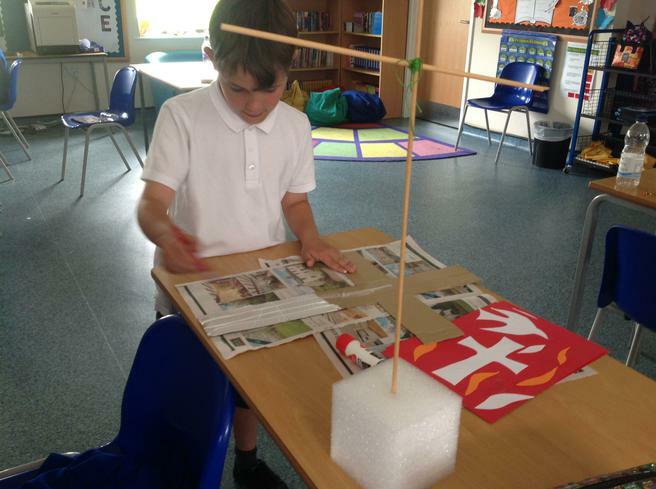 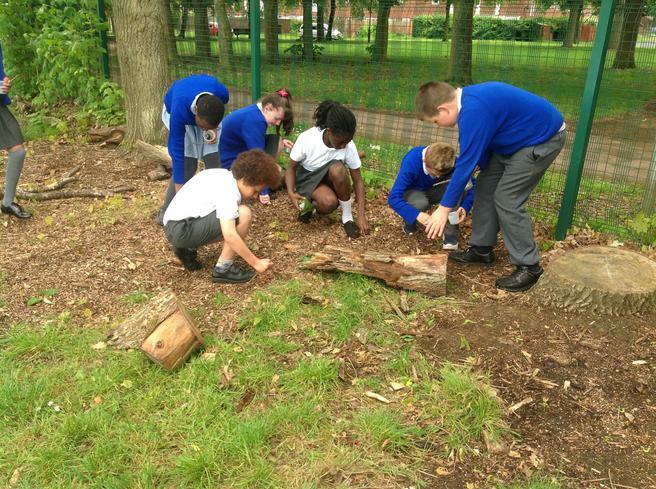 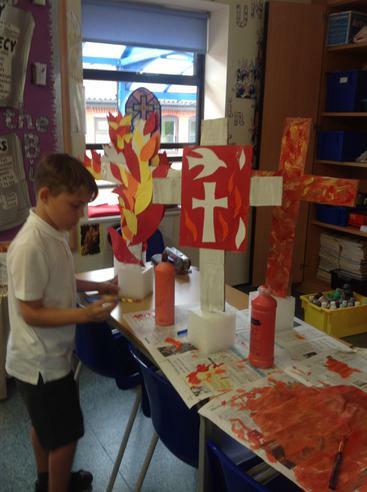 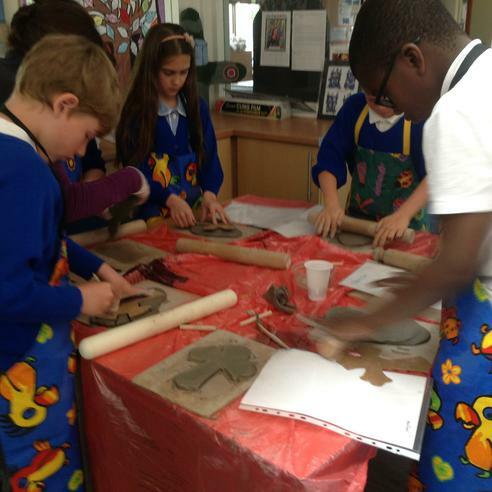 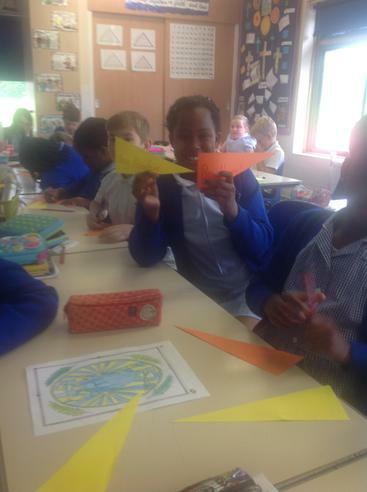 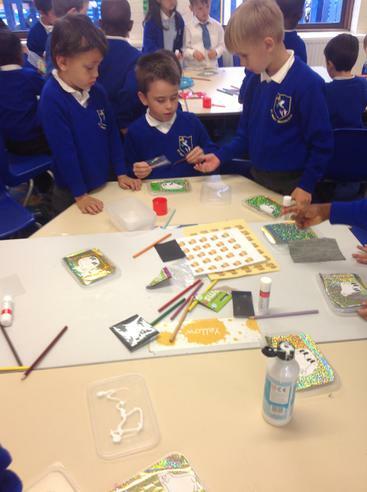 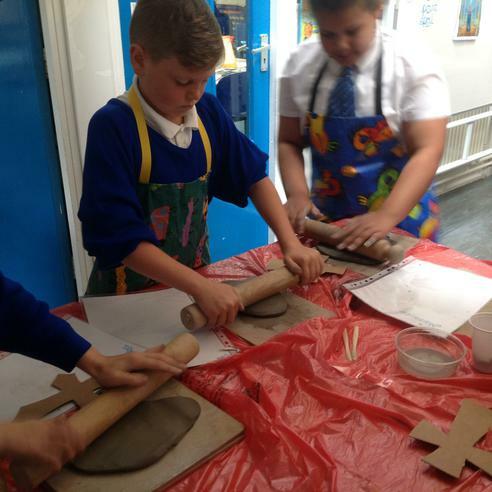 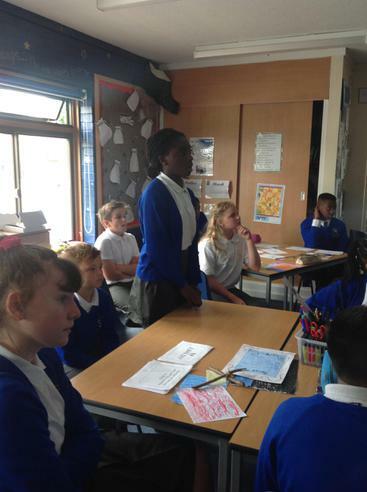 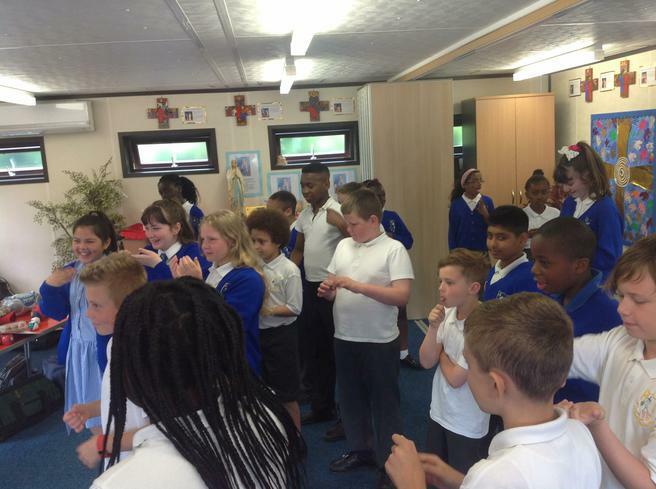 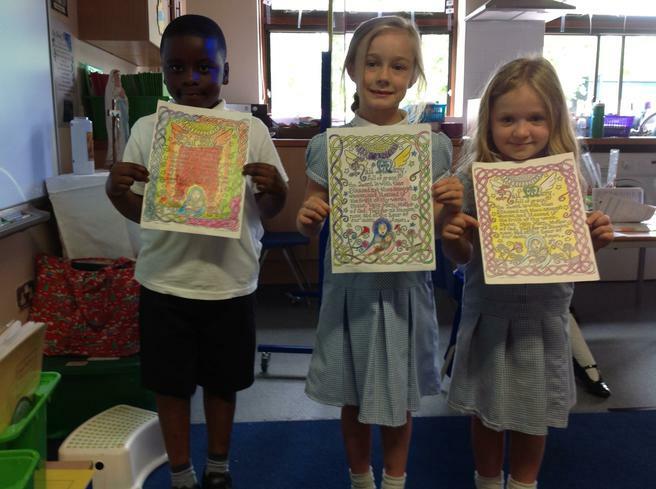 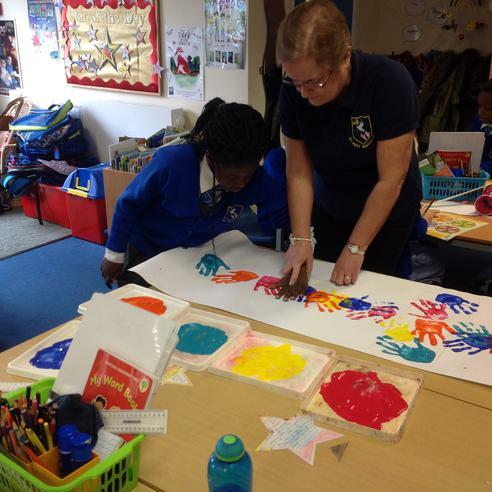 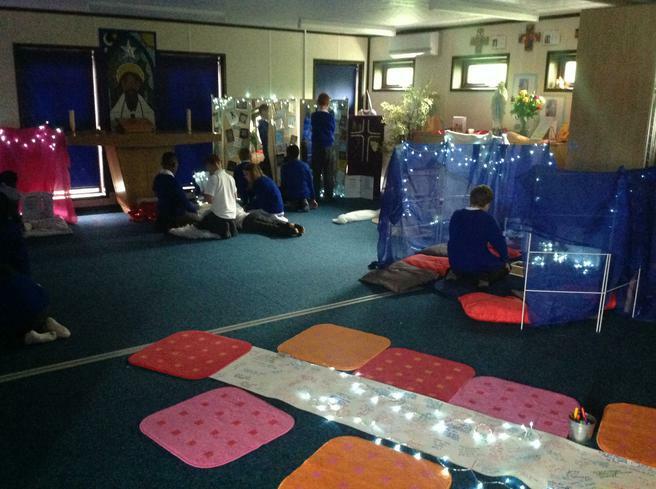 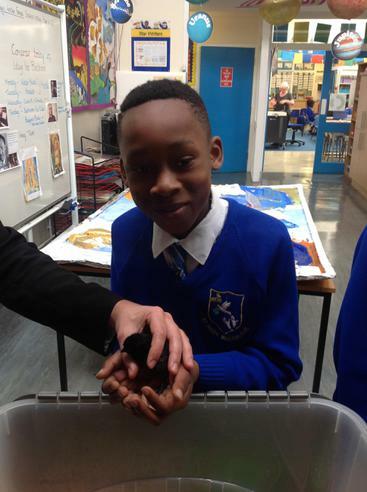 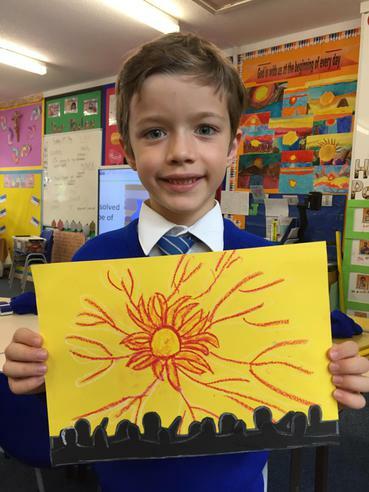 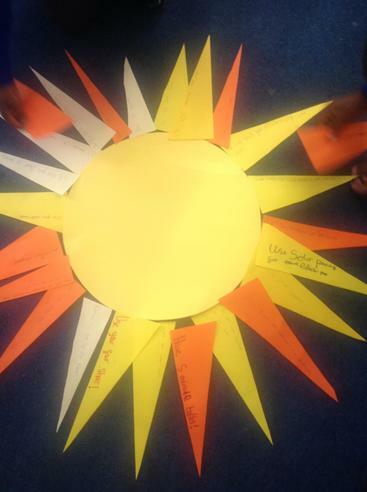 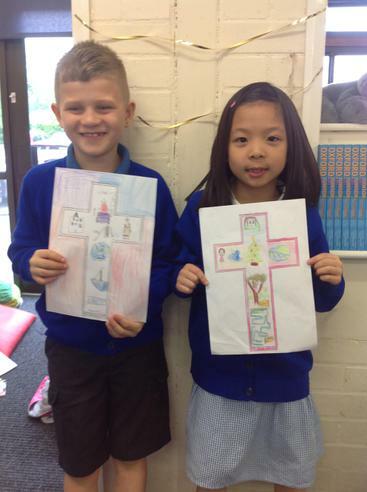 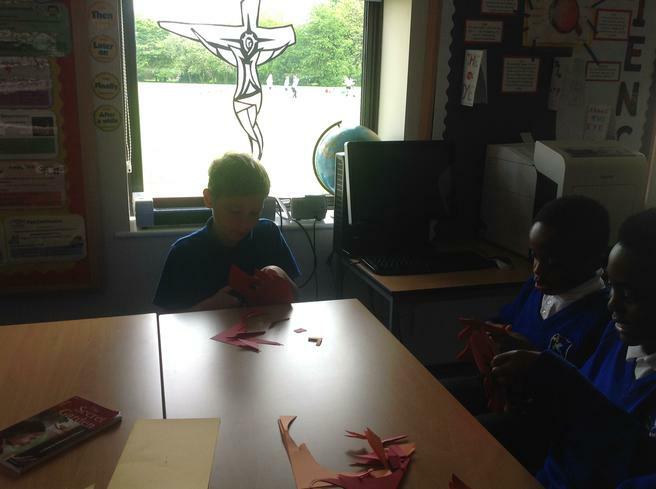 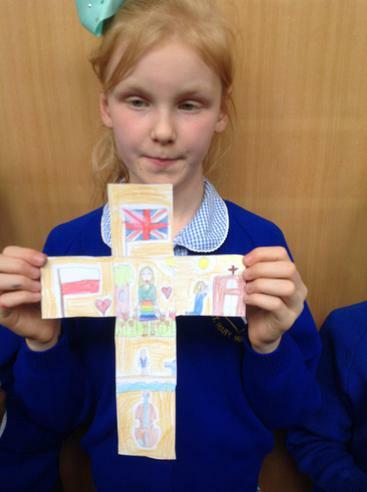 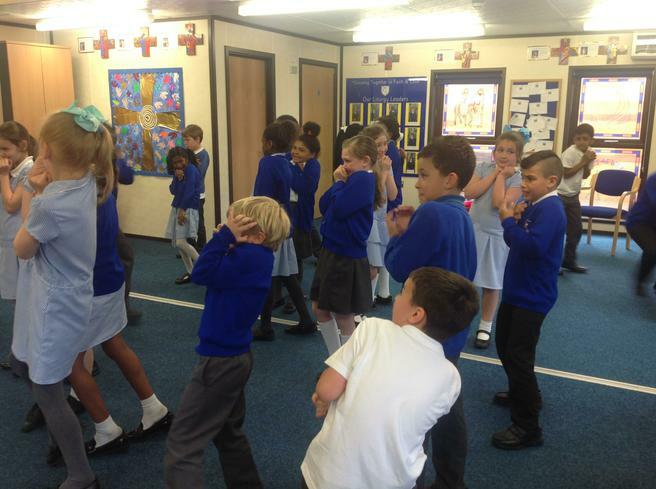 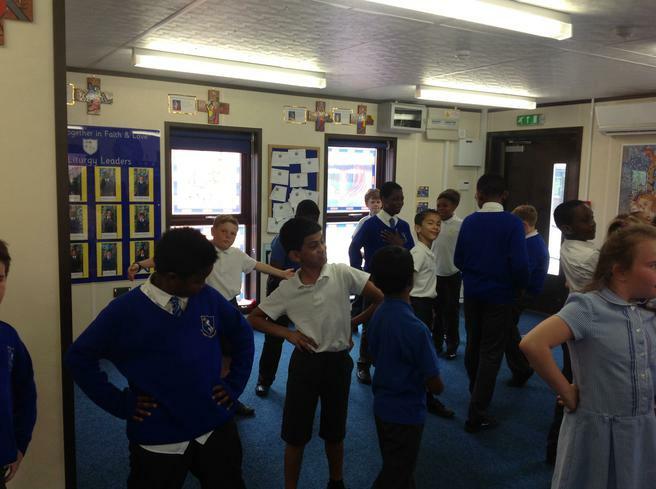 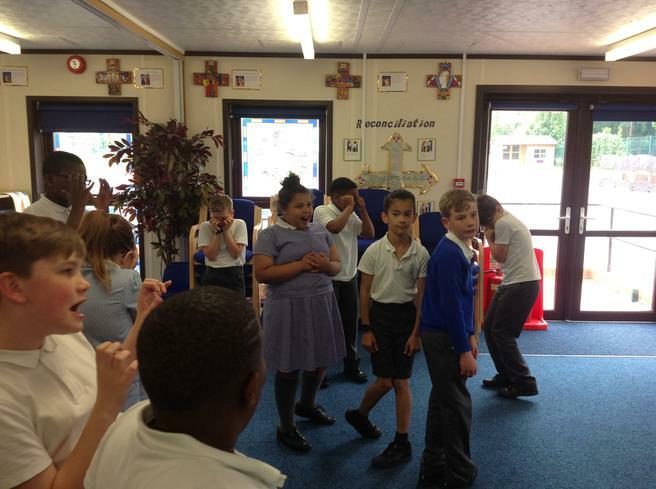 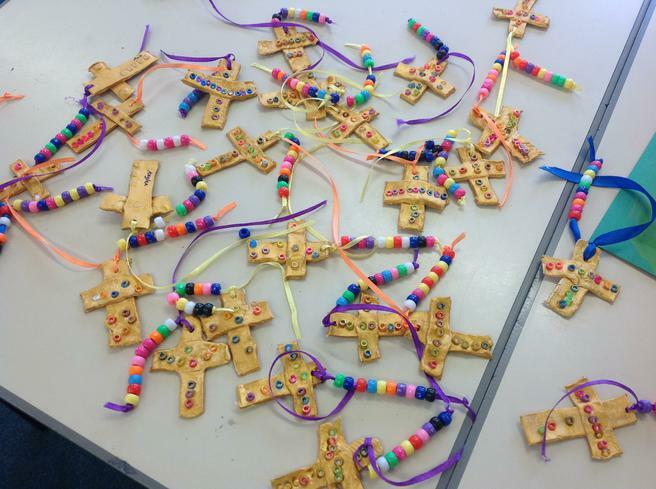 Year six ask Fr Bernard "The Big Questions"
Year 2 - Miss Smith - are making a "Cross of Hands"